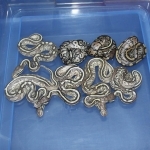 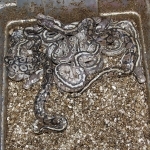 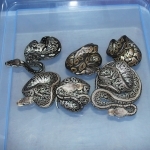 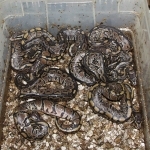 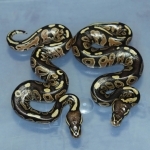 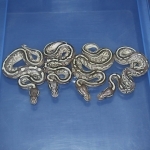 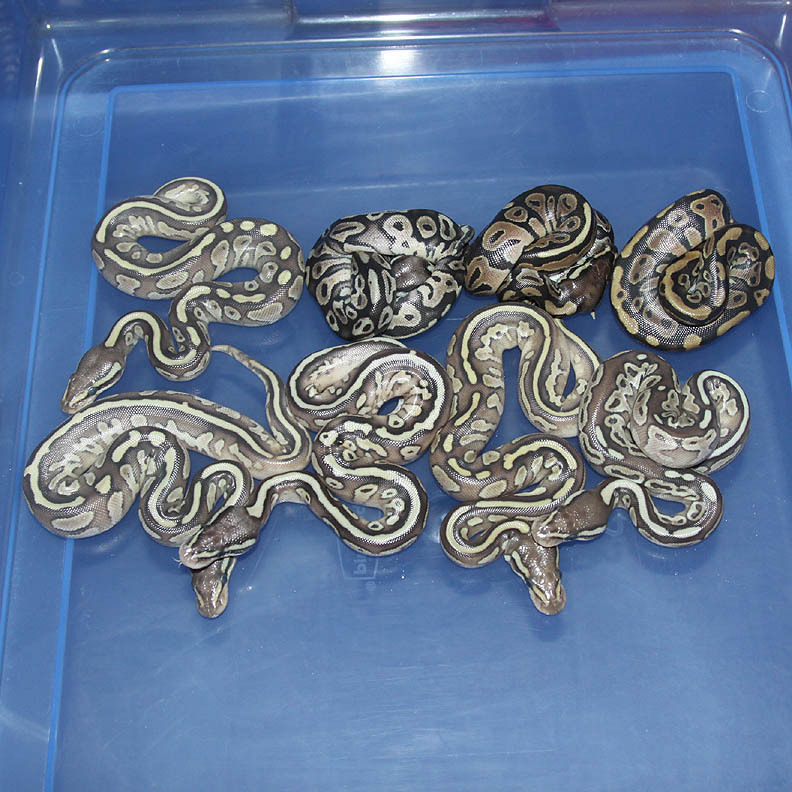 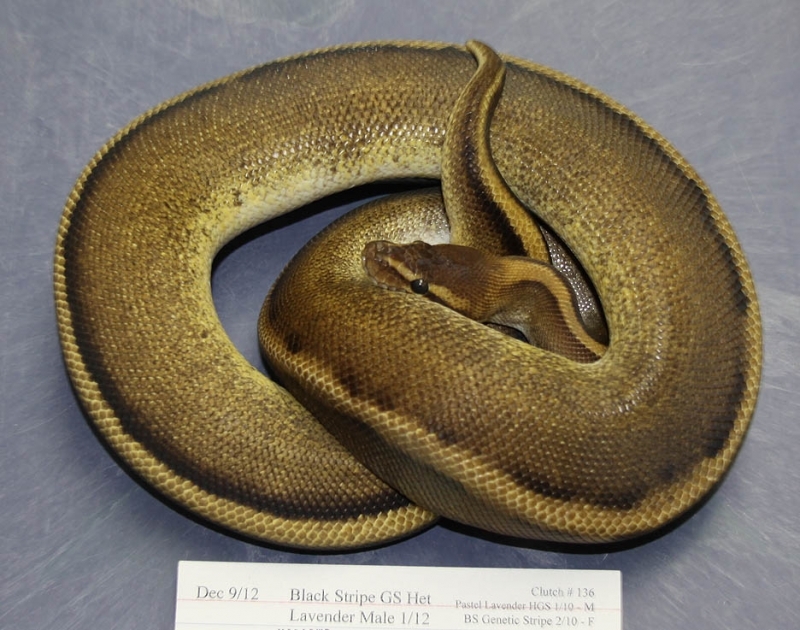 Description: Lesser Chocolate 1/12 x Het Red Axanthic 1/06. 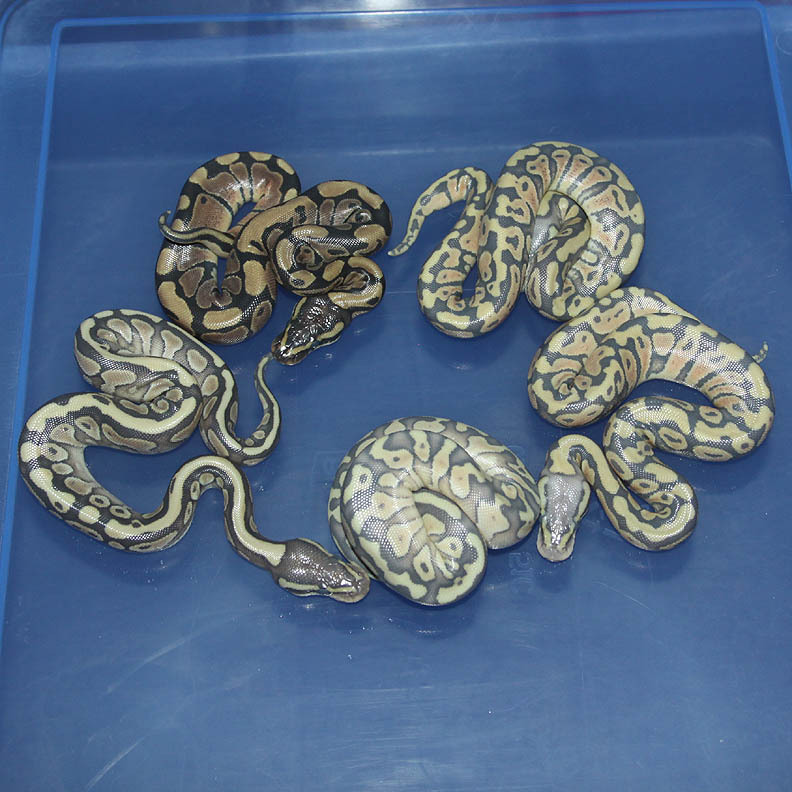 If you are interested in animals from clutch #151 please email or call 519-824-7377. Description: POG Red Axanthic 1/11 x Het RA/OG 3/08. 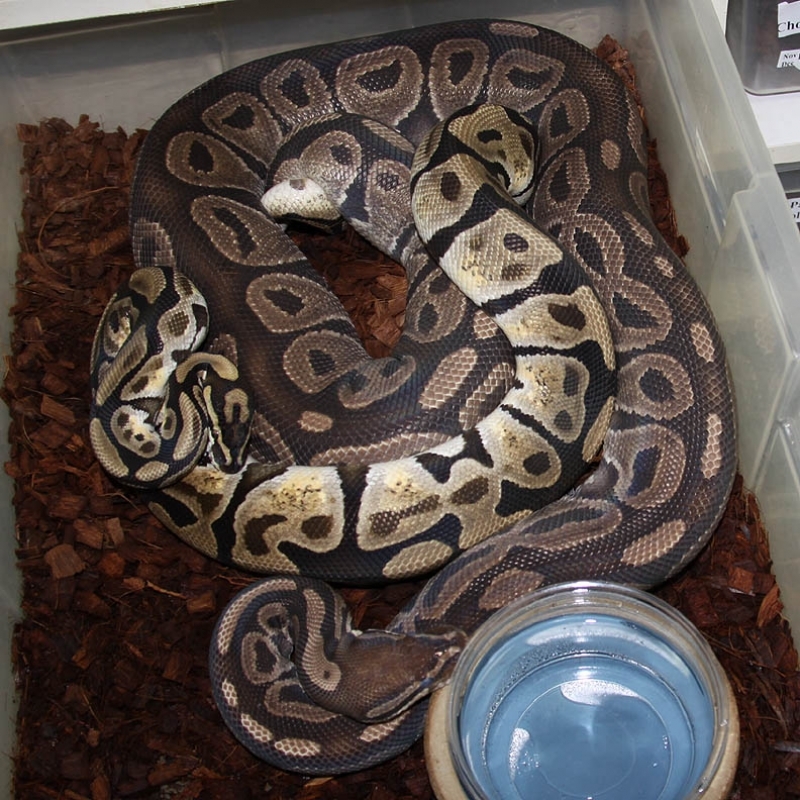 If you are interested in animals from clutch #152 please email or call 519-824-7377. 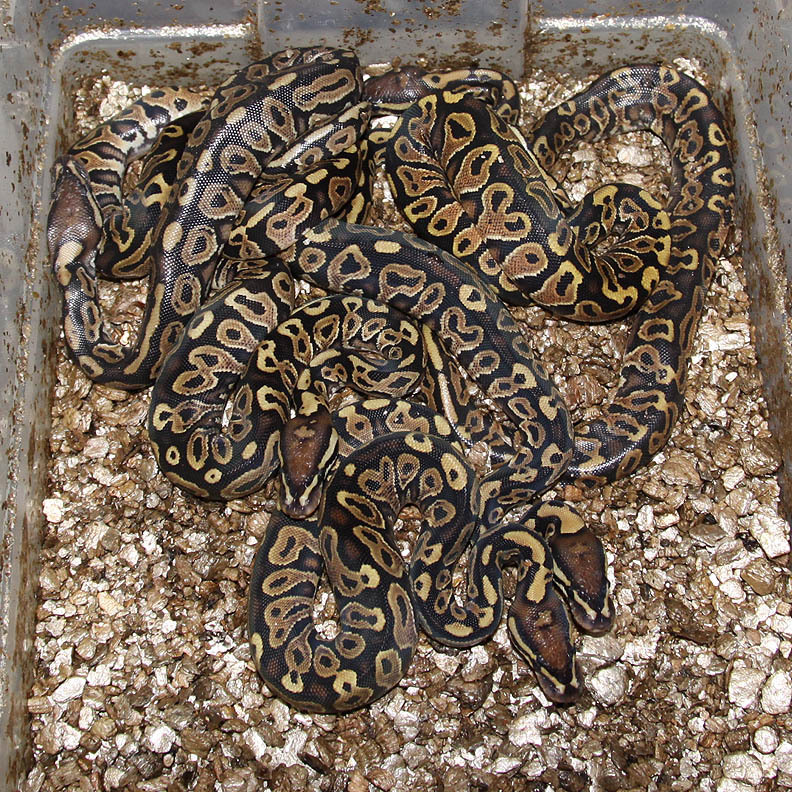 Description: Super Pastel Genetic Stripe (SPGS) 1/11 x Het Genetic Stripe Pos Het Banded 3/08. 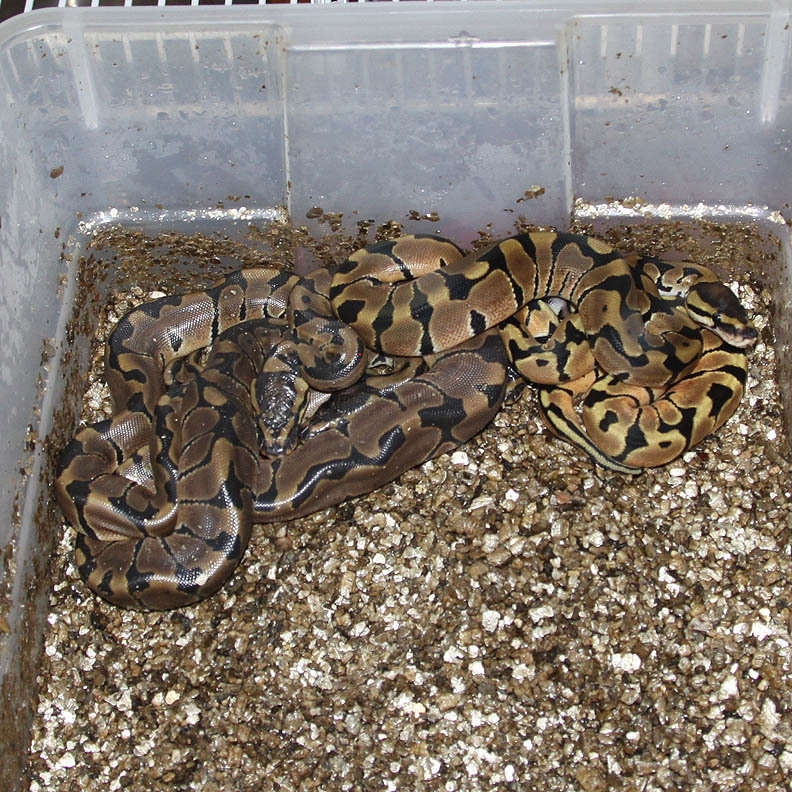 If you are interested in animals from clutch #153 please email or call 519-824-7377. 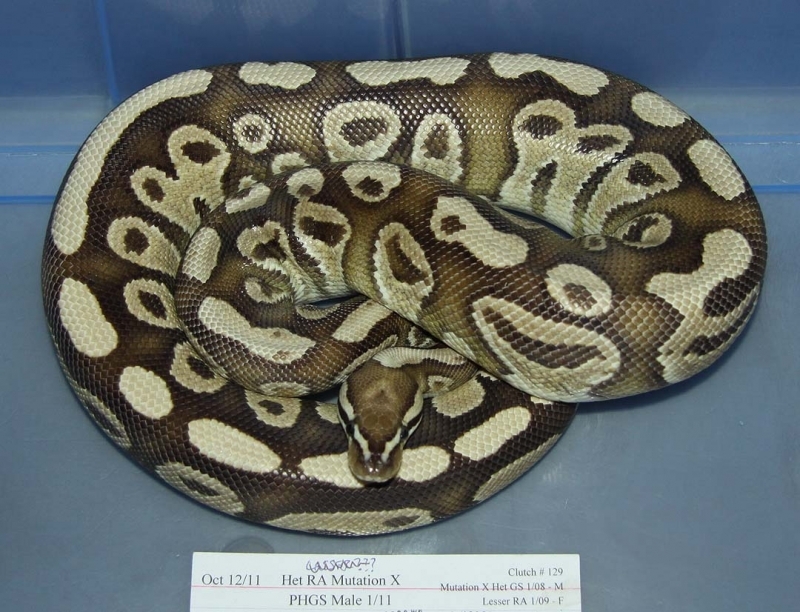 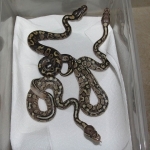 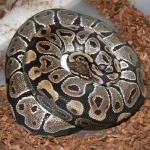 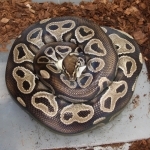 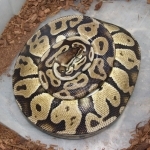 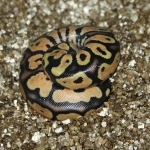 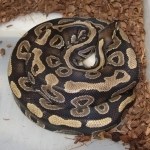 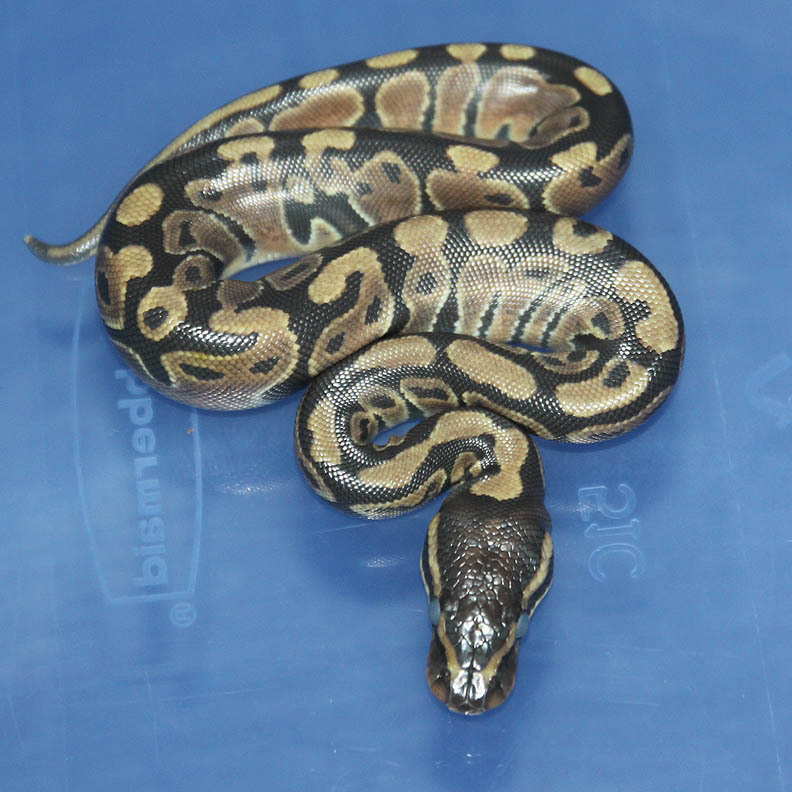 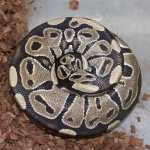 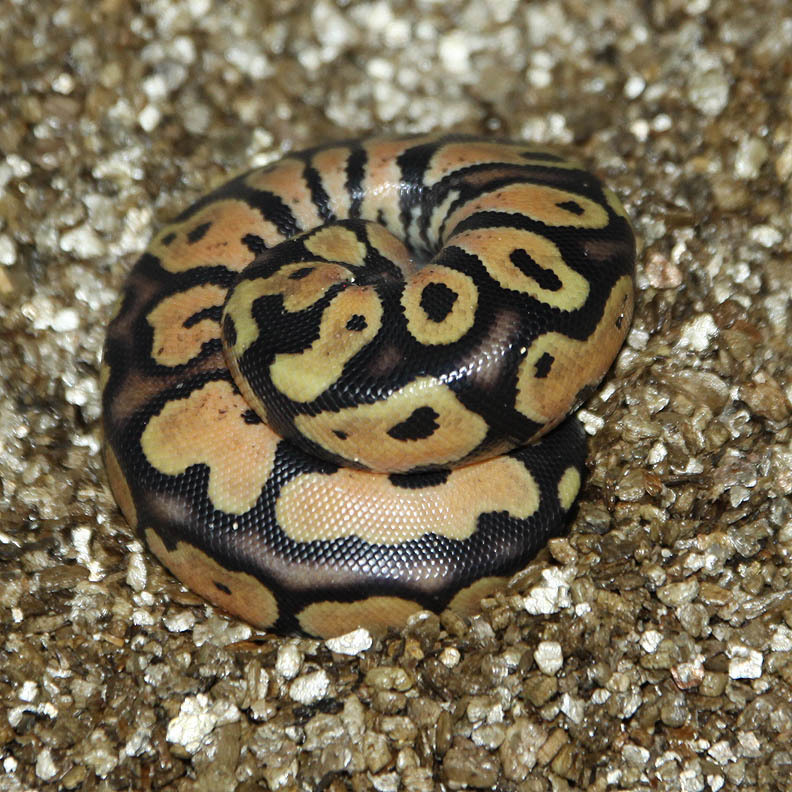 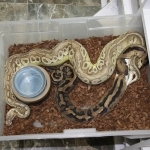 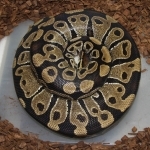 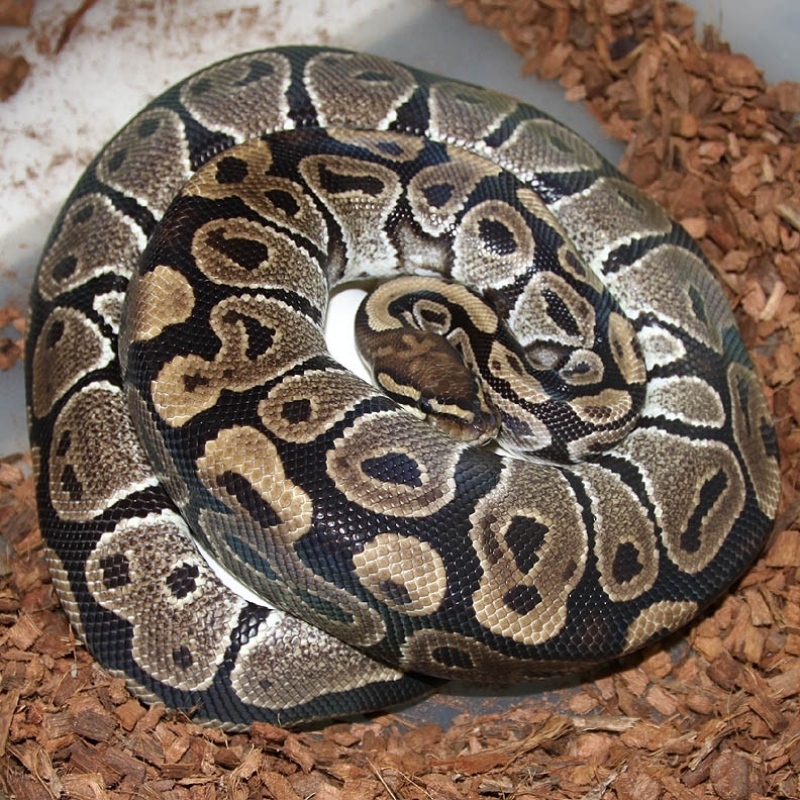 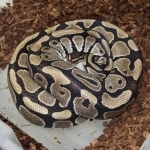 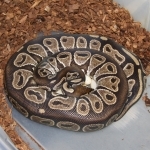 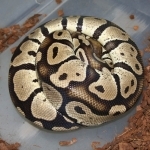 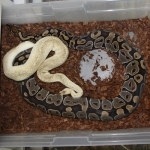 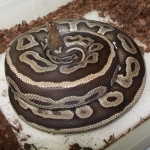 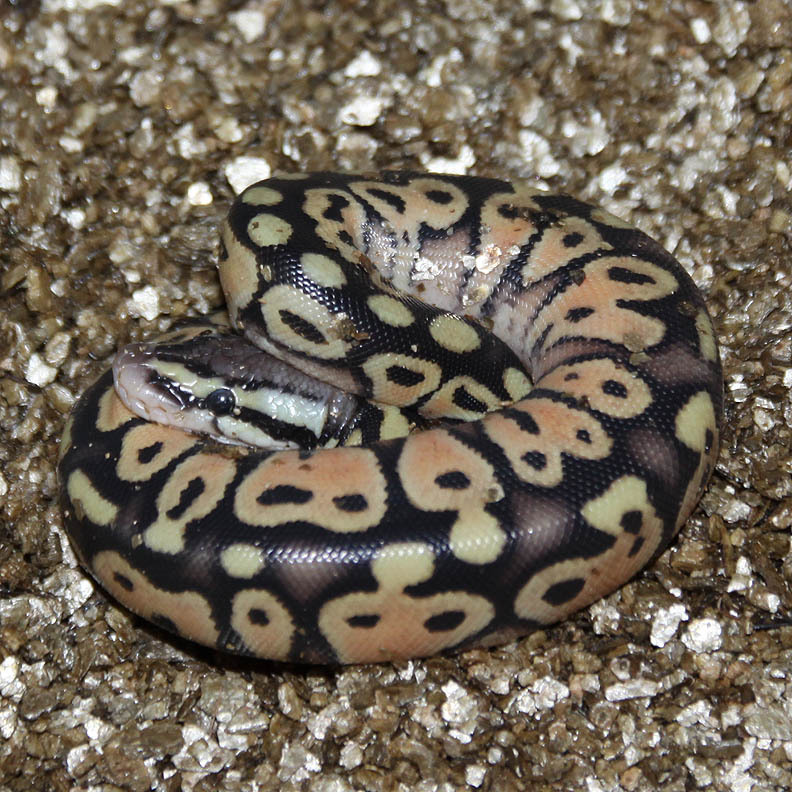 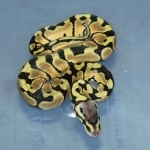 Description: Pastel Banded 1/11 x Banded 4/06. 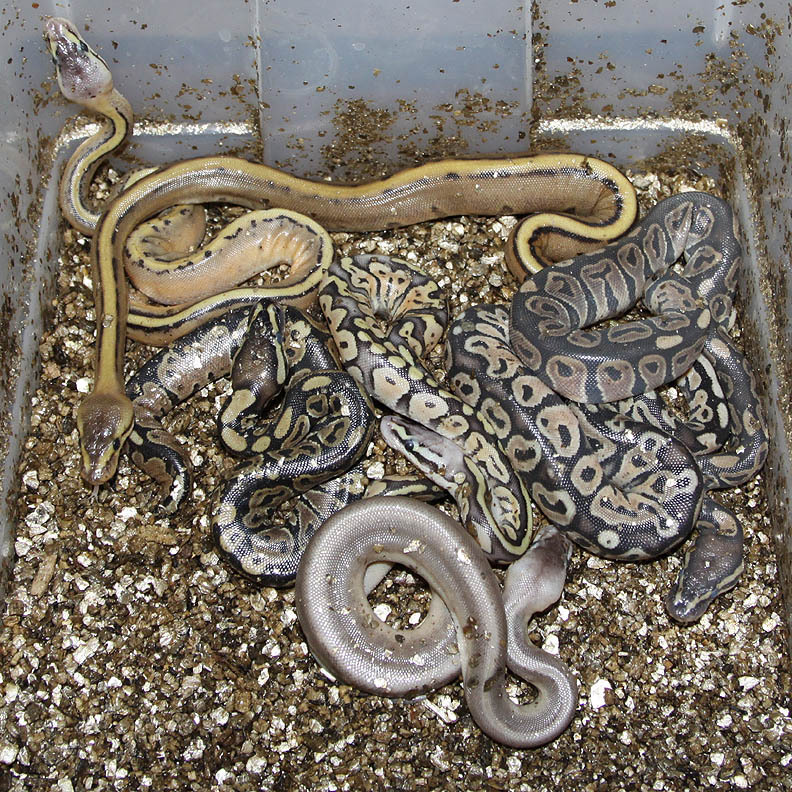 If you are interested in animals from clutch #154 please email or call 519-824-7377. 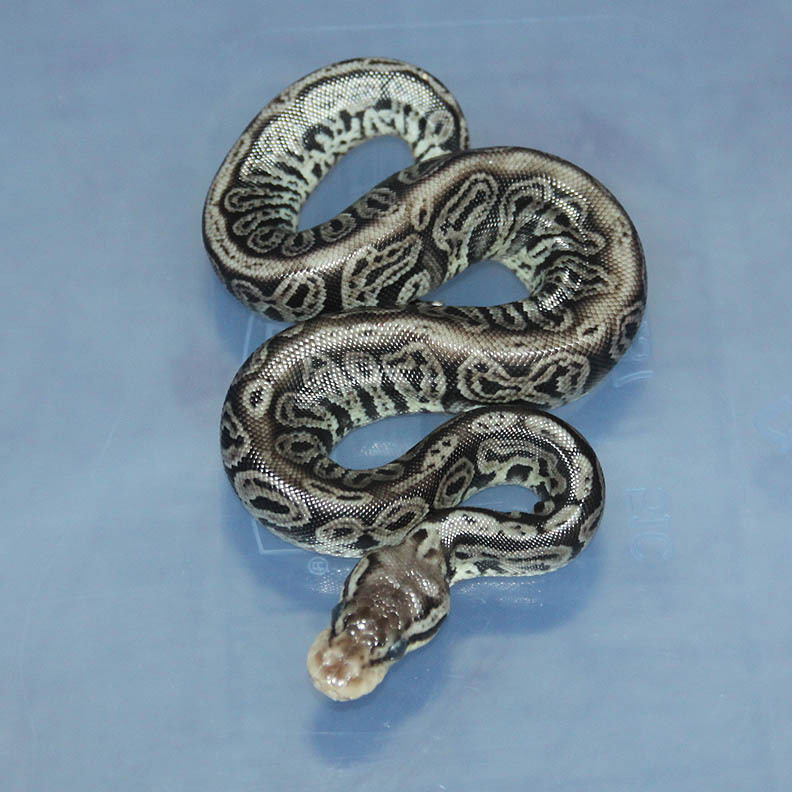 Description: Black Stripe Genetic Stripe Het Lavender 1/12 x Het Lavender Pos Het Genetic Stripe 3/11. If you are interested in animals from clutch #155 please email or call 519-824-7377. 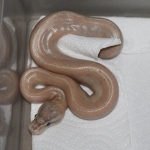 Description: Pastel Red Axanthic Chocolate 1/12 x Het Red Axanthic 10/06. 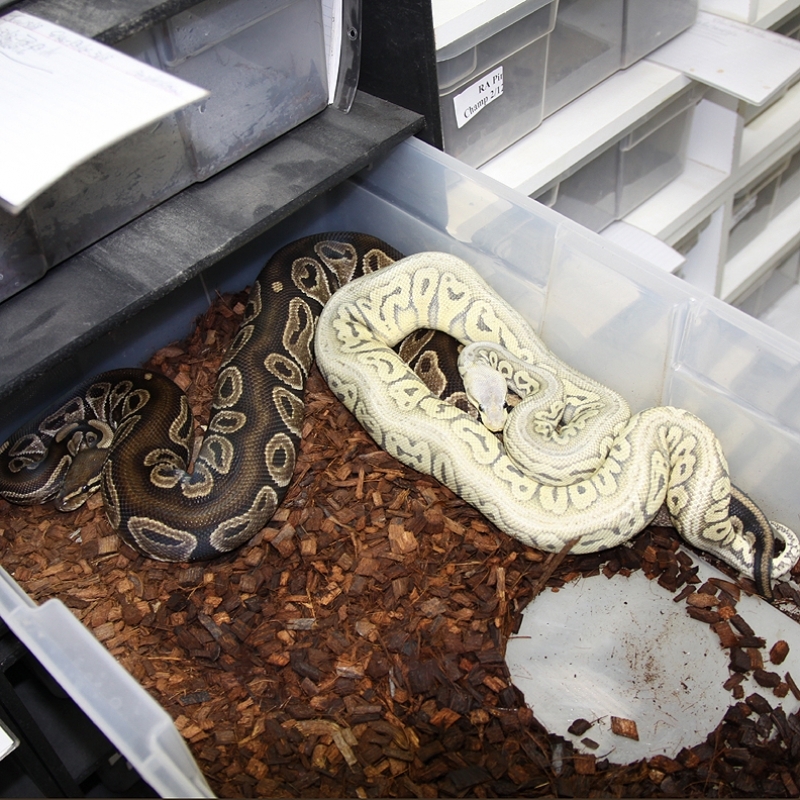 If you are interested in animals from clutch #156 please email or call 519-824-7377. 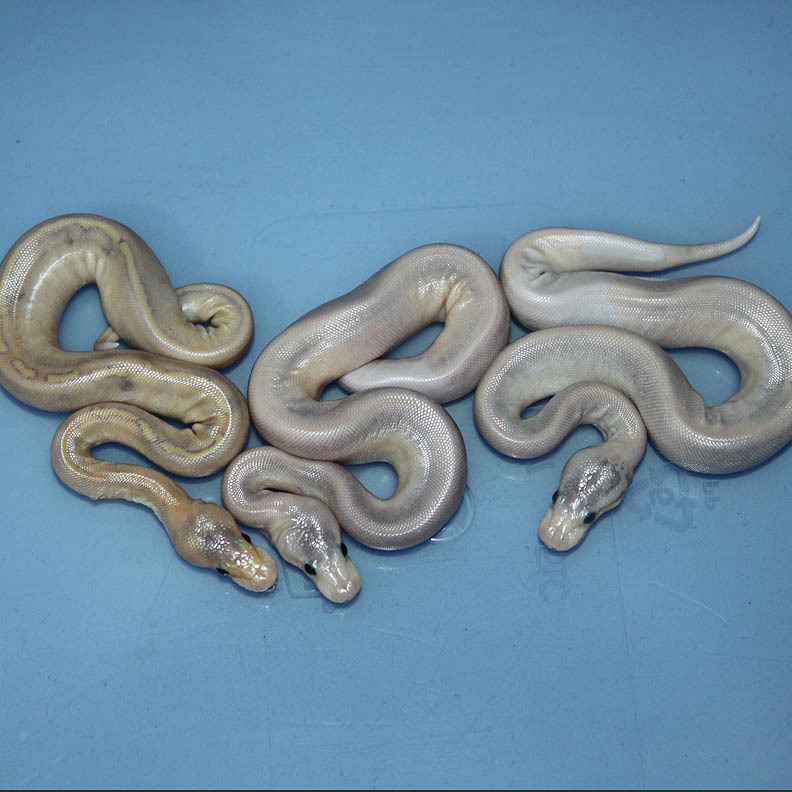 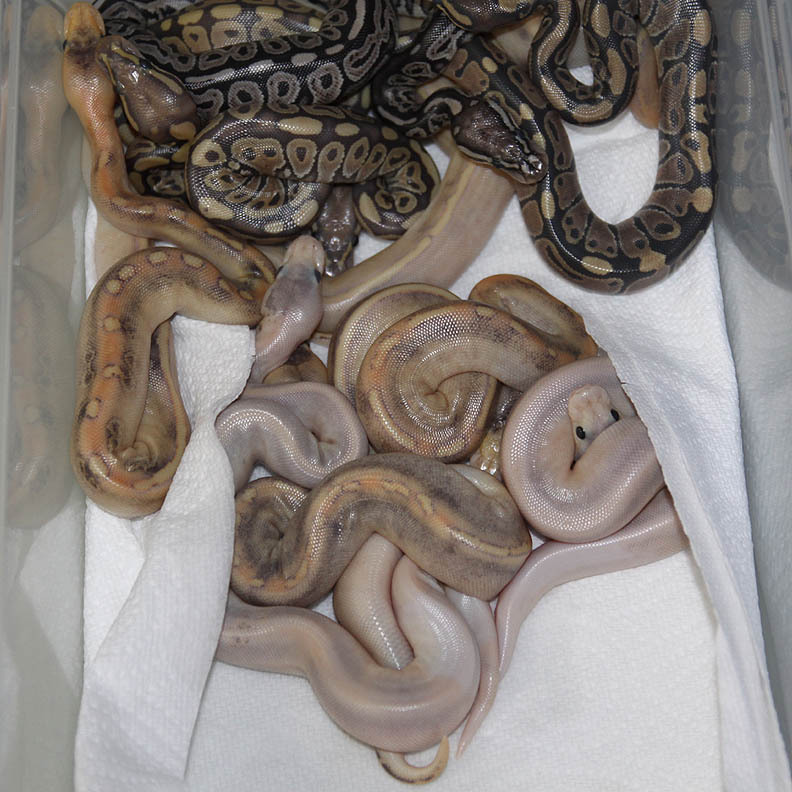 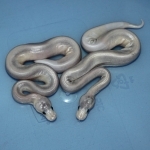 Description: Red Axanthic Pinstripe Champagne 2/12 x Super Pastel Champagne Het Red Axanthic 1/11. 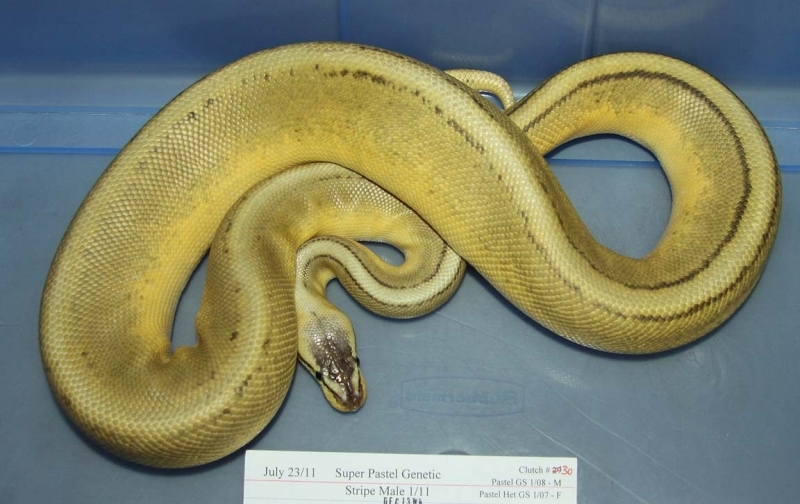 The Super Champagne is suppose to be a delirious gene. 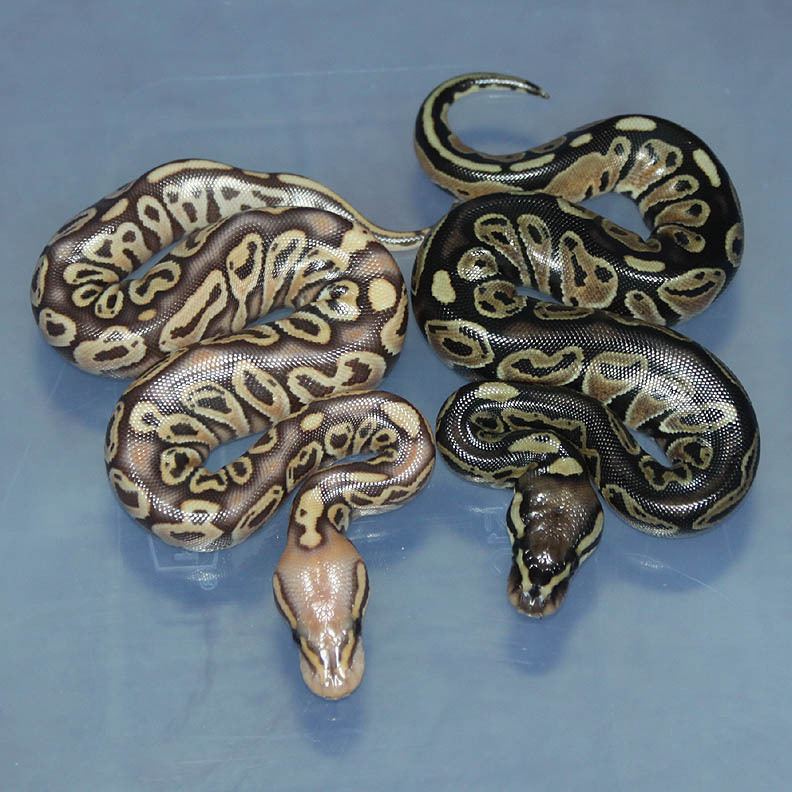 But, I don't know the background of the other breedings that have been done. 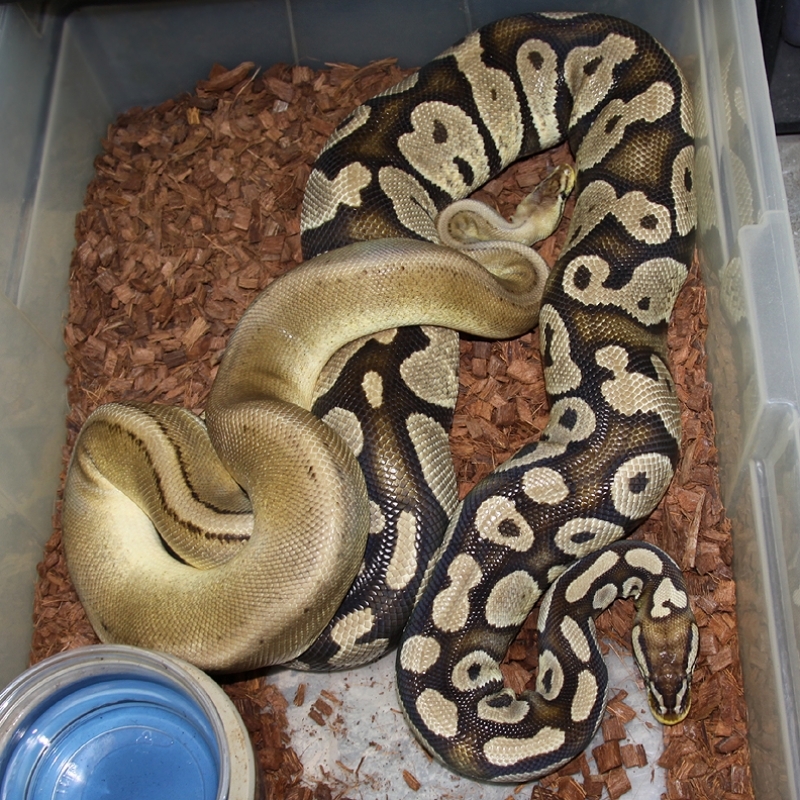 Did they not live because of inbreeding (brother x sister or father x daughter??). Or, does having other healthier genes in the mix make a difference? Anyways, I've both outcrossed and did multi gene champagne x multi gene champagne to see if it makes a difference. 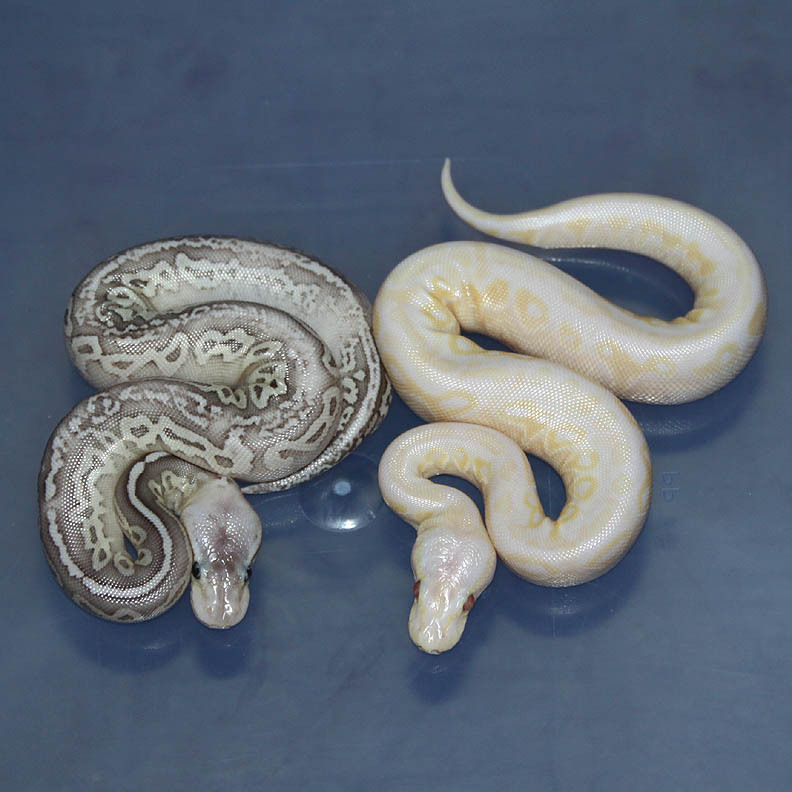 I had the champagne females sitting here so why not try and figure it out???? 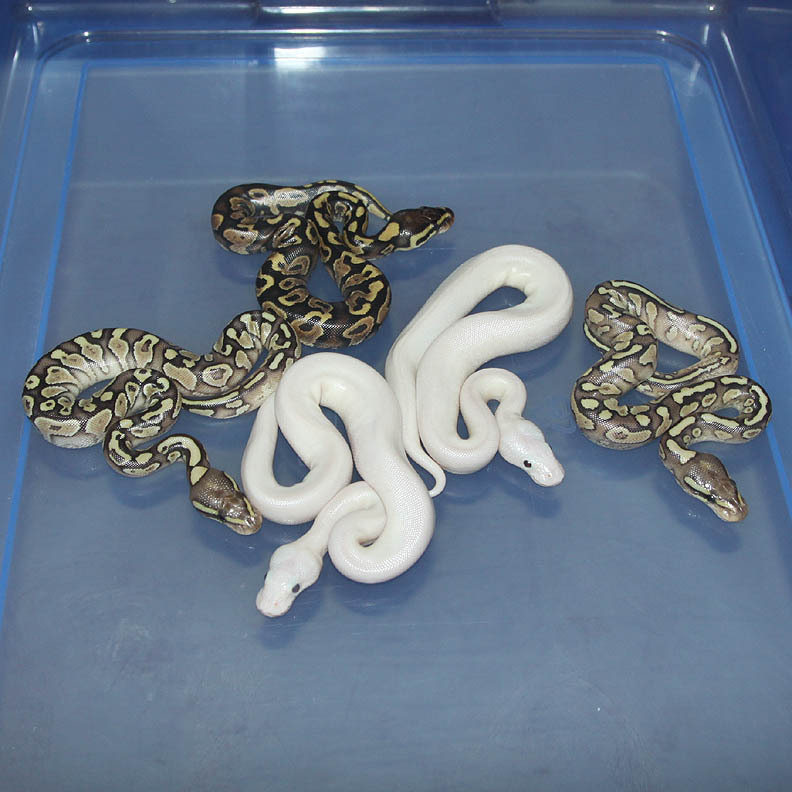 If you are interested in animals from clutch #157 please email or call 519-824-7377. 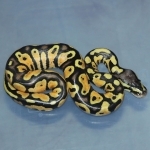 Description: Citrus Puma 1/11 x Pastel HRA YB 1/09. 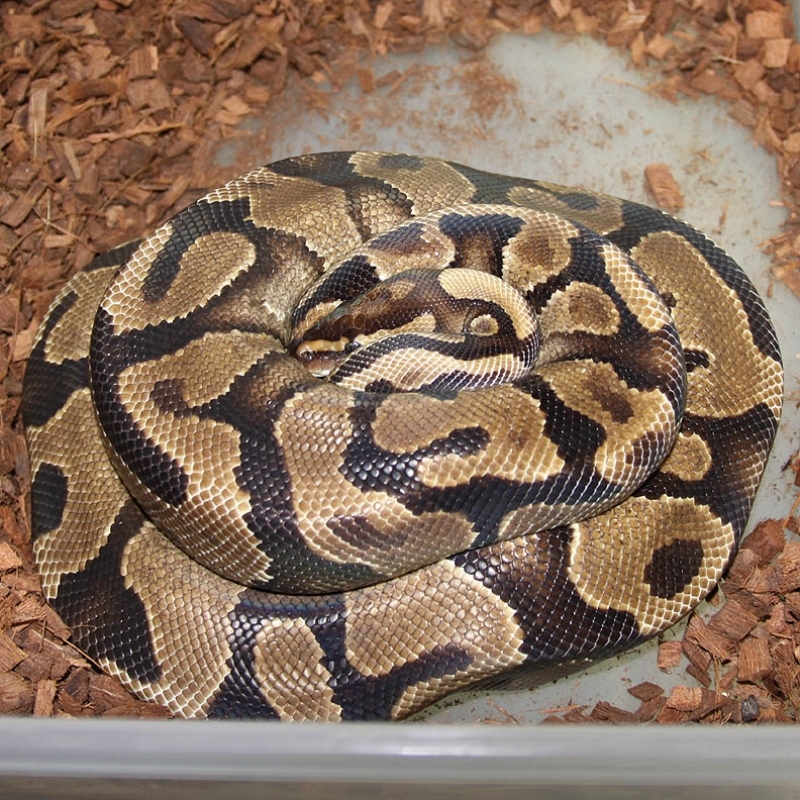 If you are interested in animals from clutch #158 please email or call 519-824-7377. 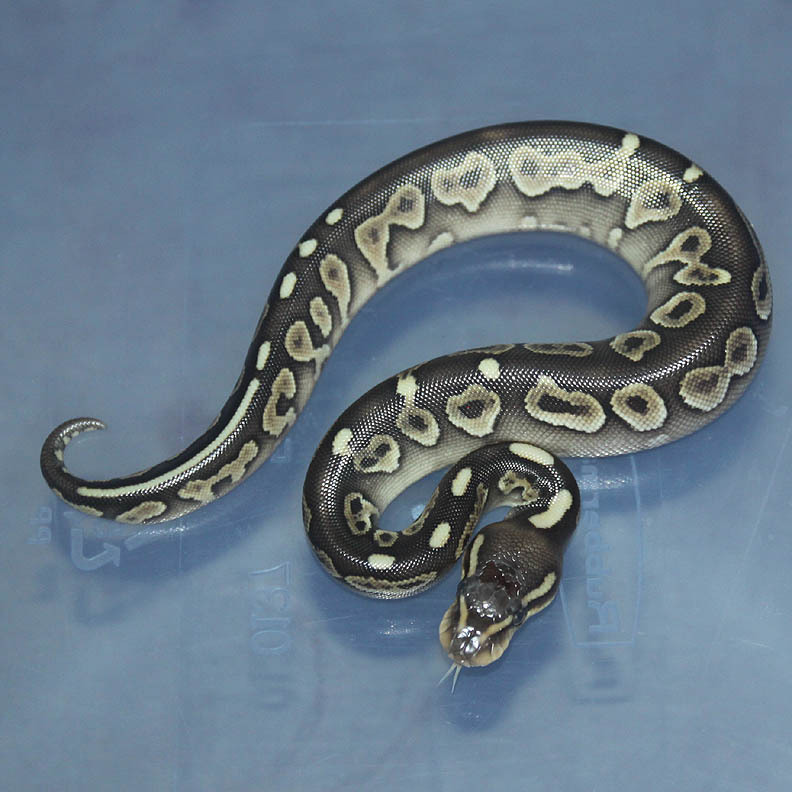 Description: Super Pastel Puzzle 1/12 x Mutation X Genetic Stripe 2/11. 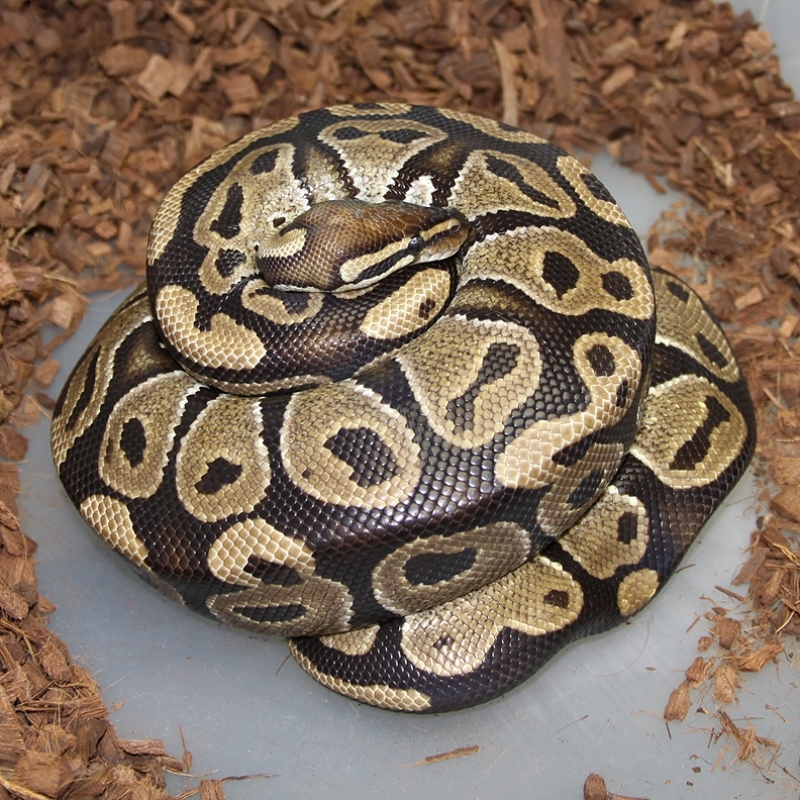 If you are interested in animals from clutch #159 please email or call 519-824-7377. 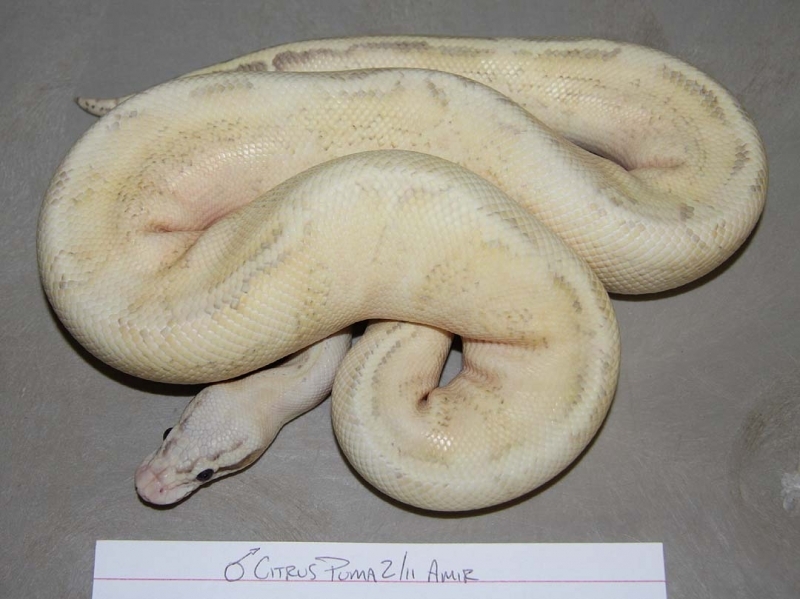 Description: Citrus Puma 2/11 x Opal HRA 2/09. 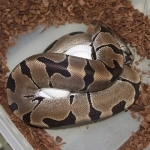 If you are interested in animals from clutch #160 please email or call 519-824-7377. 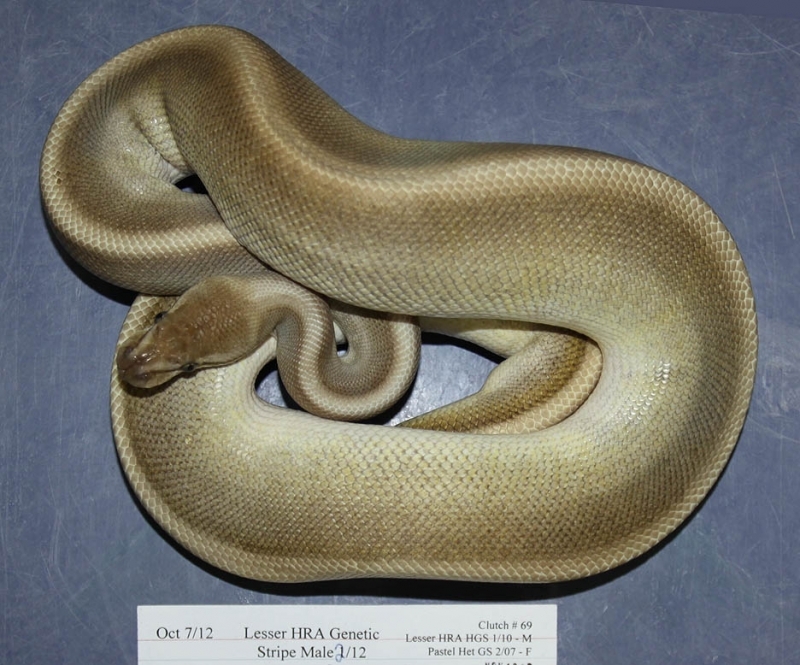 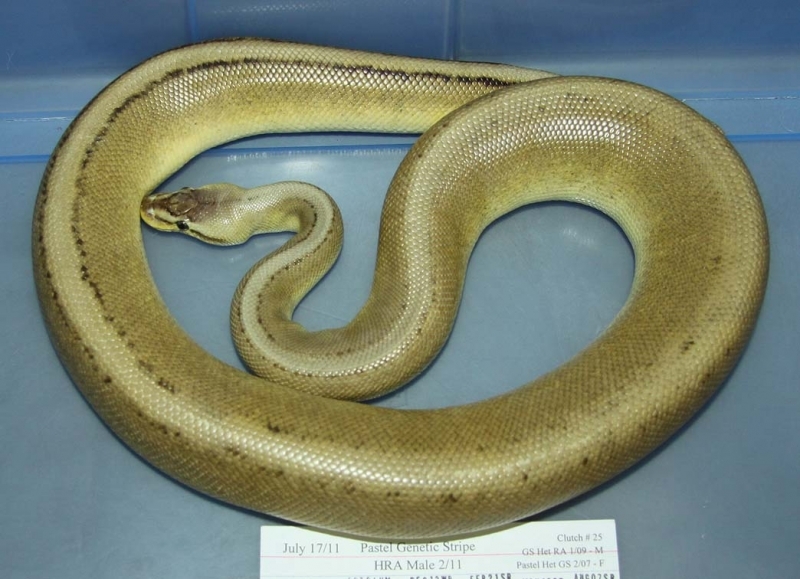 Description: Lesser Genetic Stripe HRA 2/12 x Het RA/GS 4/08. 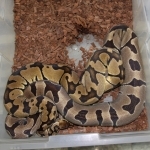 If you are interested in animals from clutch #161 please email or call 519-824-7377. 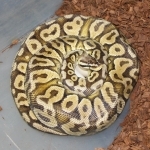 Description: Super Pastel YB HOG 1/12 x Pastel YB DH OG 6/11. If you are interested in animals from clutch #162 please email or call 519-824-7377. 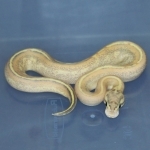 Description: Citrus Puma 2/11 x Pastel HRA YB 1/10. 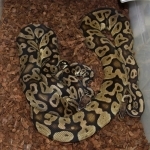 If you are interested in animals from clutch #163 please email or call 519-824-7377. 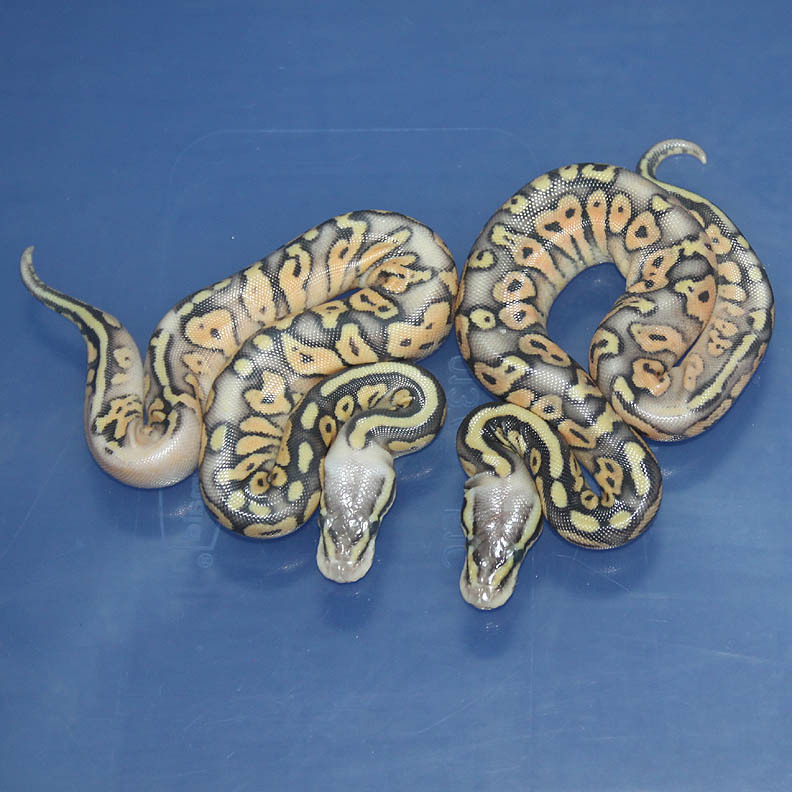 Description: Citrus Puma 2/11 x Pastel Caramel 3/09. 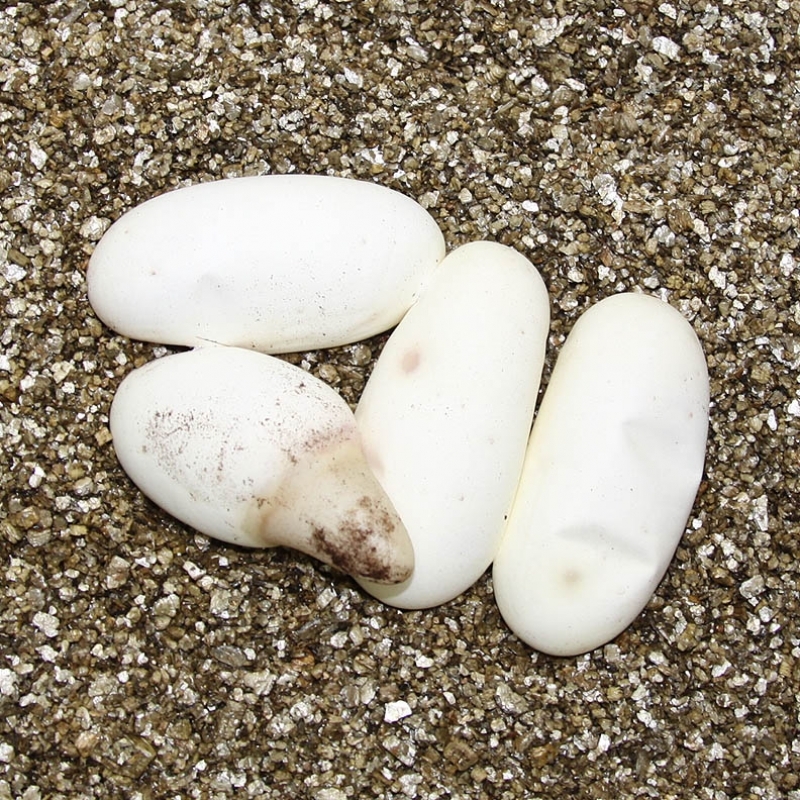 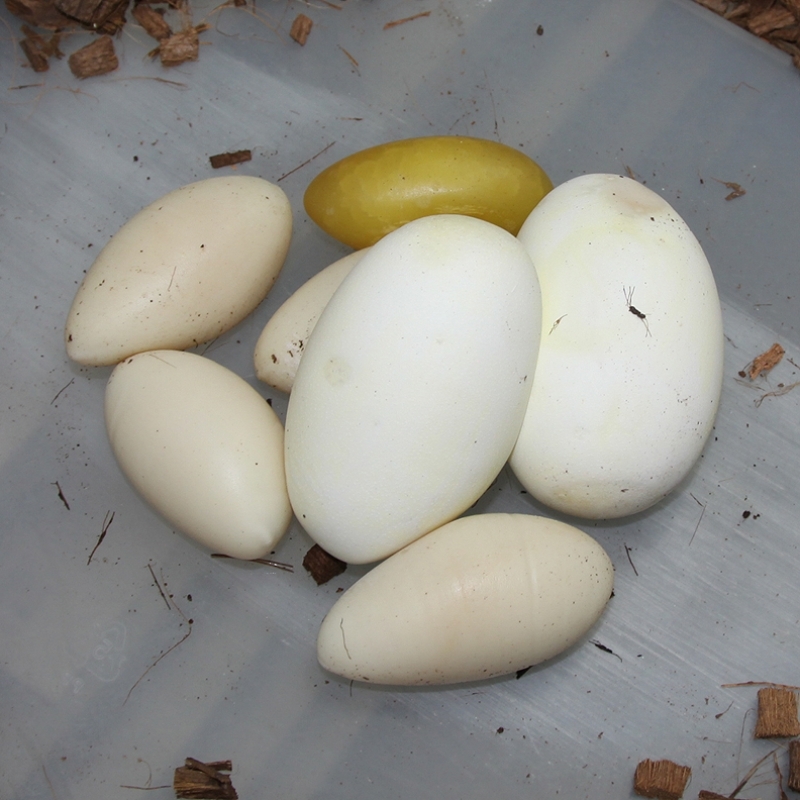 The clutch just previous to this one (CL 163) was fathered by the same male and had 1 good egg and 7 slugs. 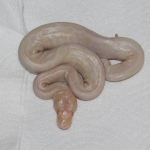 So, did this female slug out because she was a caramel or did she slug out because of the male????? If you are interested in animals from clutch #164 please email or call 519-824-7377. 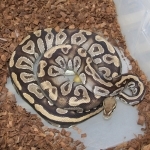 Description: Mimosa HRA 1/12 x Het RA/OG "Twin" 12/08. 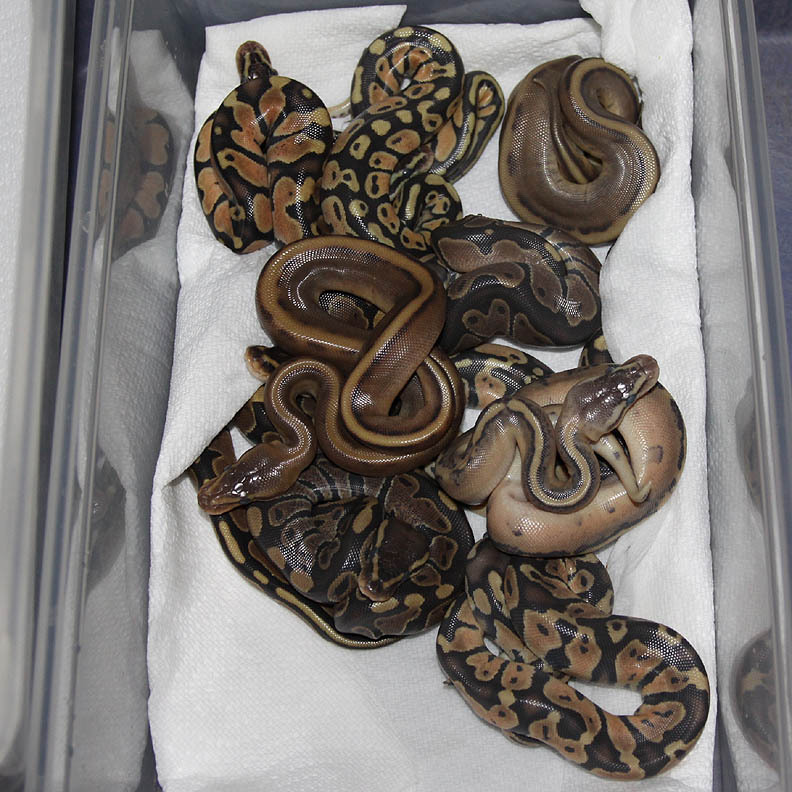 If you are interested in animals from clutch #165 please email or call 519-824-7377. Description: Pastel Genetic Stripe HRA 2/11 x Pastel Het Genetic Stripe 2/07. 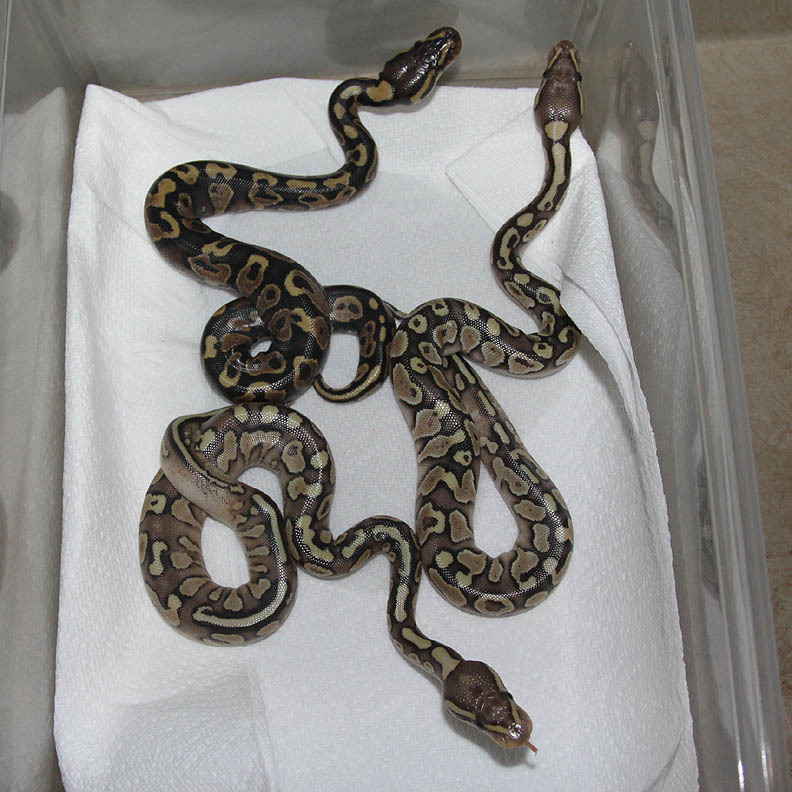 If you are interested in animals from clutch #166 please email or call 519-824-7377. 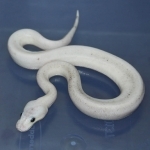 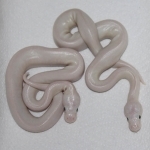 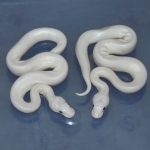 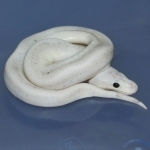 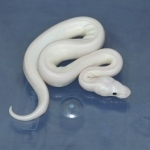 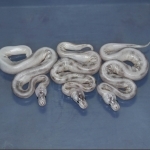 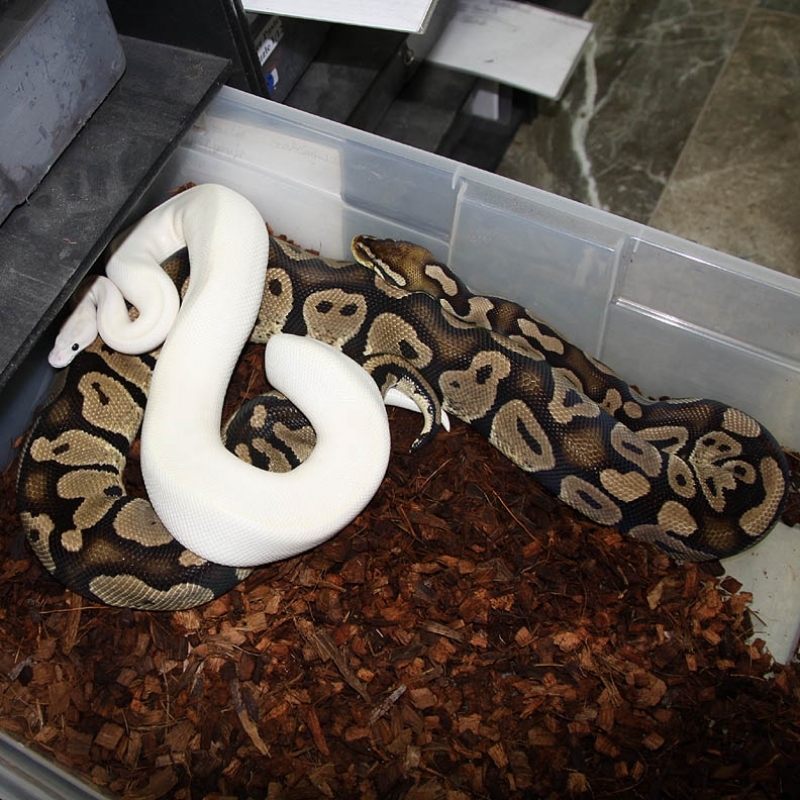 Description: Red Axanthic Snow 1/09 x Het RA/Albino 2/09. 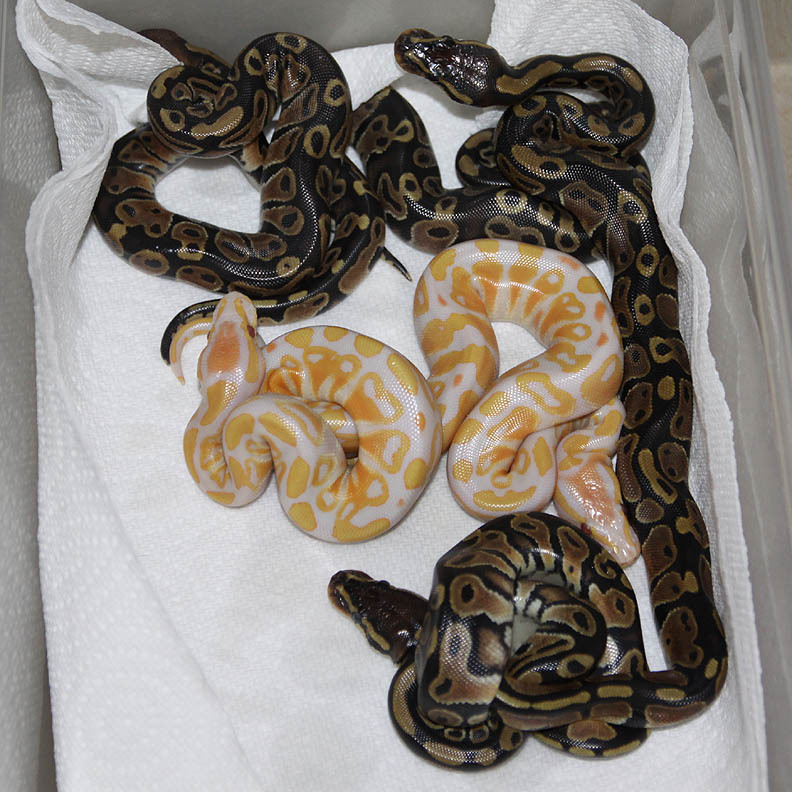 If you are interested in animals from clutch #167 please email or call 519-824-7377. Description: Ivory HRA 1/12 x Het RA 20/06. 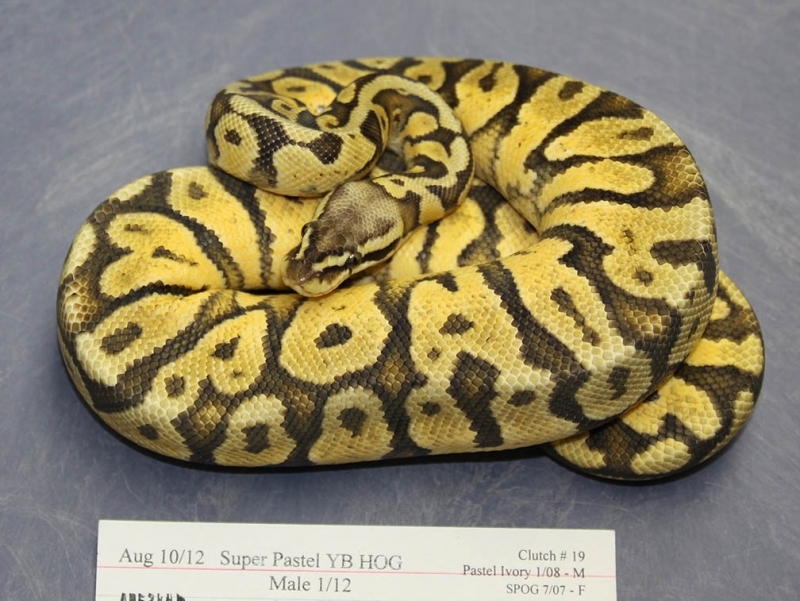 If you are interested in animals from clutch #168 please email or call 519-824-7377. 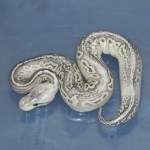 Description: Super Phantom 6/10 RDR x Phantom 4/10 DW. 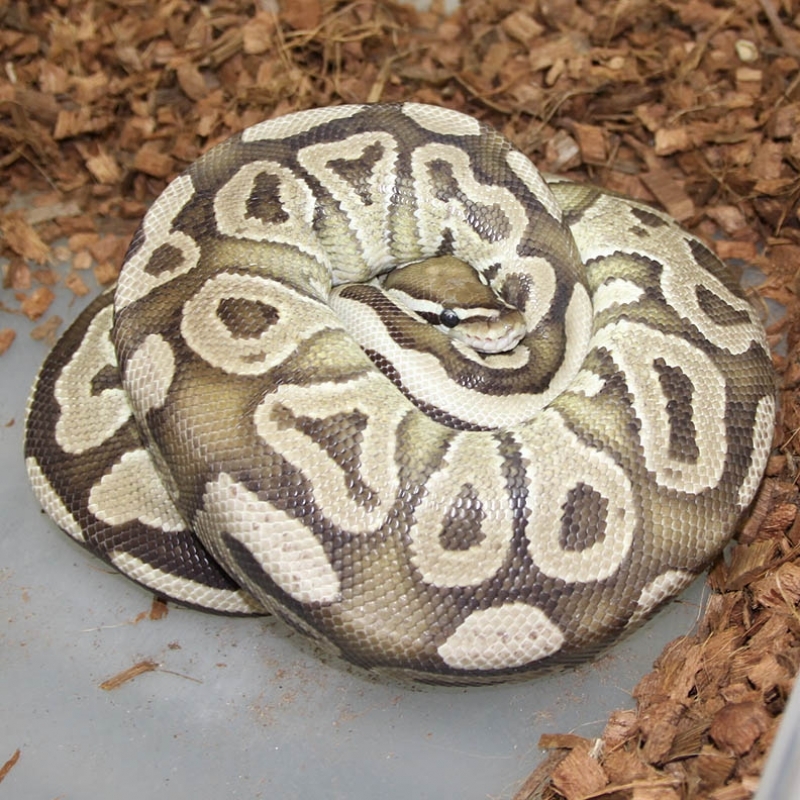 If you are interested in animals from clutch #169 please email or call 519-824-7377. Description: Super Phantom 6/10 RDR x Phantom 10/10 DW. 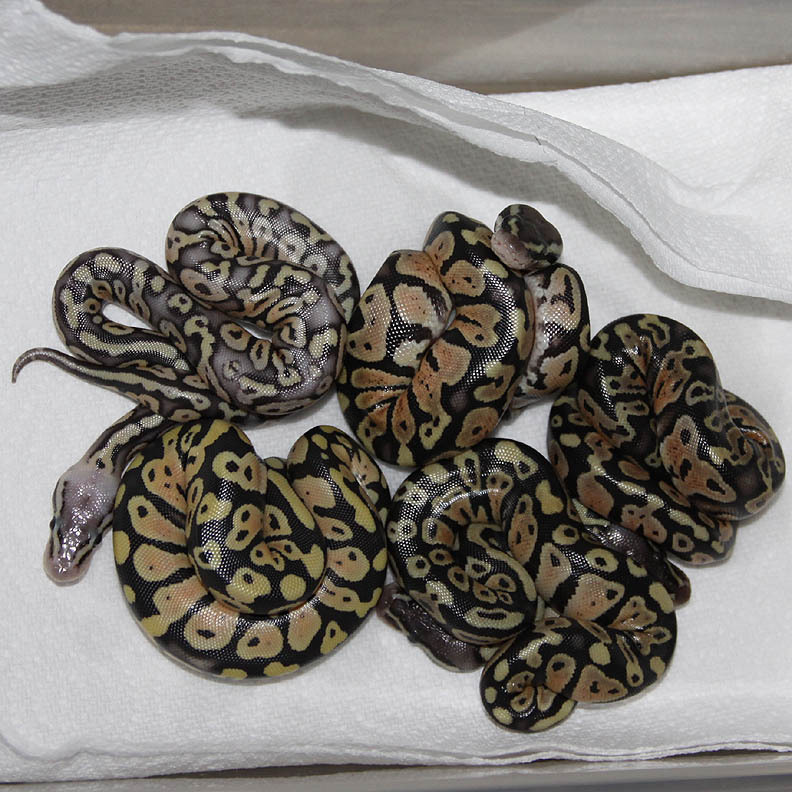 If you are interested in animals from clutch #170 please email or call 519-824-7377. 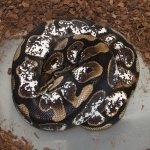 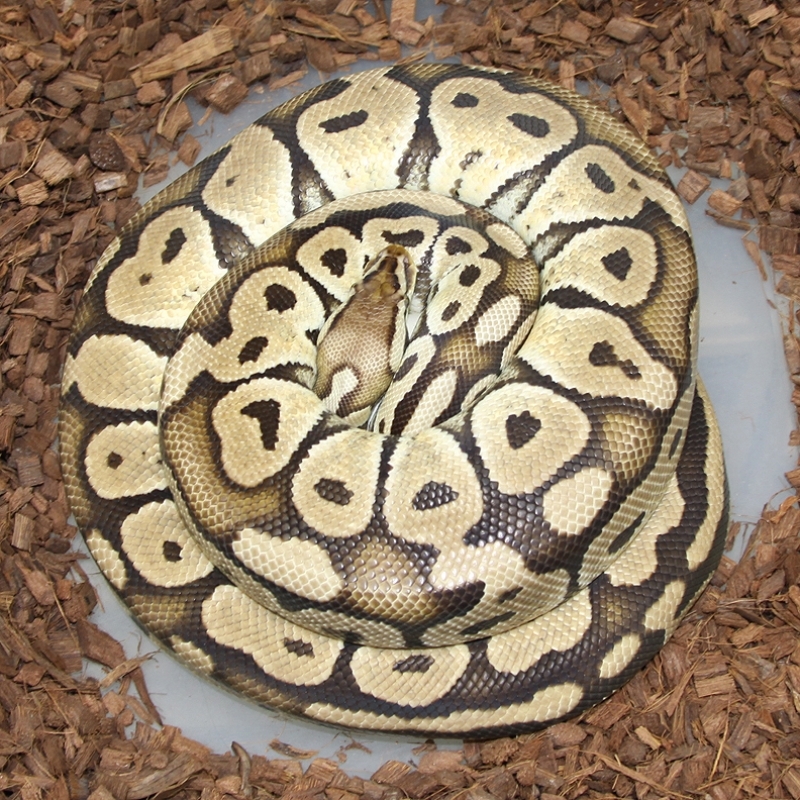 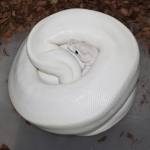 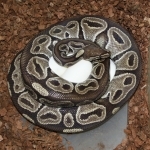 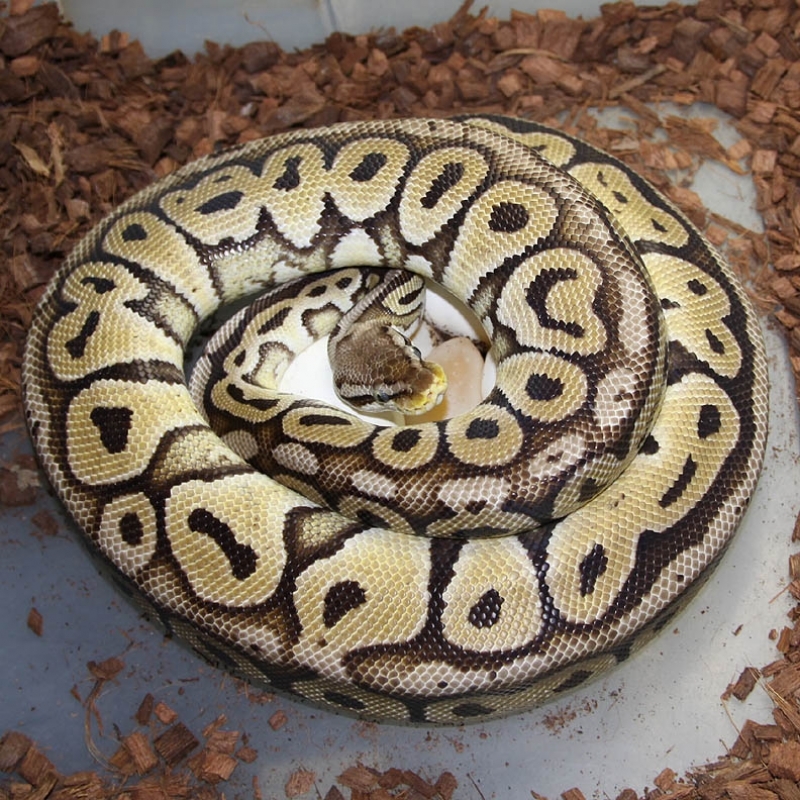 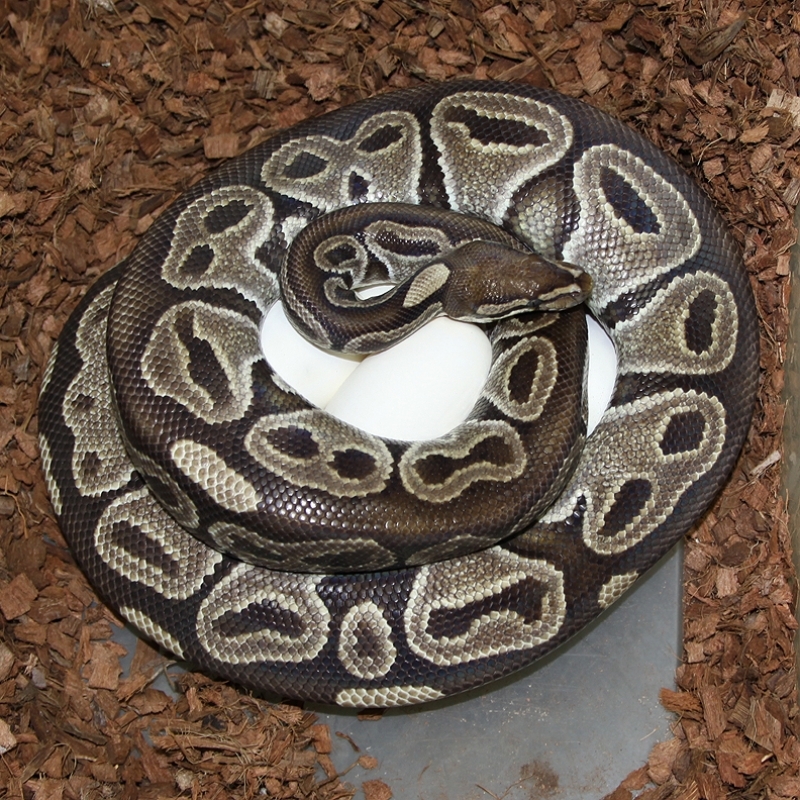 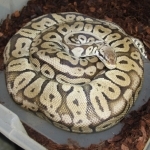 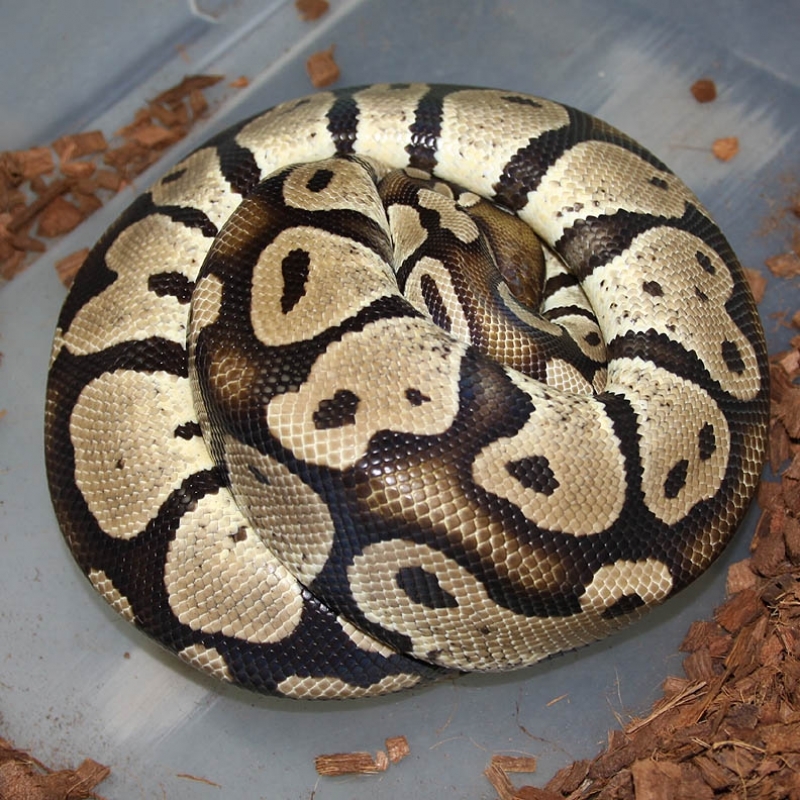 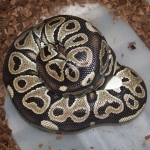 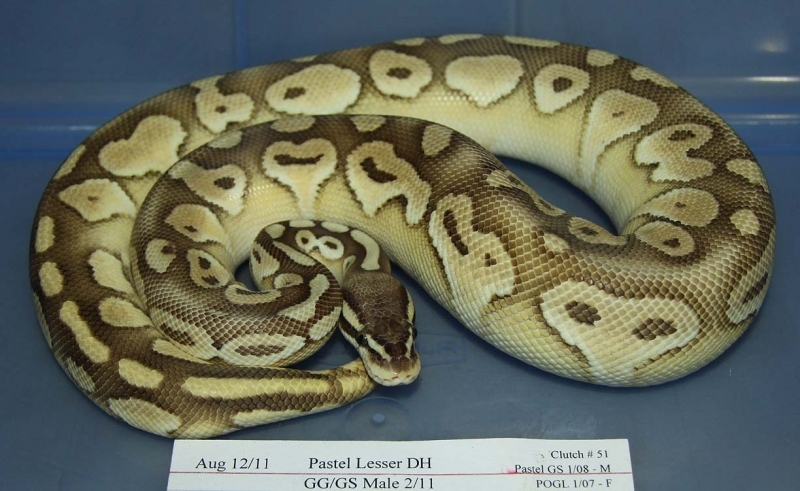 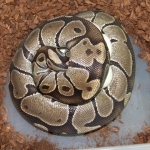 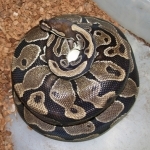 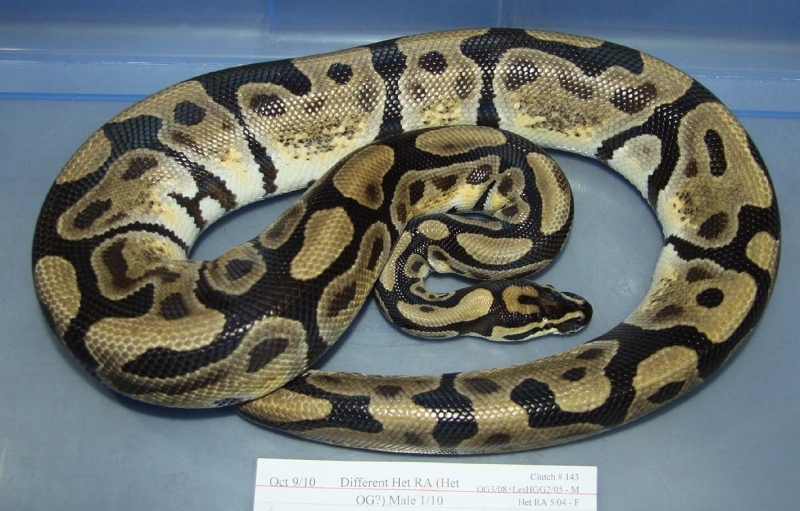 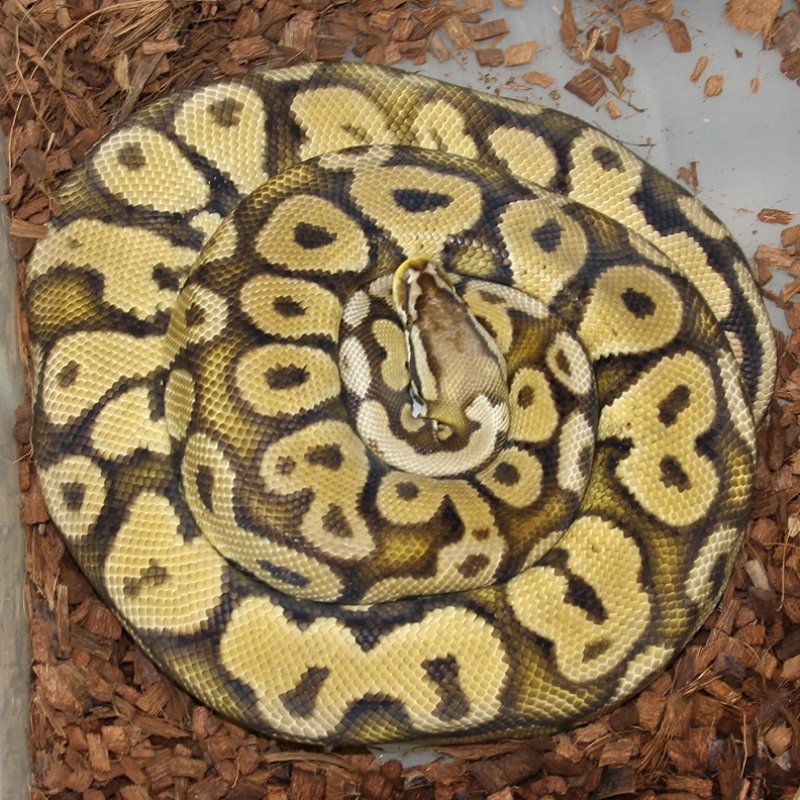 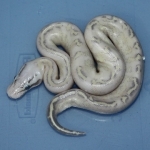 Description: Leopard Pied 1/11 x Pastel Het Pied 1/10. 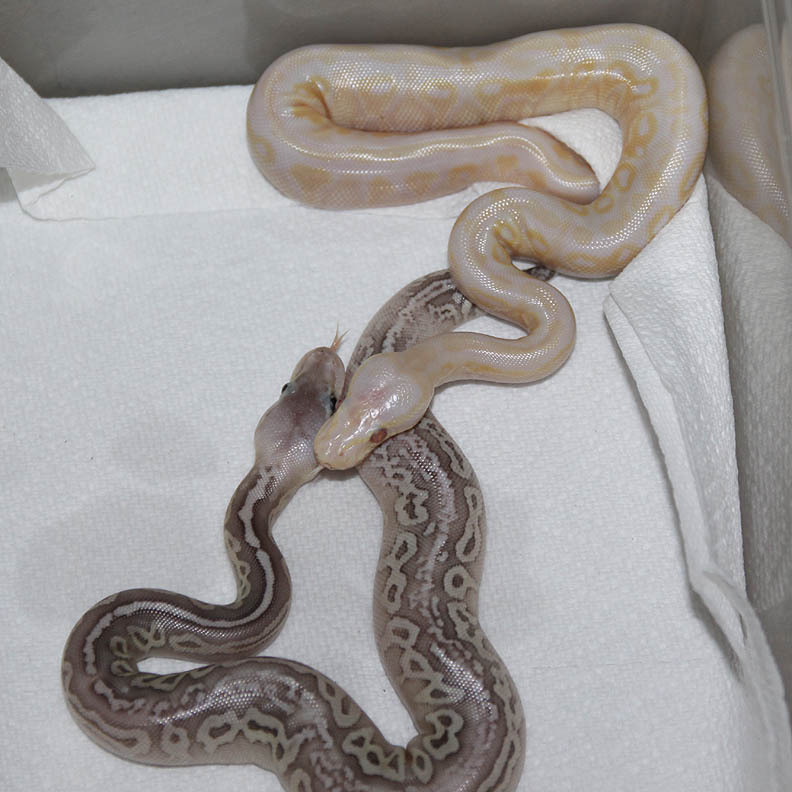 As a breeder you go through spells like this. 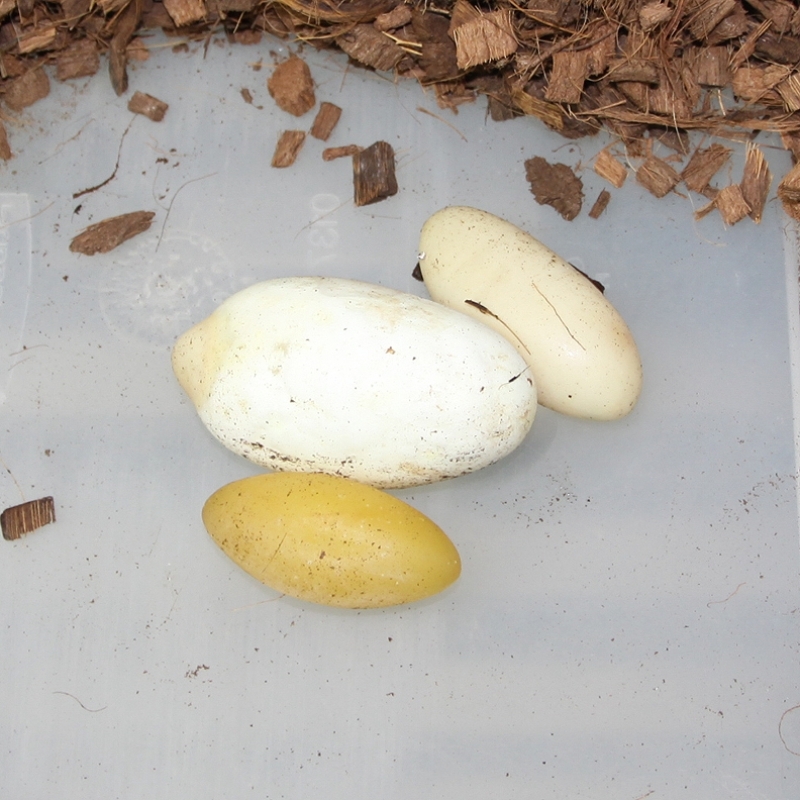 You'll have a run of good eggs, then a run of slugs, then a run of eggs and another run of slugs...etc. This run of slugs has got to be over soon! 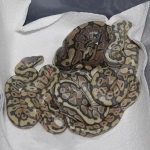 If you are interested in animals from clutch #171 please email or call 519-824-7377. Description: Citrus Puma 2/11 x YB 1/10. If you are interested in animals from clutch #172 please email or call 519-824-7377. 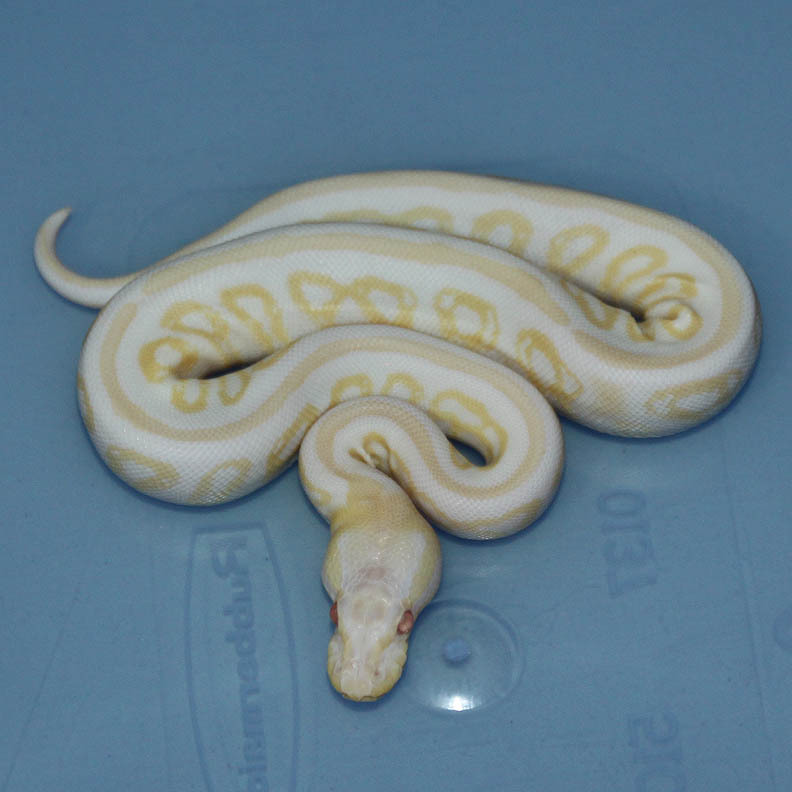 Description: Mutation X HOG 2/12 x Lemon Blast Het RA/OG 1/12. 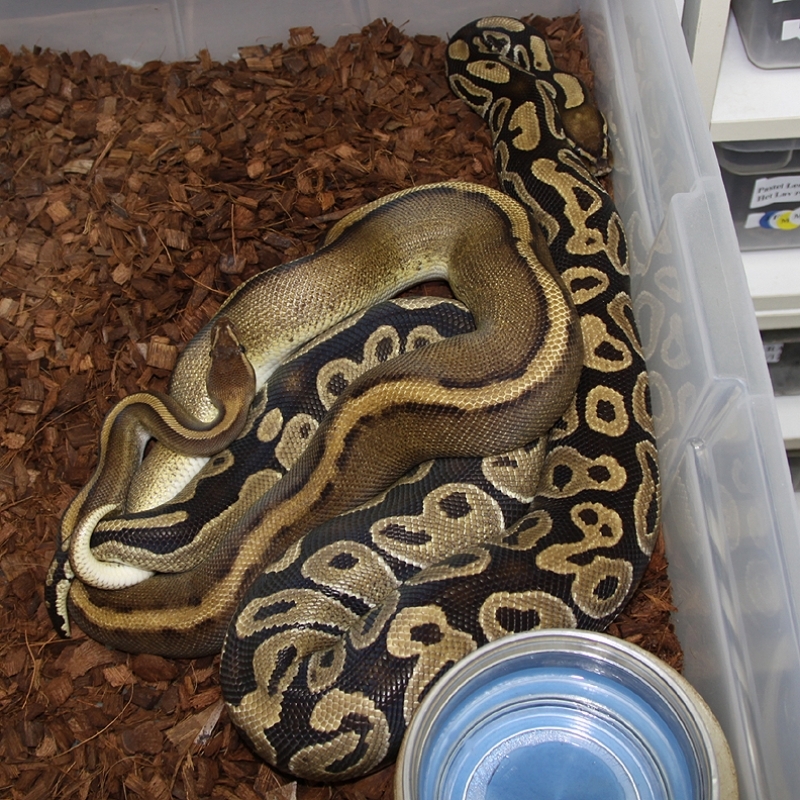 If you are interested in animals from clutch #173 please email or call 519-824-7377. Description: Lesser Genetic Stripe HRA 2/12 & Pastel Lavender Het Genetic Stripe 1/10 RDR x Het Genetic Stripe 1/08. 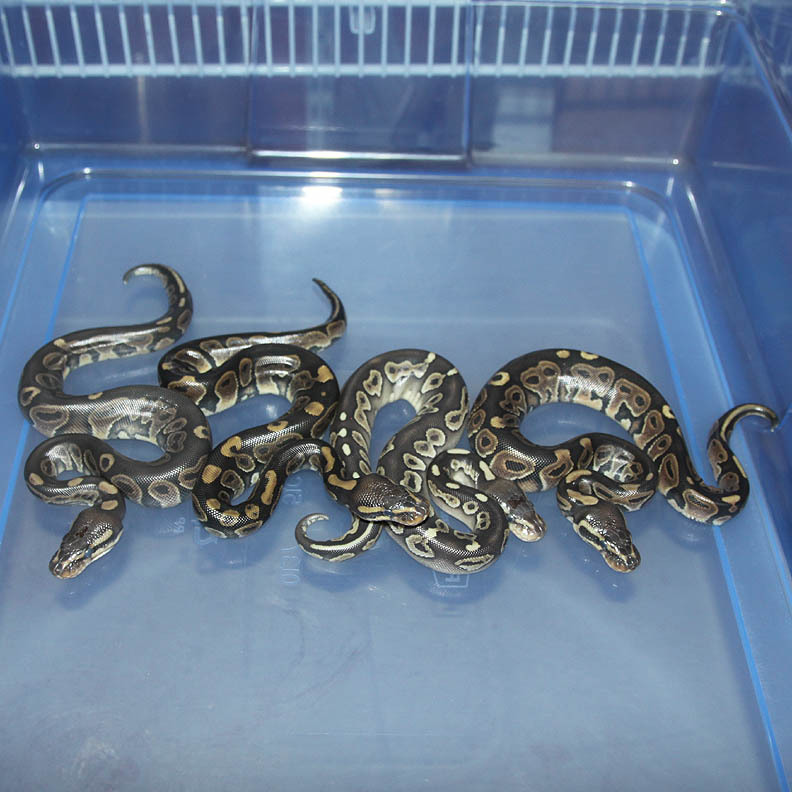 If you are interested in animals from clutch #174 please email or call 519-824-7377. 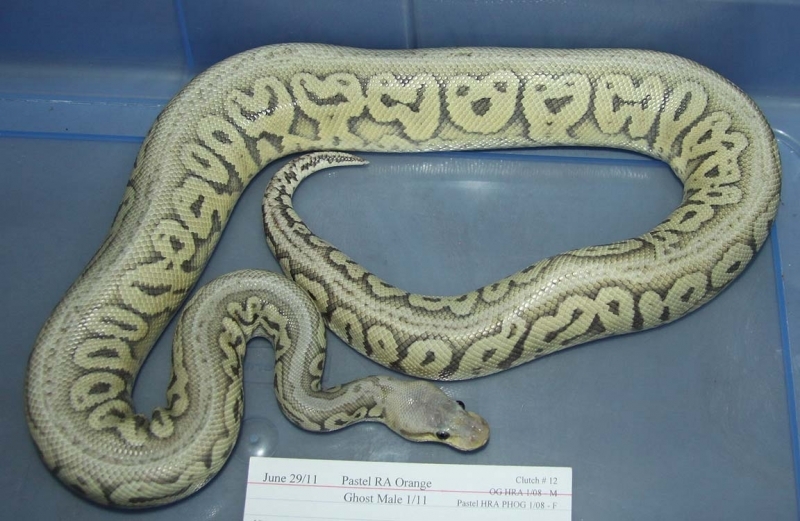 Description: Mutation X Pastel 1/12 x Sugar 1/10 Henry. 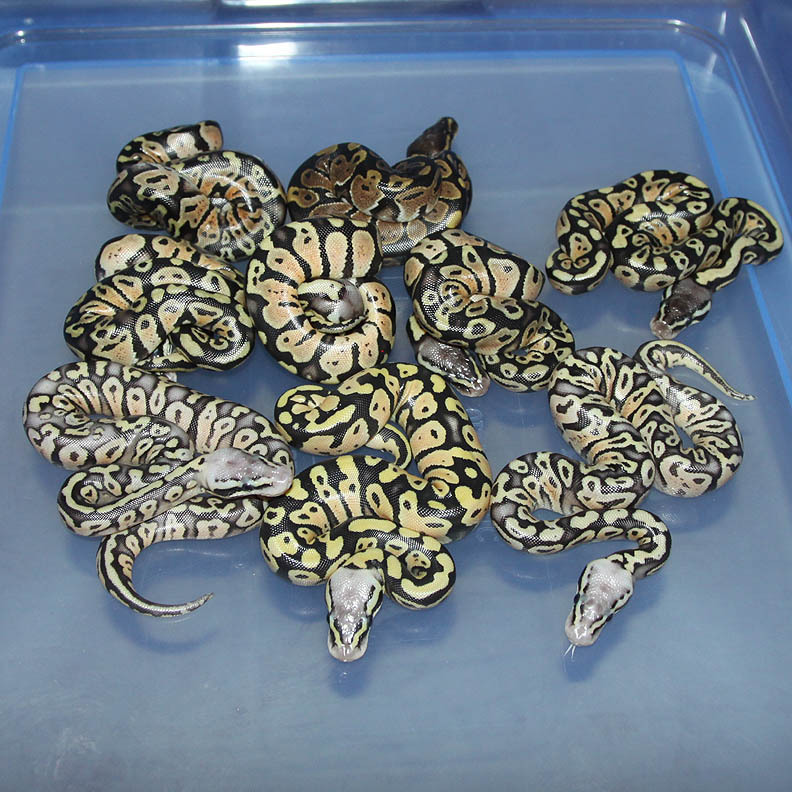 If you are interested in animals from clutch #175 please email or call 519-824-7377. 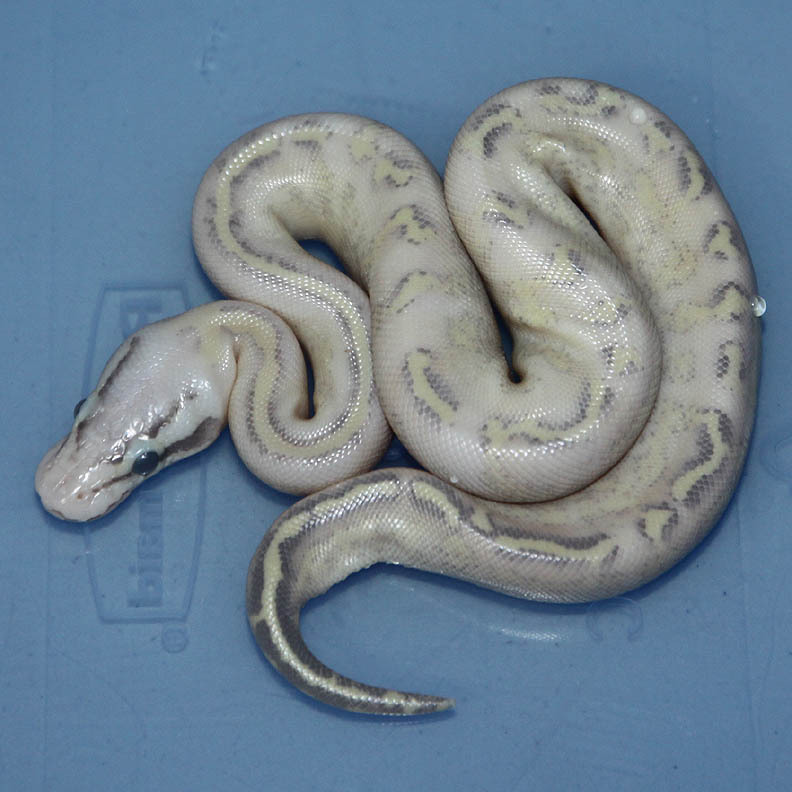 Description: Pastel Lesser DH GG/GS 1/11 x Pastel DH GG/GS 1/11. 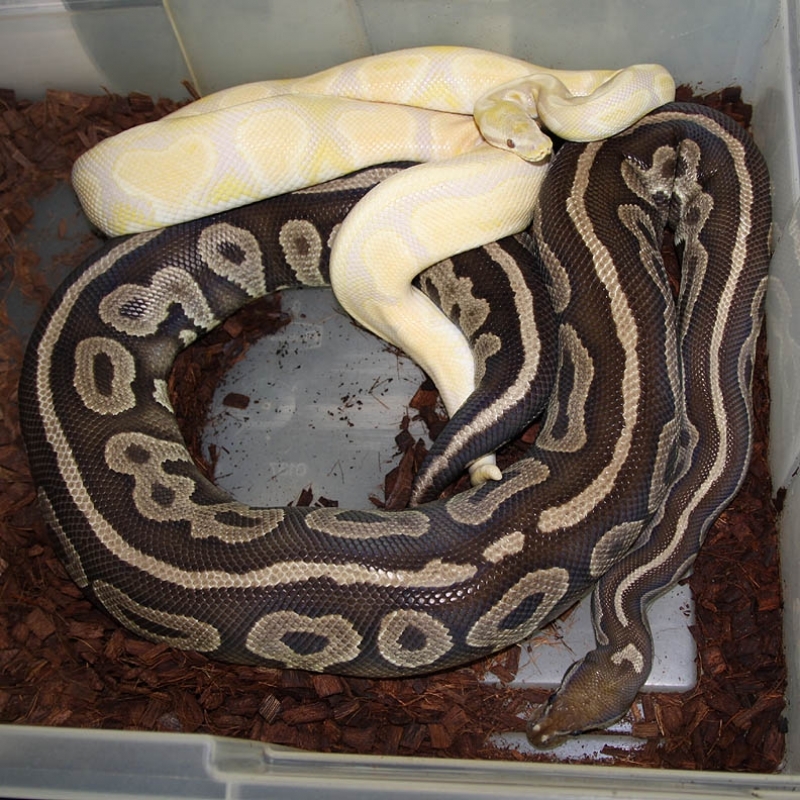 If you are interested in animals from clutch #176 please email or call 519-824-7377. 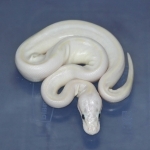 Description: Mutation X Pastel 1/12 x Ivory 1/11 (JW Line). The Ivory female I produced in 2011 from a Jesse Wilson line YB female that might have his special "X" gene in it. 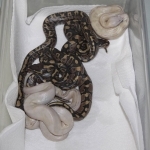 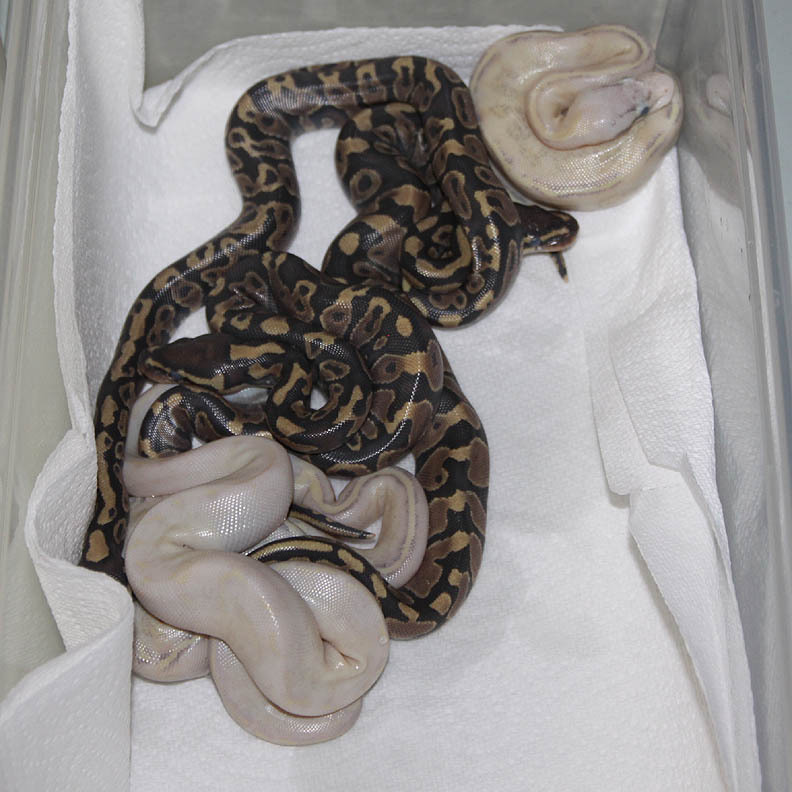 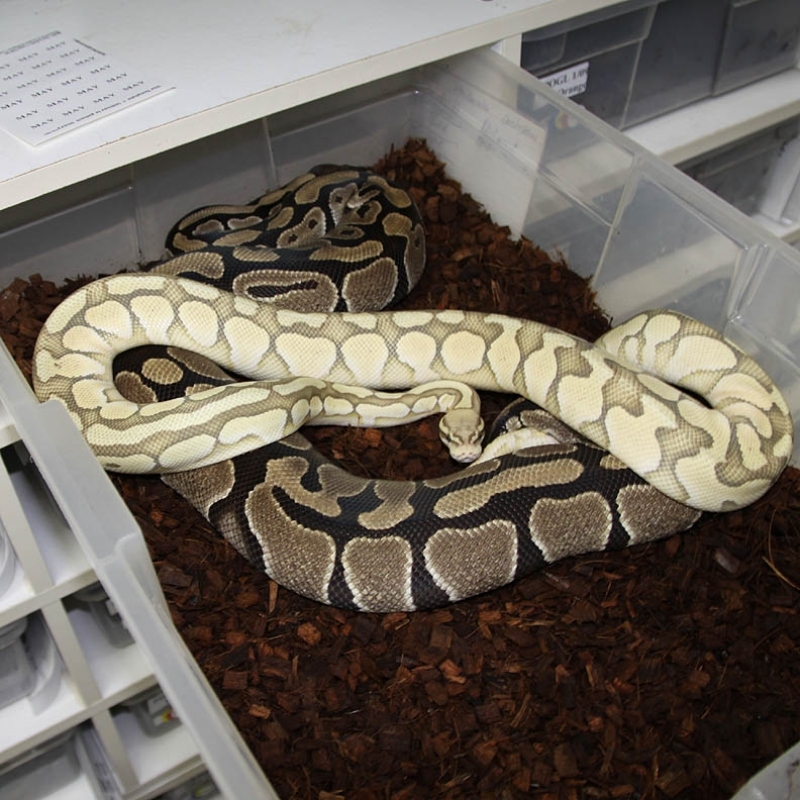 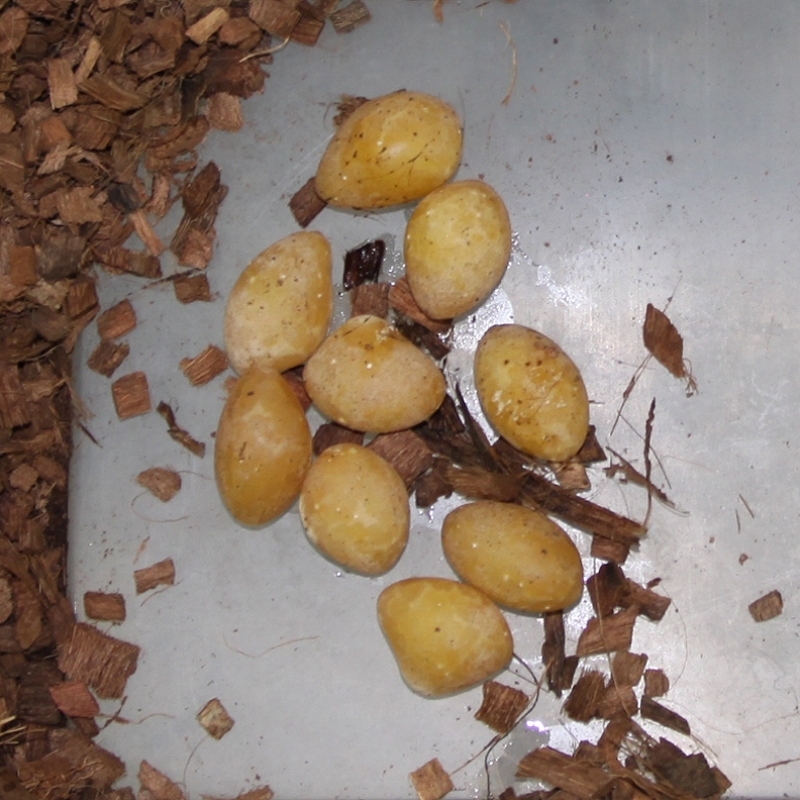 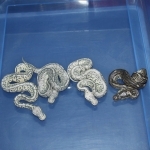 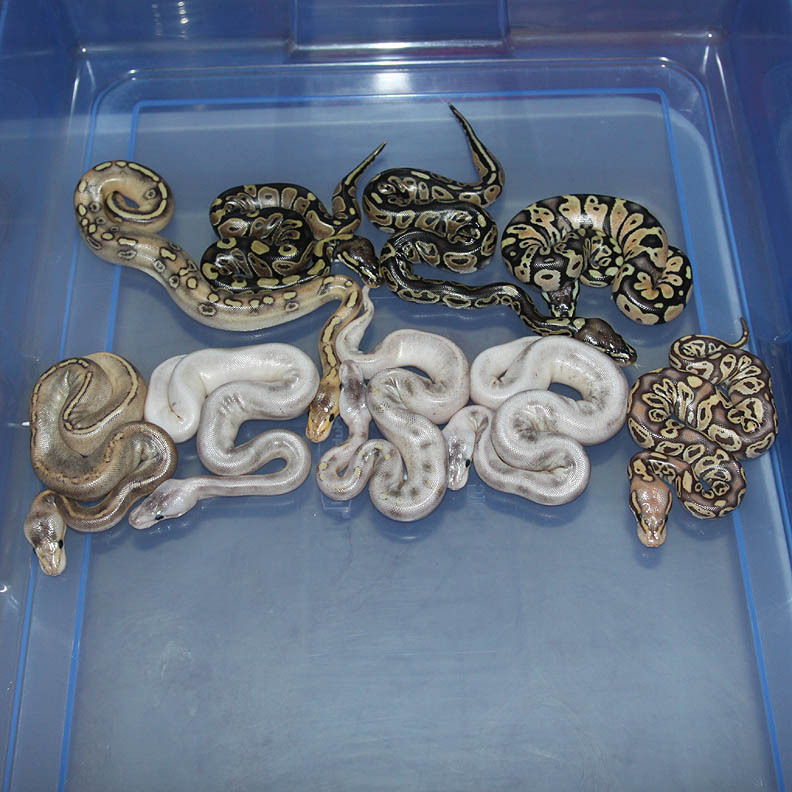 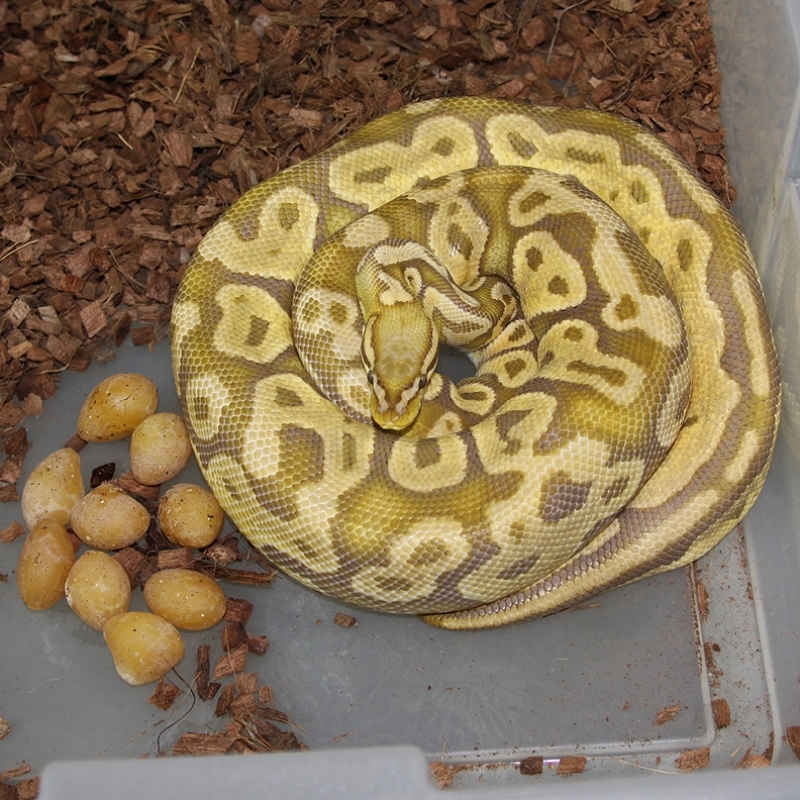 Any Mutation X animals in this clutch will also be Yellow Bellies. 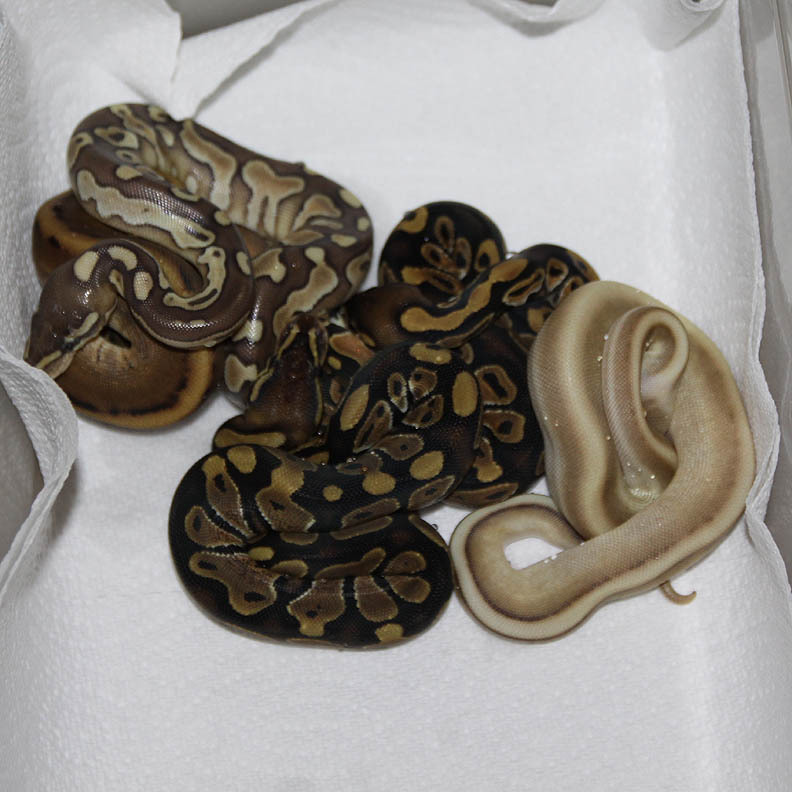 If you are interested in animals from clutch #177 please email or call 519-824-7377. 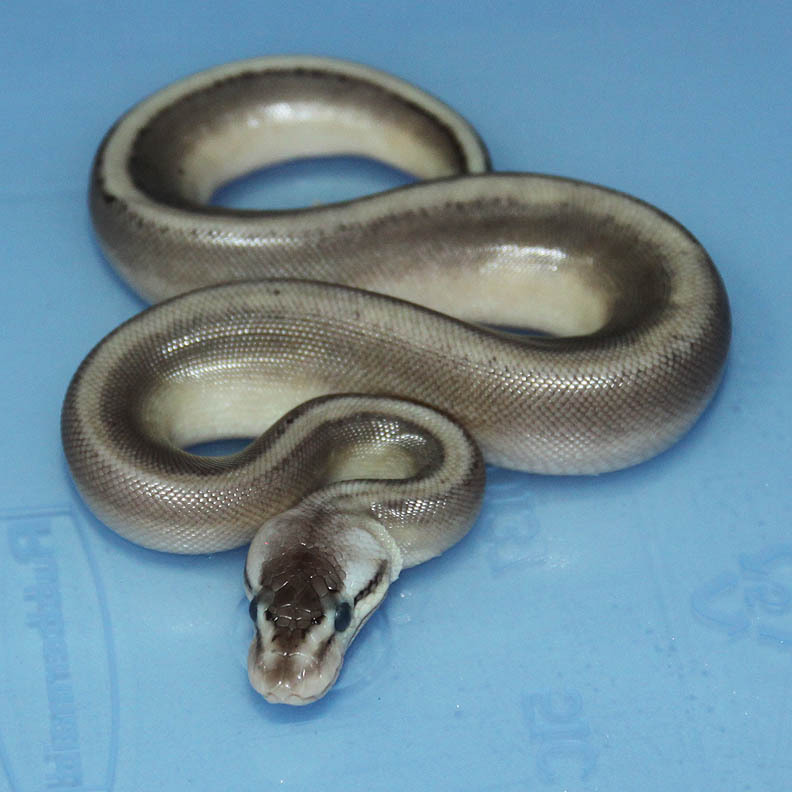 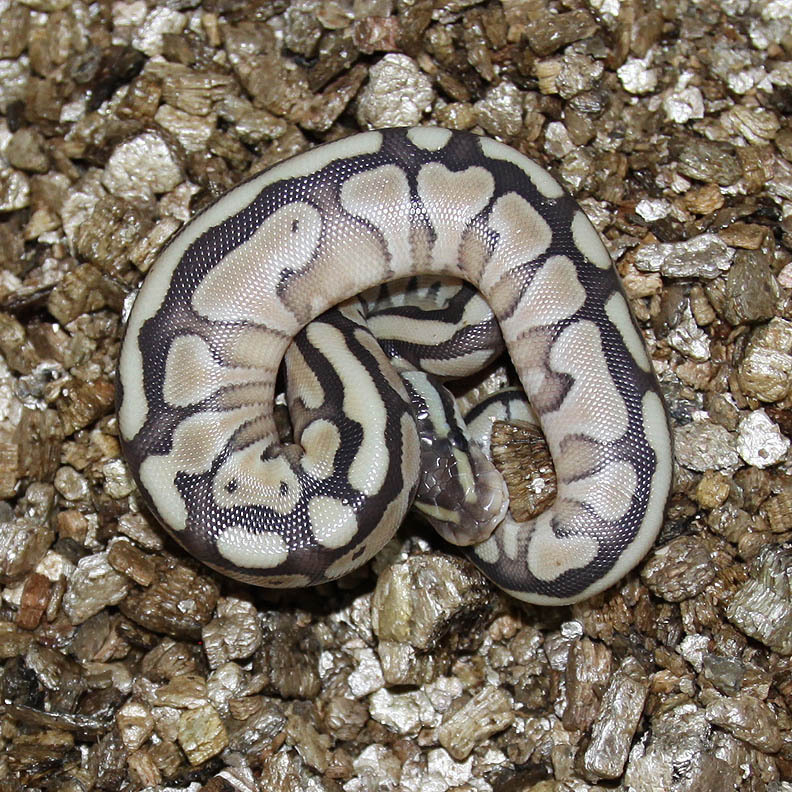 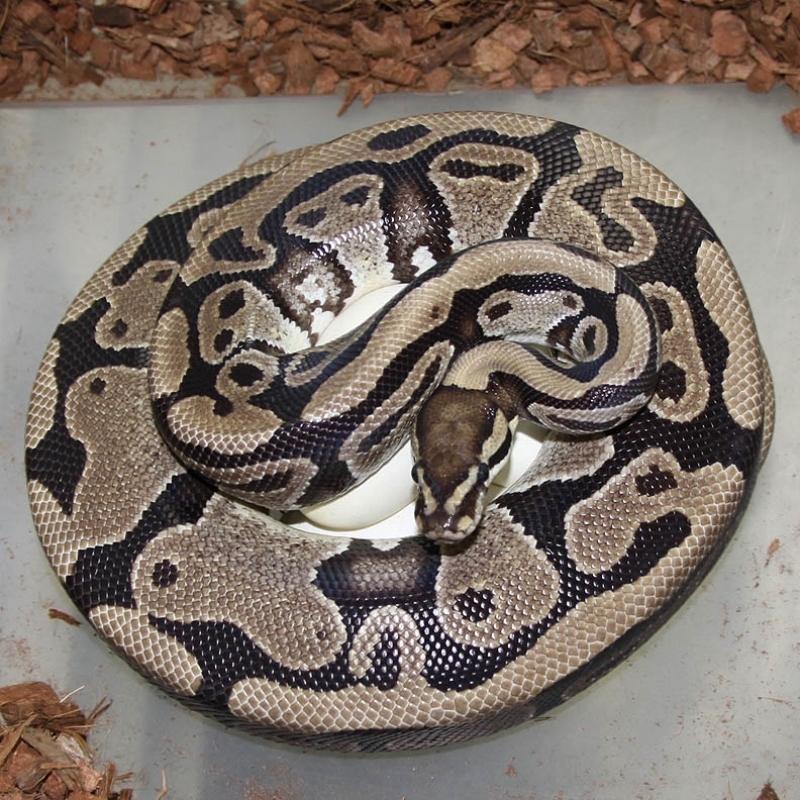 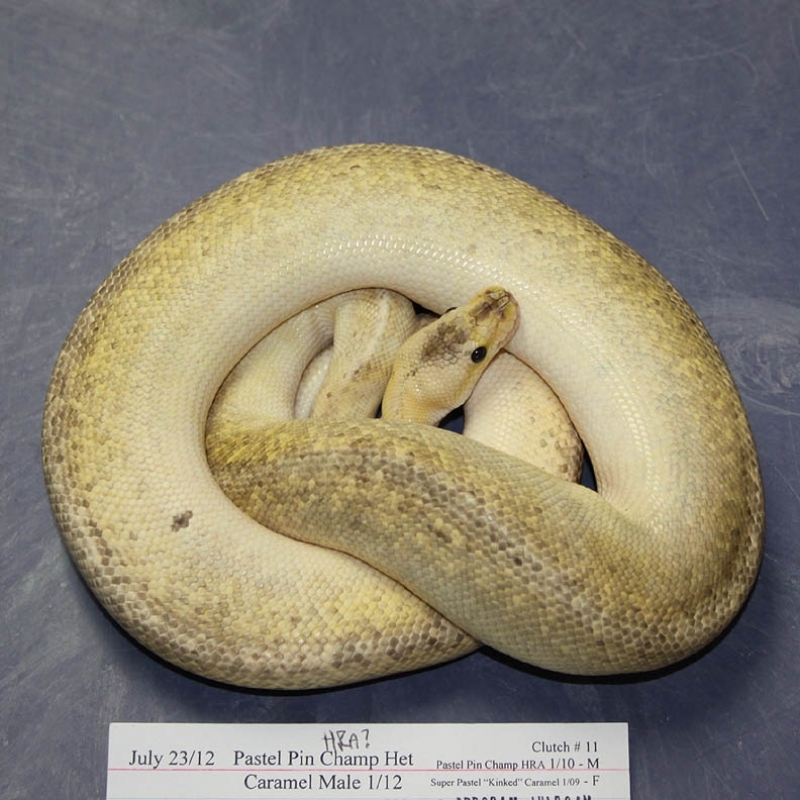 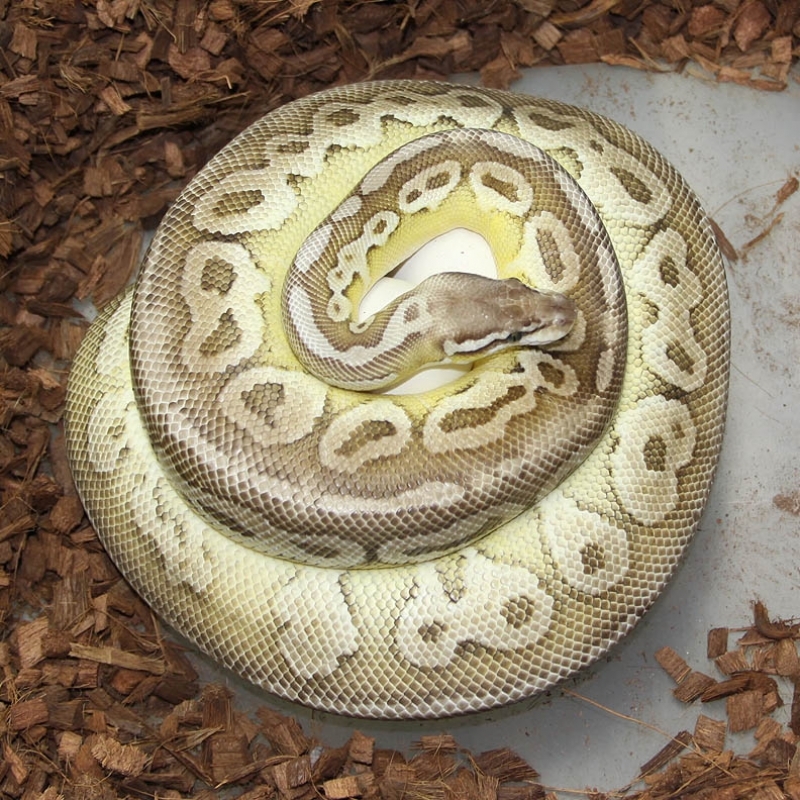 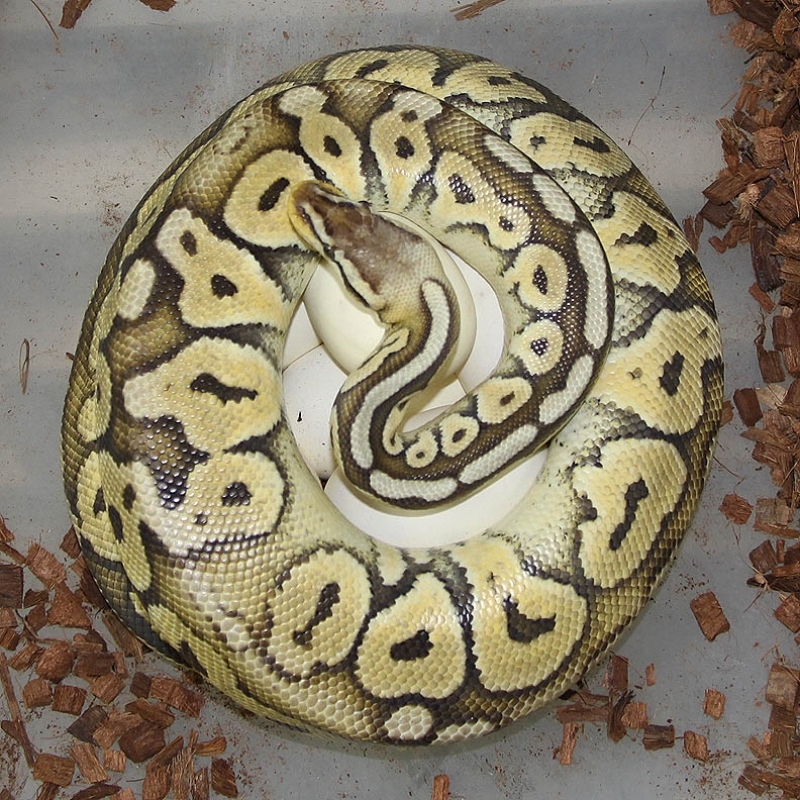 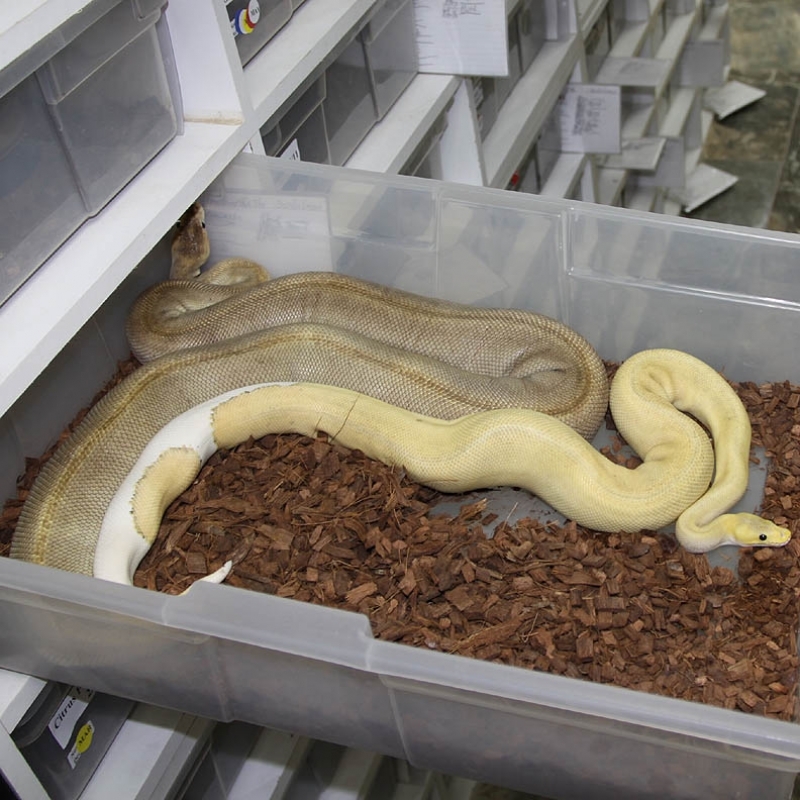 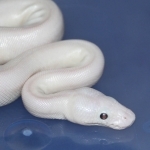 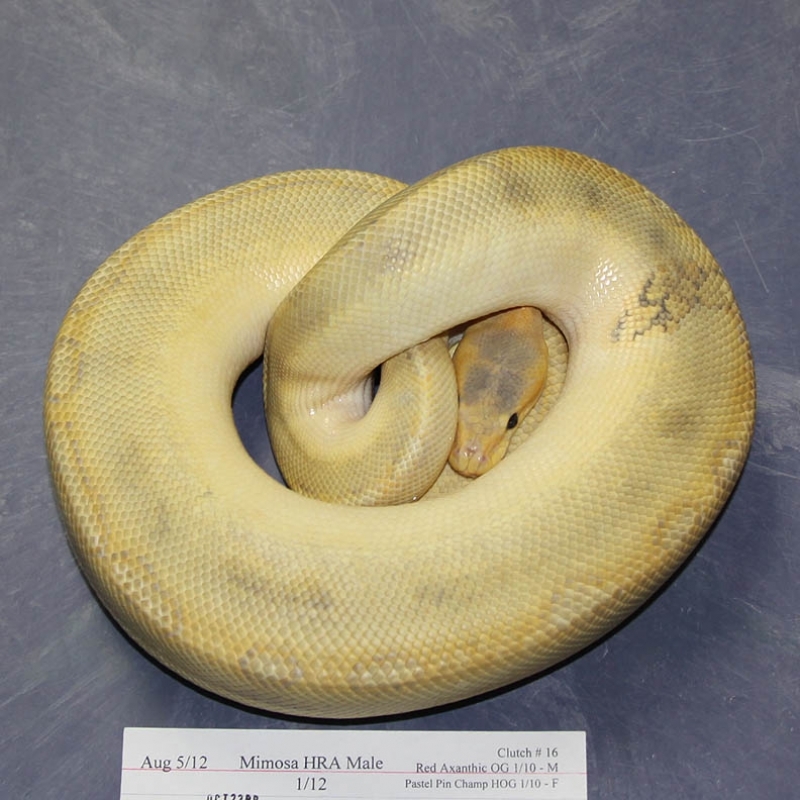 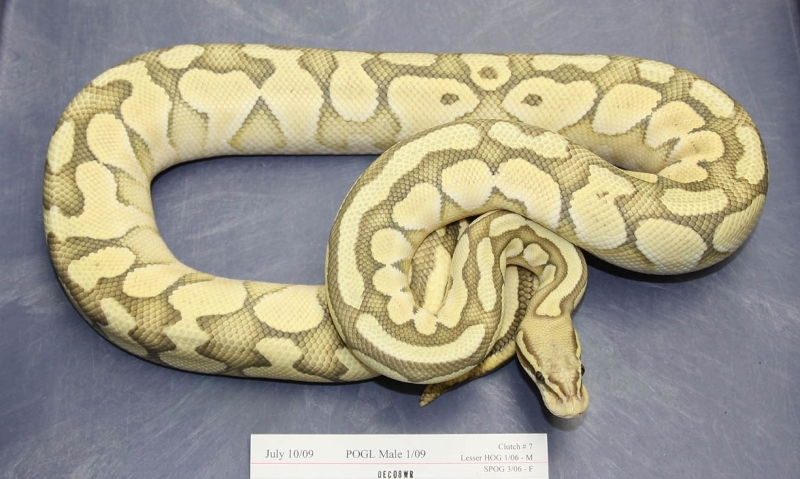 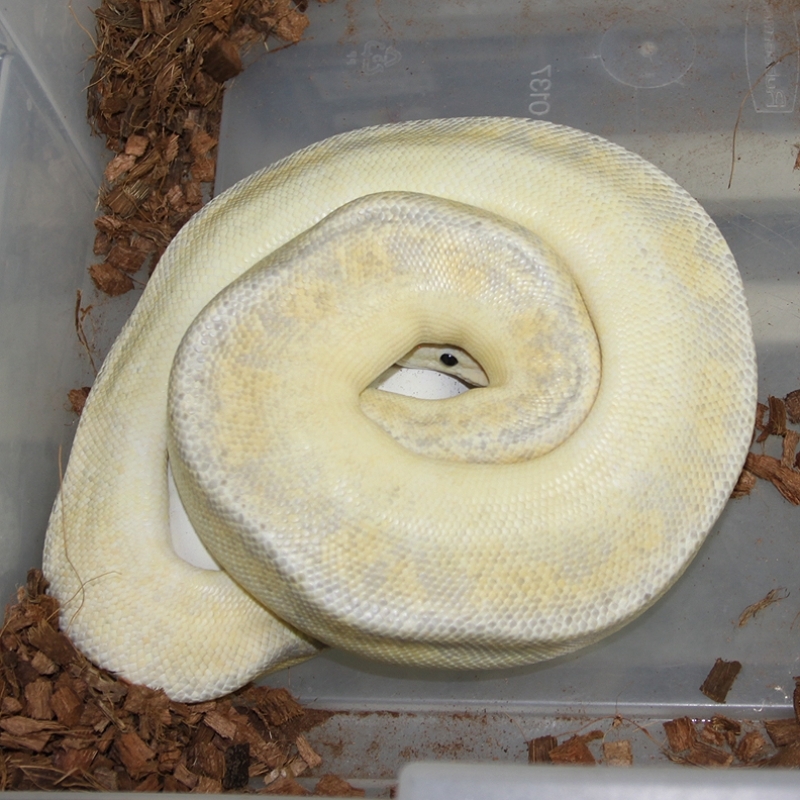 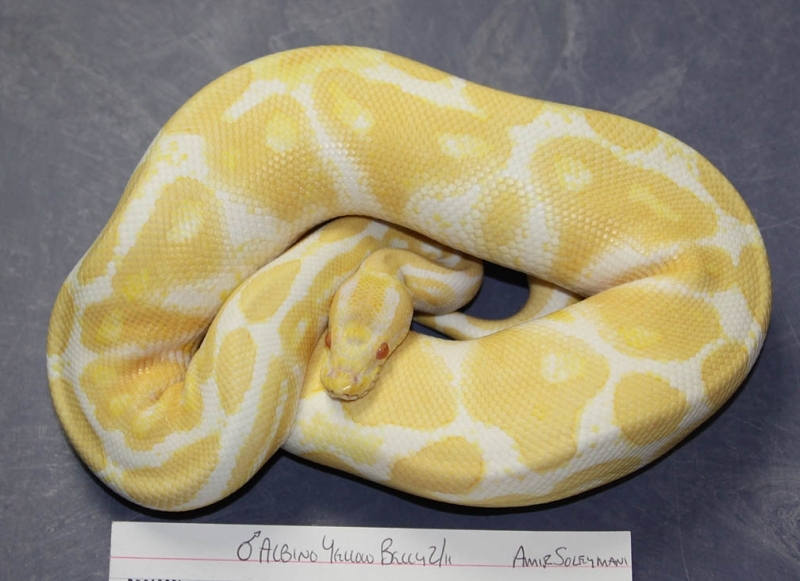 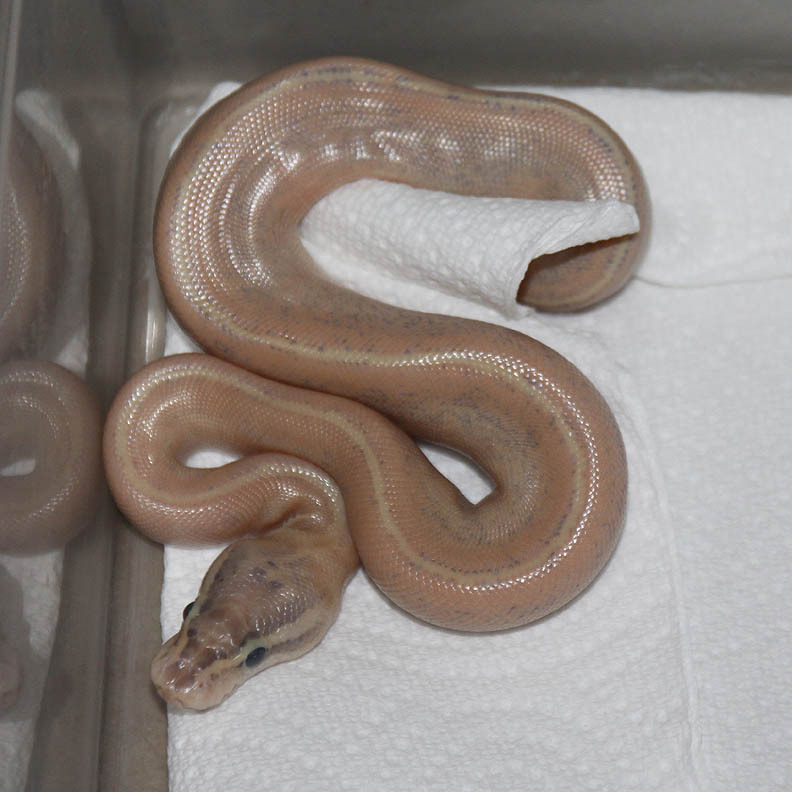 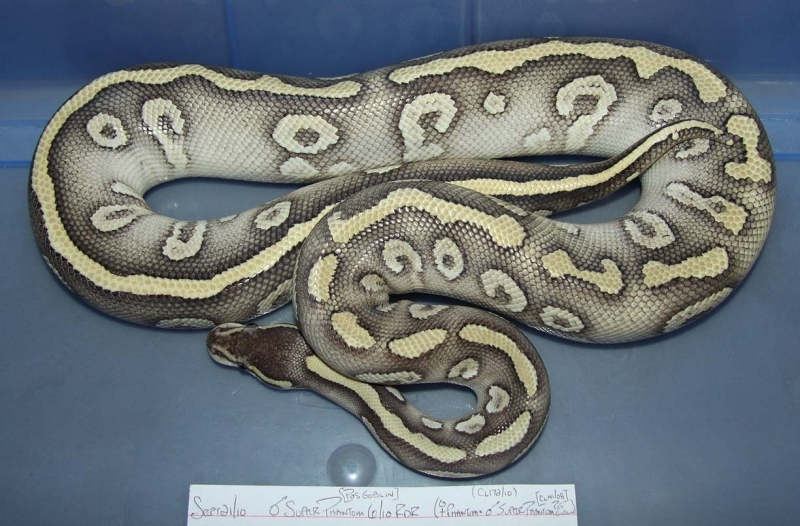 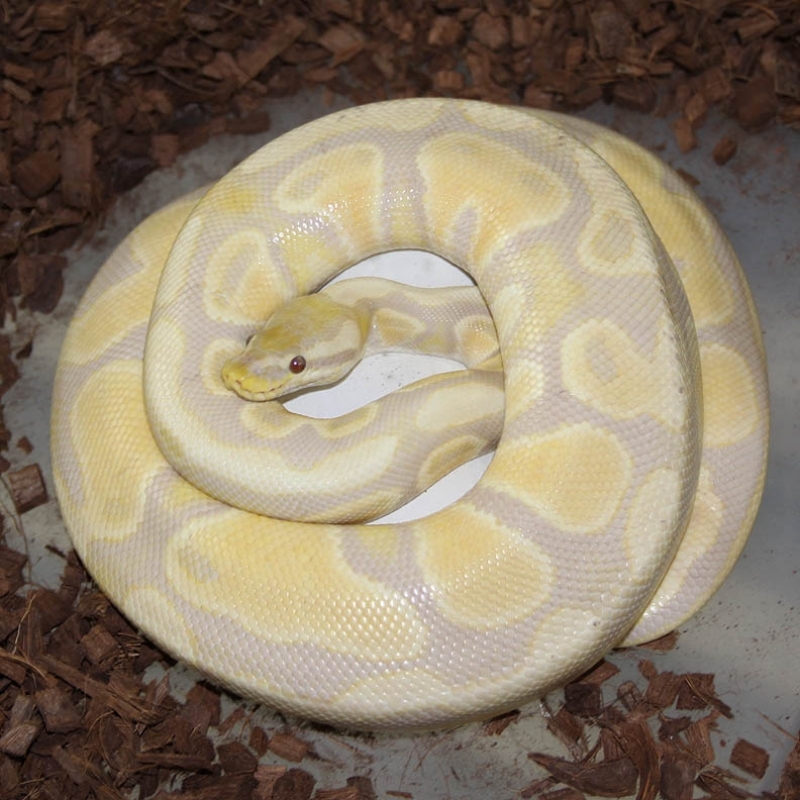 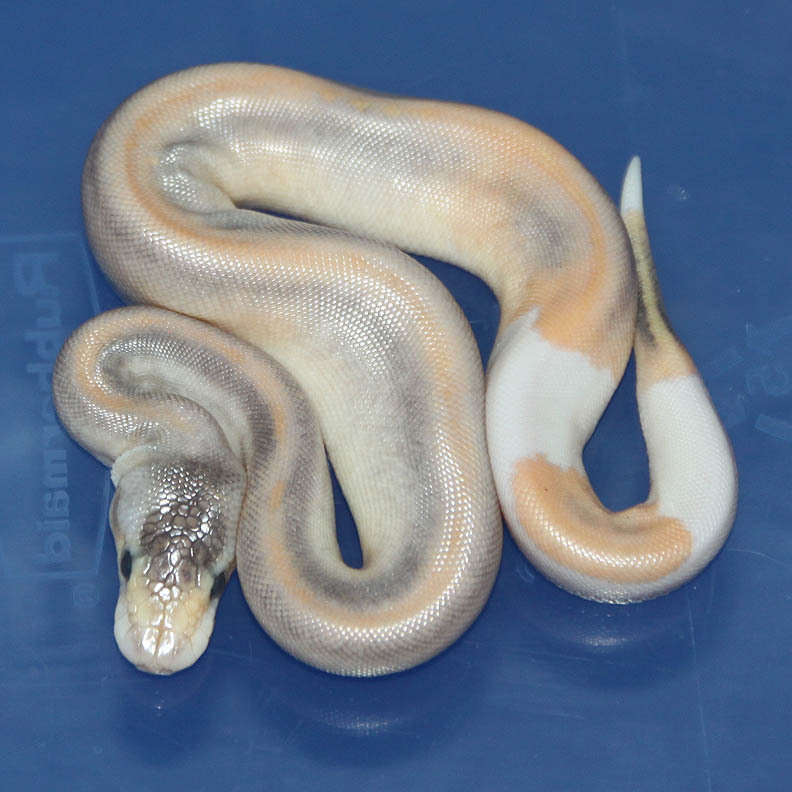 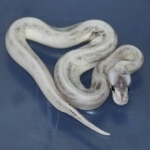 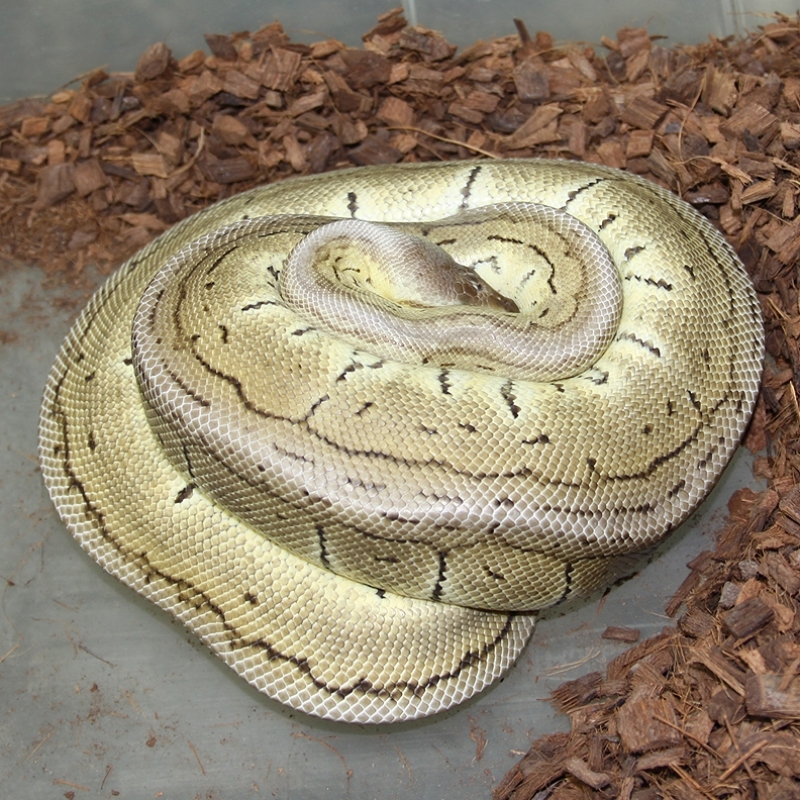 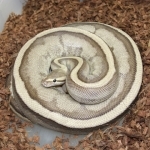 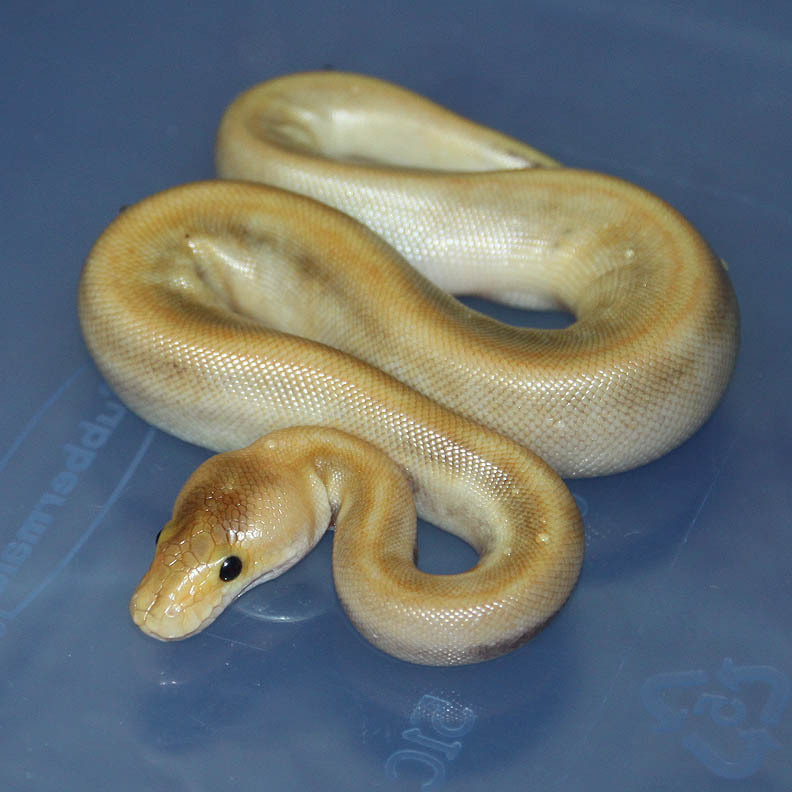 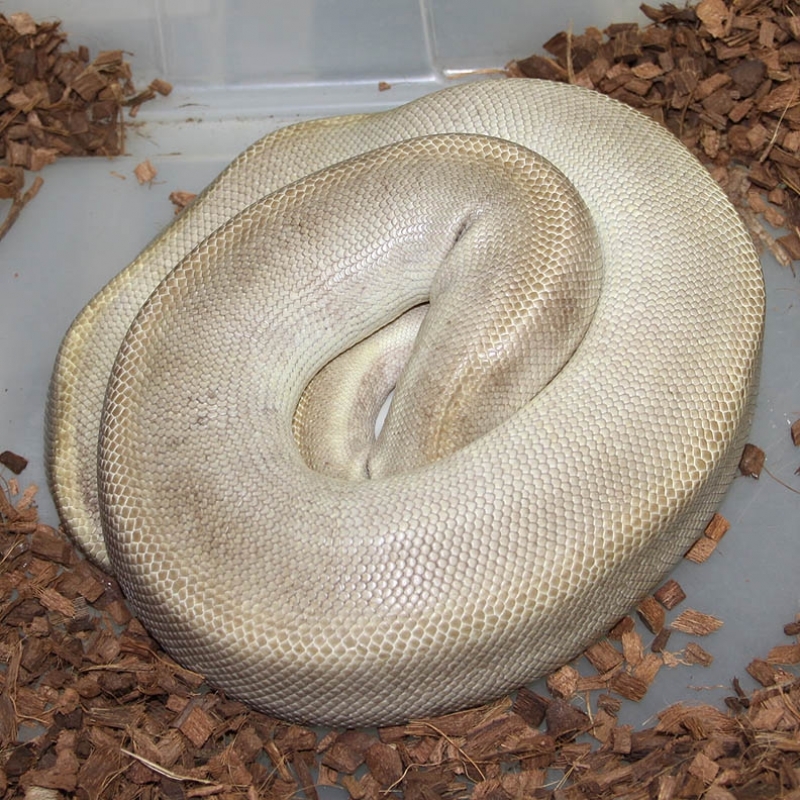 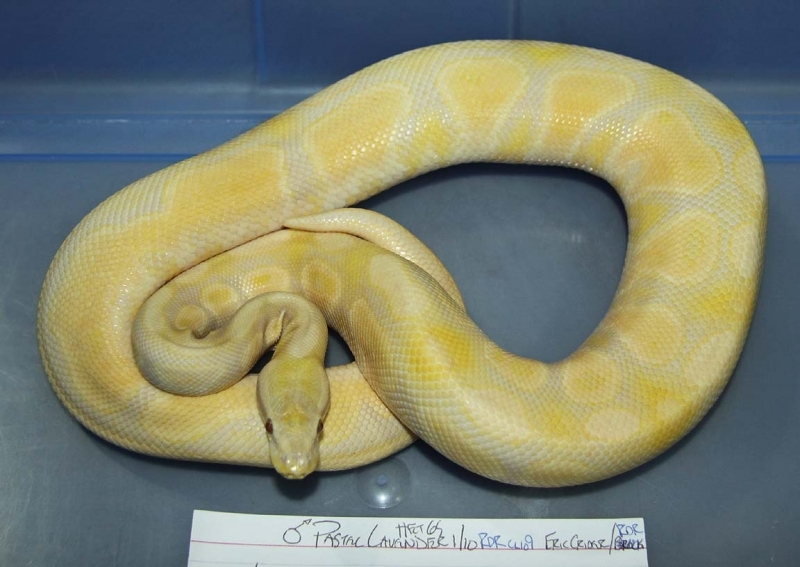 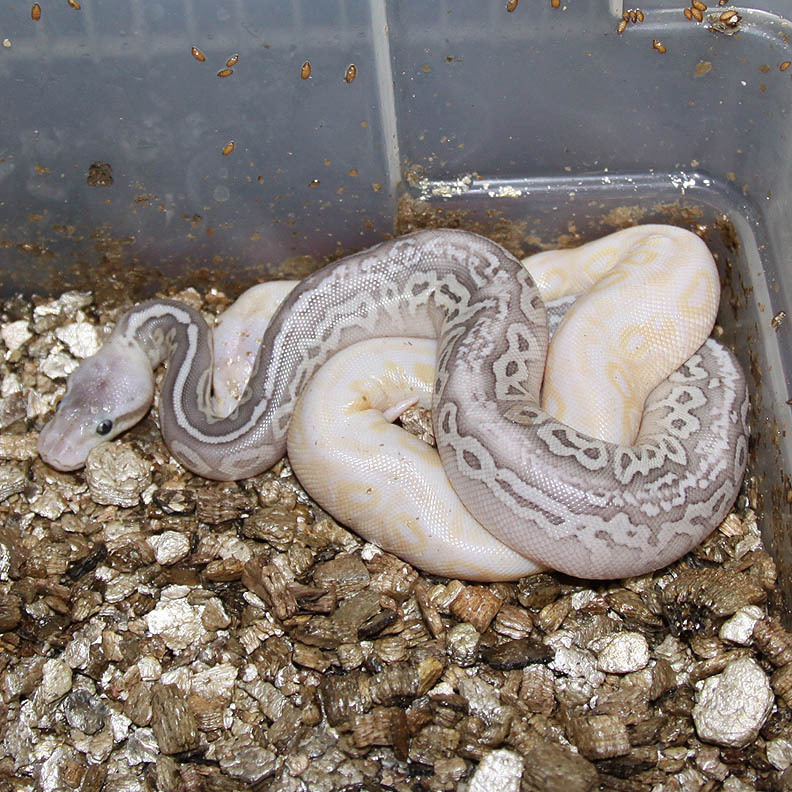 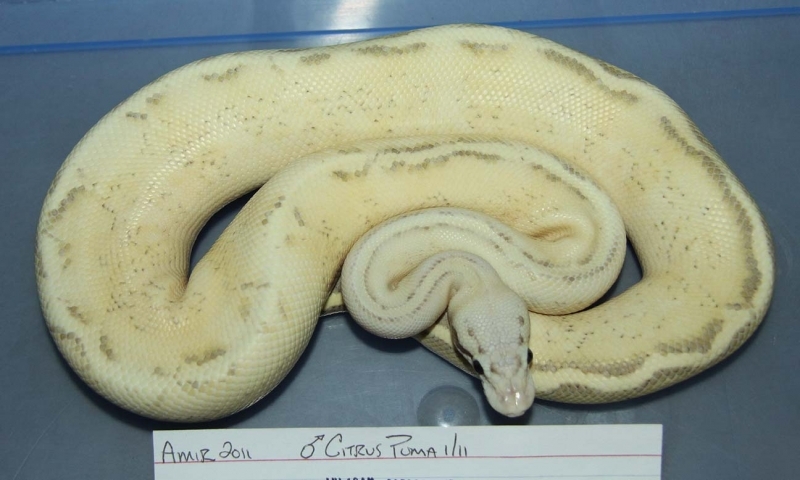 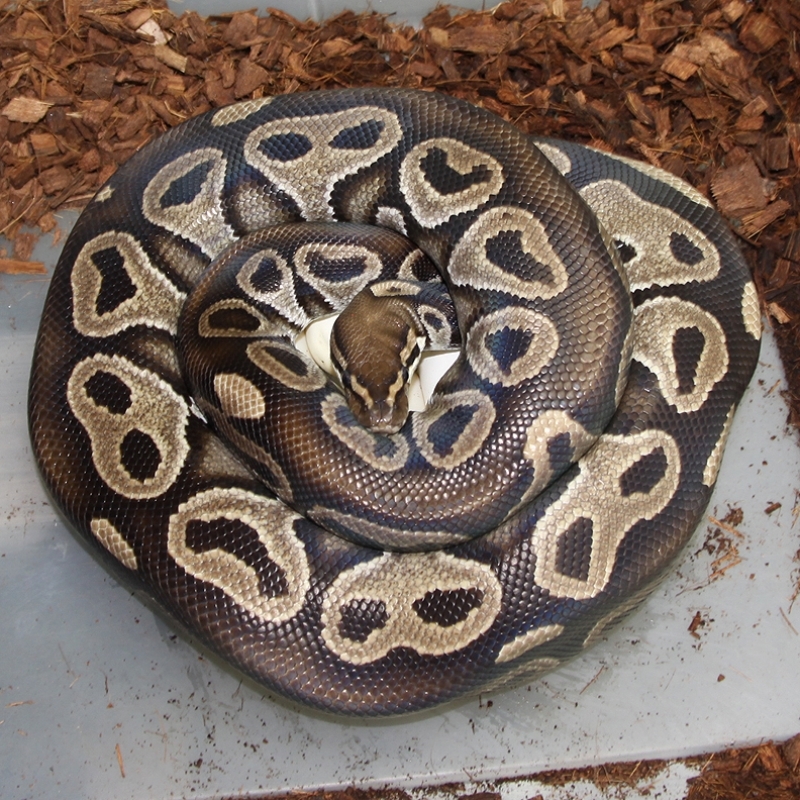 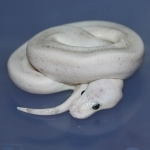 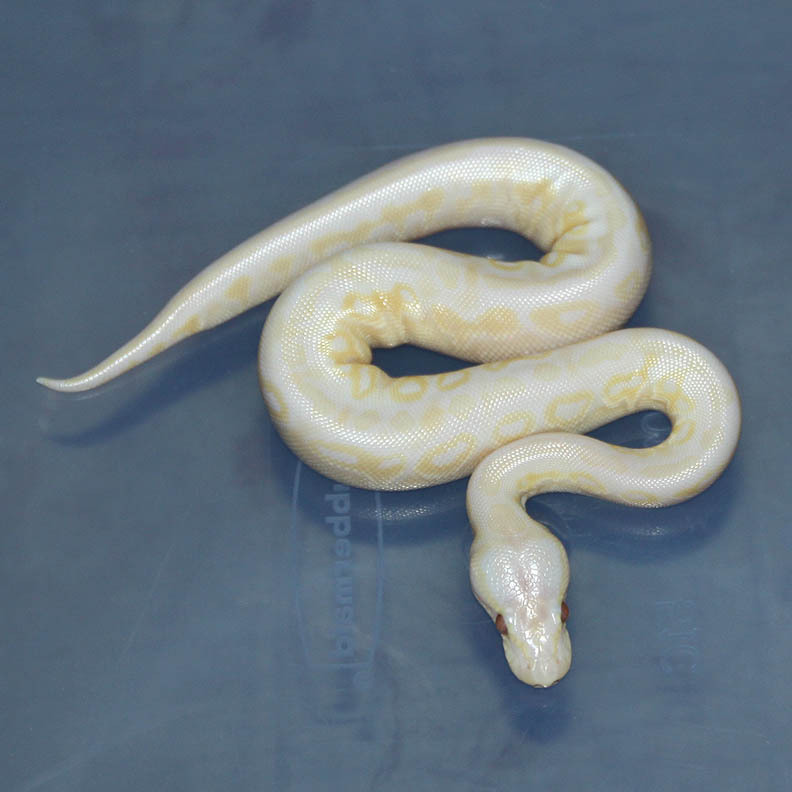 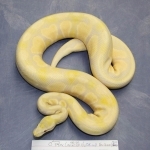 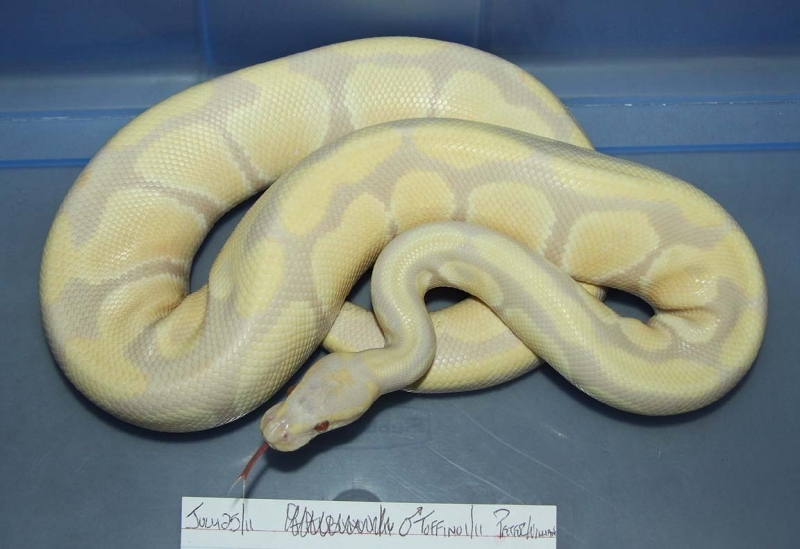 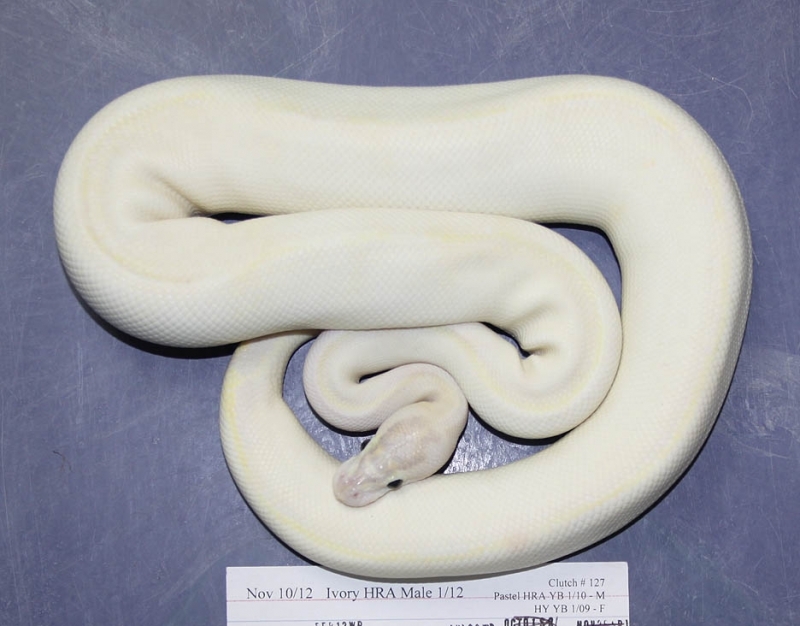 Description: Toffino 1/11 x Pinstripe Champagne Het Albino 2/10. 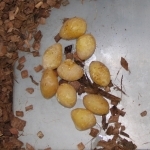 This clutch has the potential to produce Pin Toffinos, Champagne Toffinos, Pin Champagne Toffinos...etc. If you are interested in animals from clutch #178 please email or call 519-824-7377. Description: Different 1/10 x Het RA 6/06. 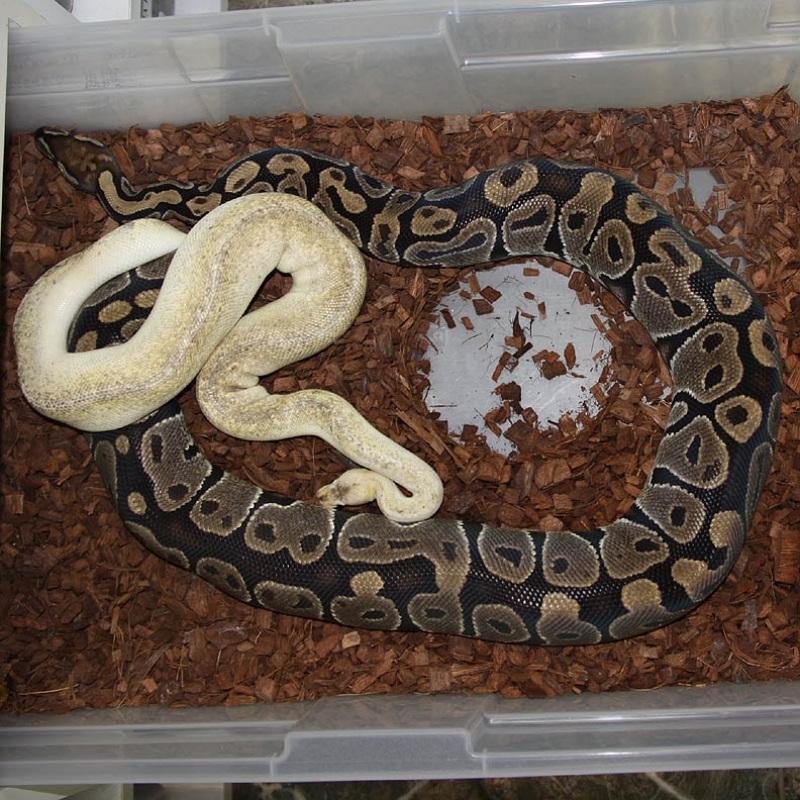 If you are interested in animals from clutch #179 please email or call 519-824-7377. 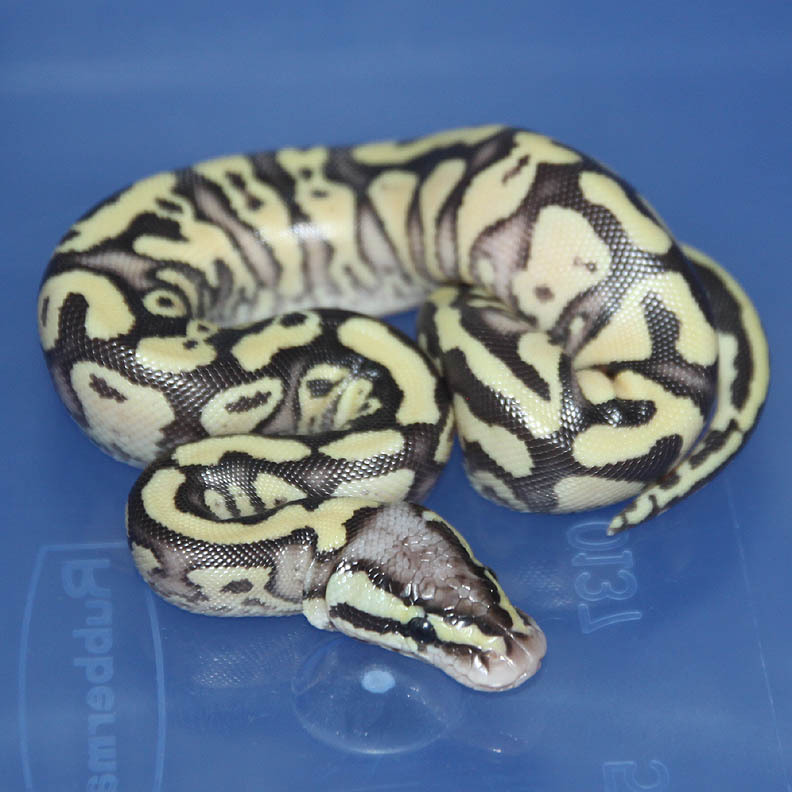 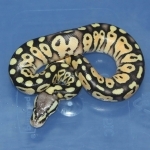 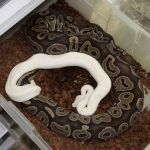 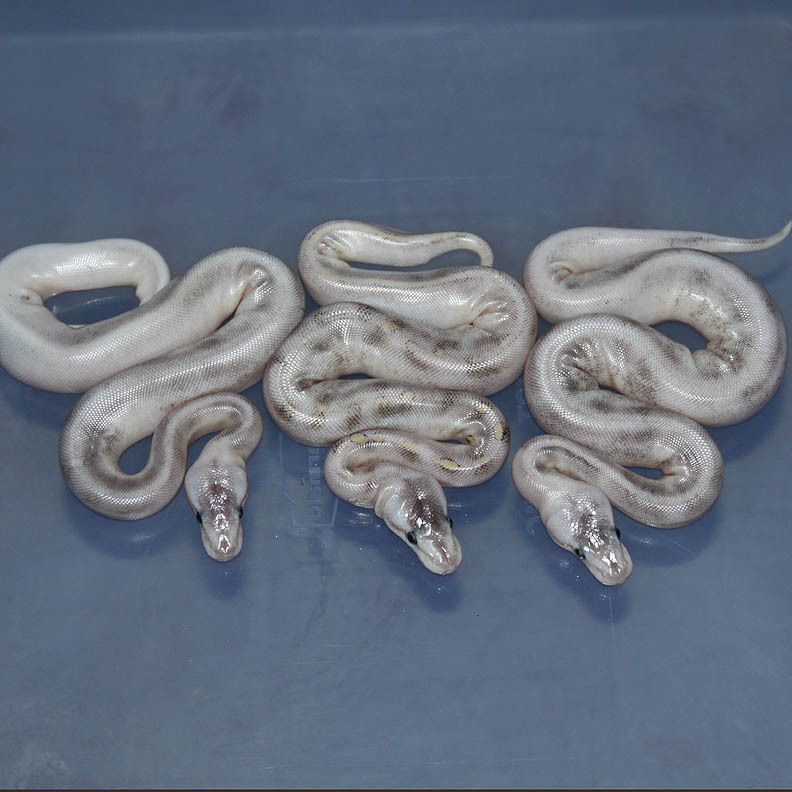 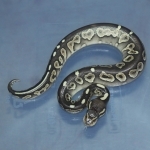 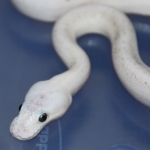 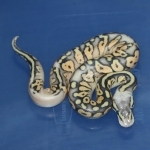 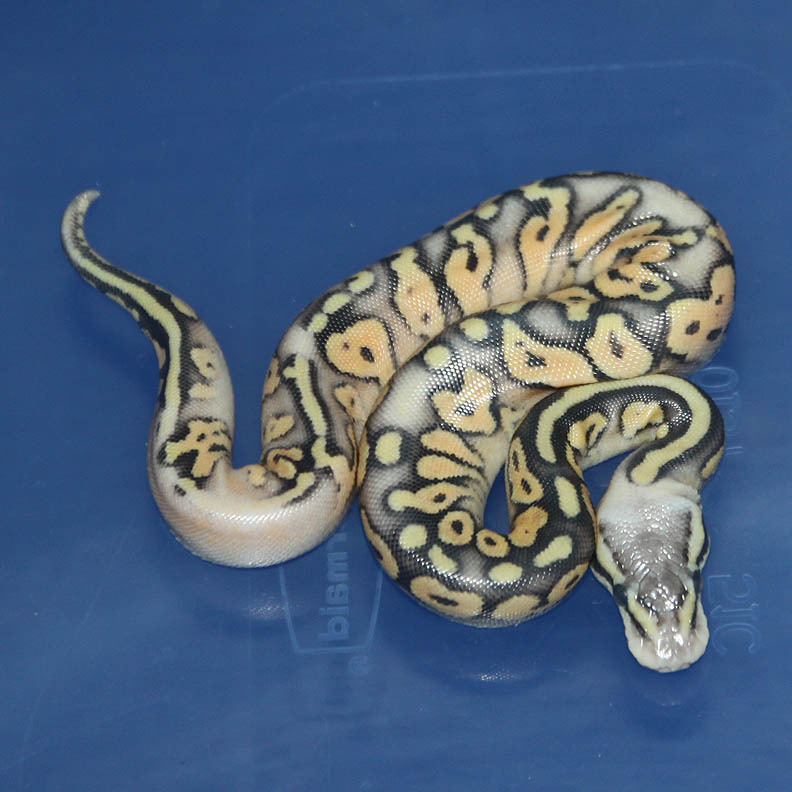 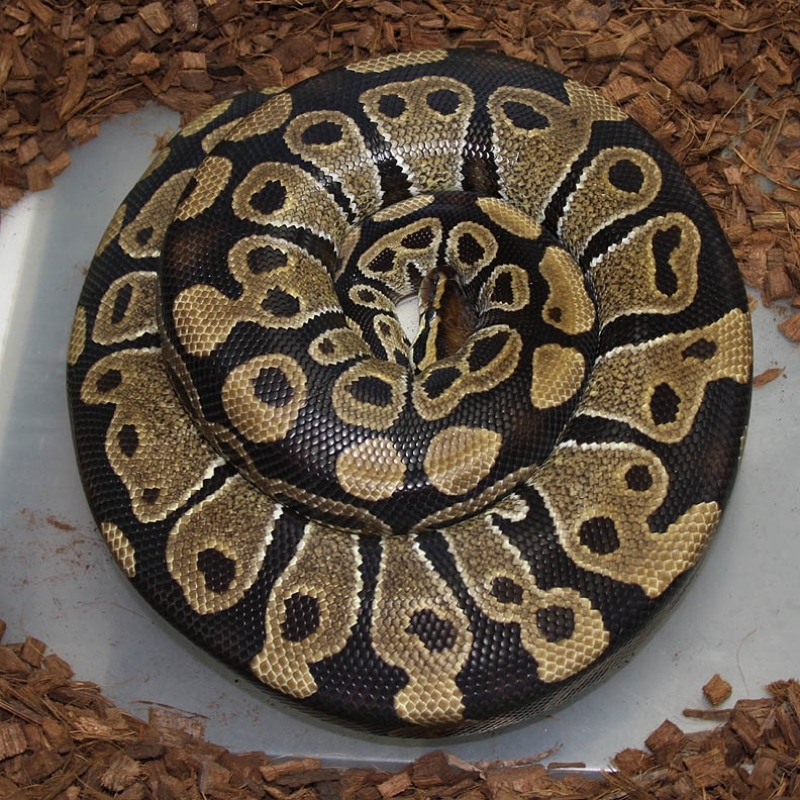 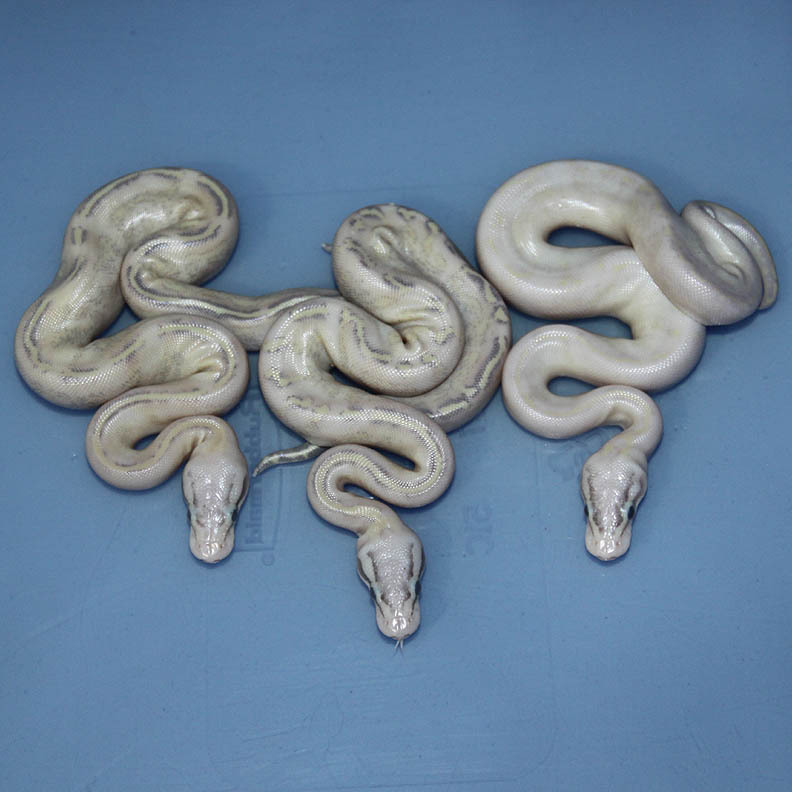 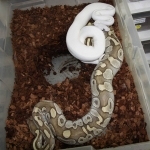 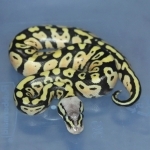 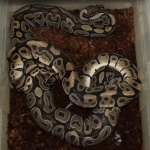 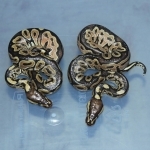 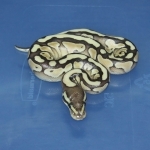 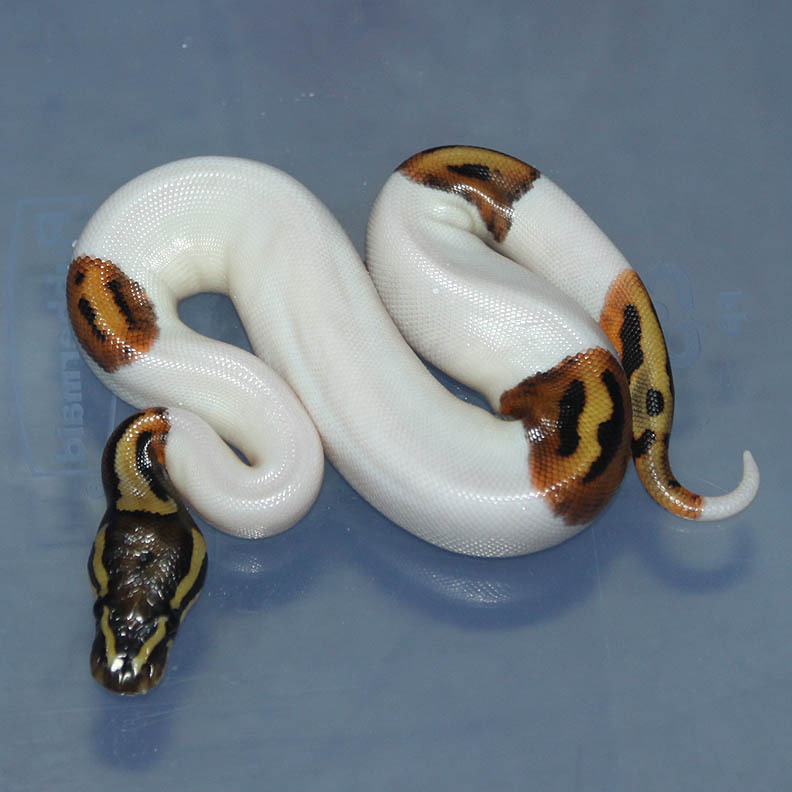 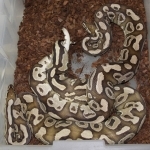 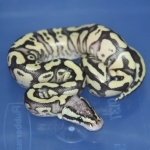 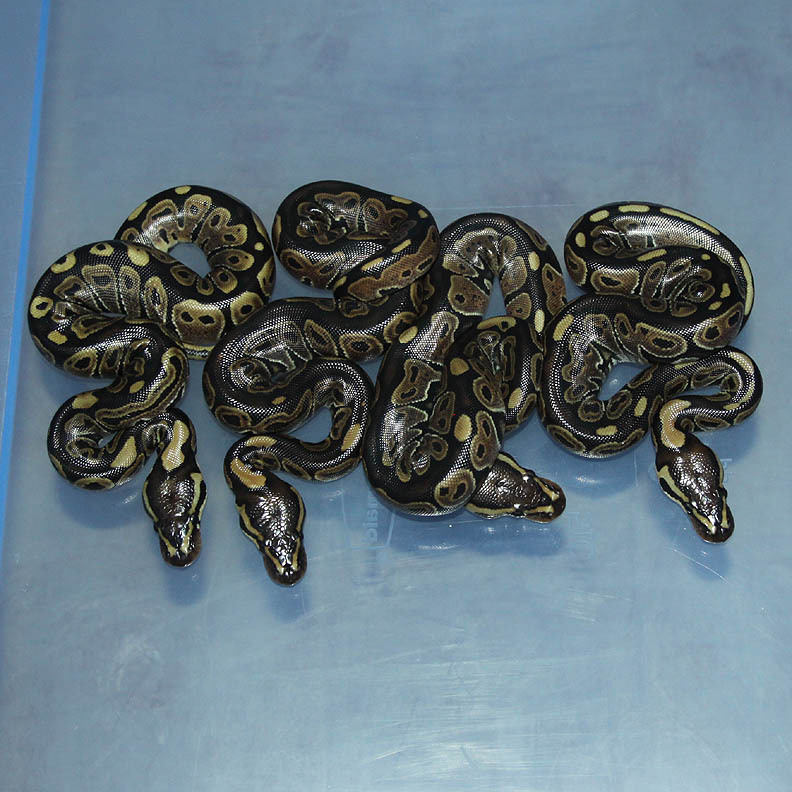 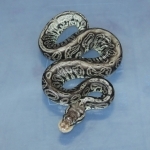 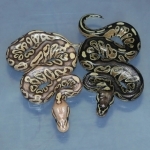 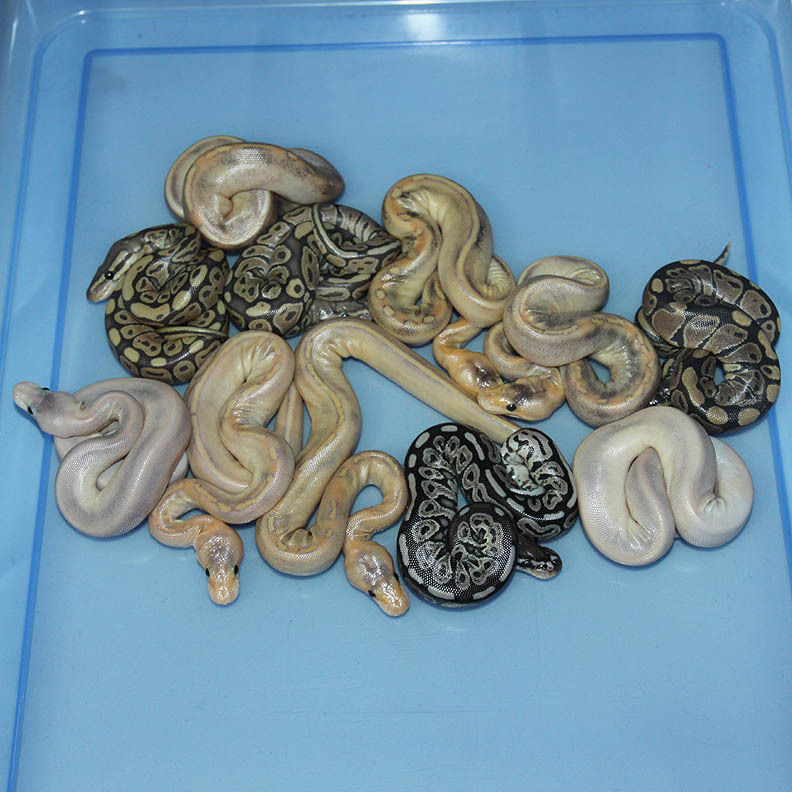 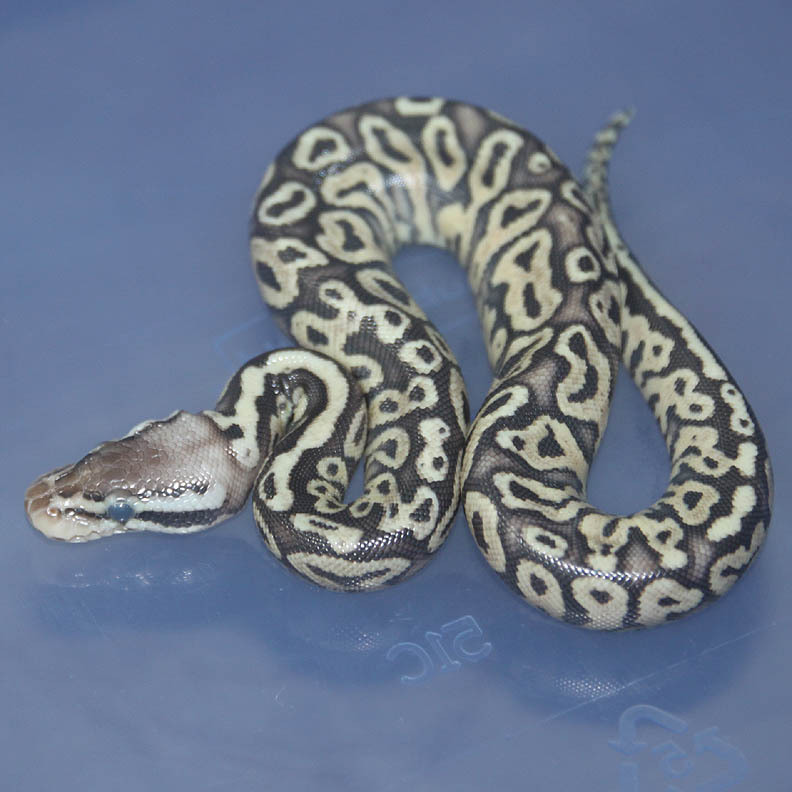 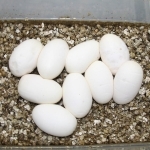 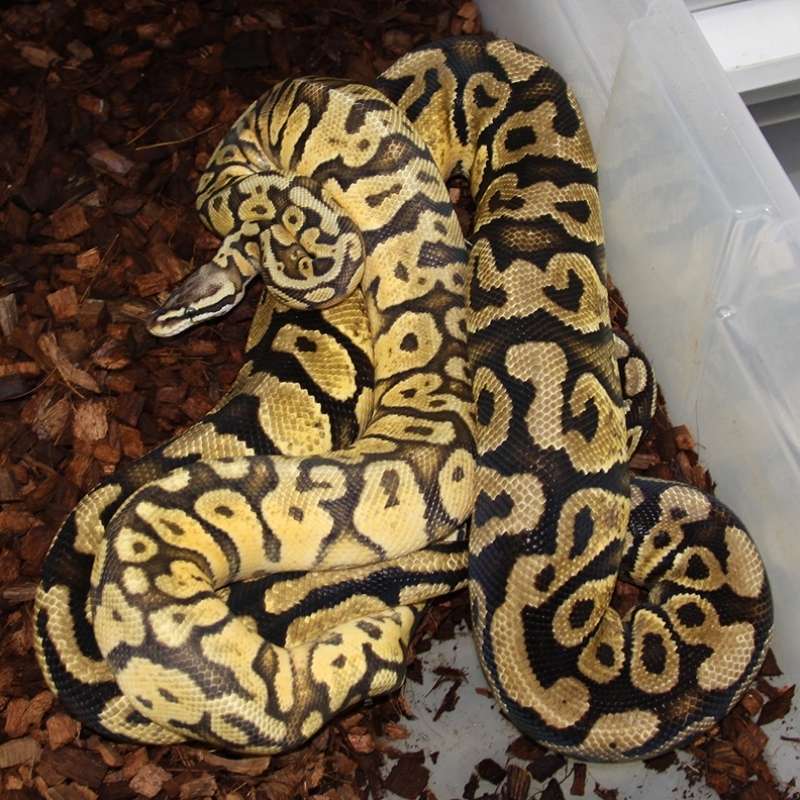 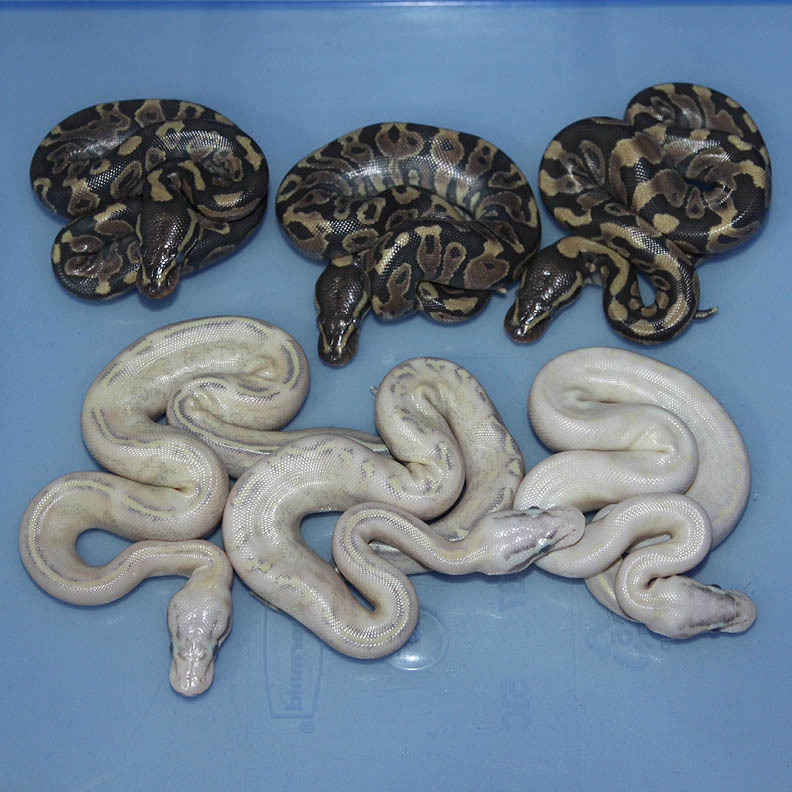 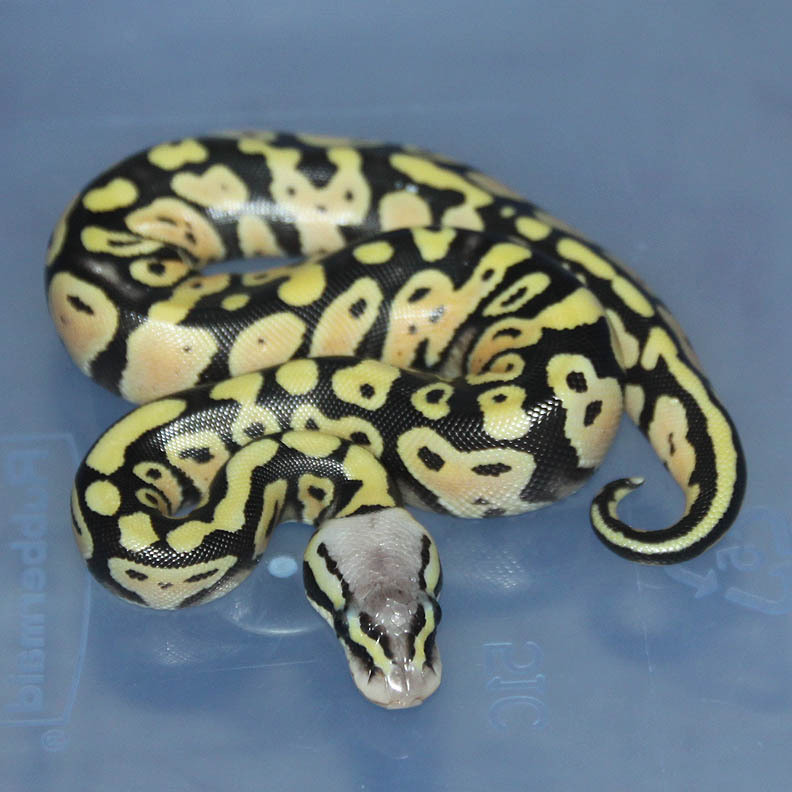 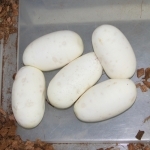 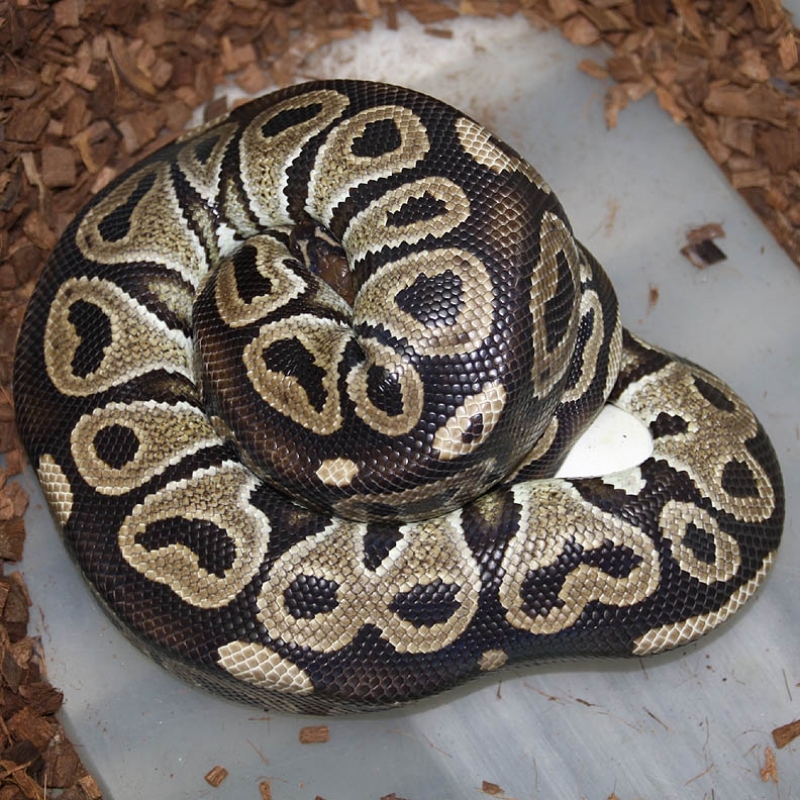 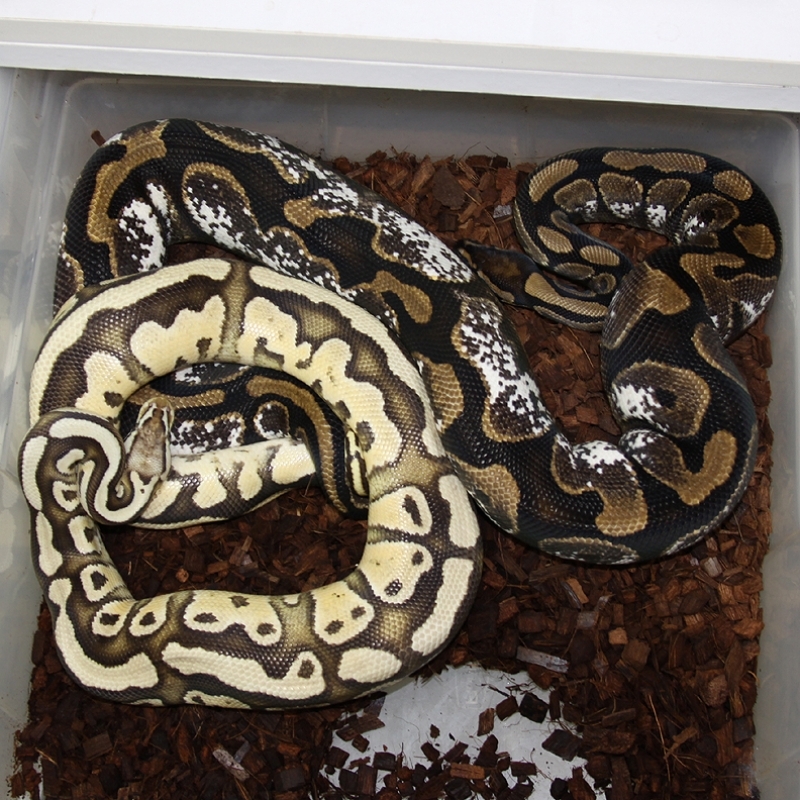 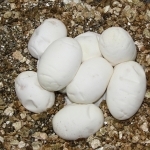 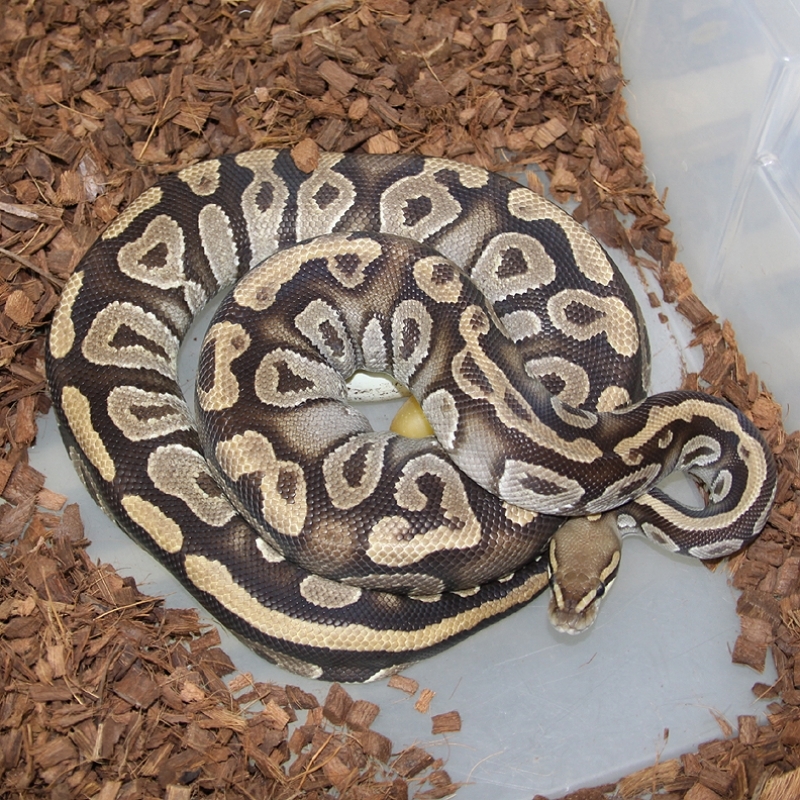 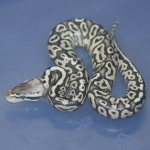 Description: Leopard Pied 1/11 x Pastel Lesser HRA 1/10. 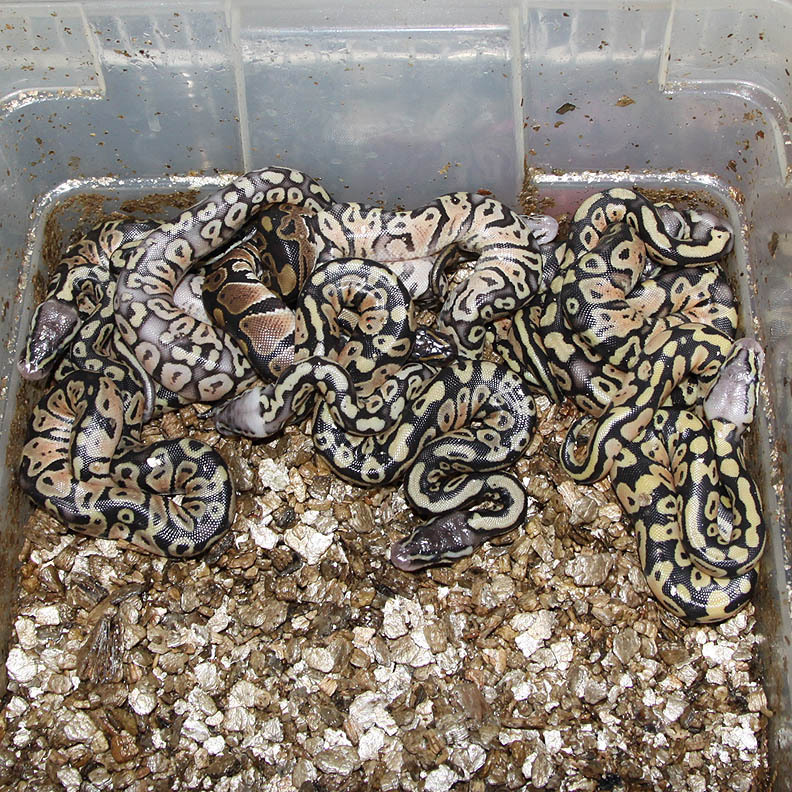 I was beginning to think that the Leopard Pied male was infertile since I've received a few all slug clutches from him. 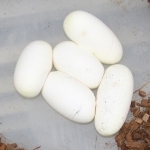 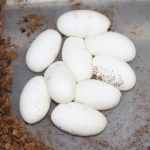 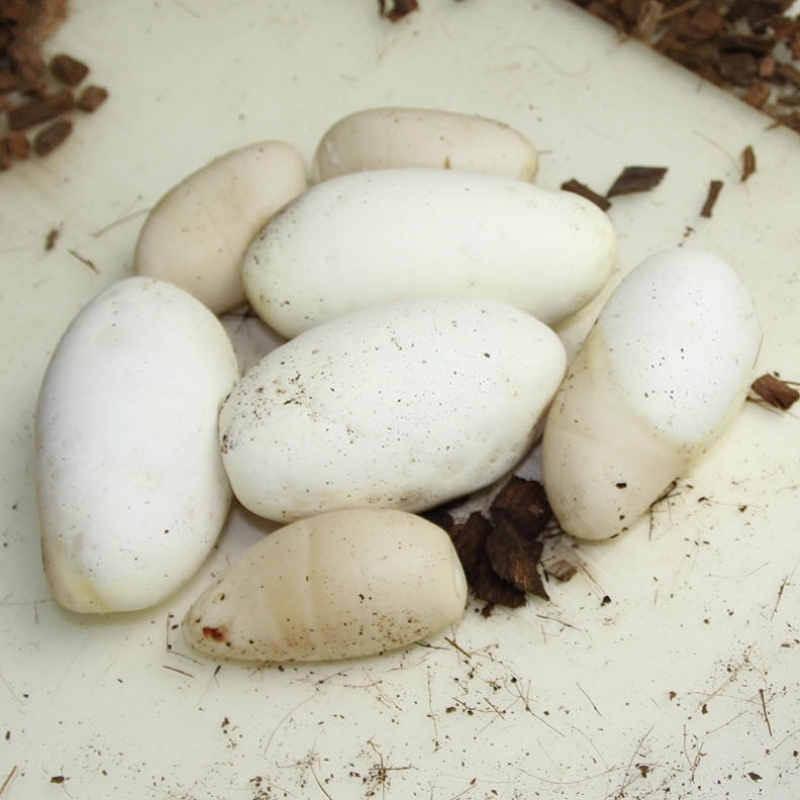 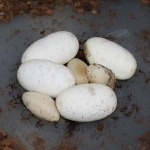 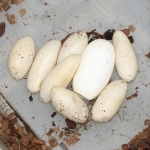 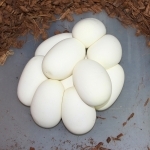 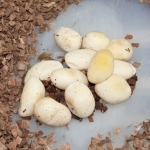 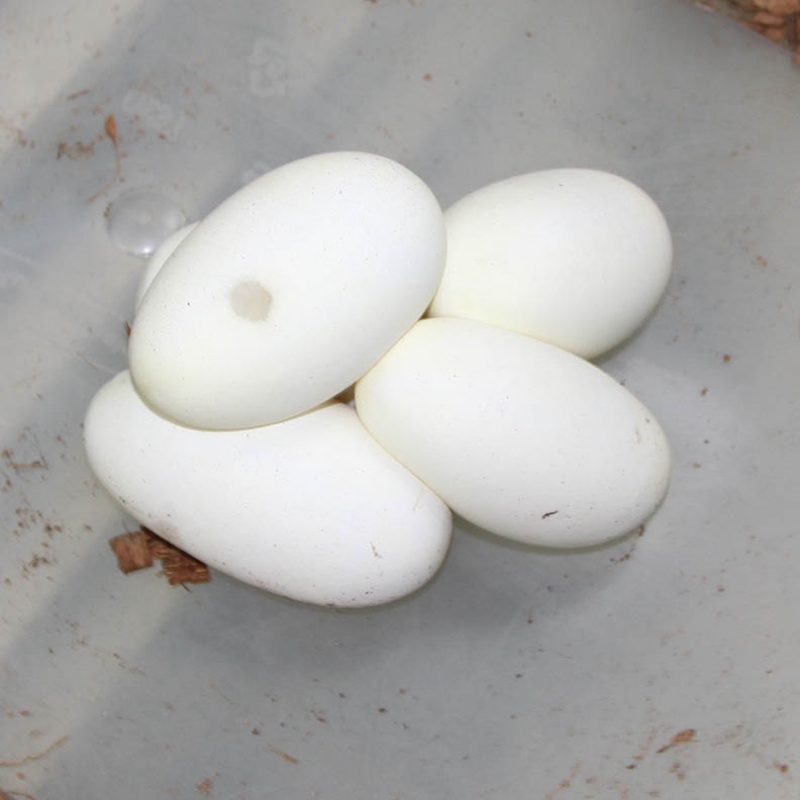 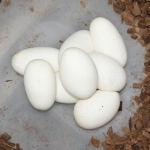 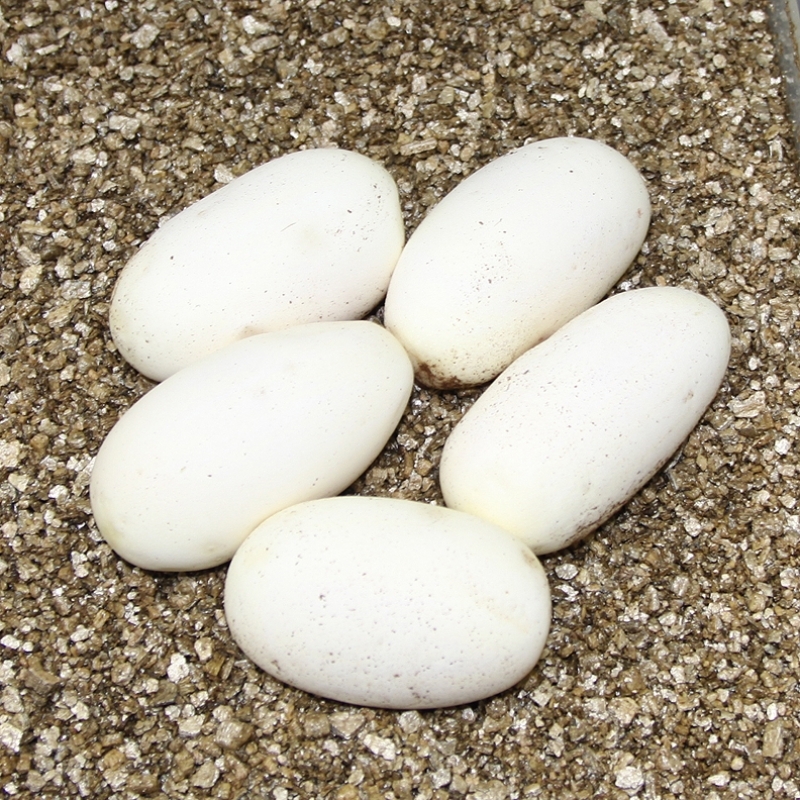 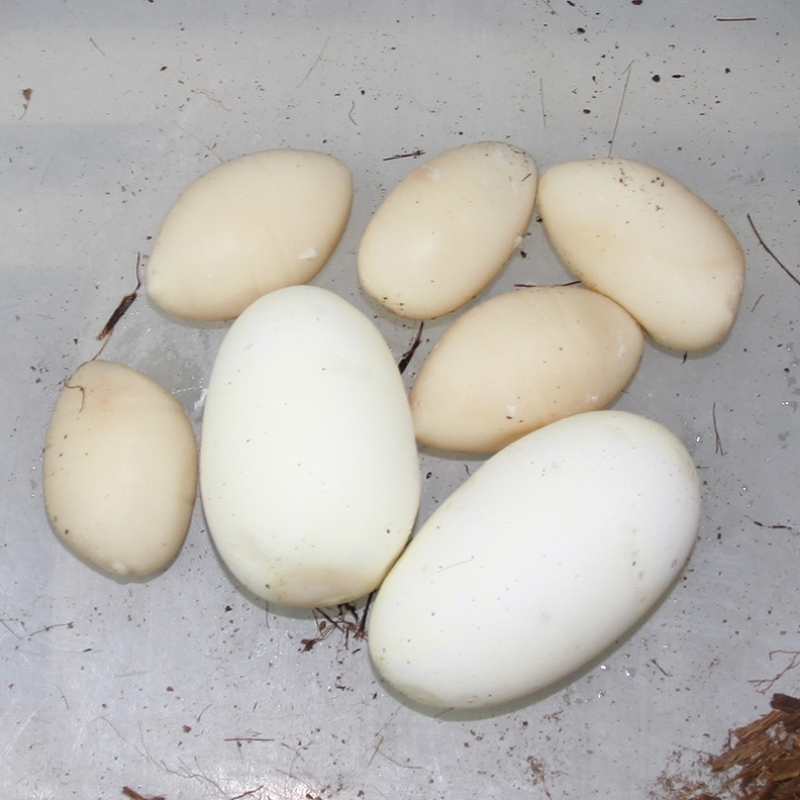 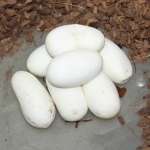 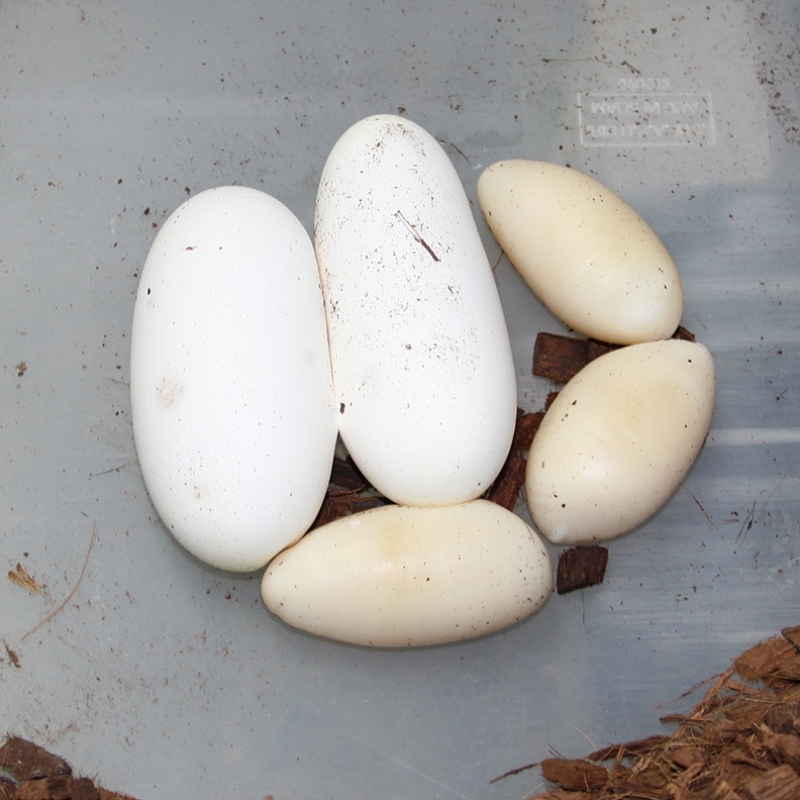 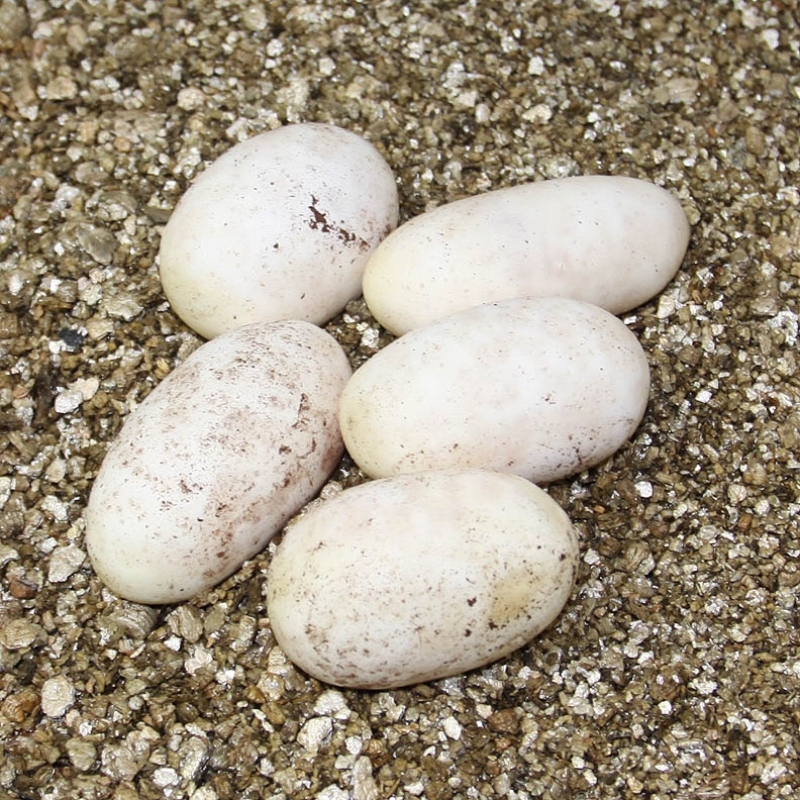 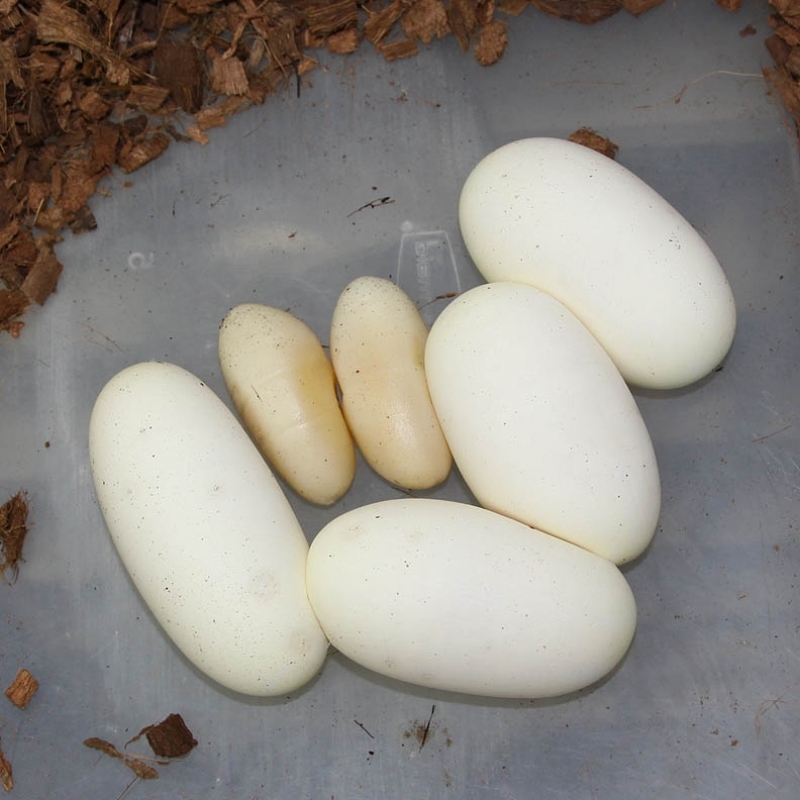 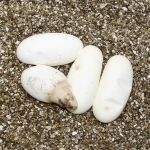 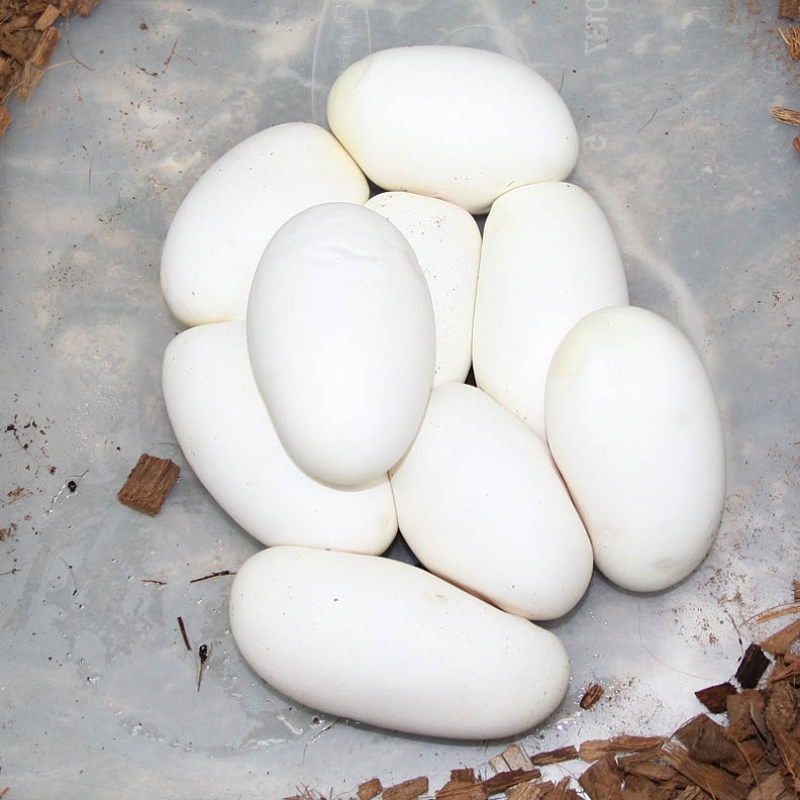 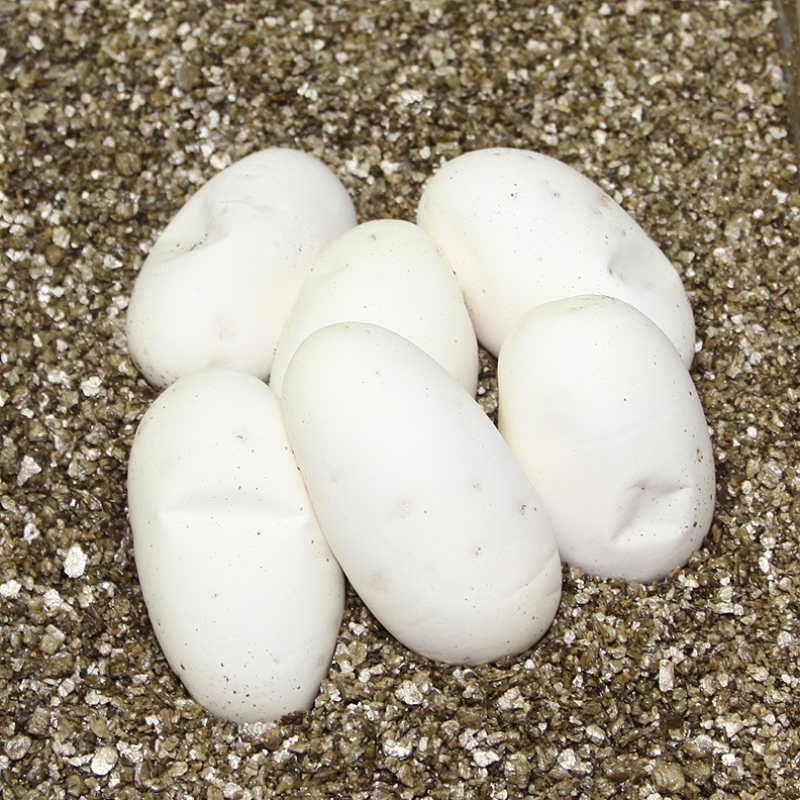 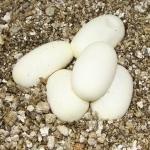 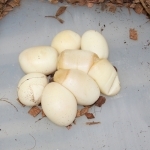 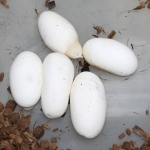 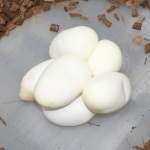 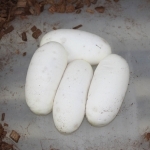 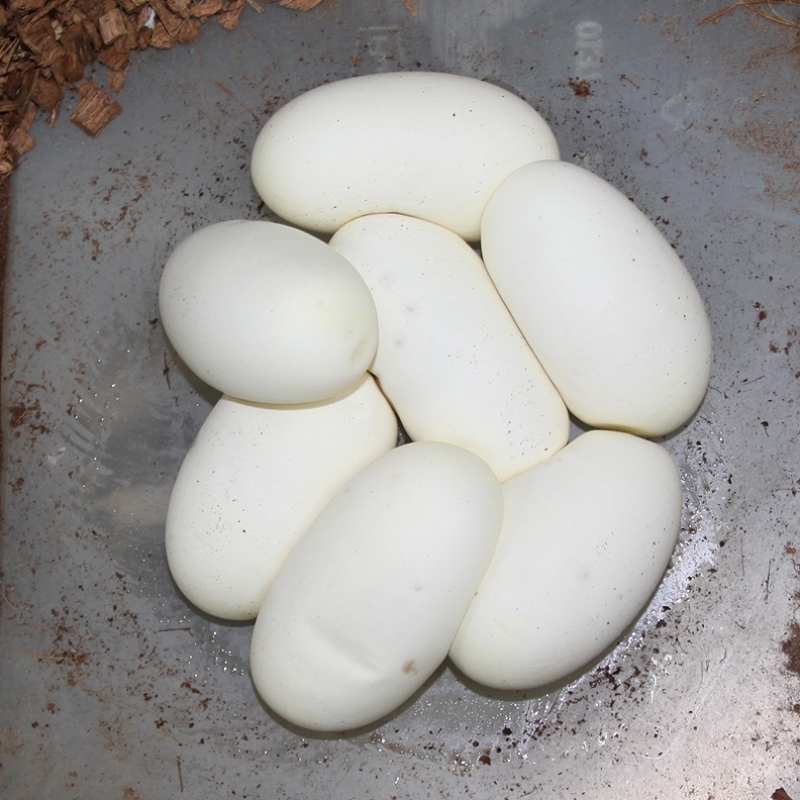 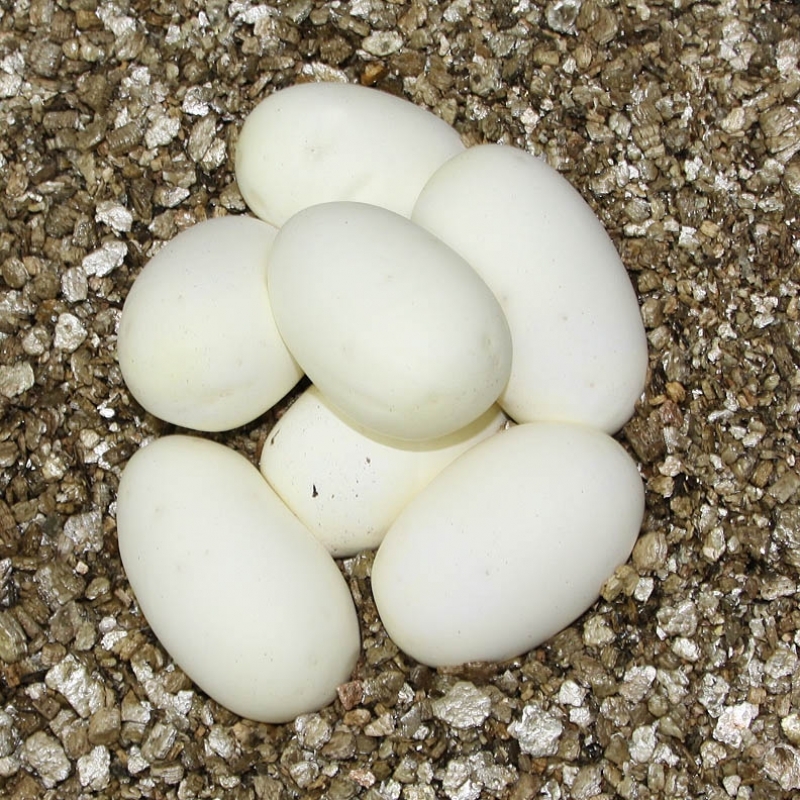 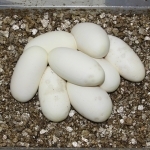 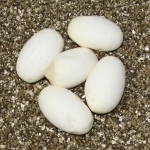 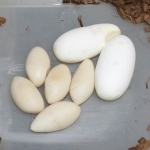 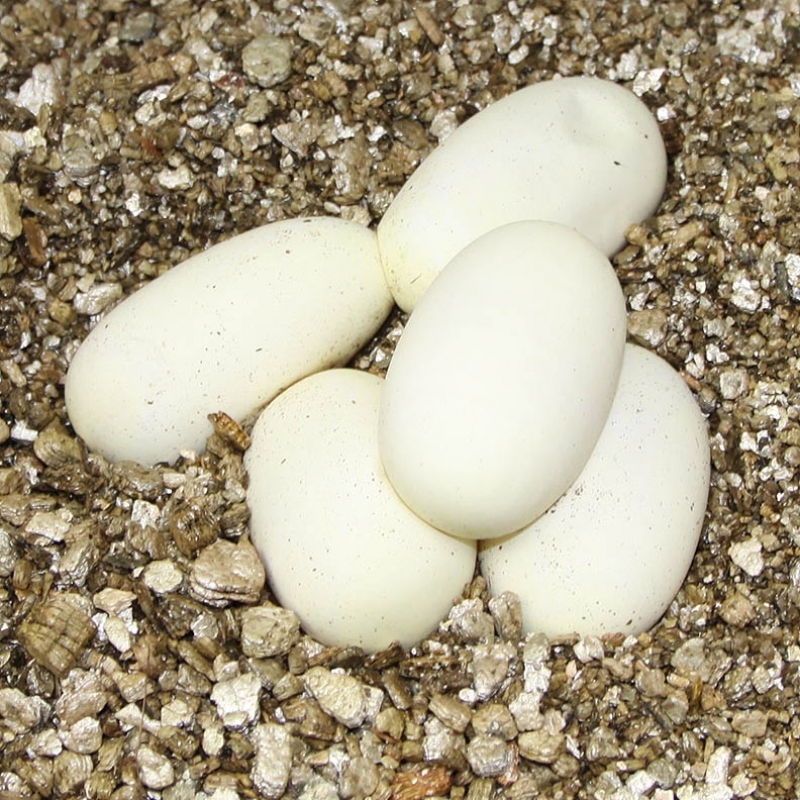 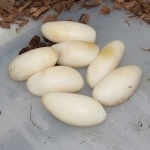 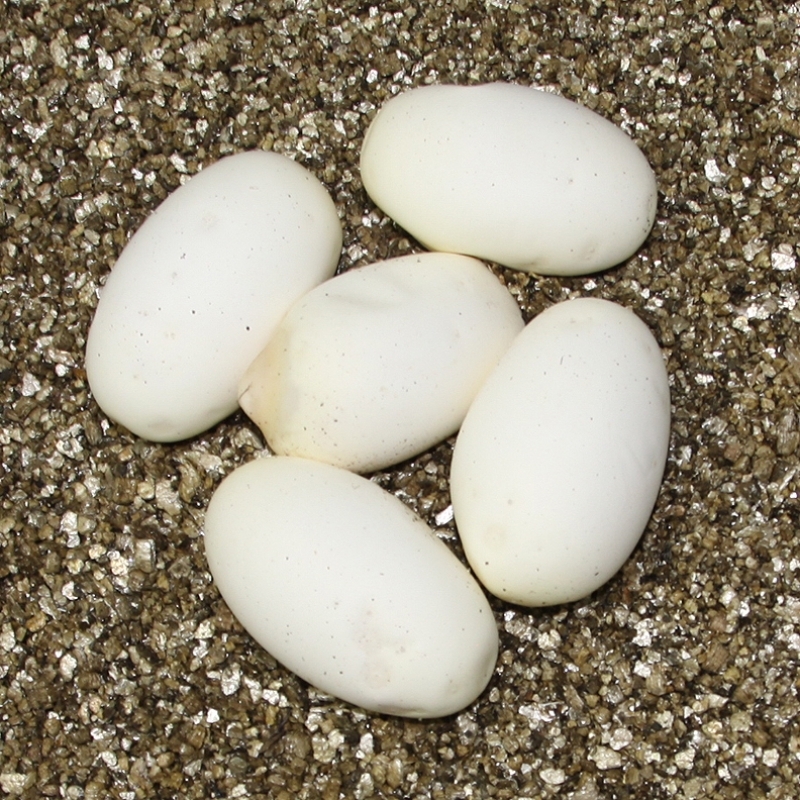 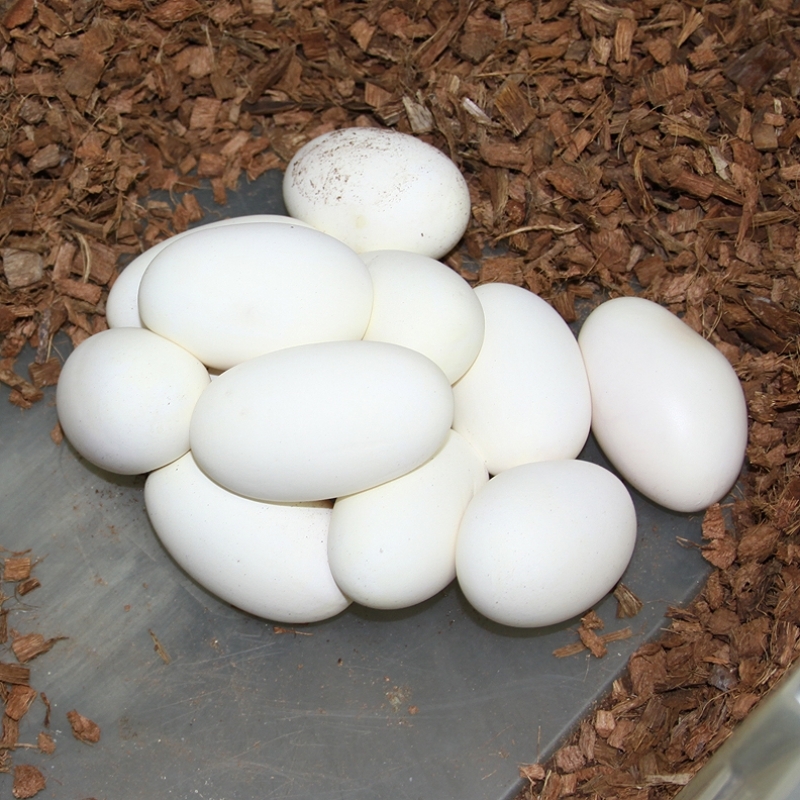 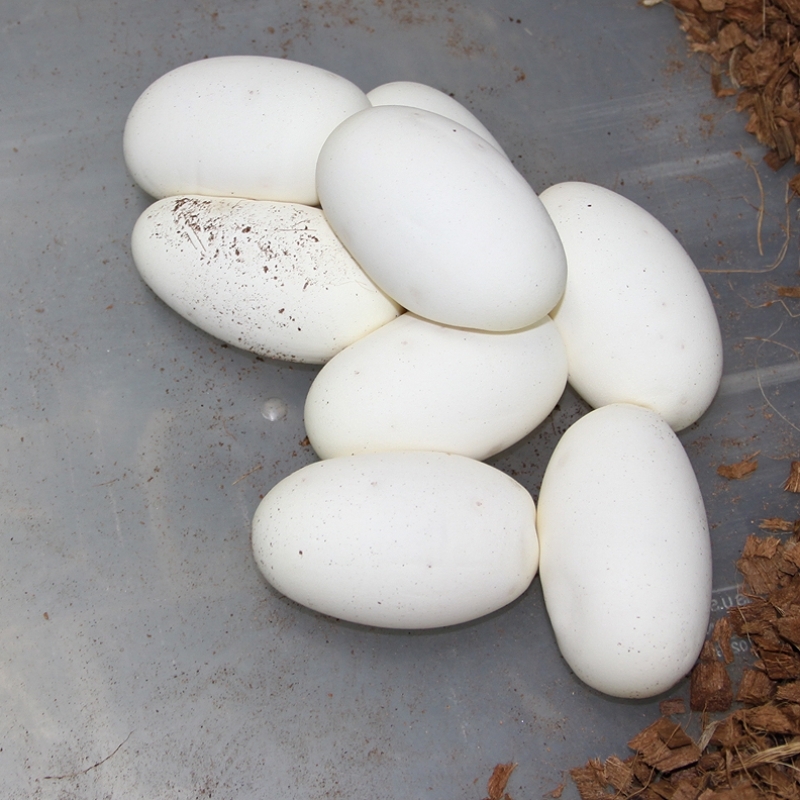 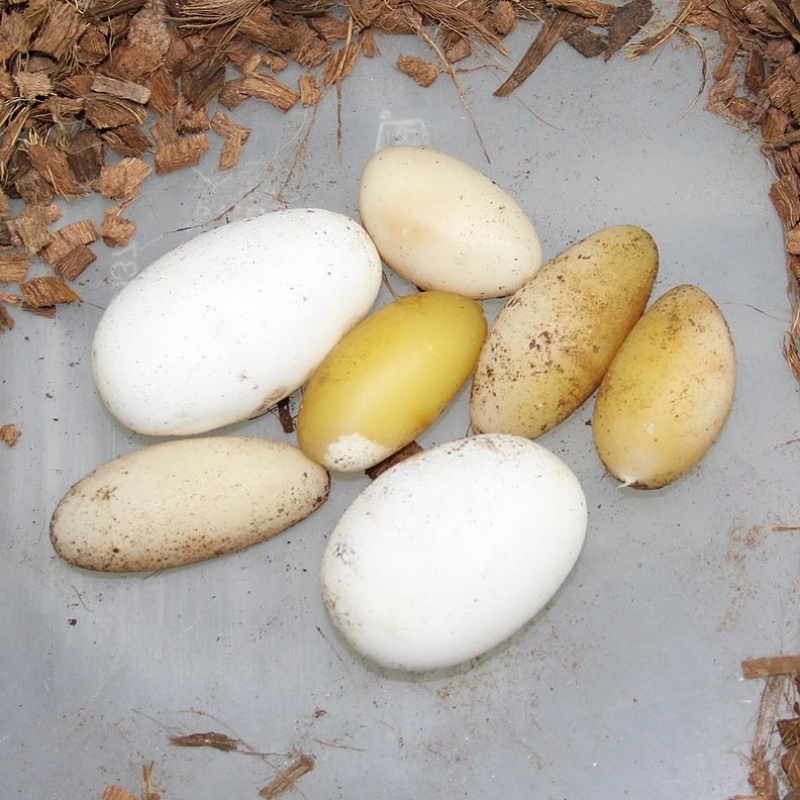 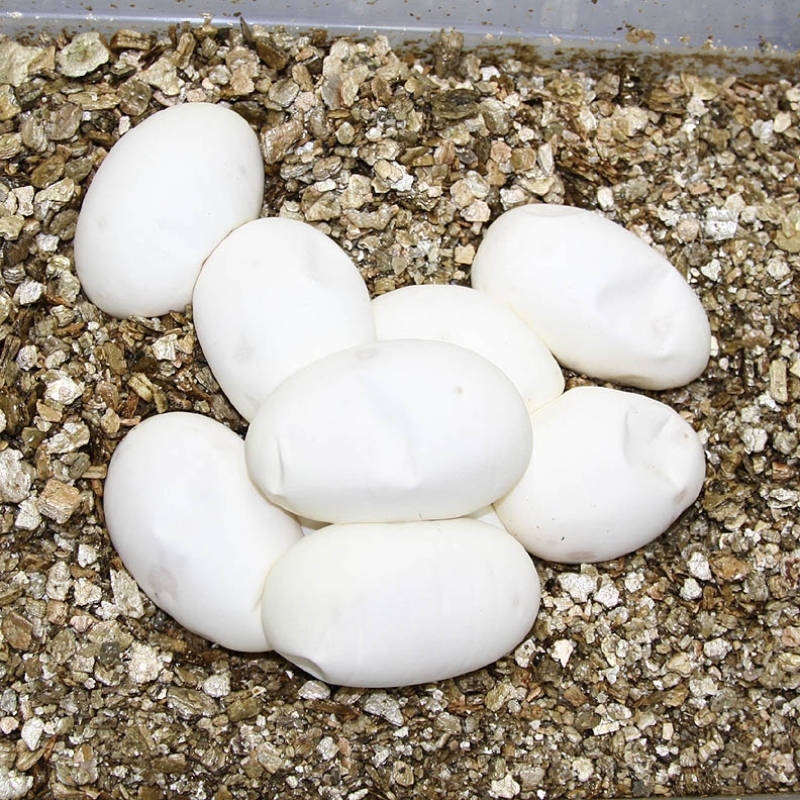 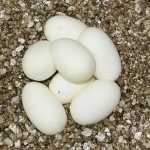 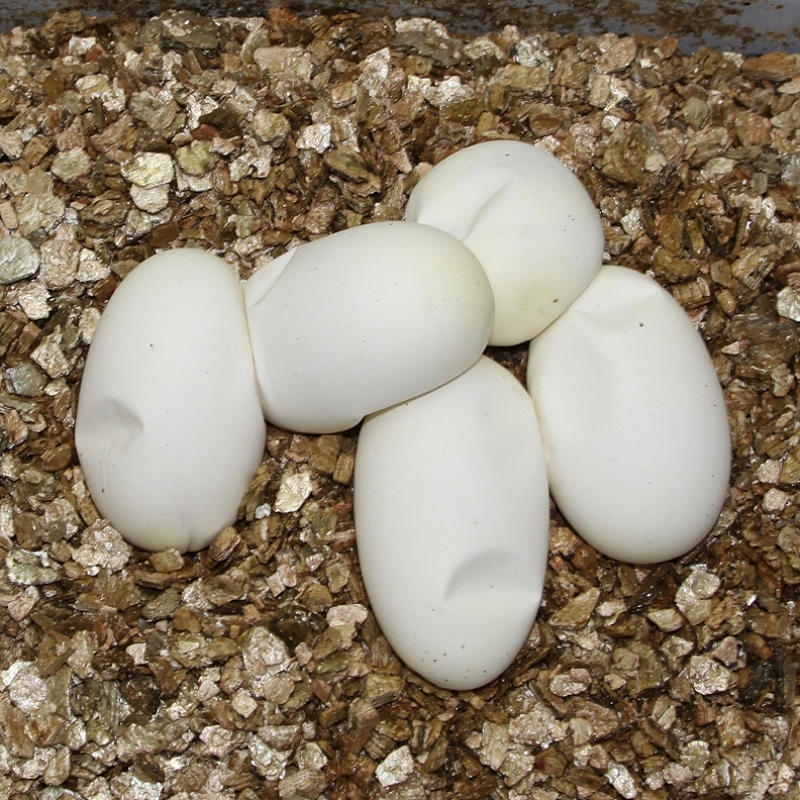 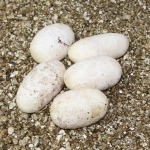 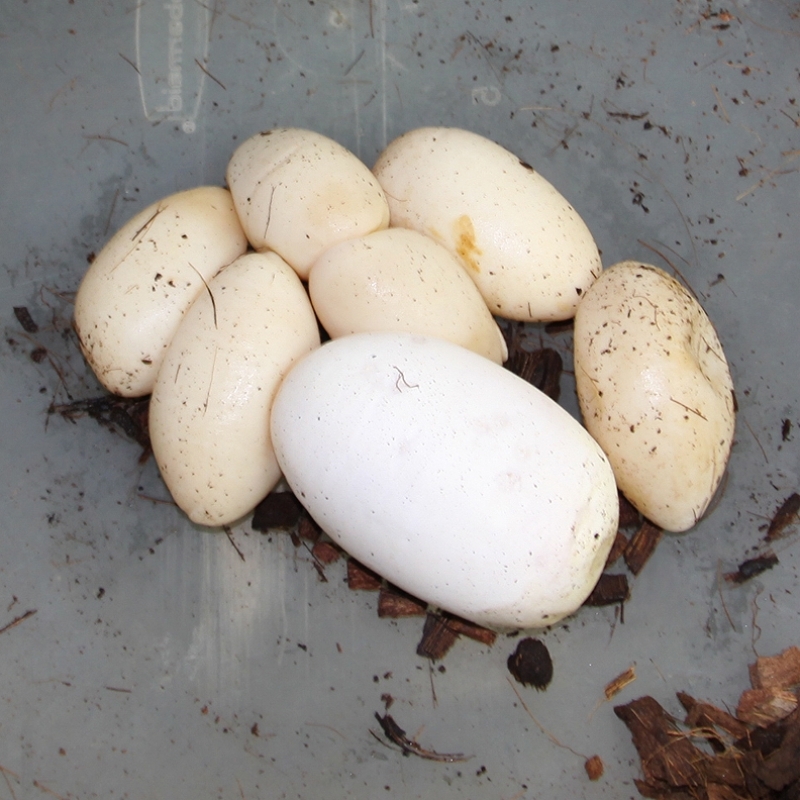 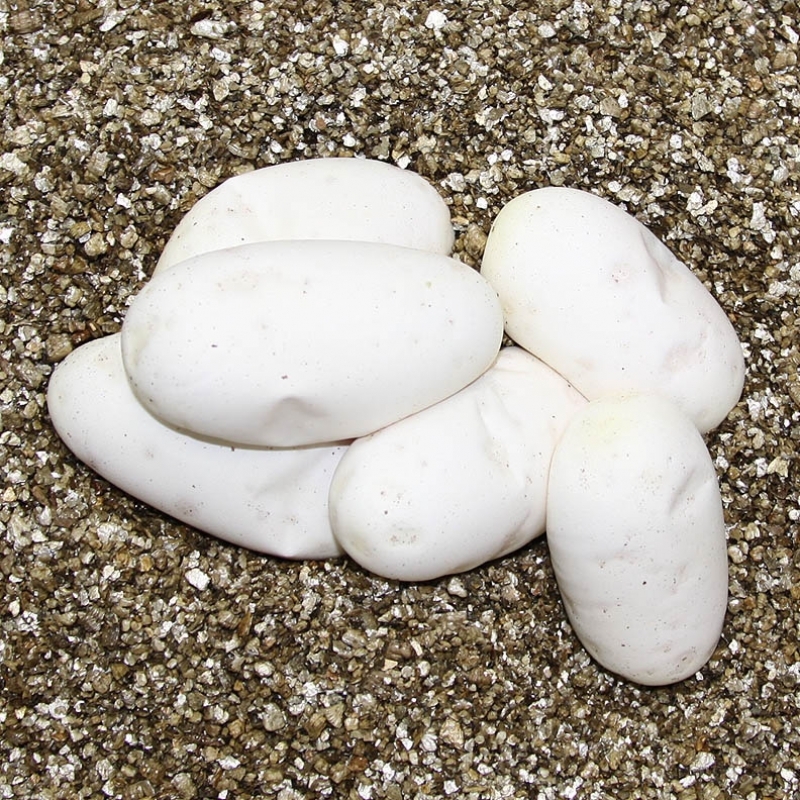 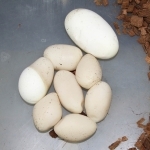 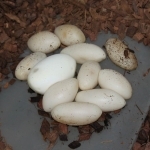 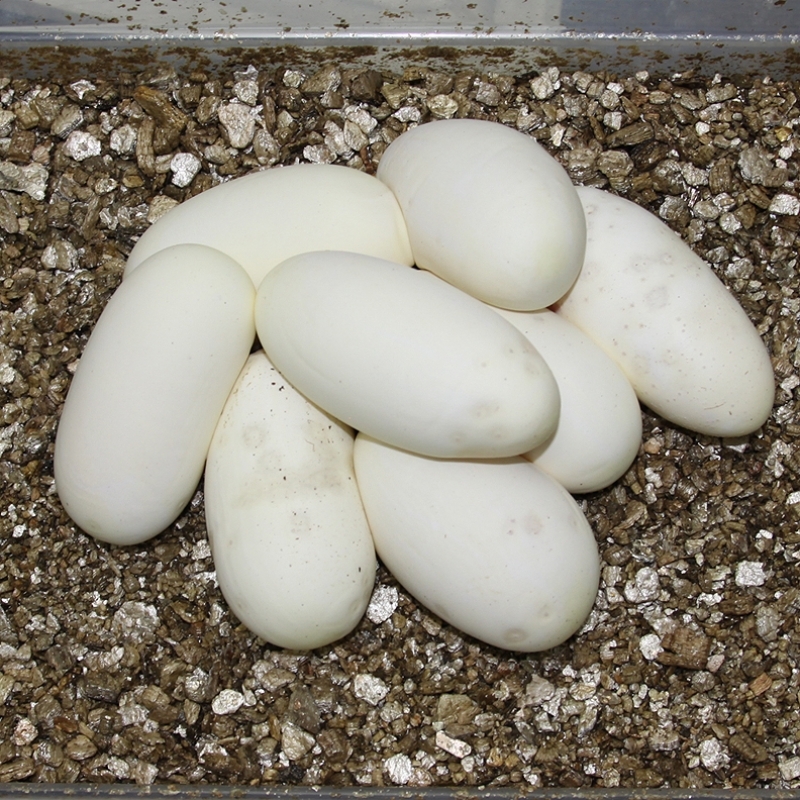 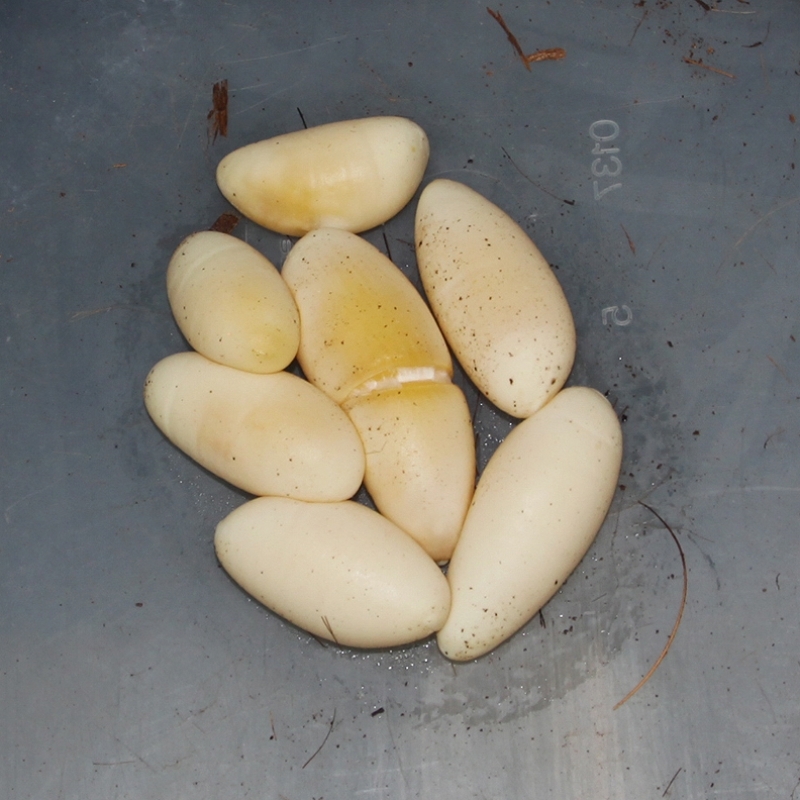 This clutch of 8 perfect eggs is good to see! 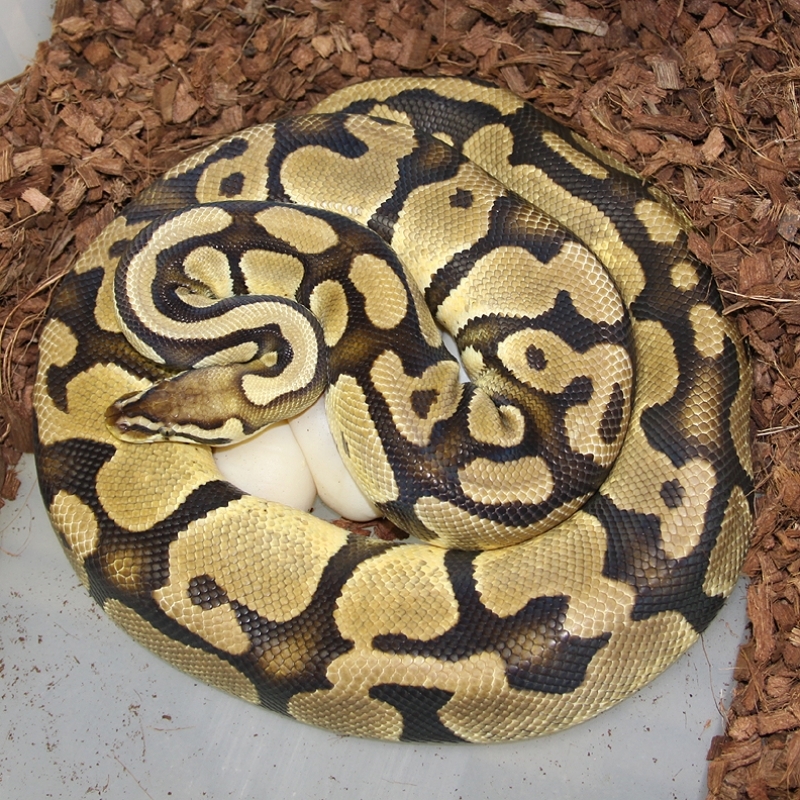 If you are interested in animals from clutch #180 please email or call 519-824-7377. 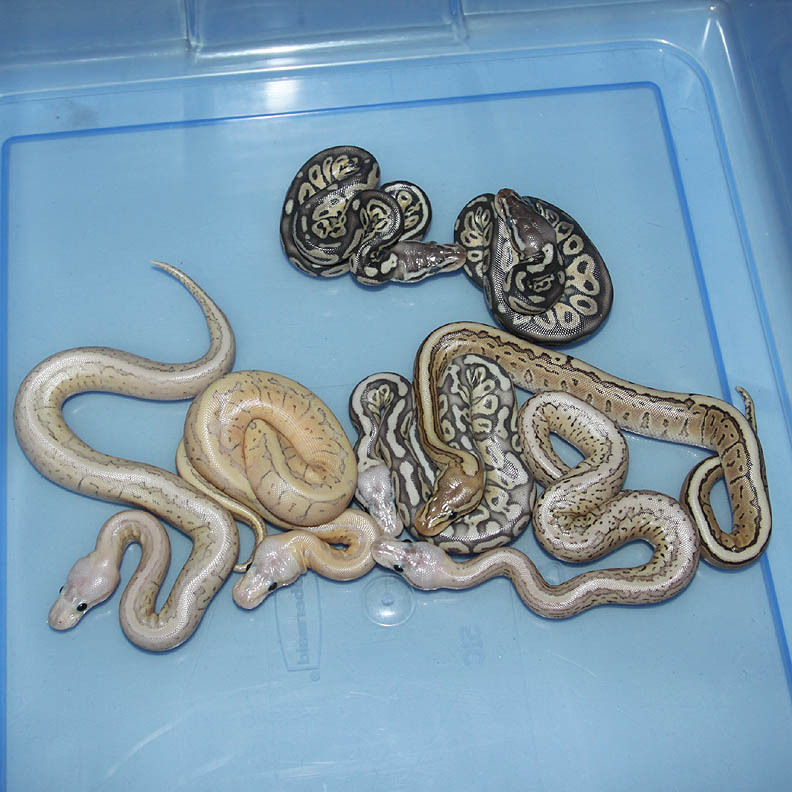 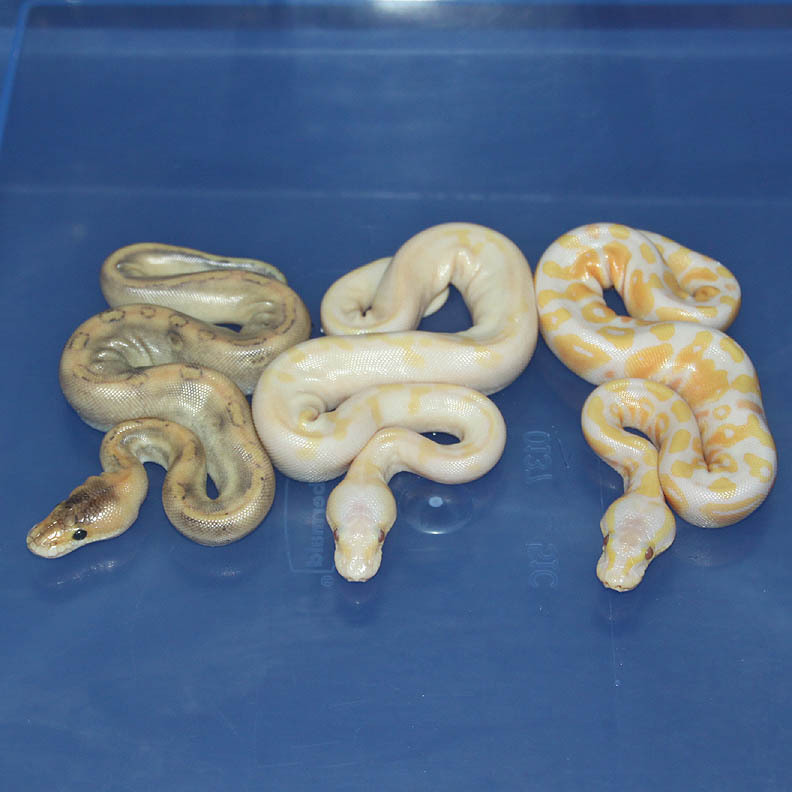 Description: Champagne Het Red Axanthic Het Lavender 1/12 x Pastel Lavender 50% Pos Het Genetic Stripe 1/12. 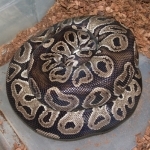 This is a really exciting clutch for me. 1) This is the first Lavender female to give me eggs. And a Pastel Lavender to bout! 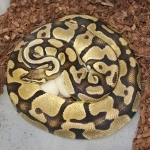 She was produced here in 2012. 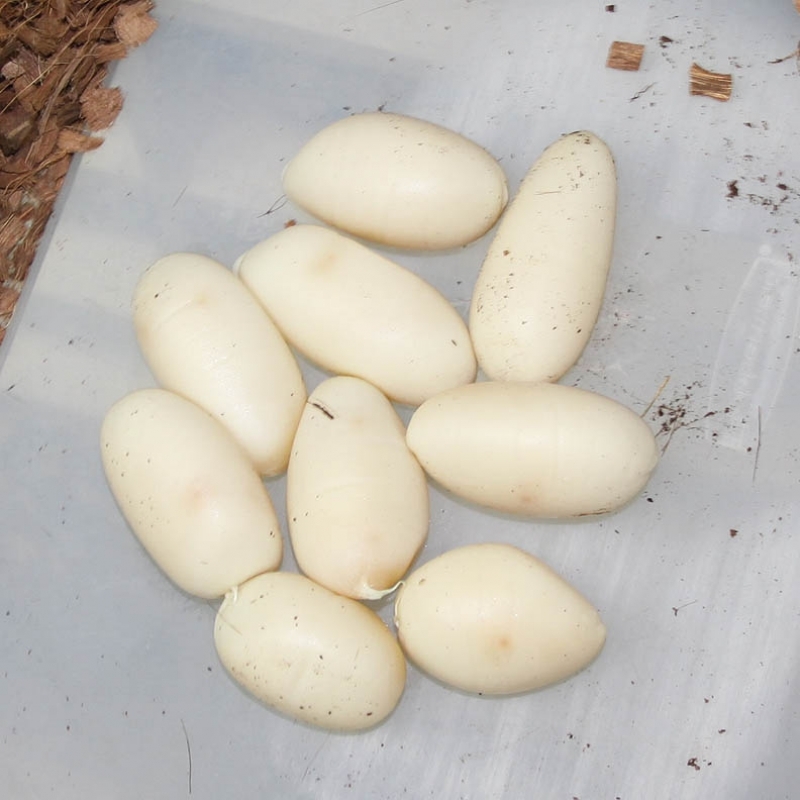 2) This clutch has the potential to produce Champagne Lavenders which I'm excited to see! This is my last clutch of Champagne Lavenders. 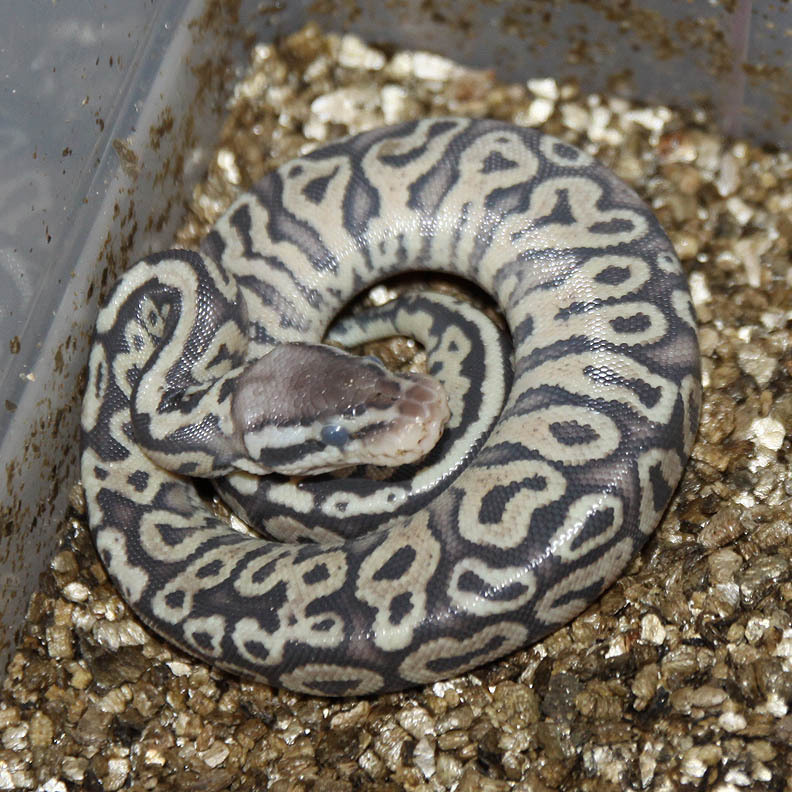 I'll try again next year for a male. 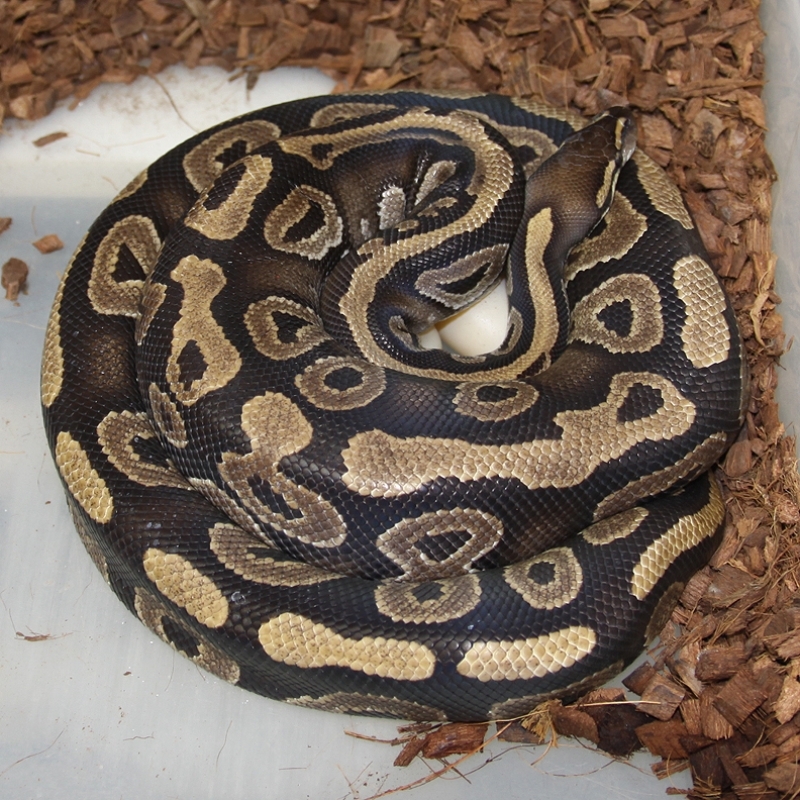 I cannot wait to see what this female looks like at 1000 grams! If you are interested in animals from clutch #181 please email or call 519-824-7377. 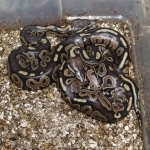 Description: POGL (Orange) 1/09 x HY PHOG 16/06. 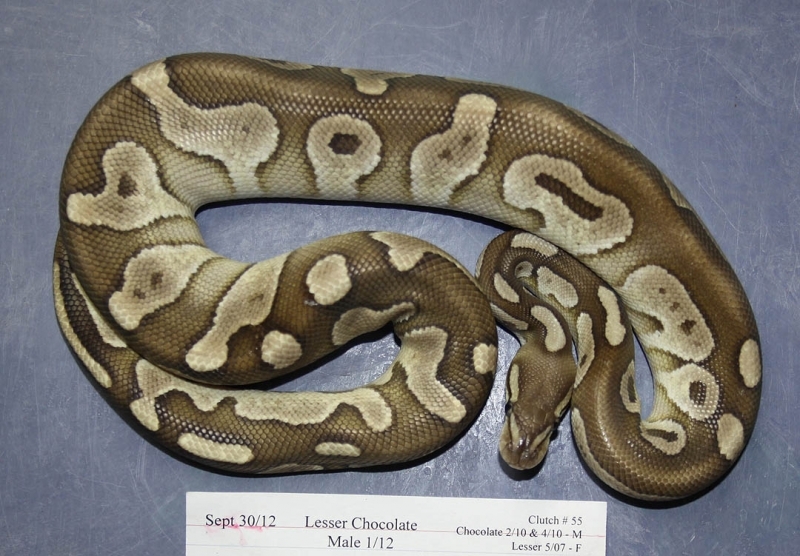 If you are interested in animals from clutch #182 please email or call 519-824-7377. 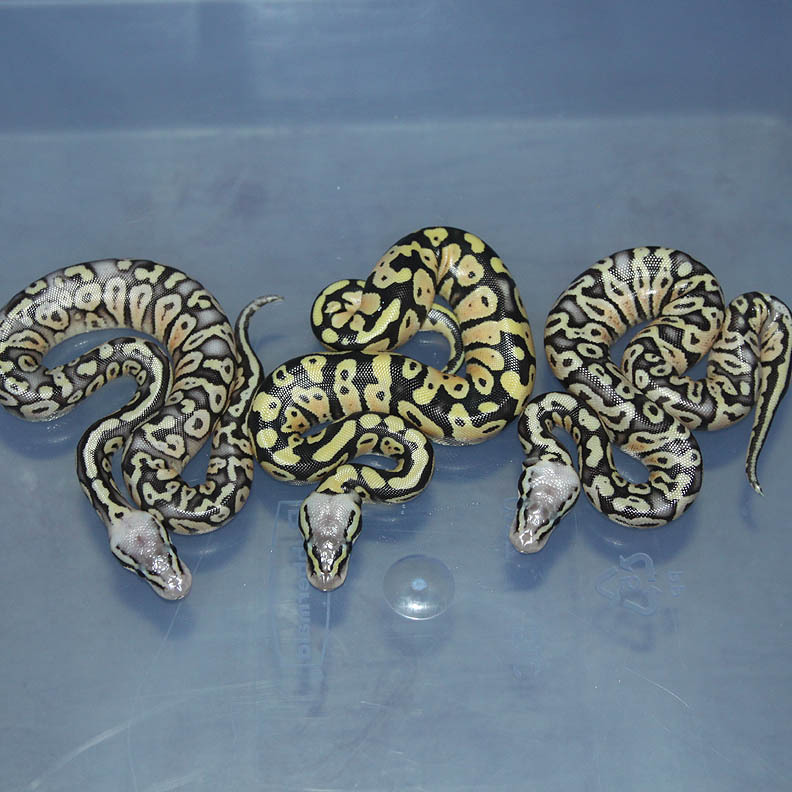 Description: POG RA 1/11 x Pastel HRA/OG 1/08. 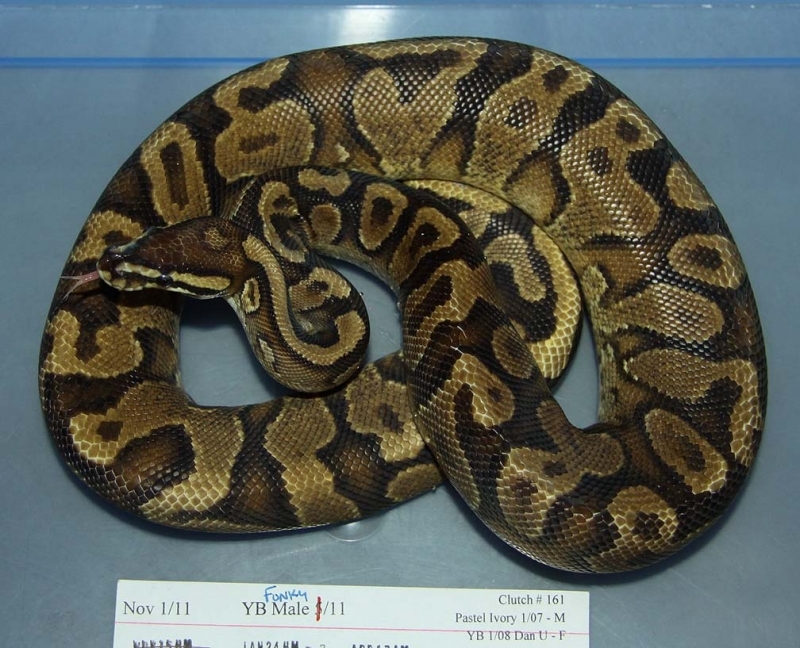 If you are interested in animals from clutch #183 please email or call 519-824-7377. 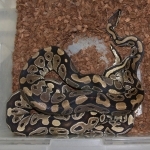 Description: POGL (Orange) 1/09 x HY Het OG 18/06. 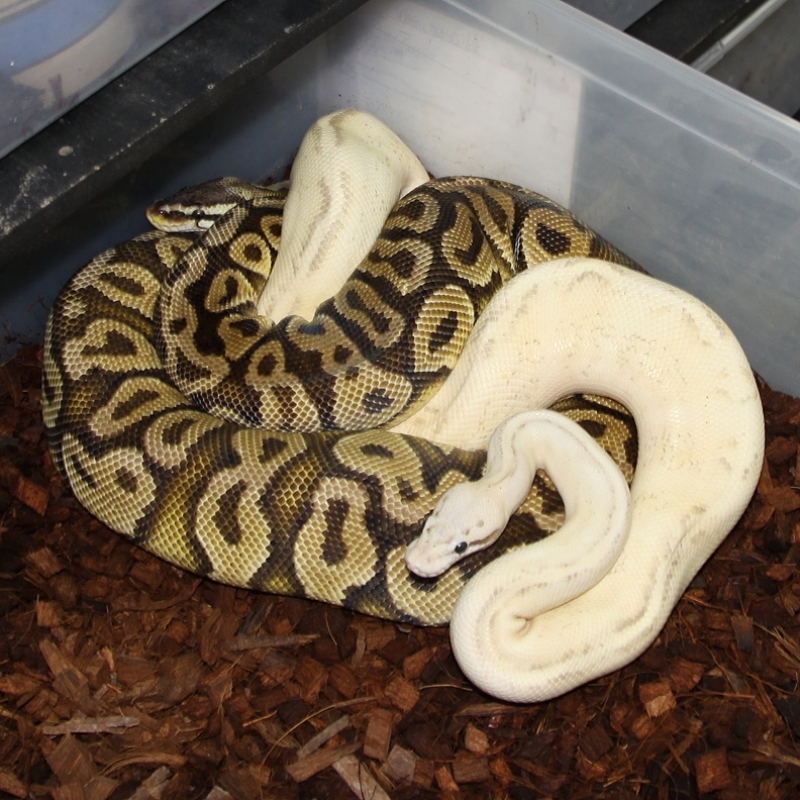 If you are interested in animals from clutch #184 please email or call 519-824-7377. 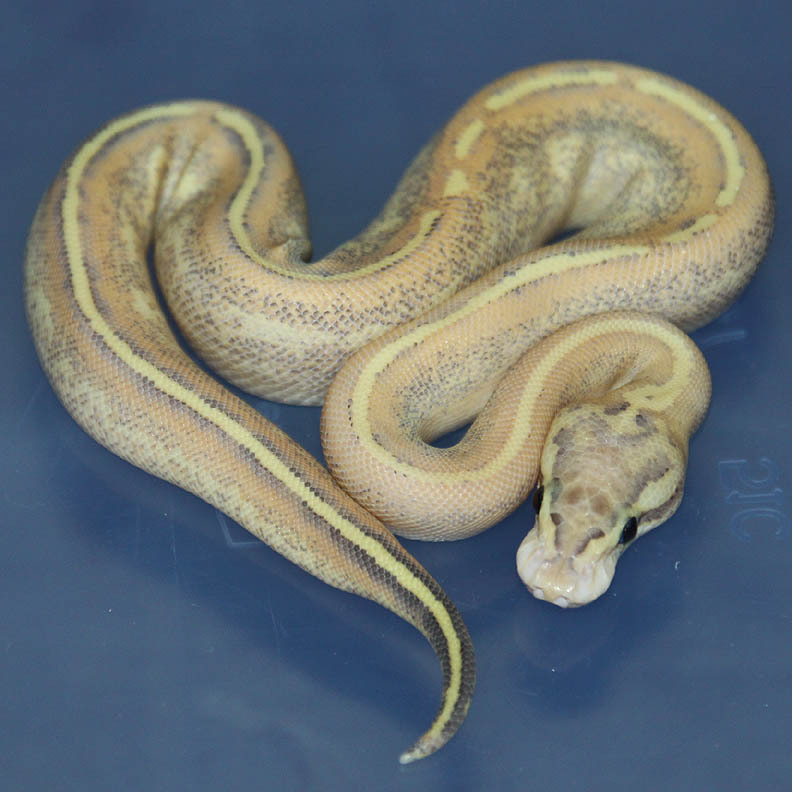 Description: Pastel Caramel HRA 1/11 x Genetic Stripe 1/10. 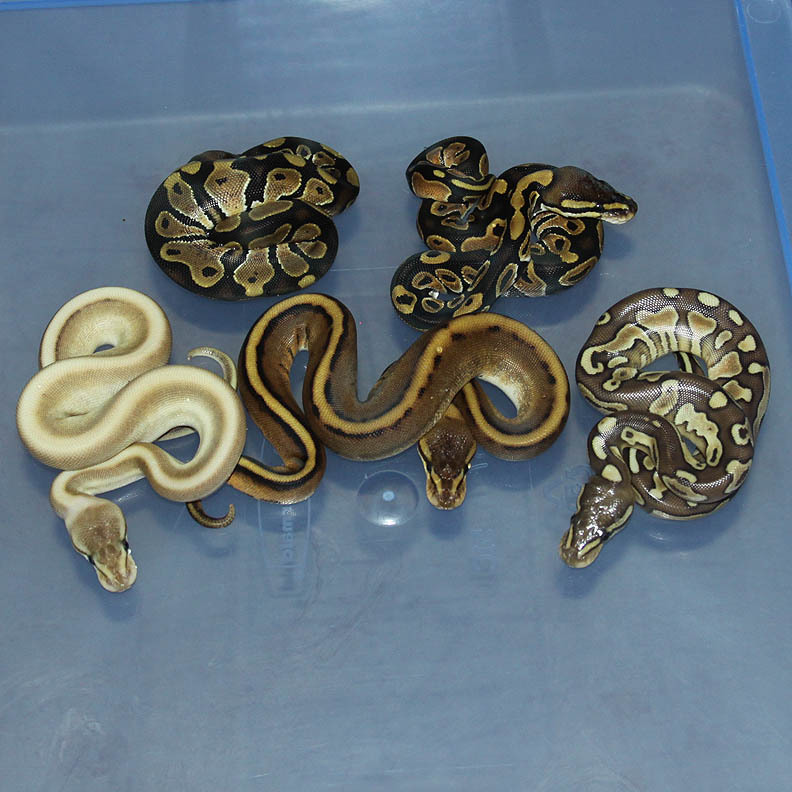 If you are interested in animals from clutch #185 please email or call 519-824-7377. 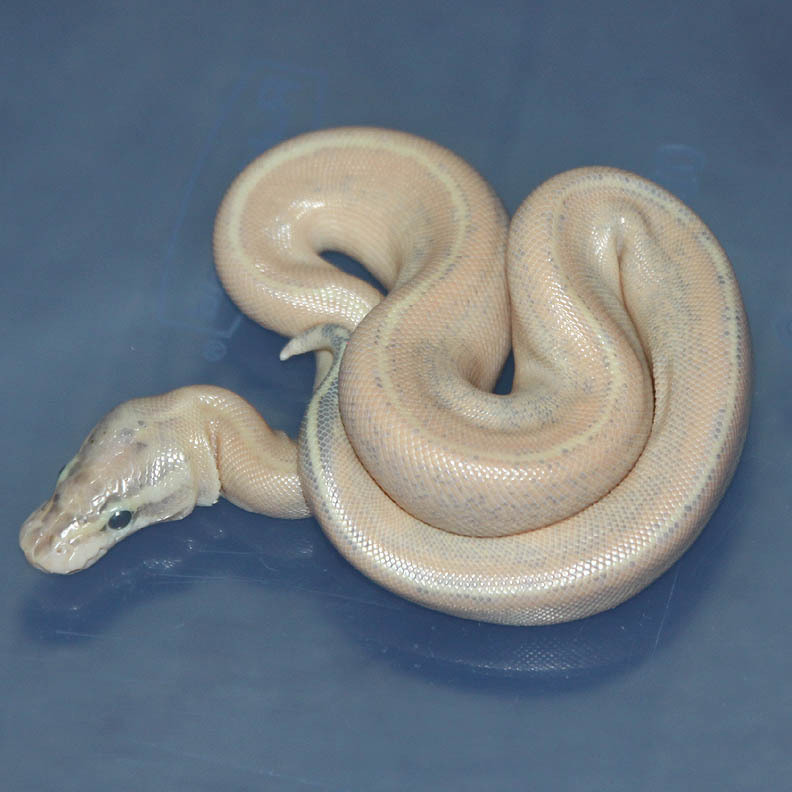 Description: Pastel Lavender Het Genetic Stripe 1/10 x Het Lavender PHGS 5/11. 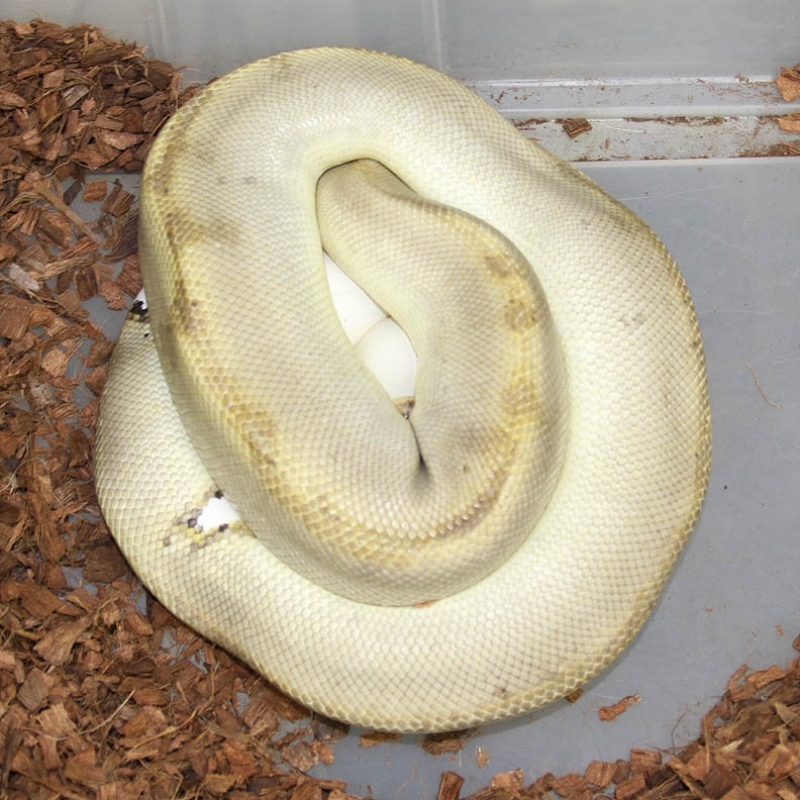 This is unfortunate. 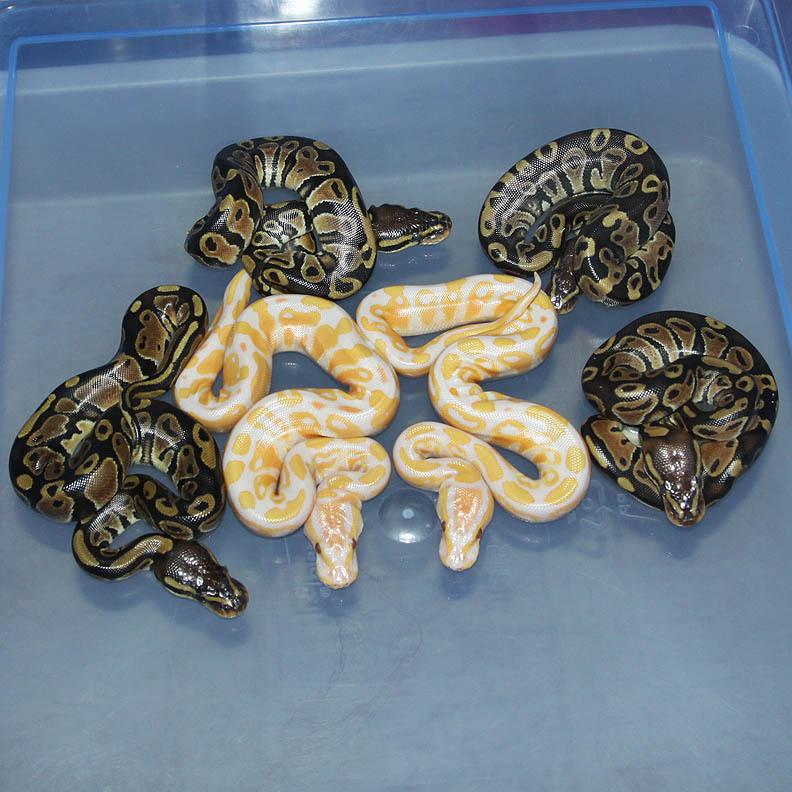 I really want to prove out some of these Het Lav PHGS as double hets! 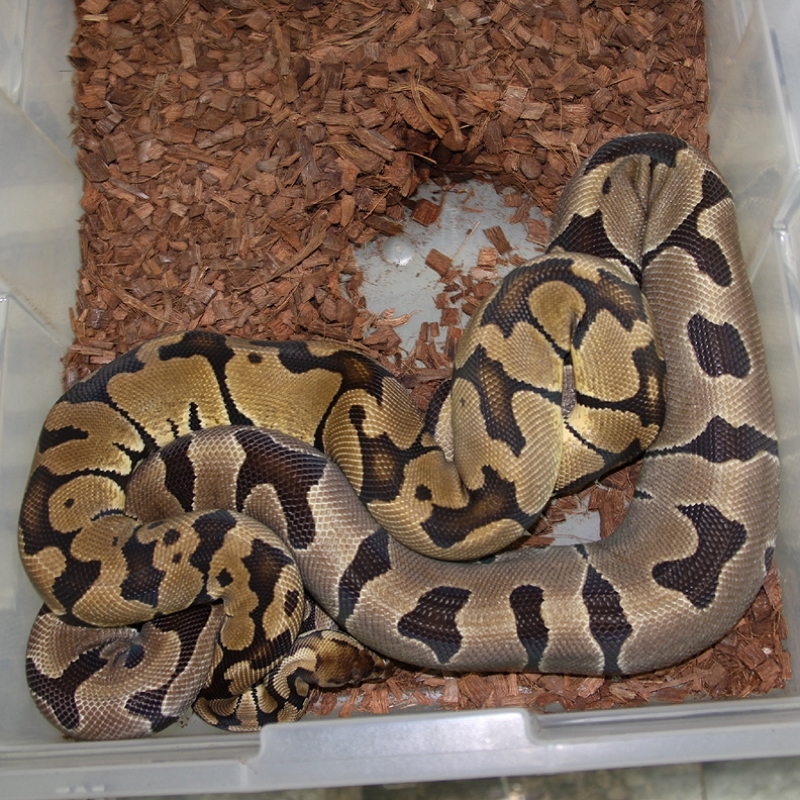 If you are interested in animals from clutch #186 please email or call 519-824-7377. 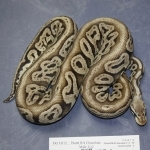 Description: Super Phantom 6/10 RDR x Champ HRA 4/10. 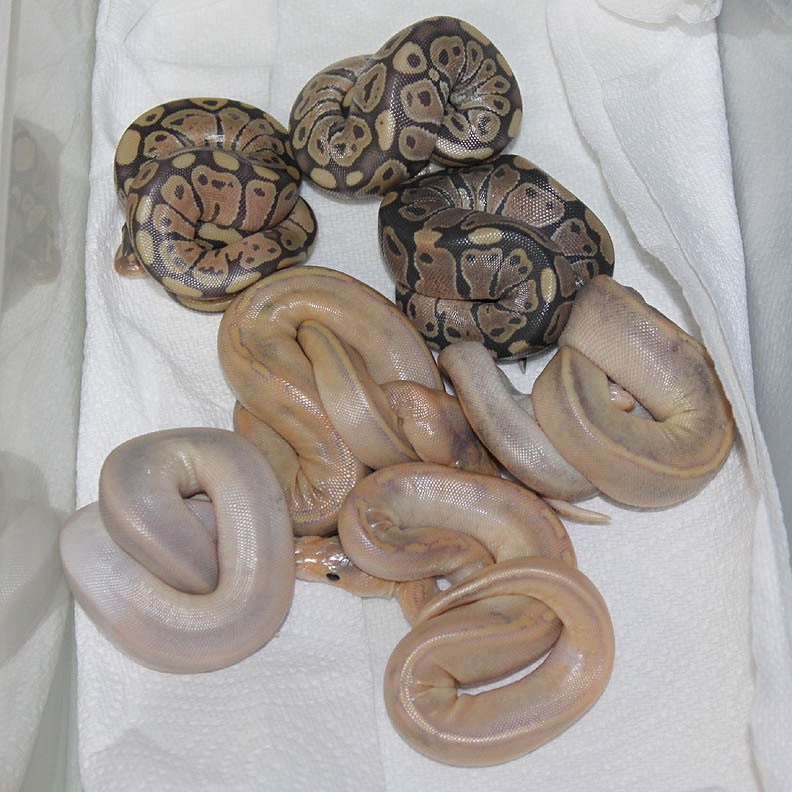 If you are interested in animals from clutch #187 please email or call 519-824-7377. 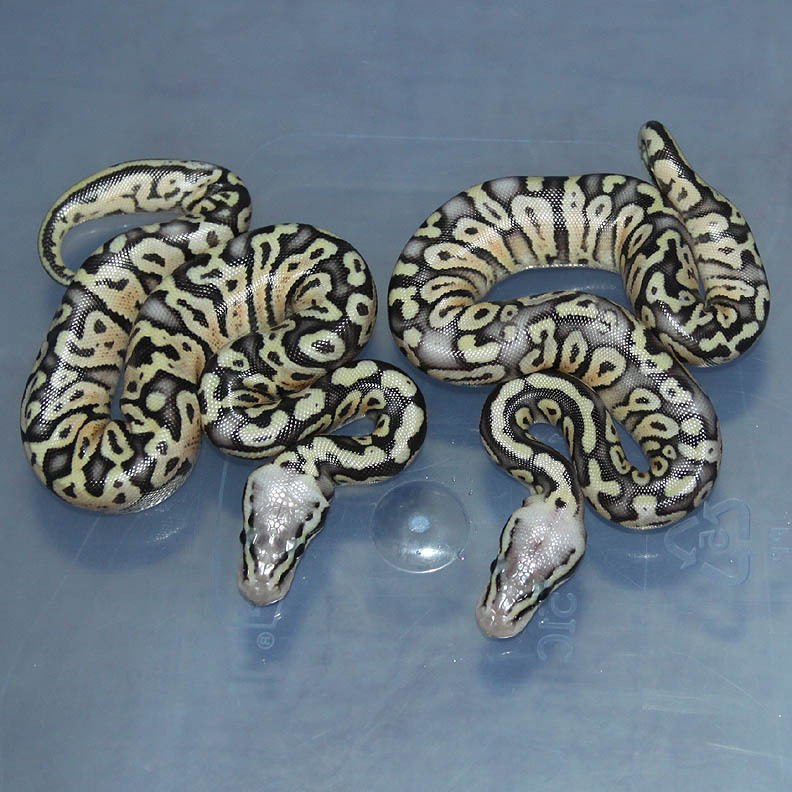 Description: Pastel Lesser DH GG/GS 2/11 x Super Pastel DH GG/GS 1/10. 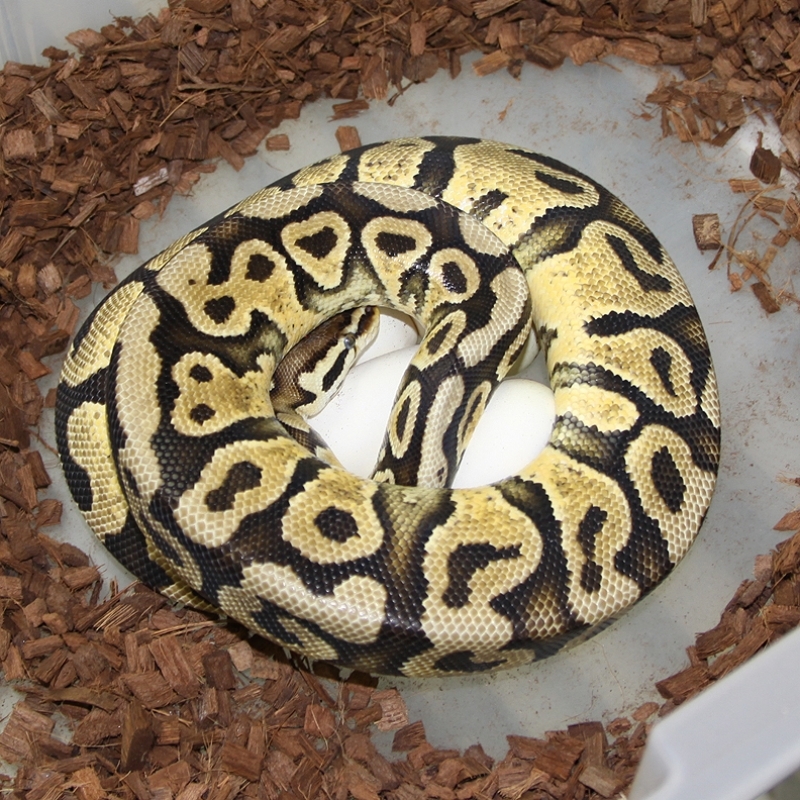 If you are interested in animals from clutch #188 please email or call 519-824-7377. 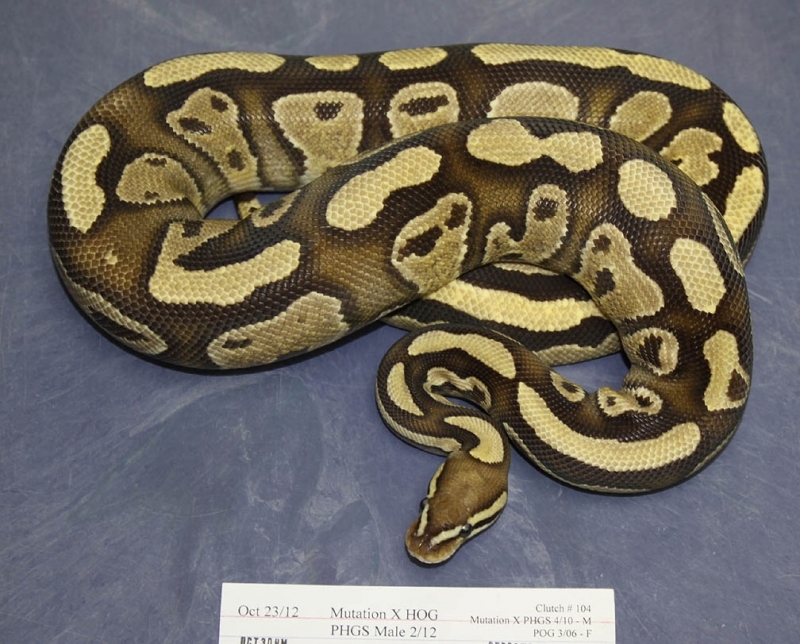 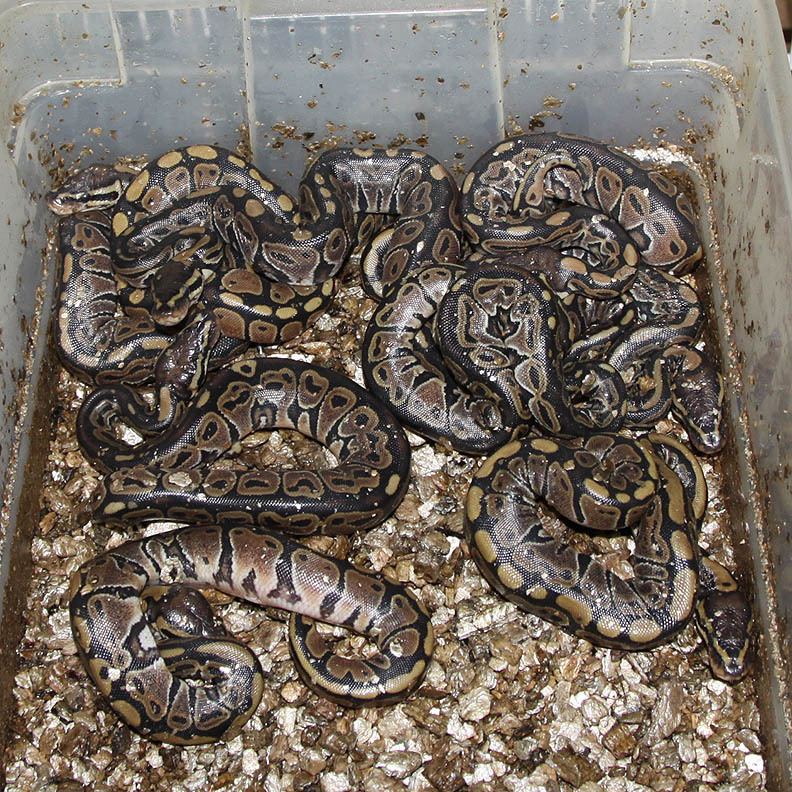 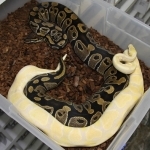 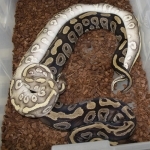 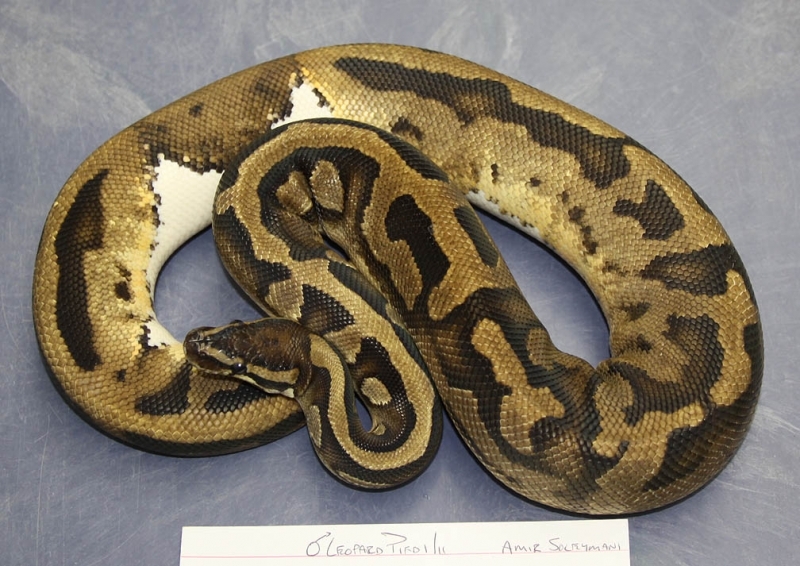 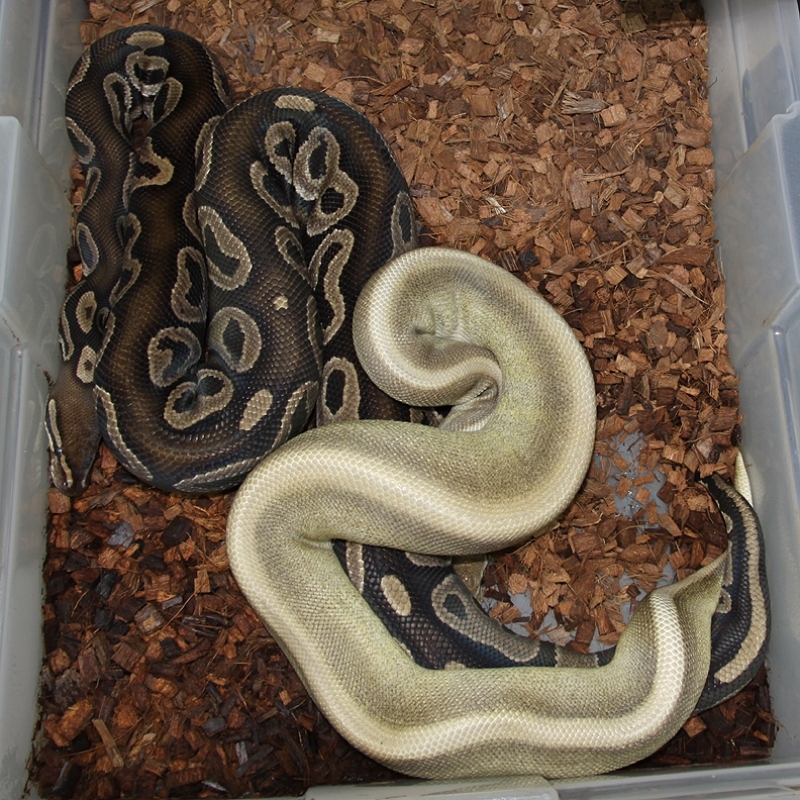 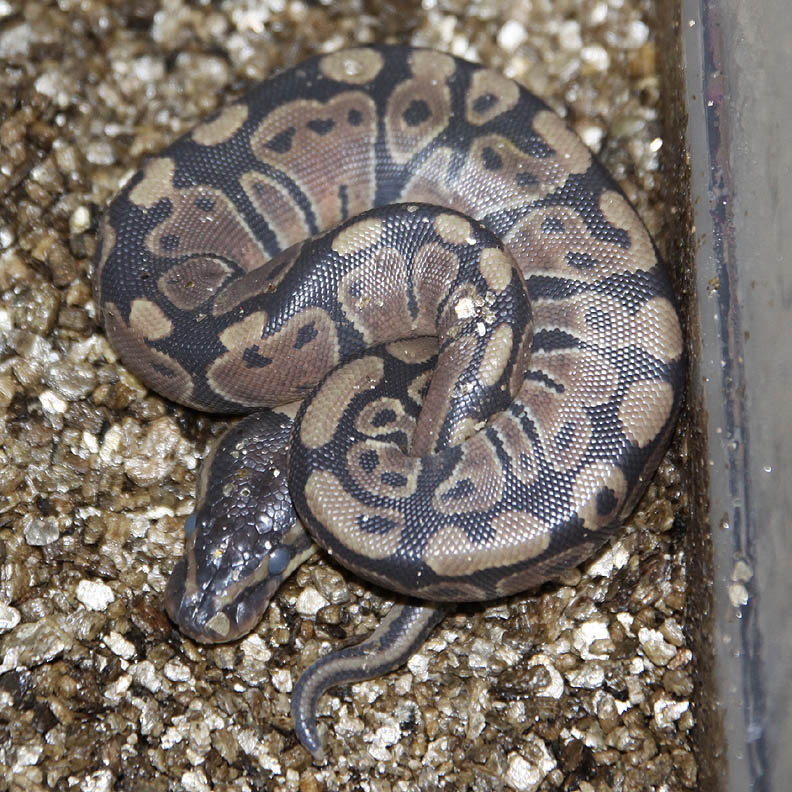 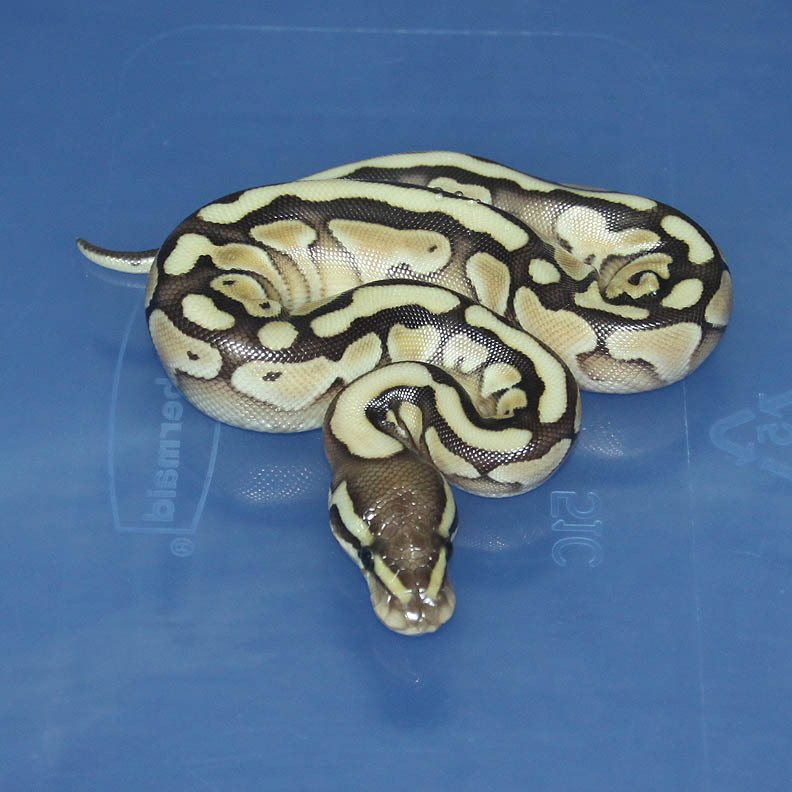 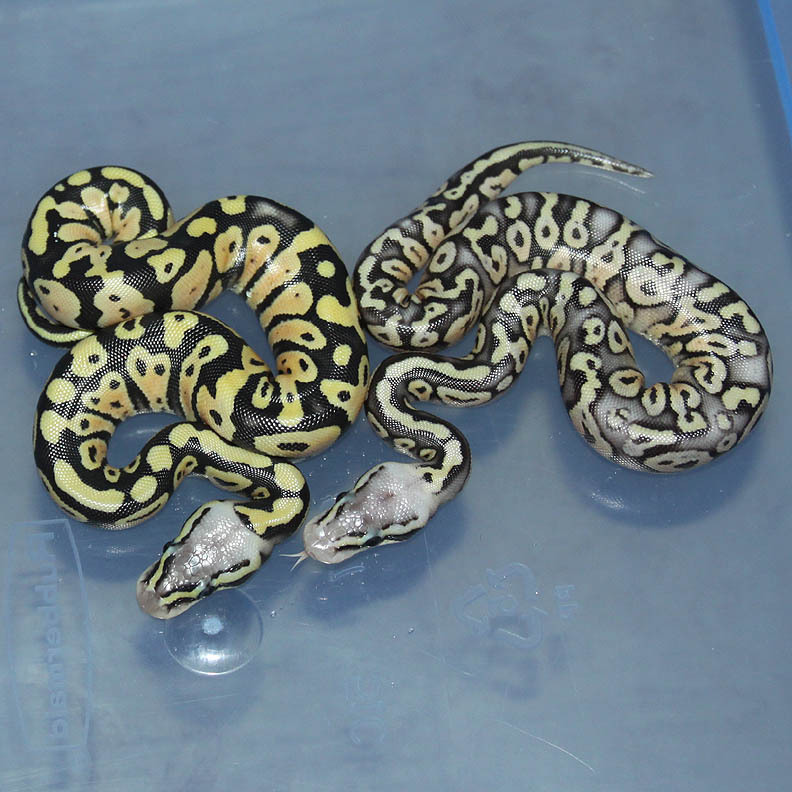 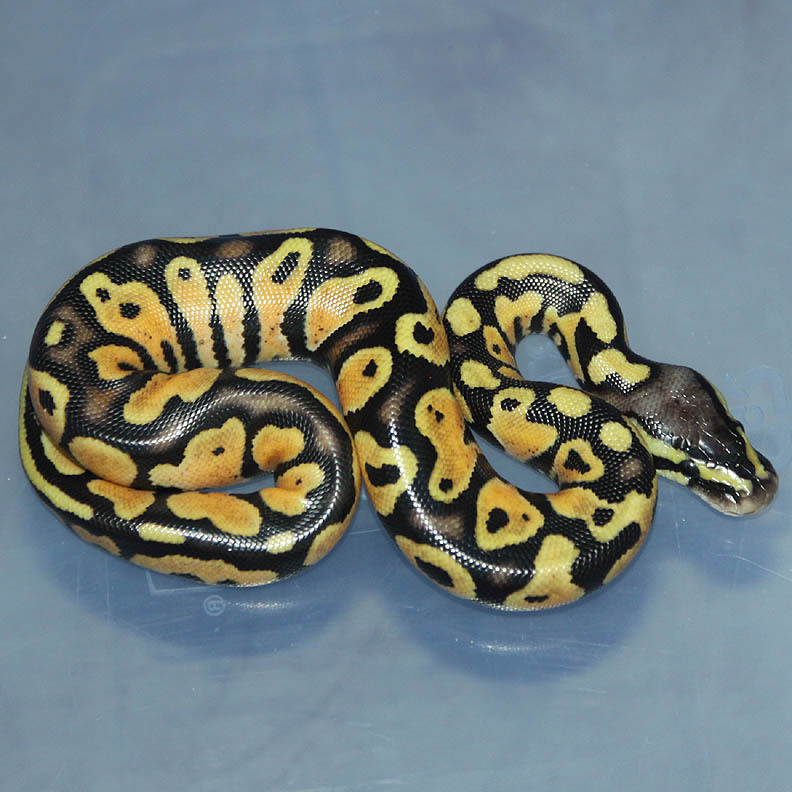 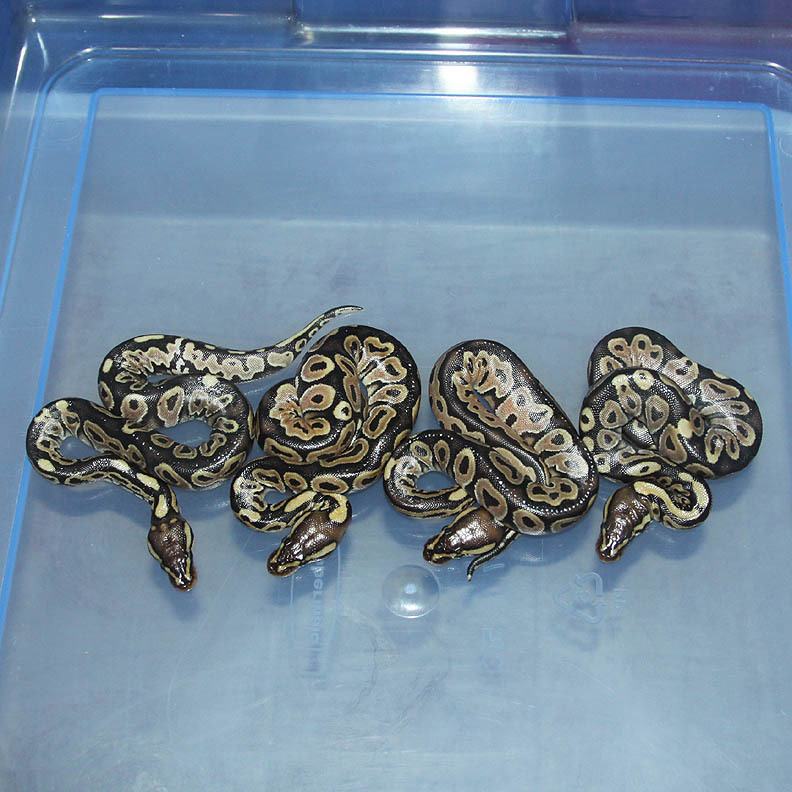 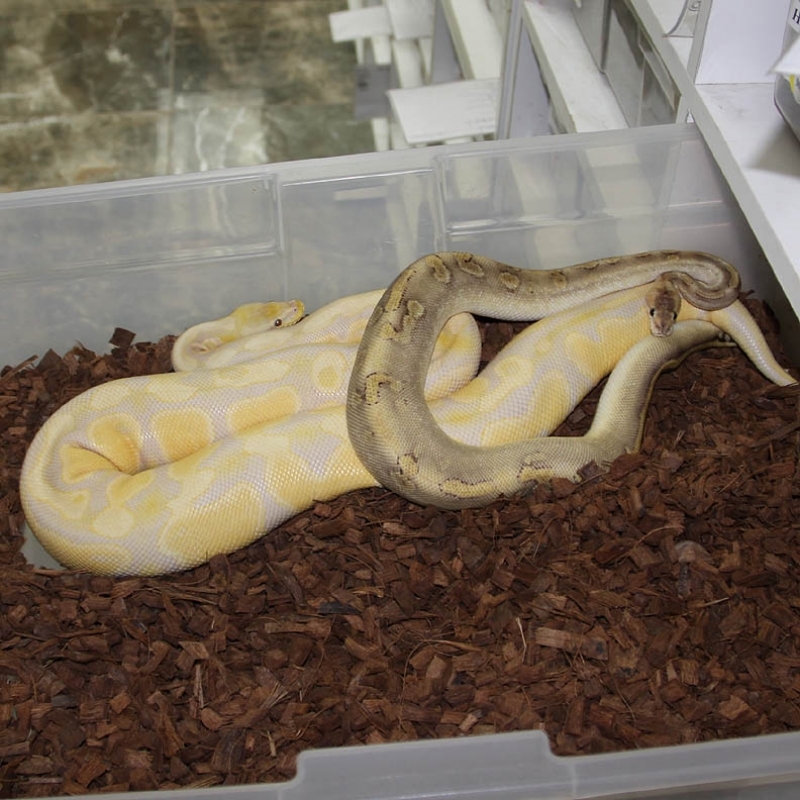 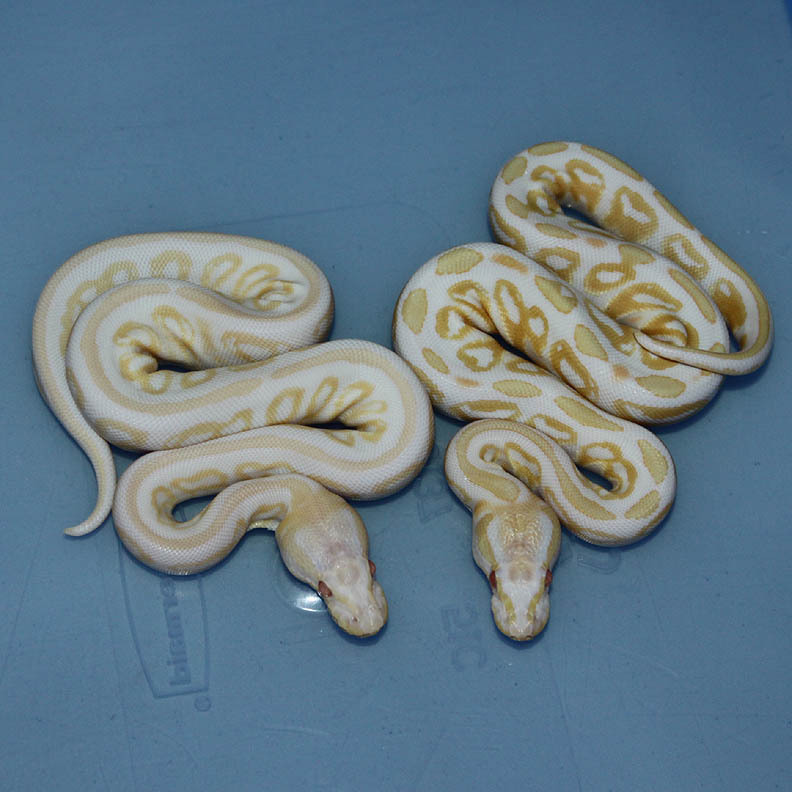 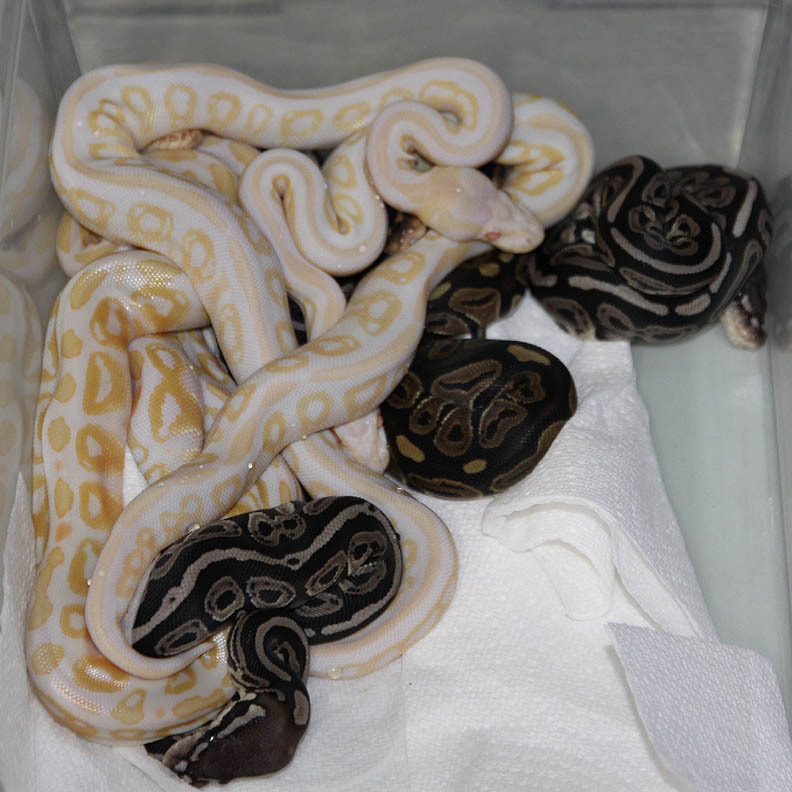 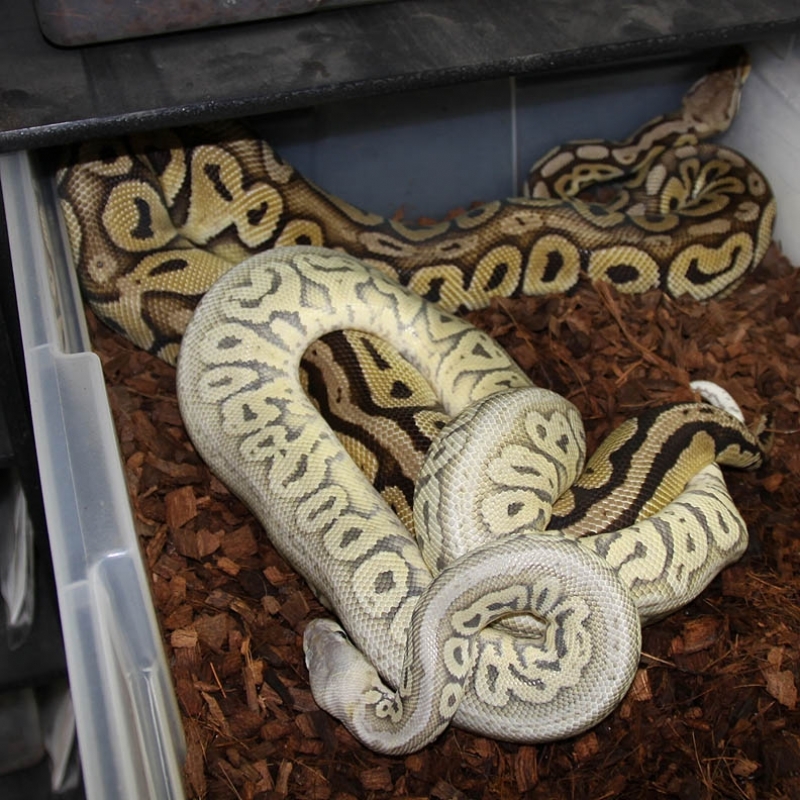 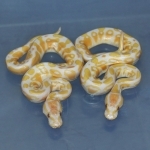 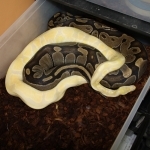 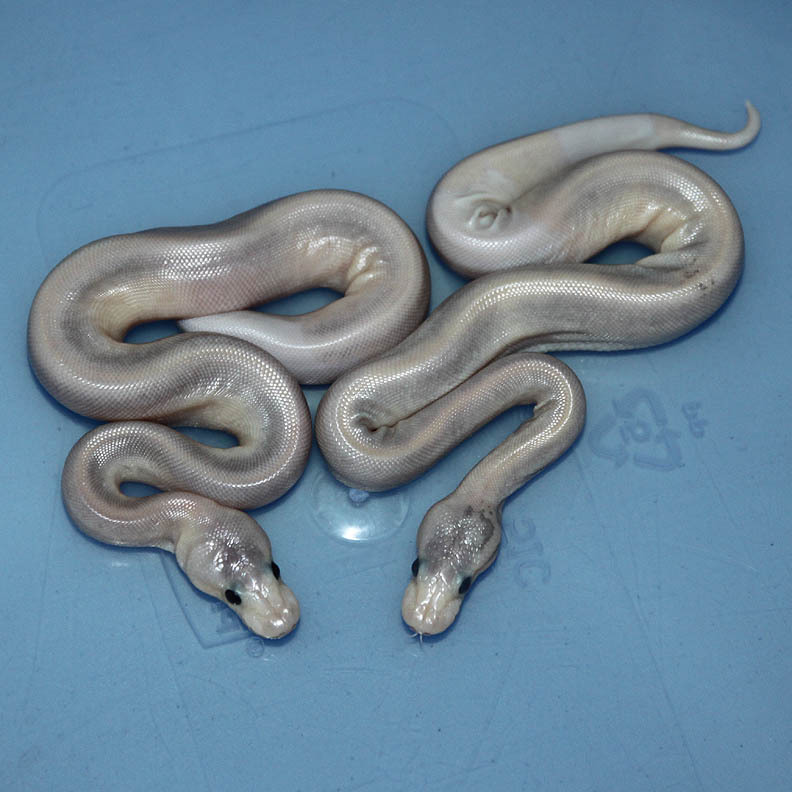 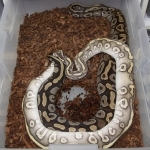 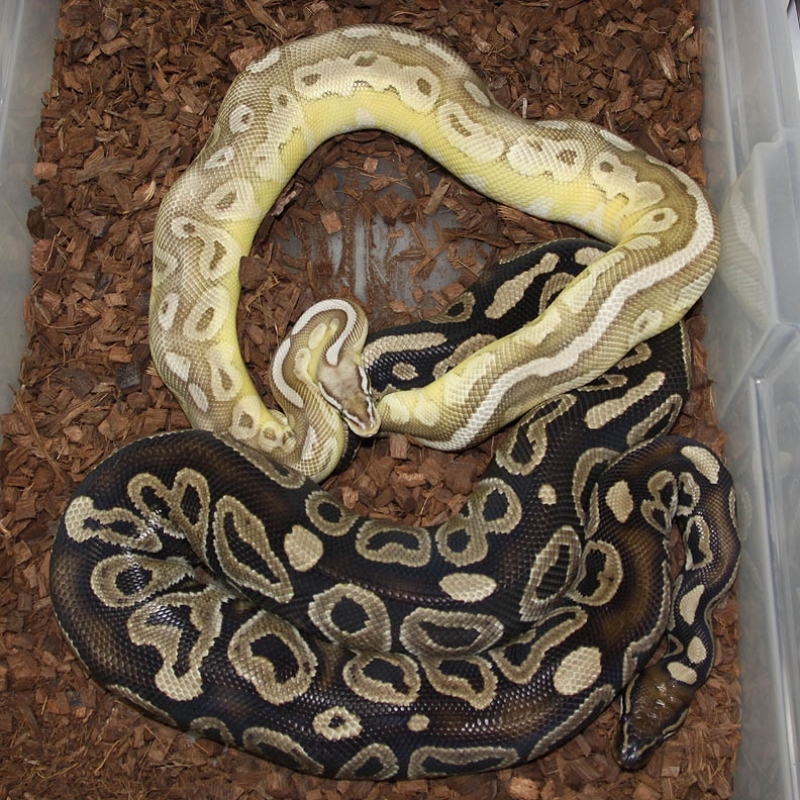 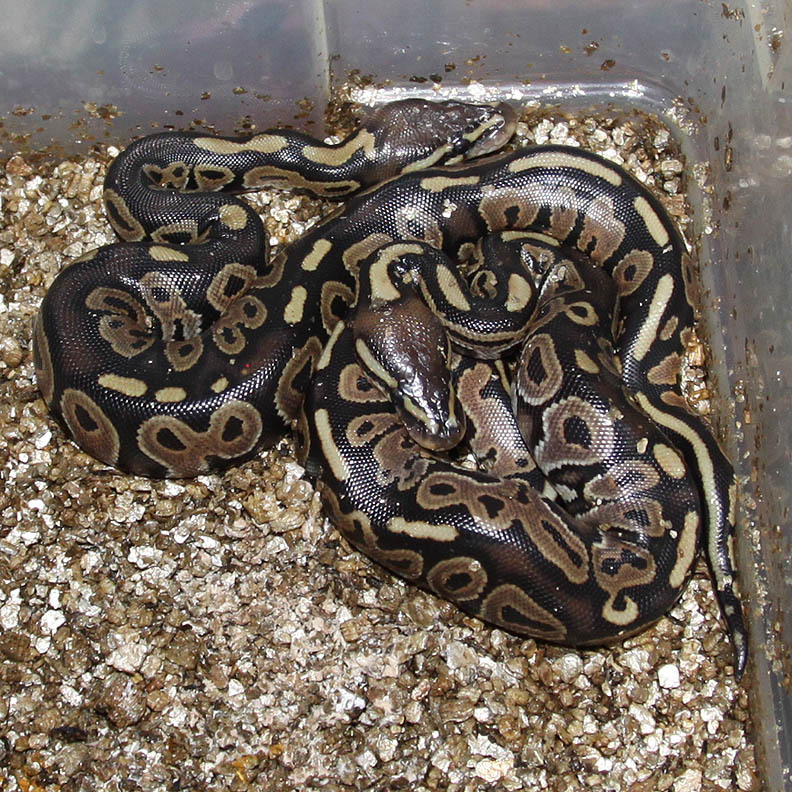 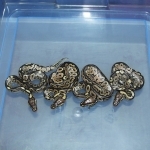 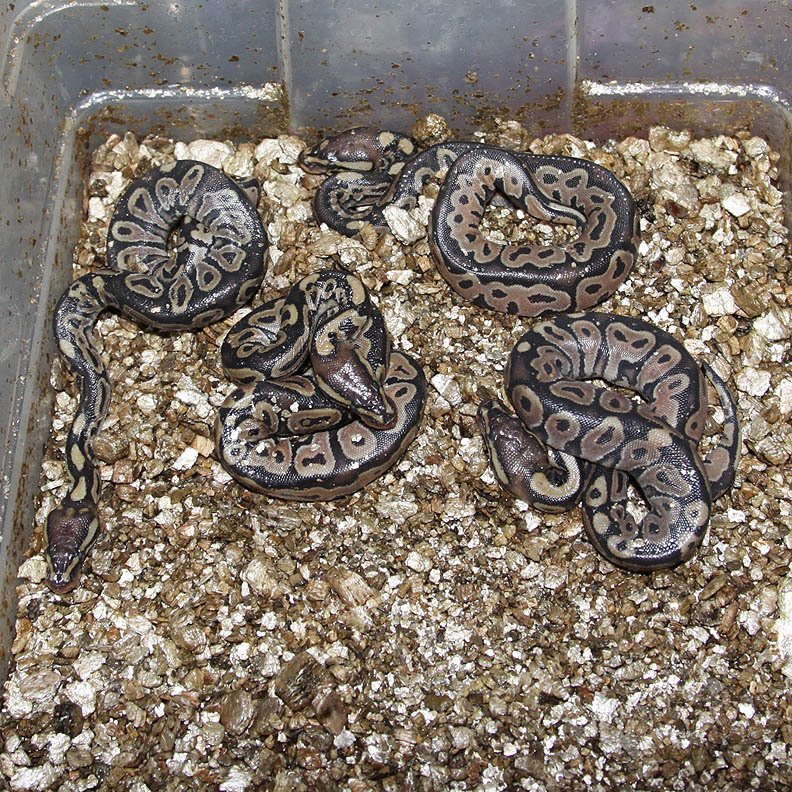 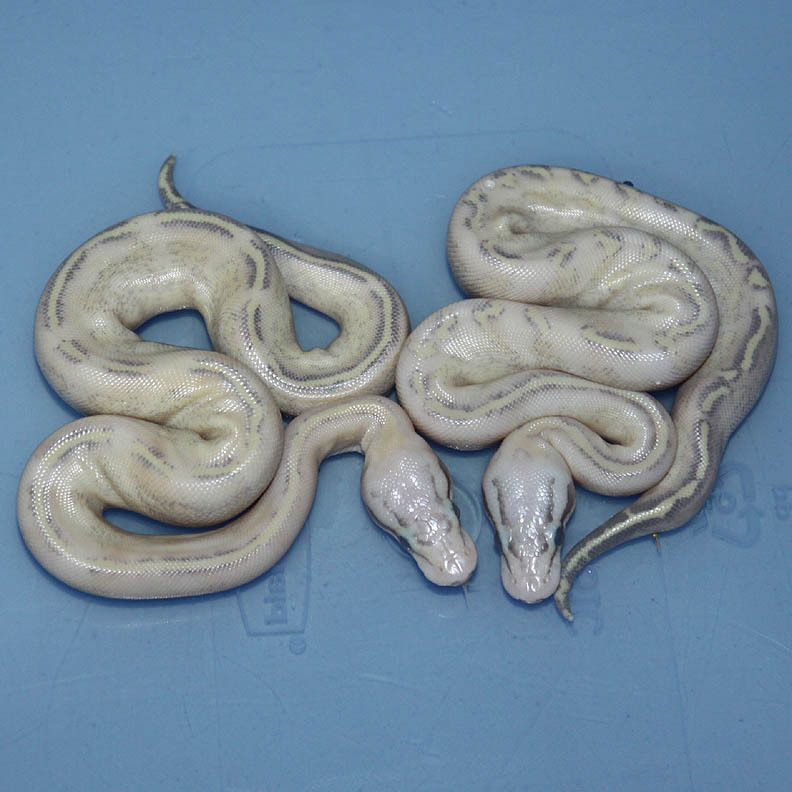 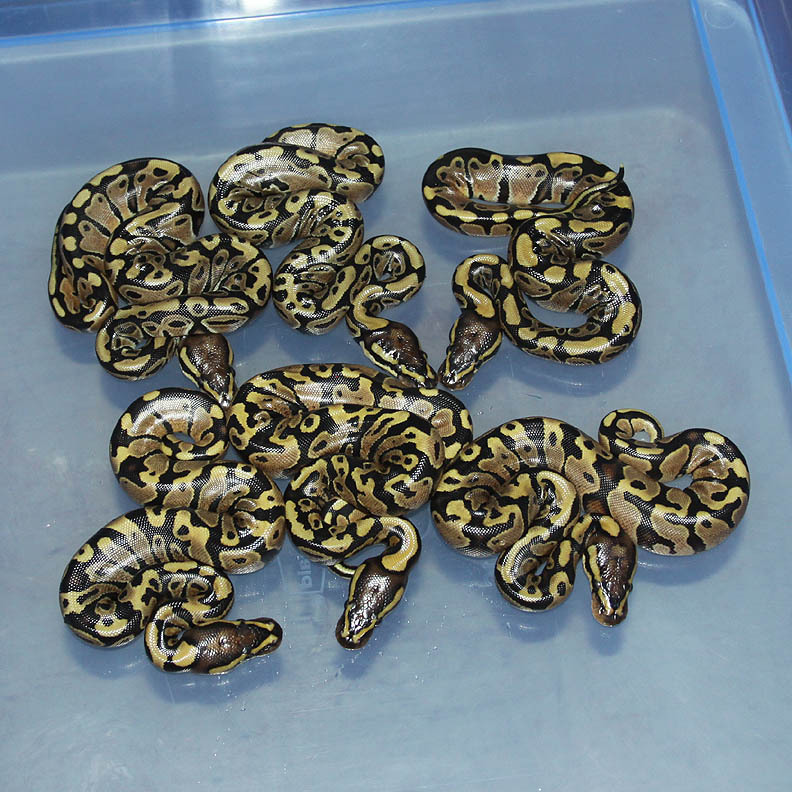 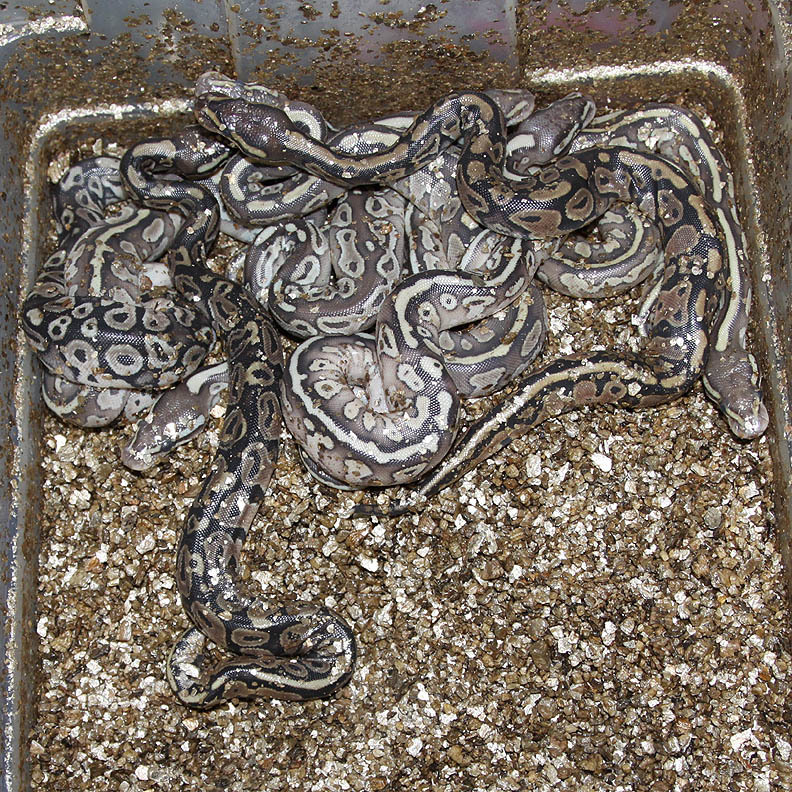 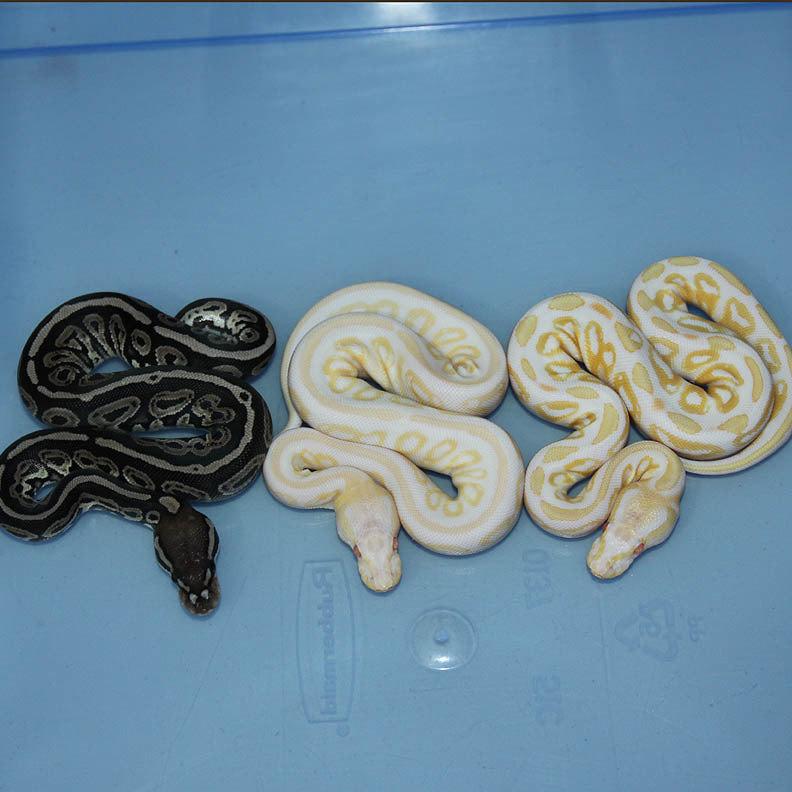 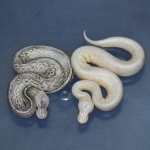 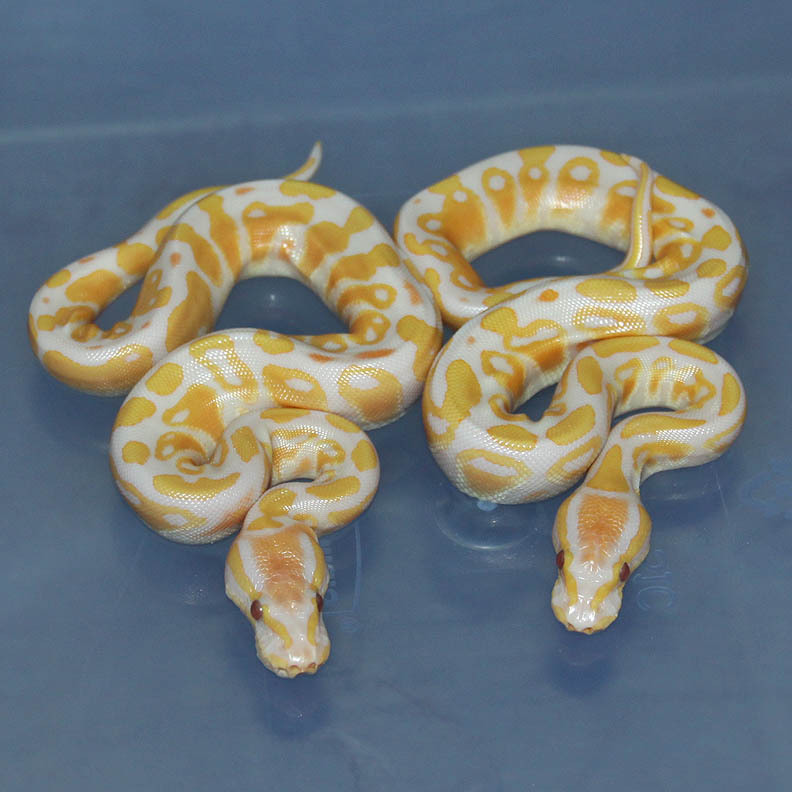 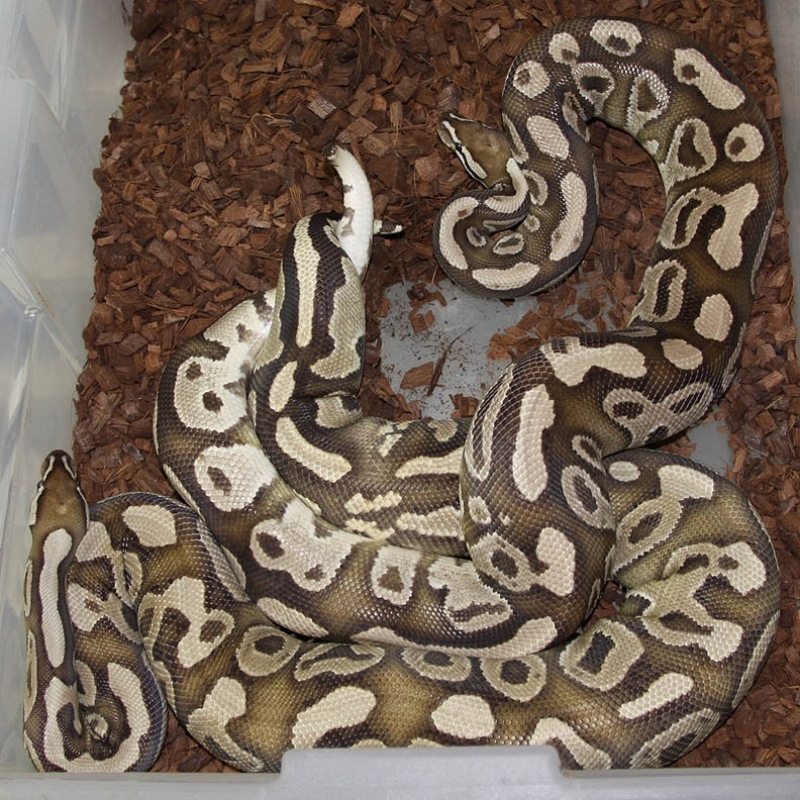 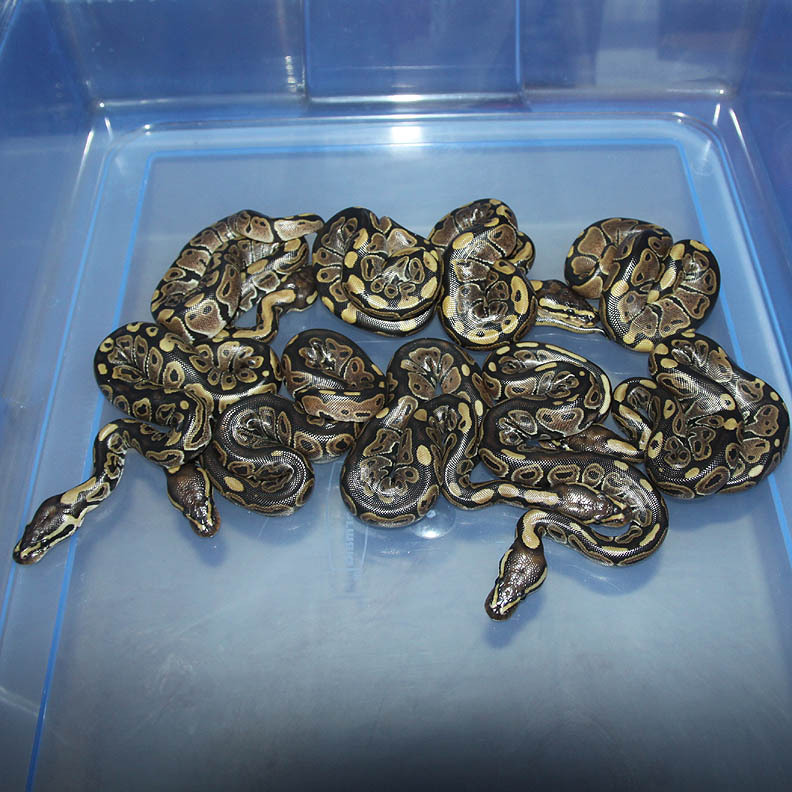 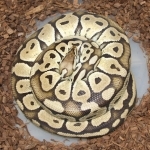 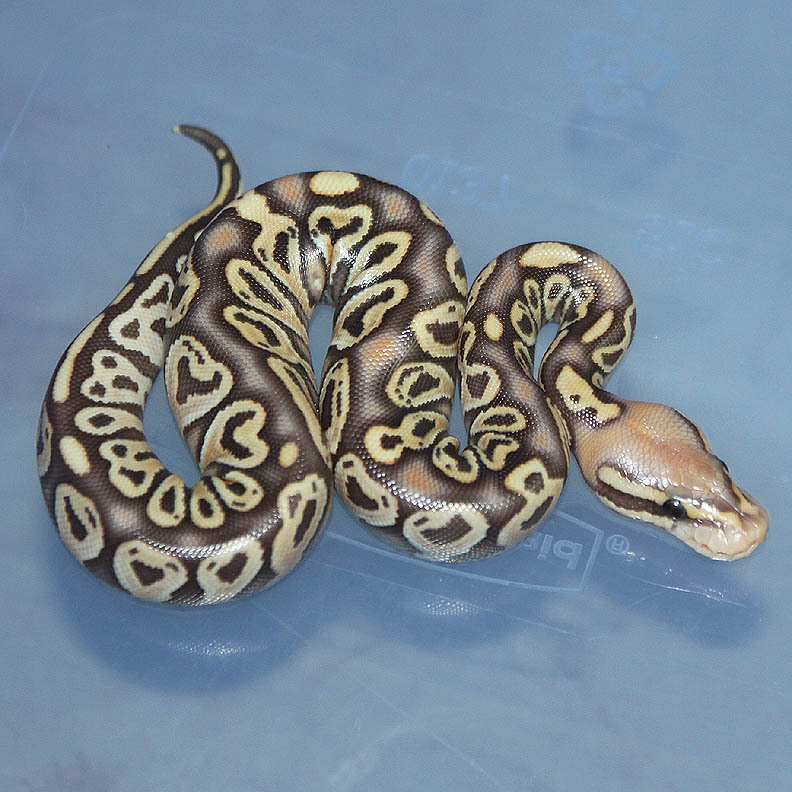 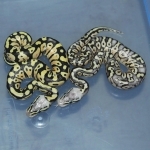 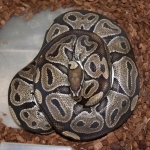 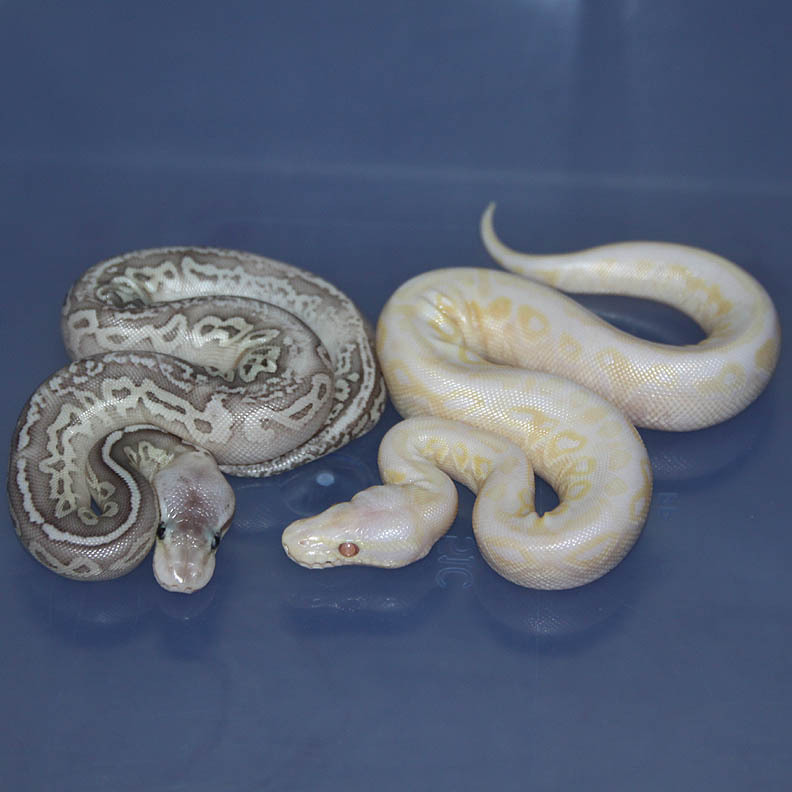 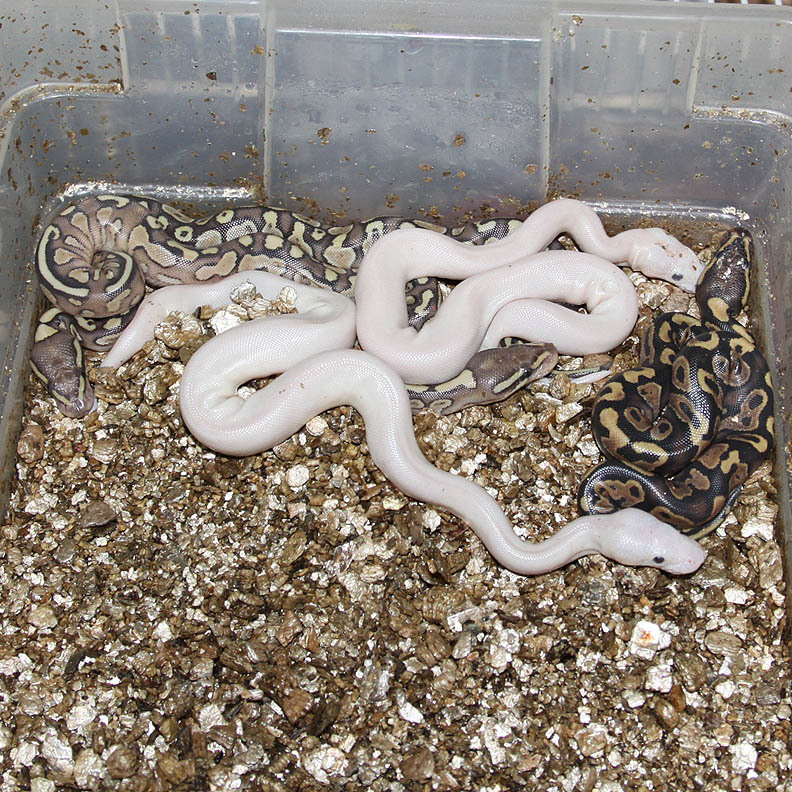 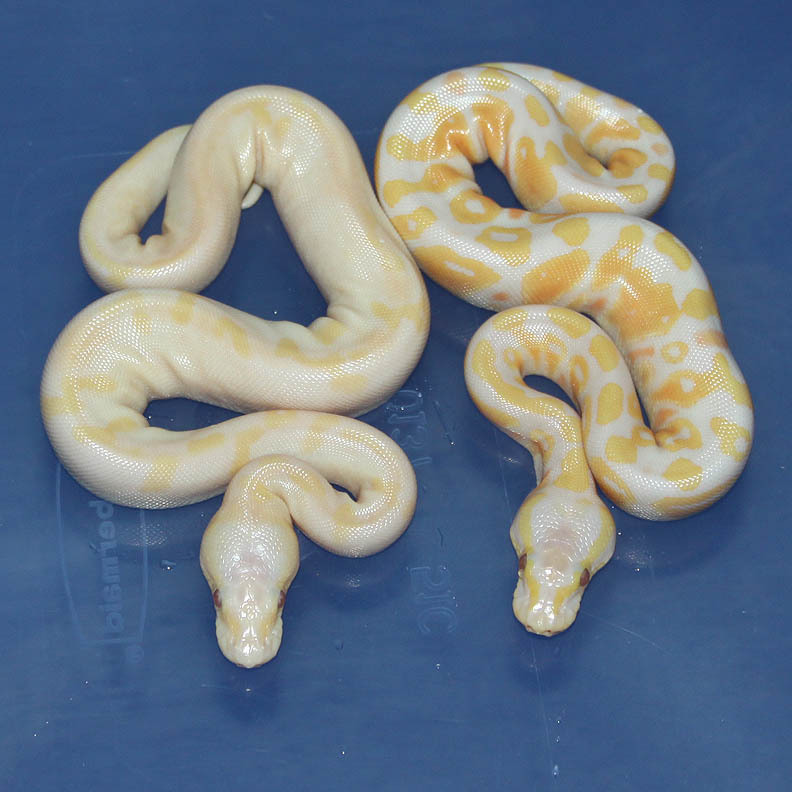 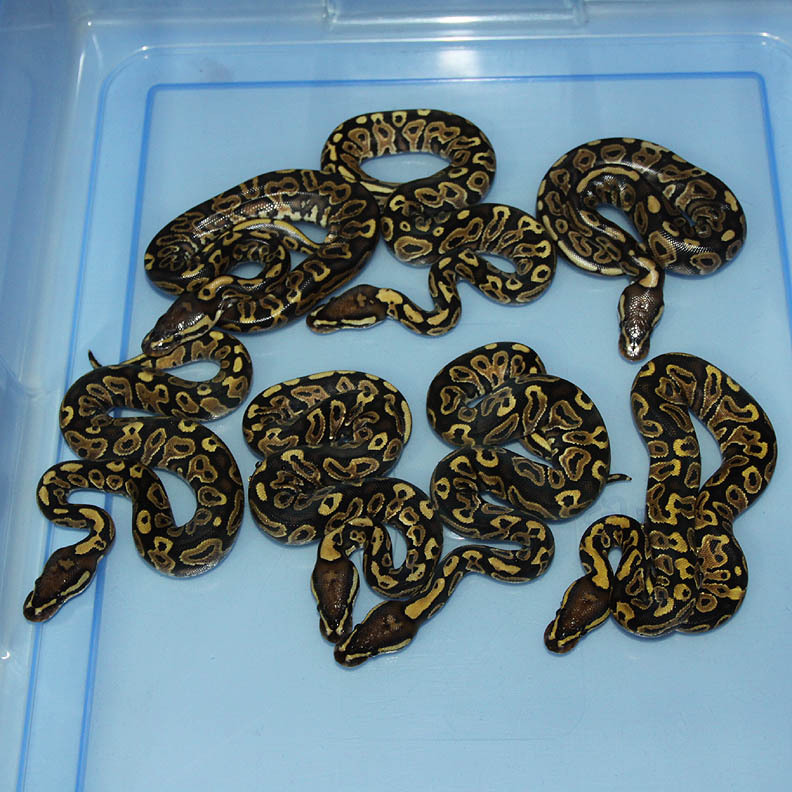 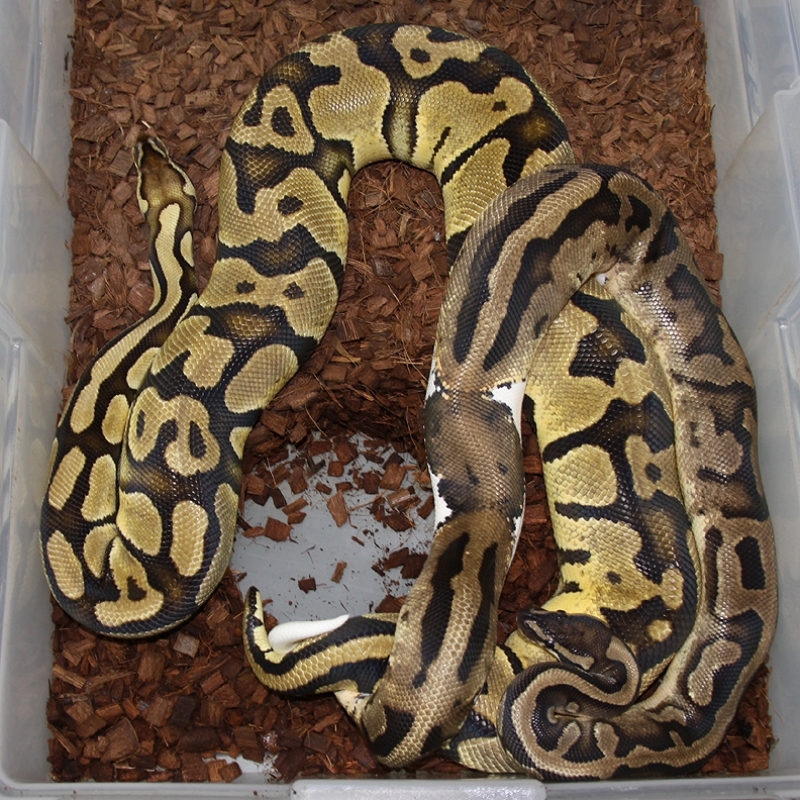 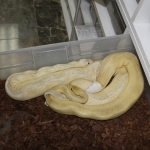 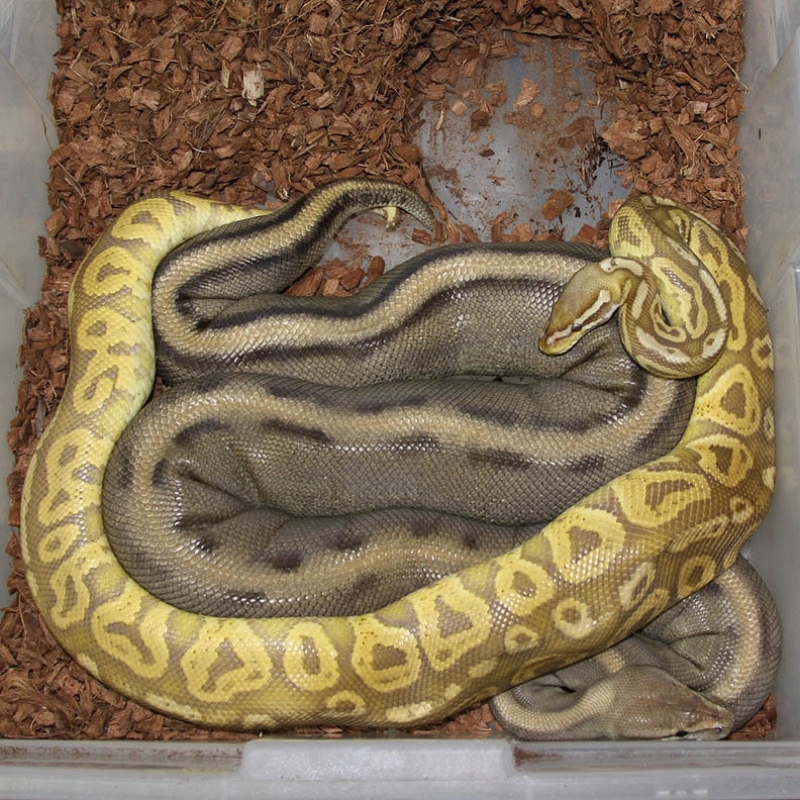 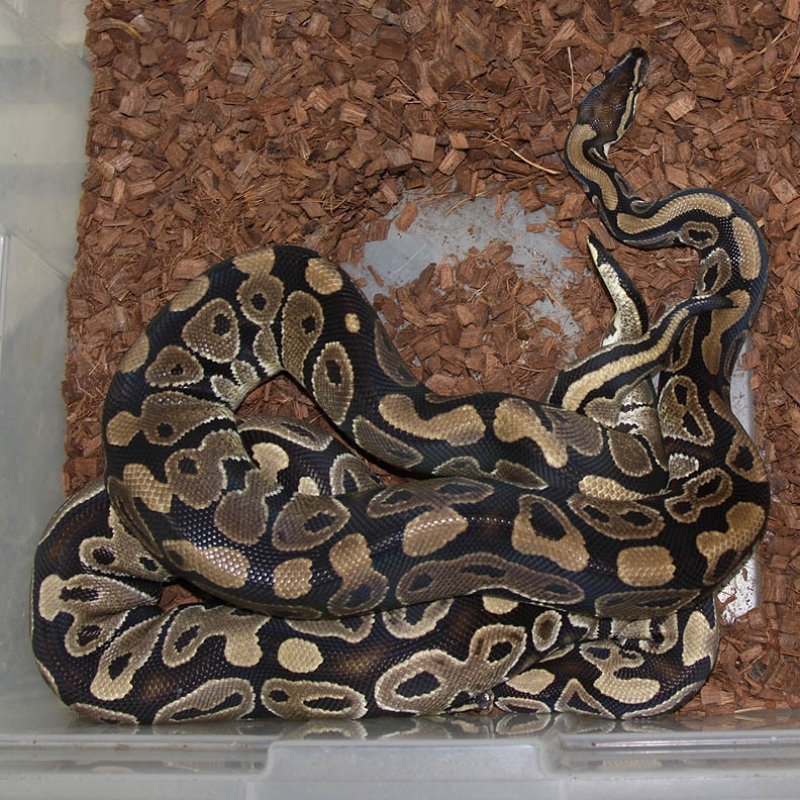 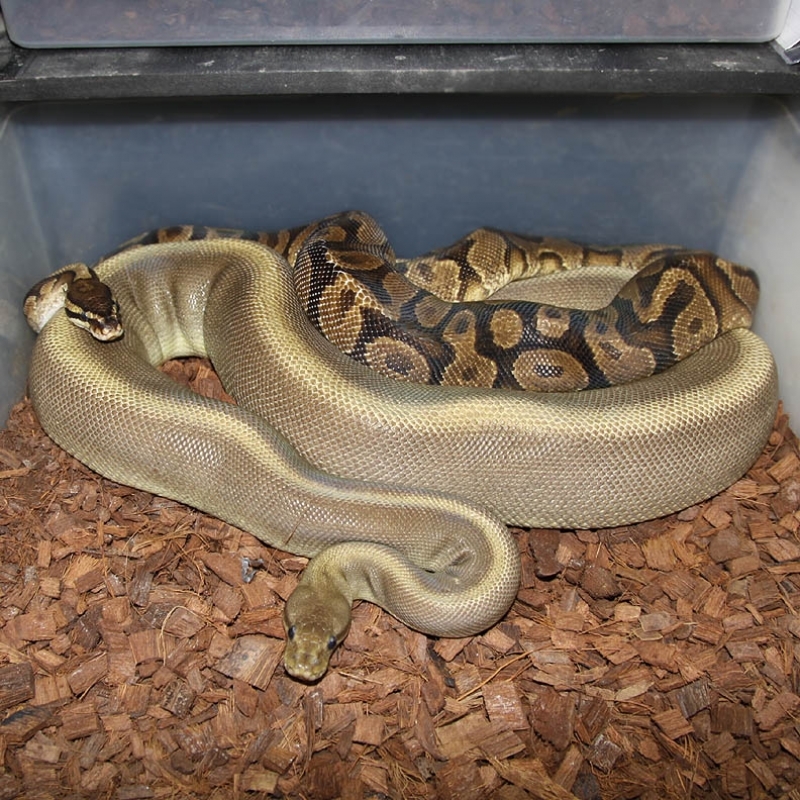 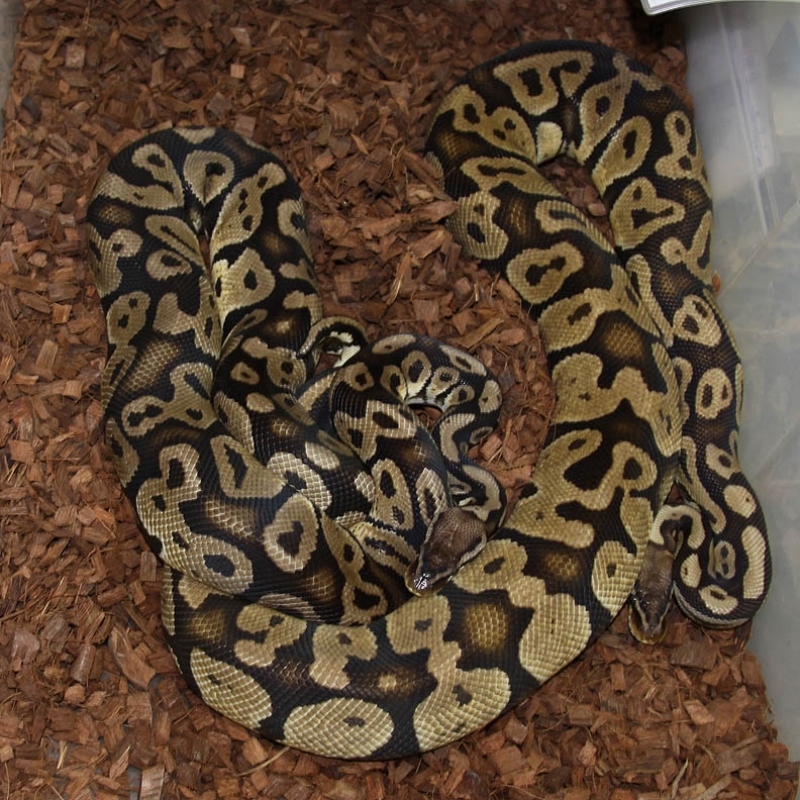 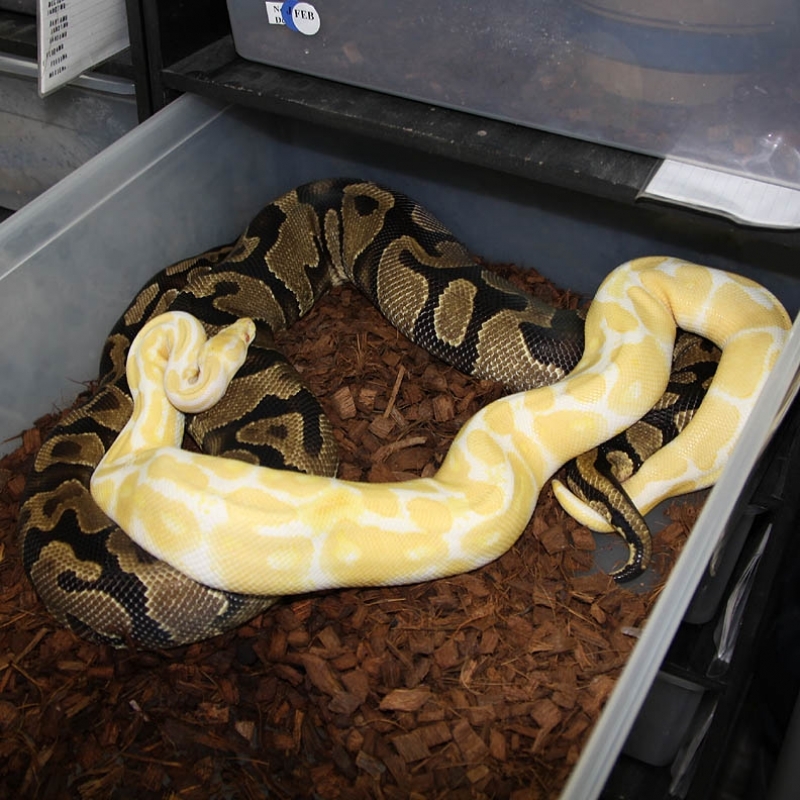 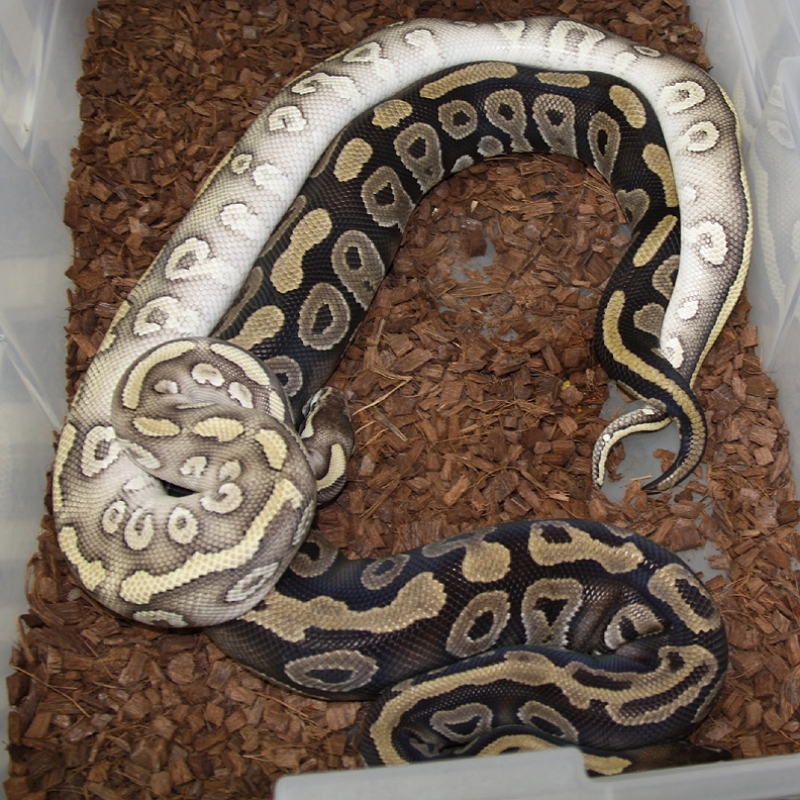 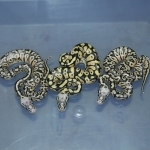 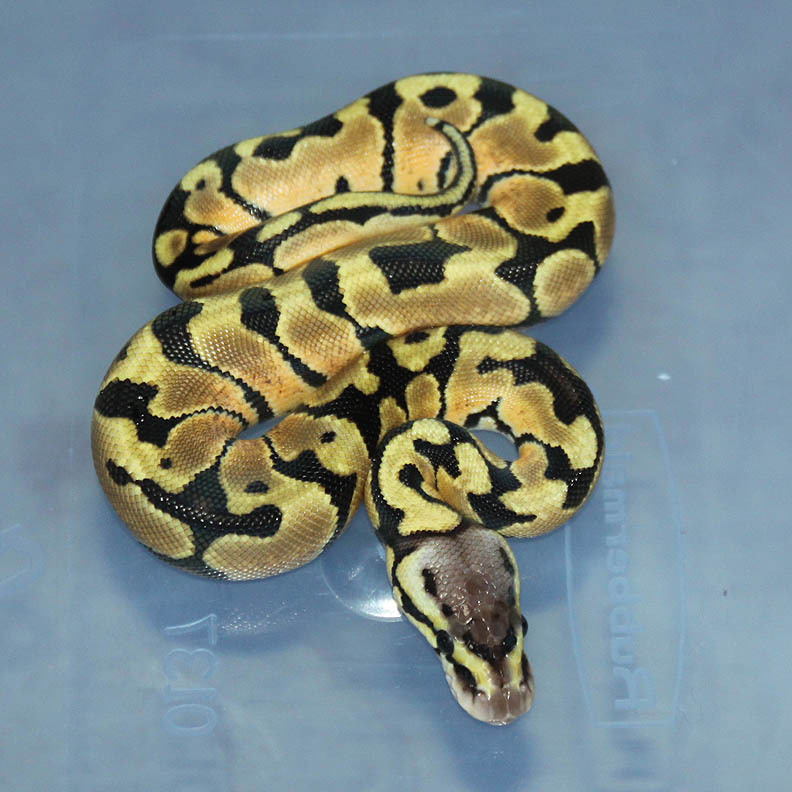 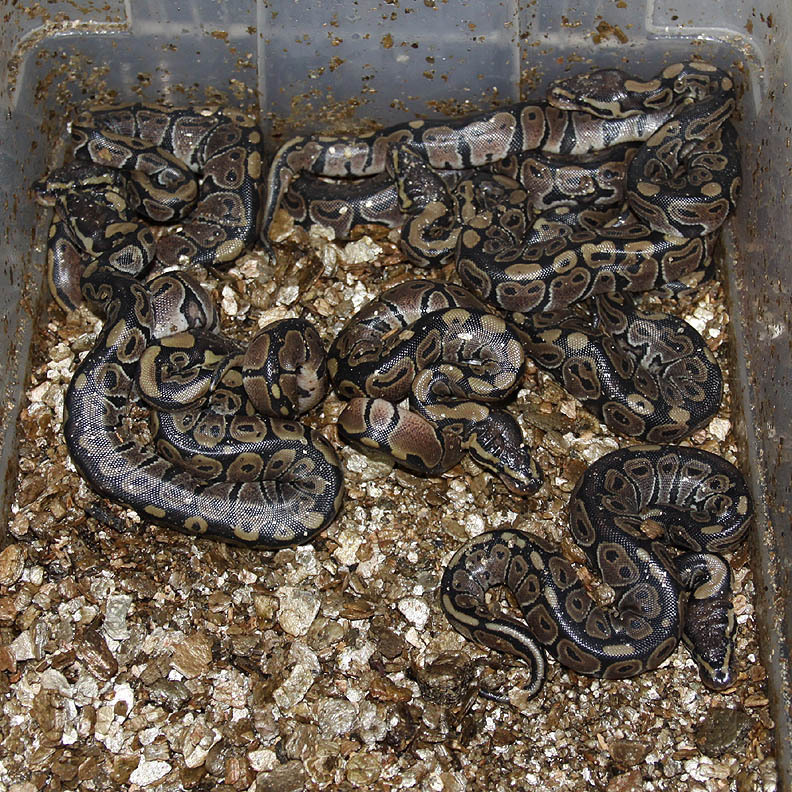 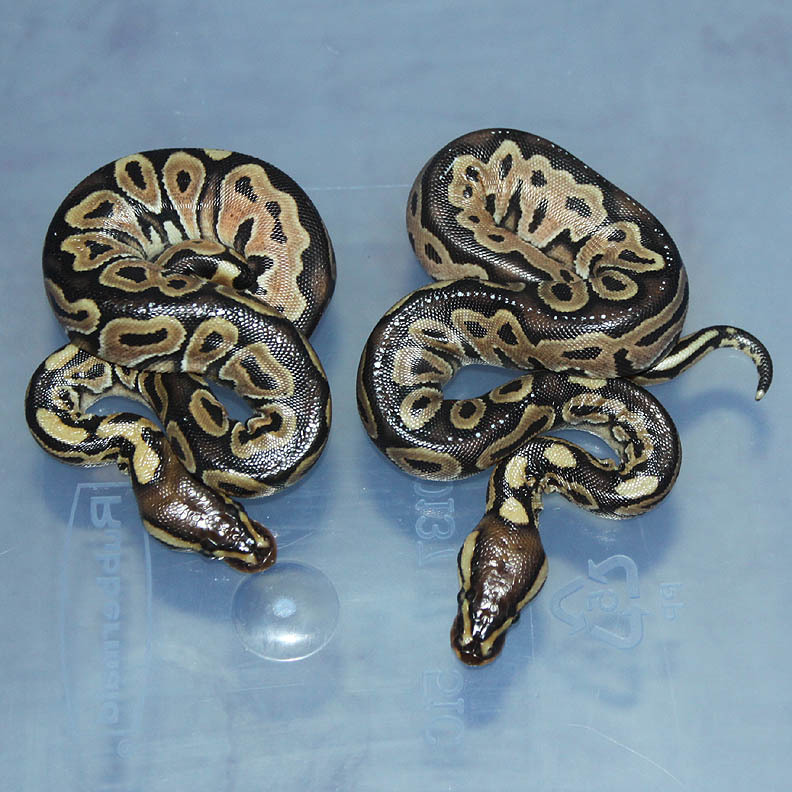 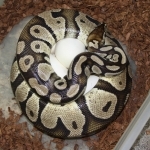 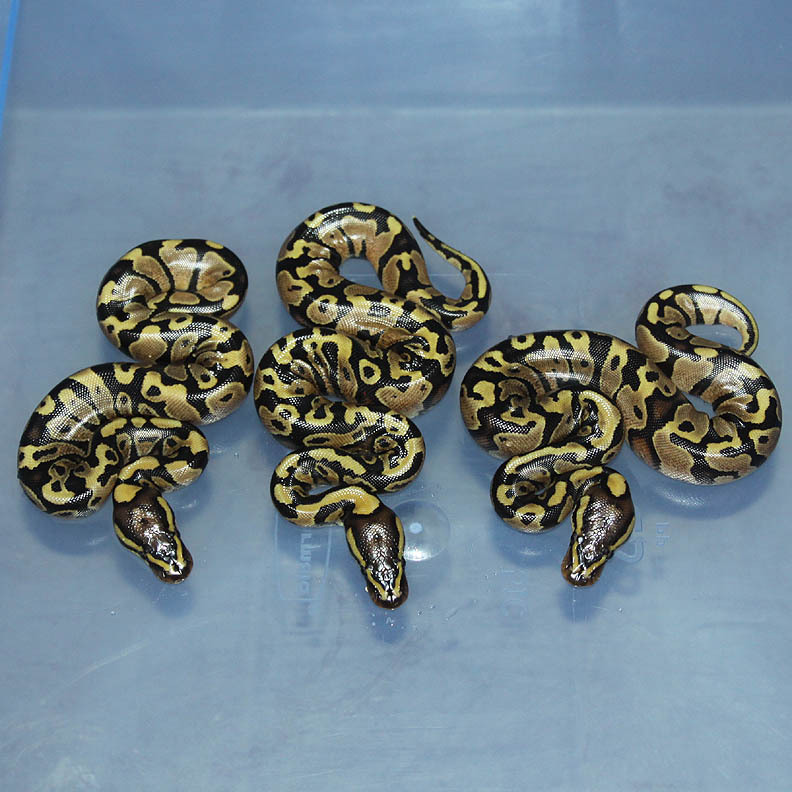 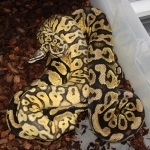 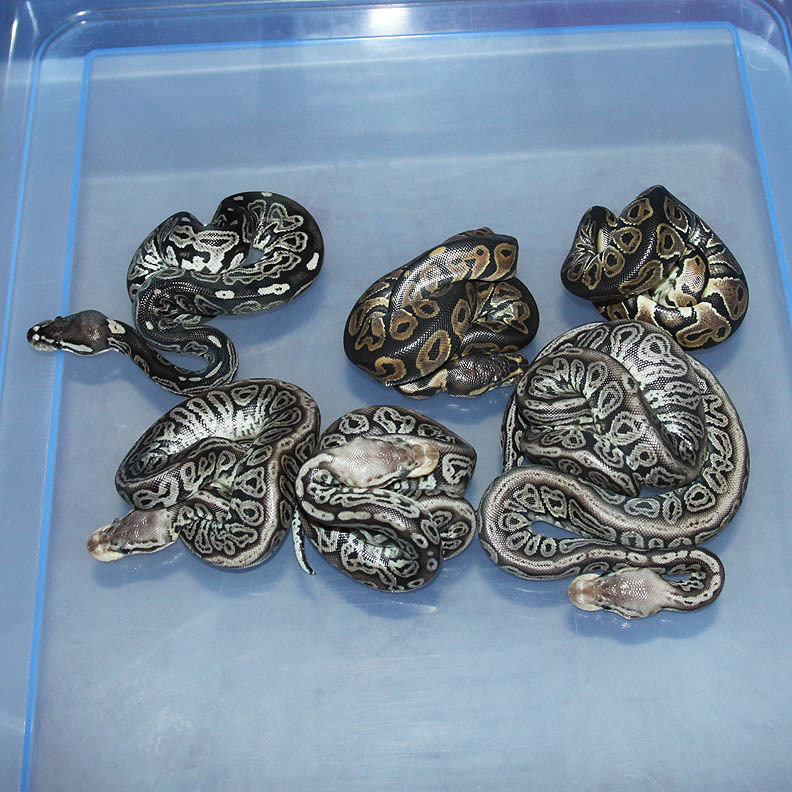 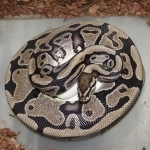 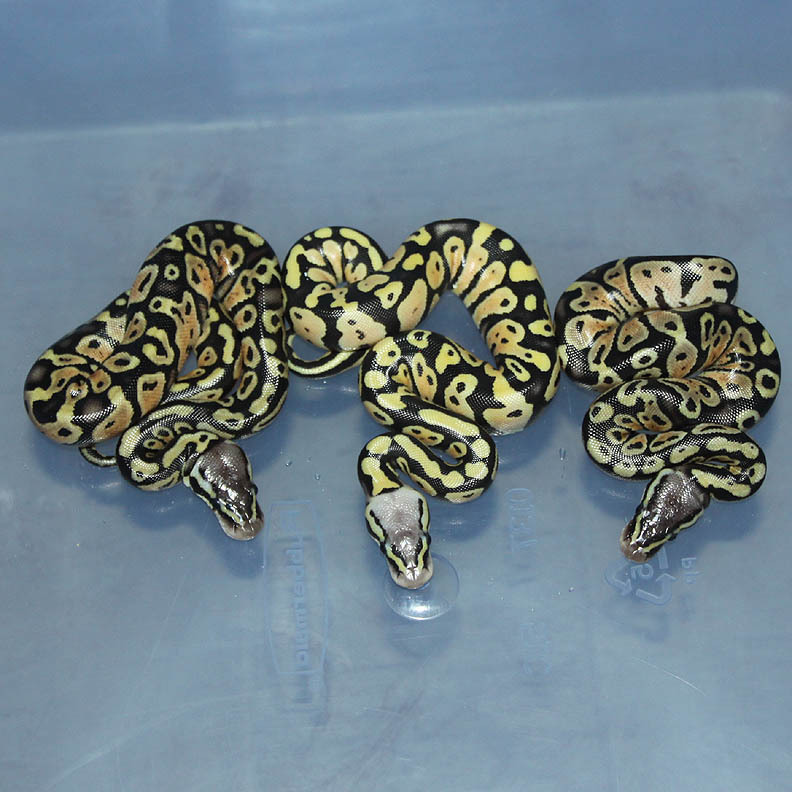 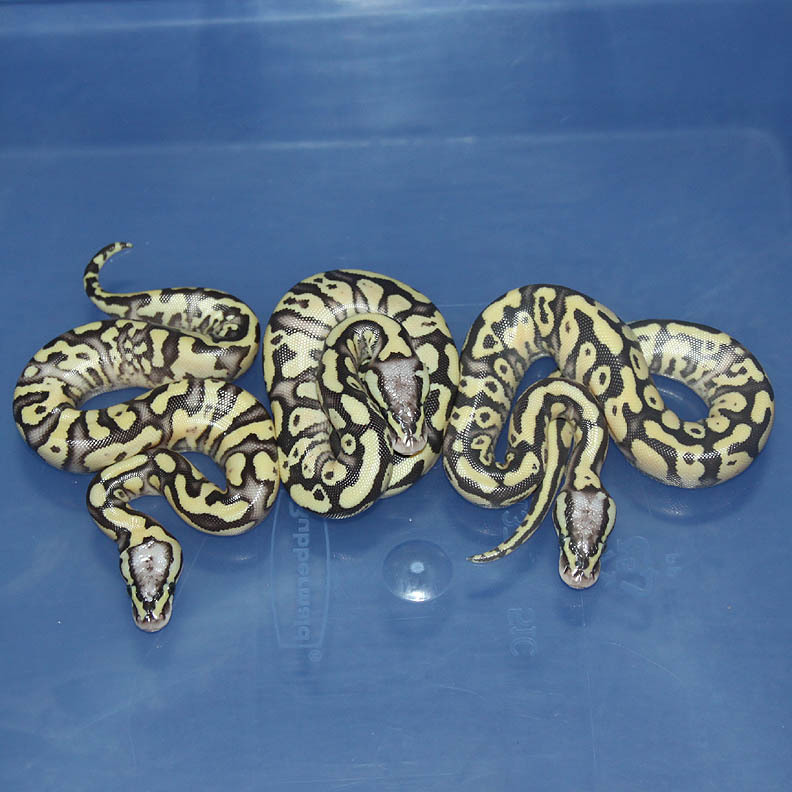 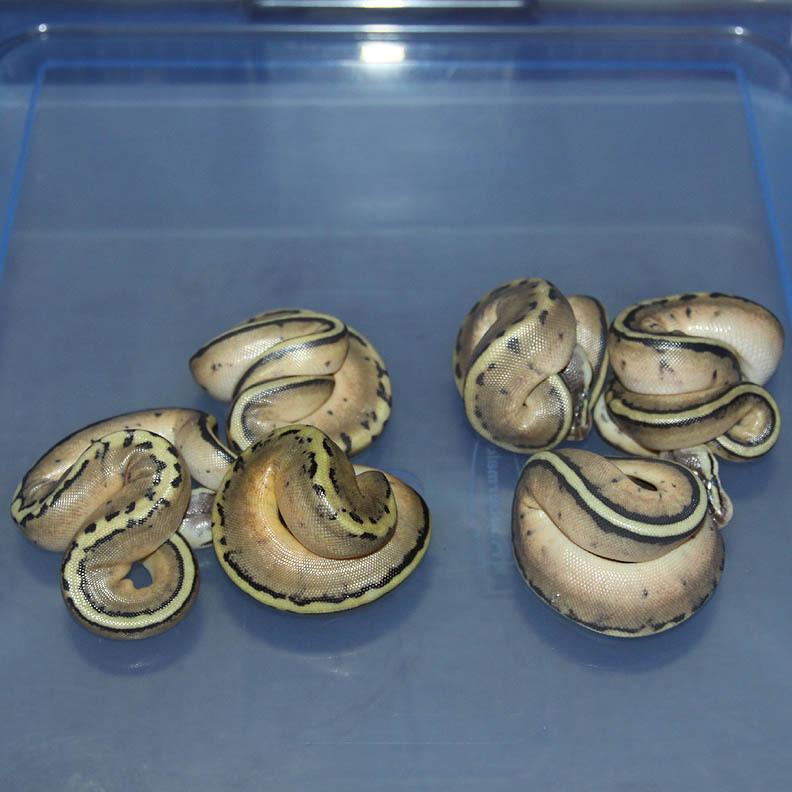 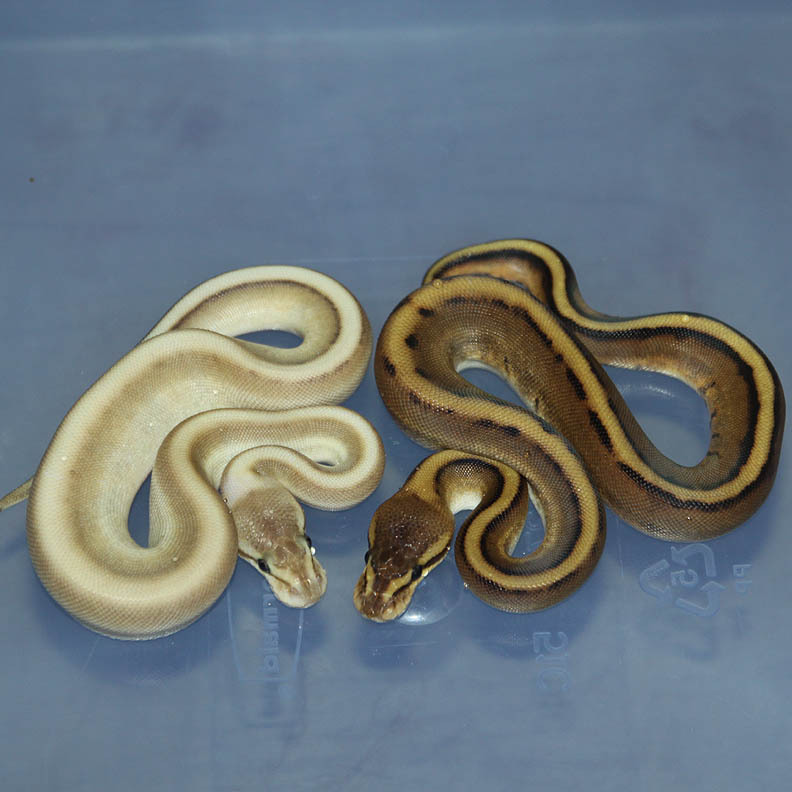 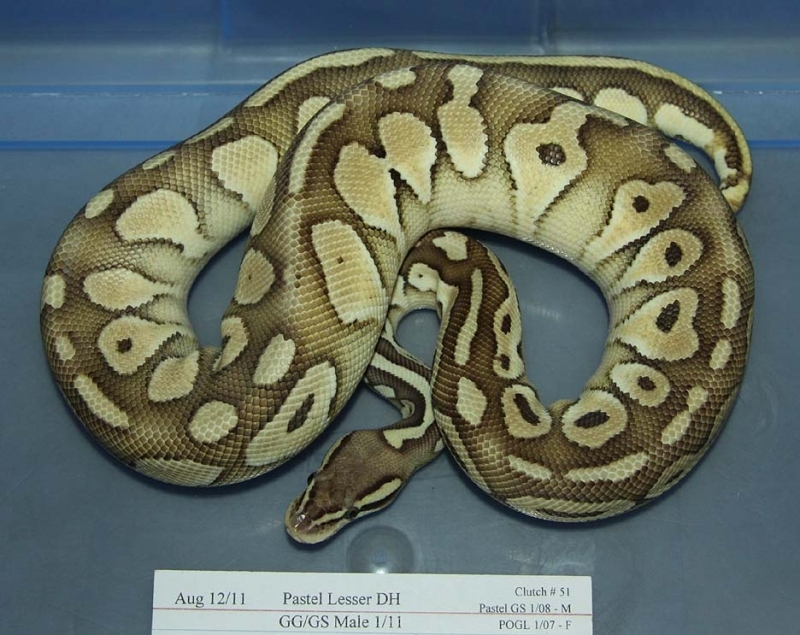 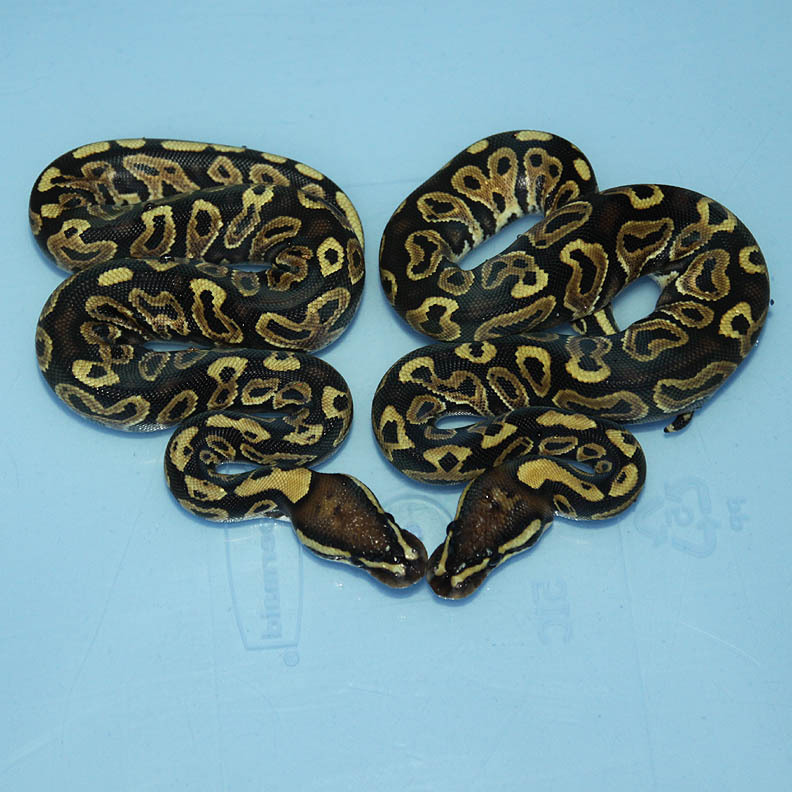 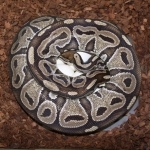 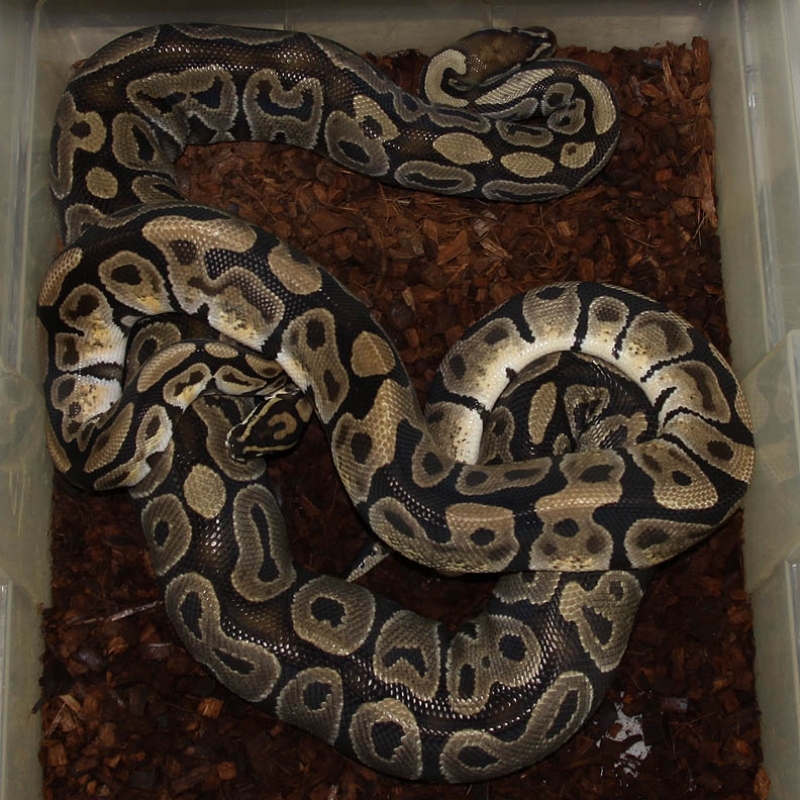 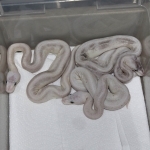 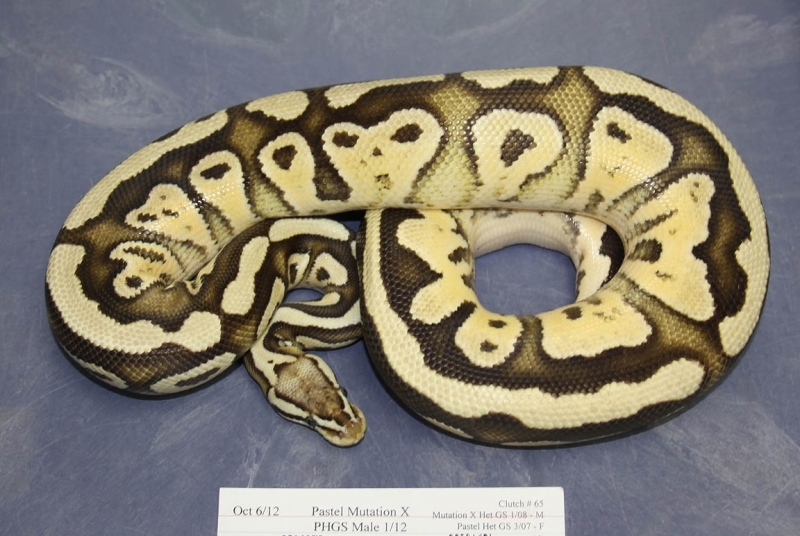 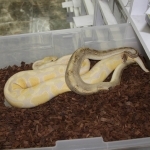 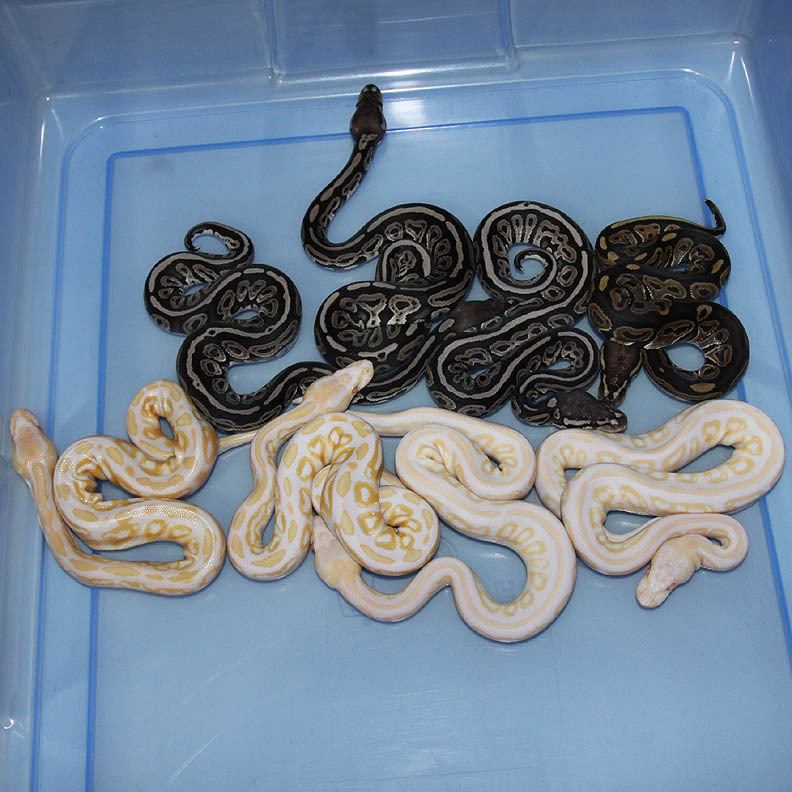 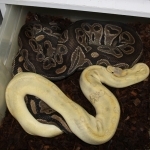 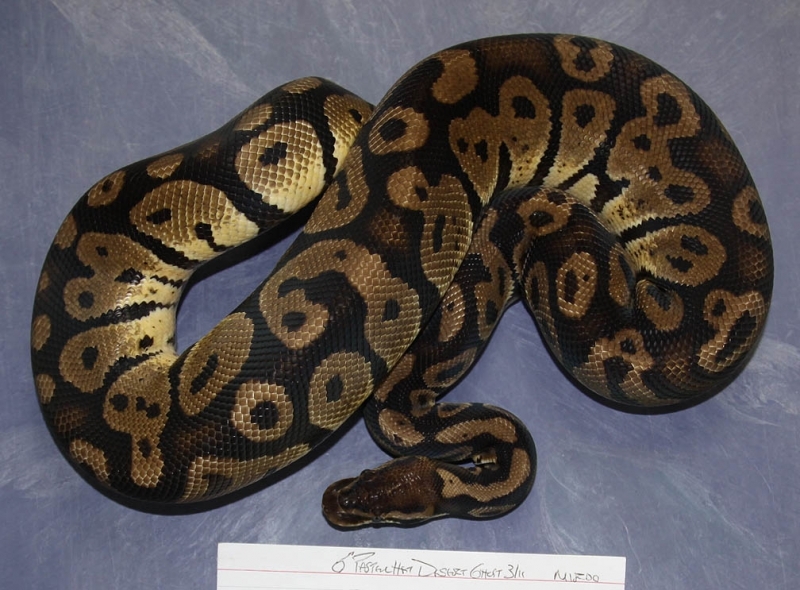 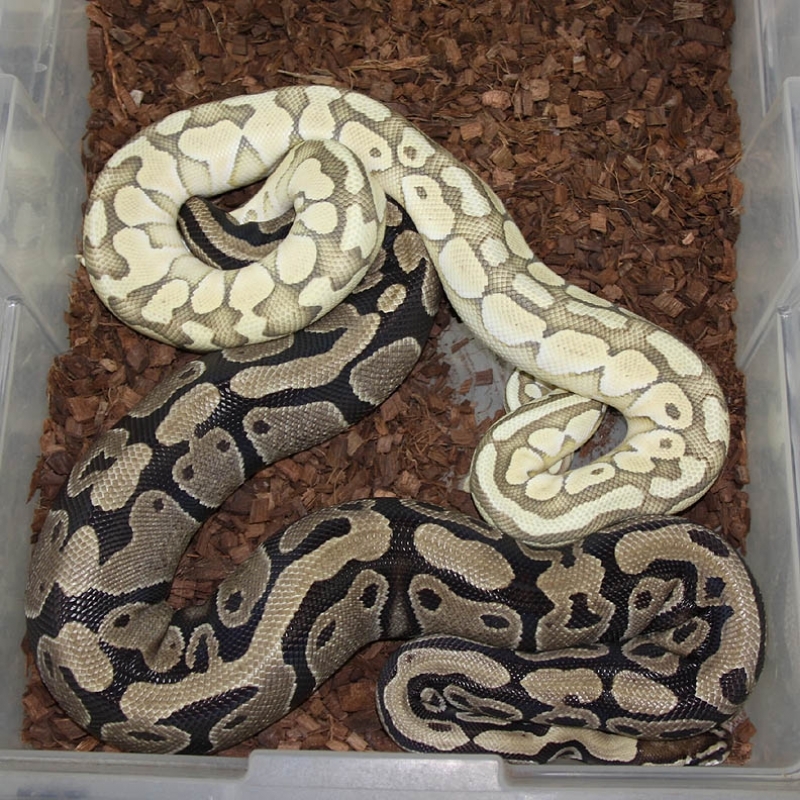 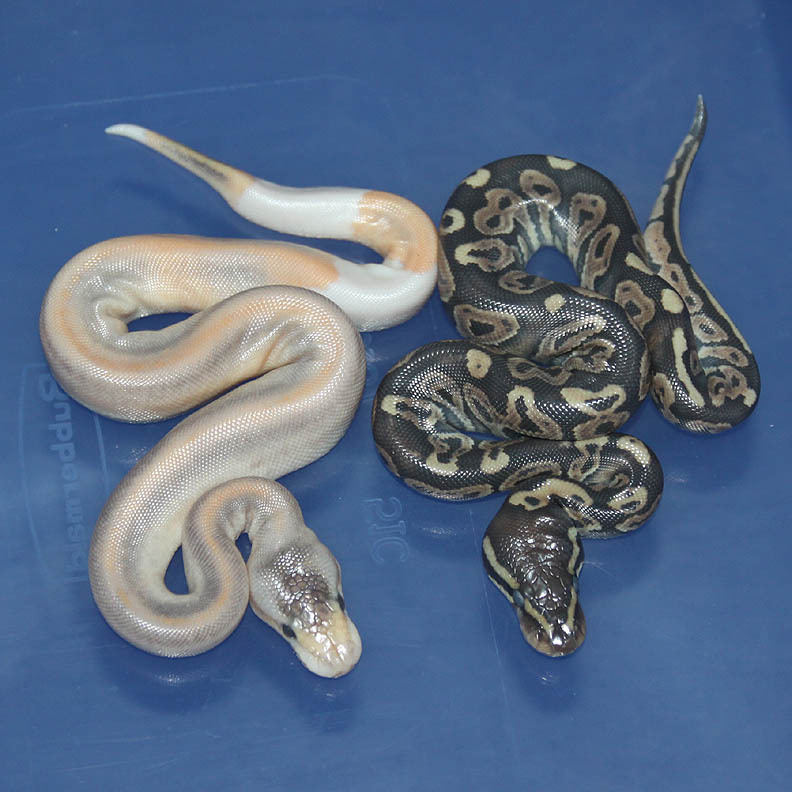 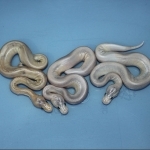 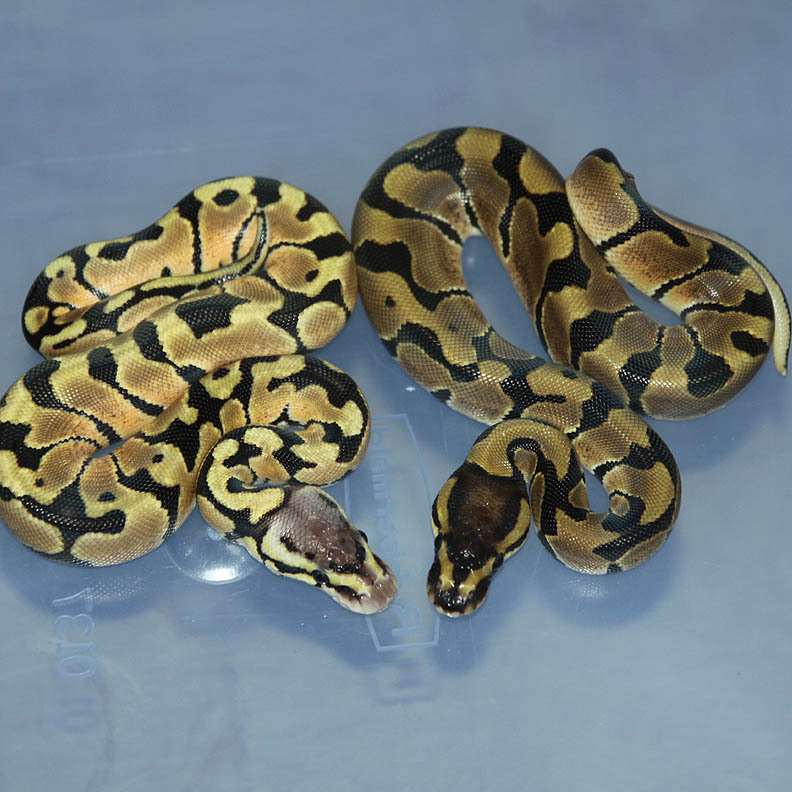 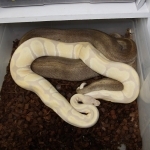 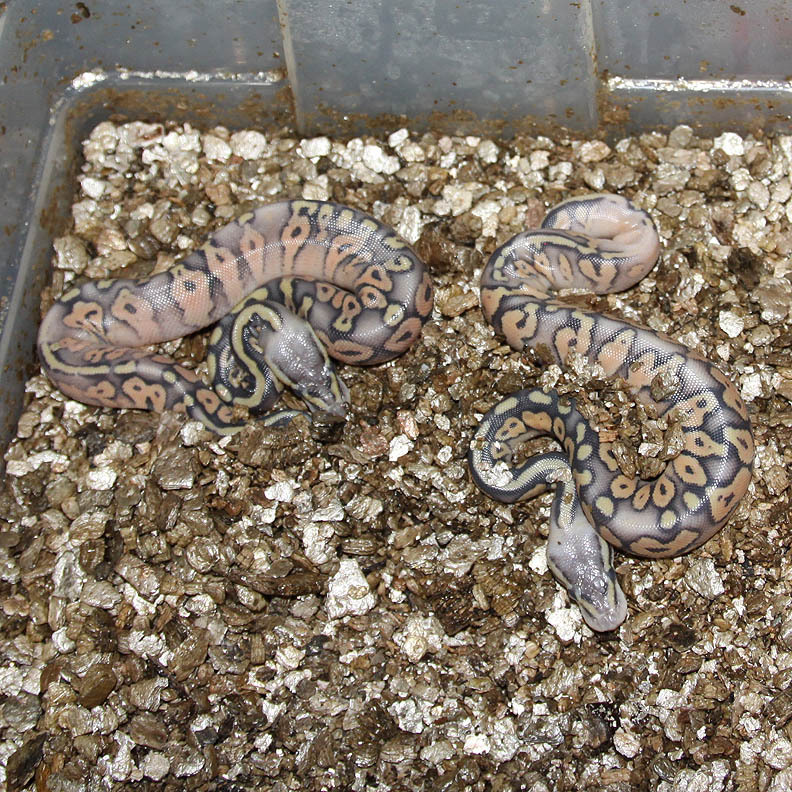 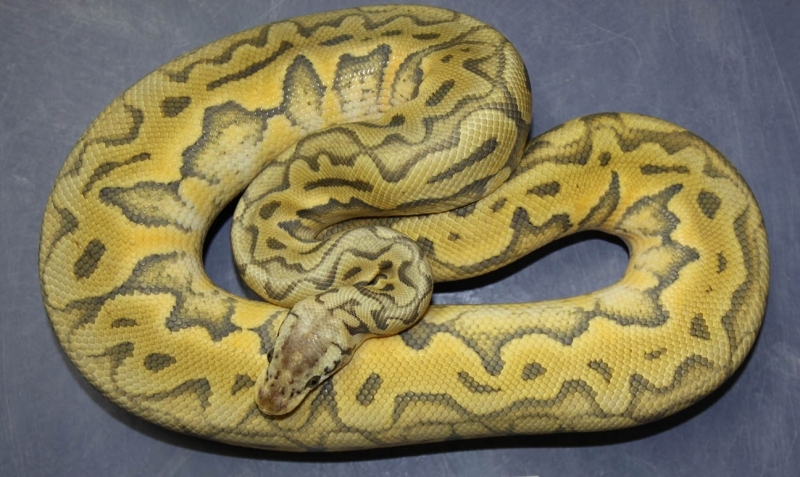 Description: Pastel Het Desert Ghost 3/11 x Pastel Het Desert Ghost 4/11. 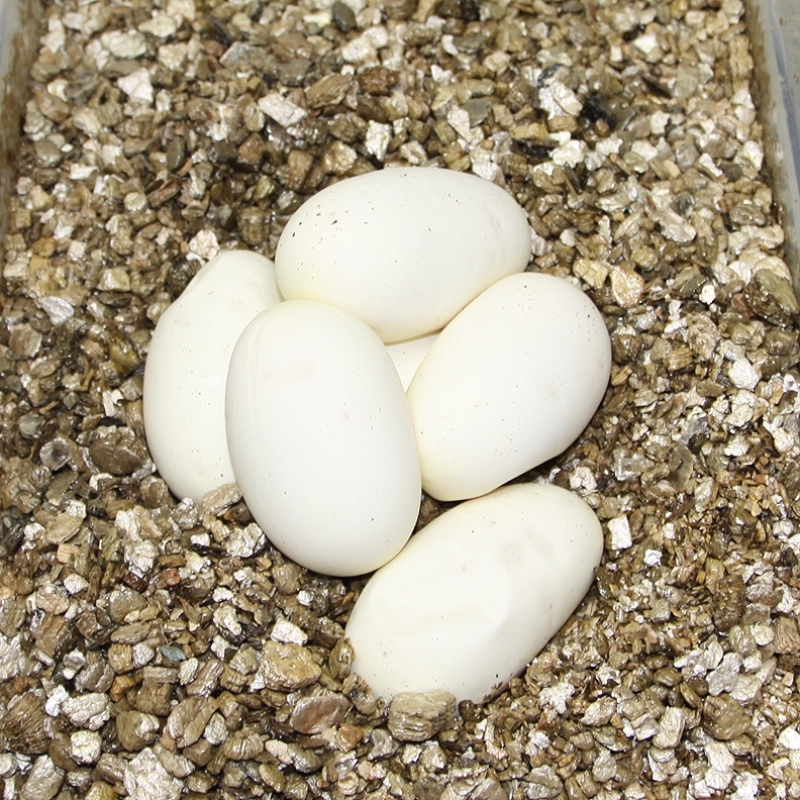 Crappy odds but at least I produced 1 to hold back for myself. 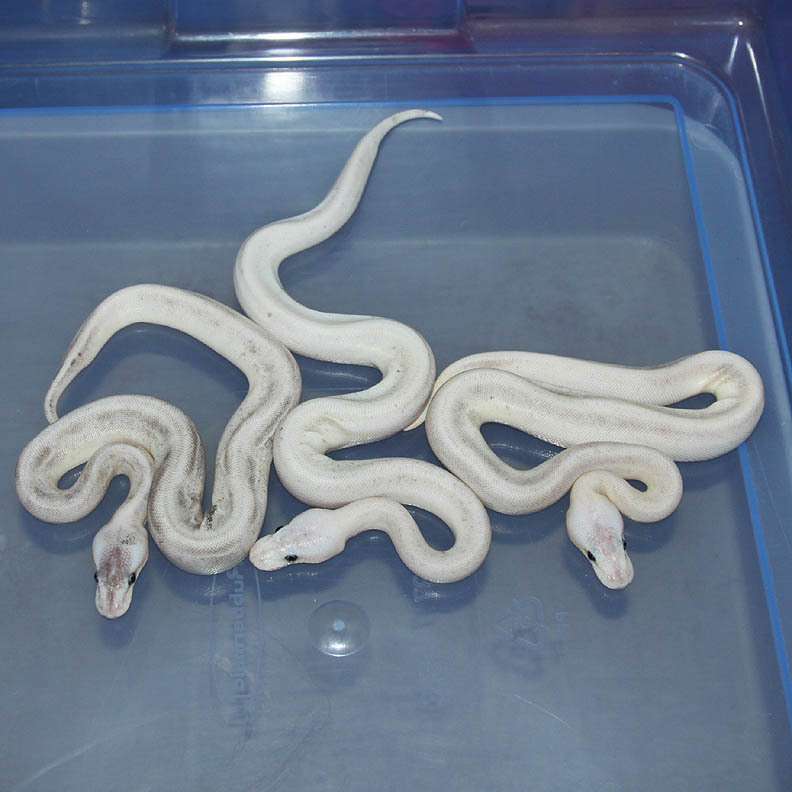 I'll need to go out and buy a Desert Ghost cross male but they are easiest enough to come by now so that shouldn't be a problem. 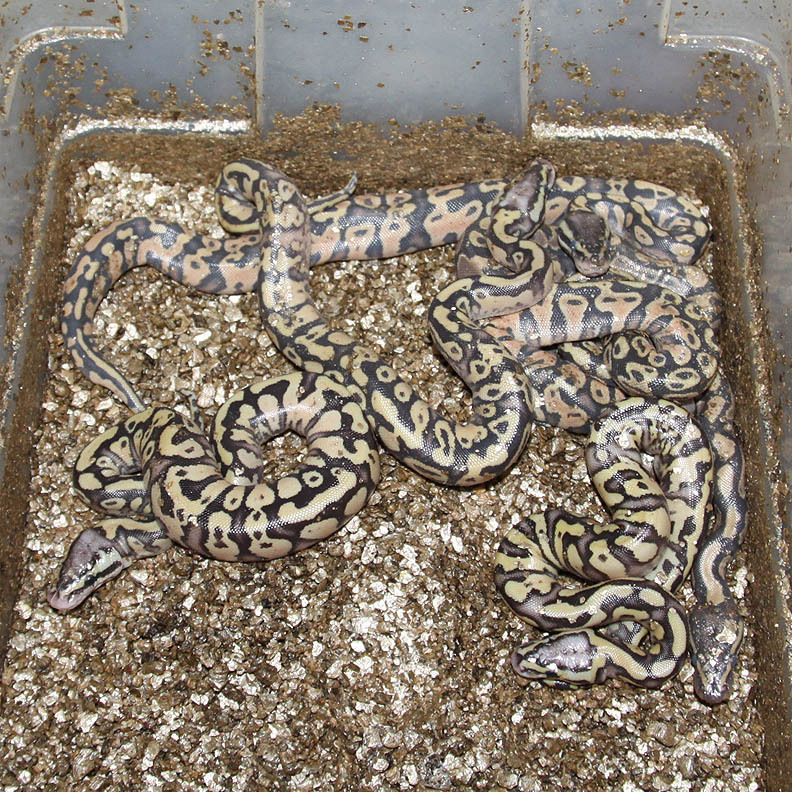 Also, the Super Pastels have a really crazy busy pattern! 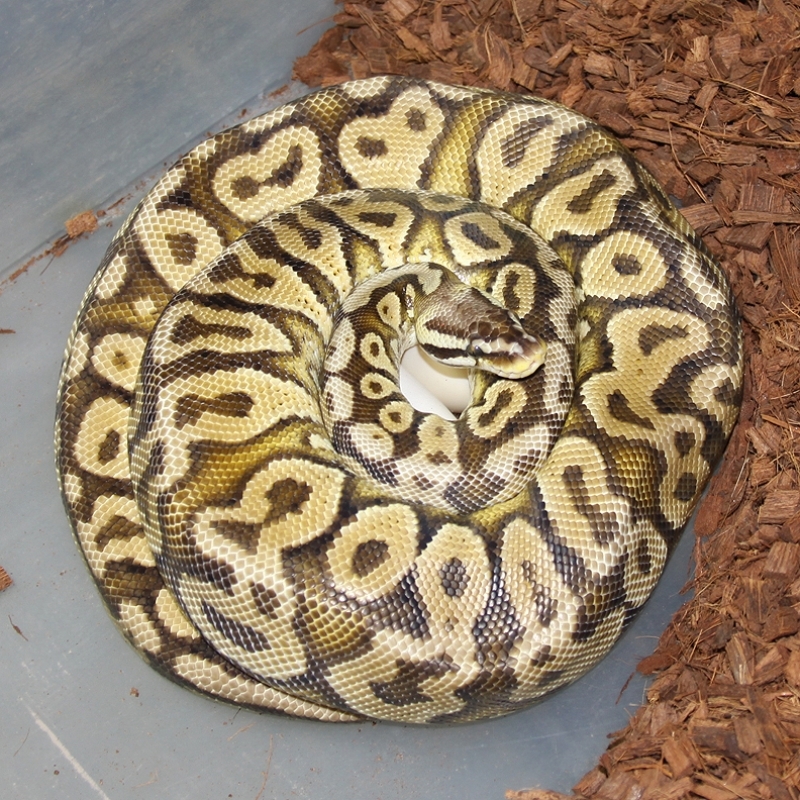 If you are interested in animals from clutch #189 please email or call 519-824-7377. 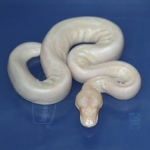 Description: Lesser Ivory 1/12 x Pastel 3/08. 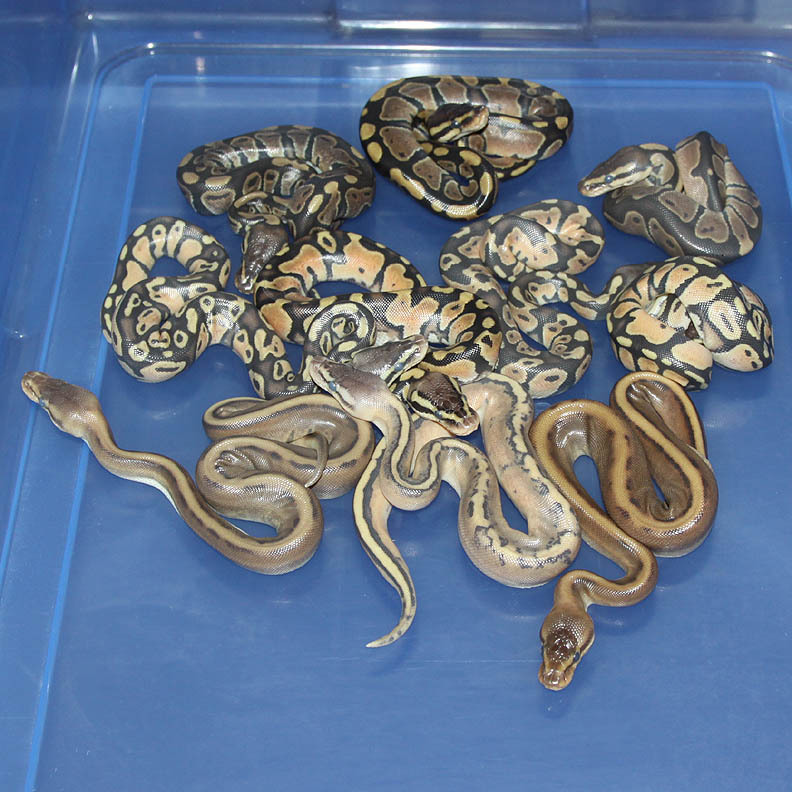 If you are interested in animals from clutch #190 please email or call 519-824-7377. 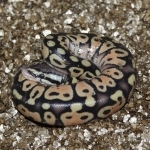 Description: Different 1/10 x Het RA 5/09. 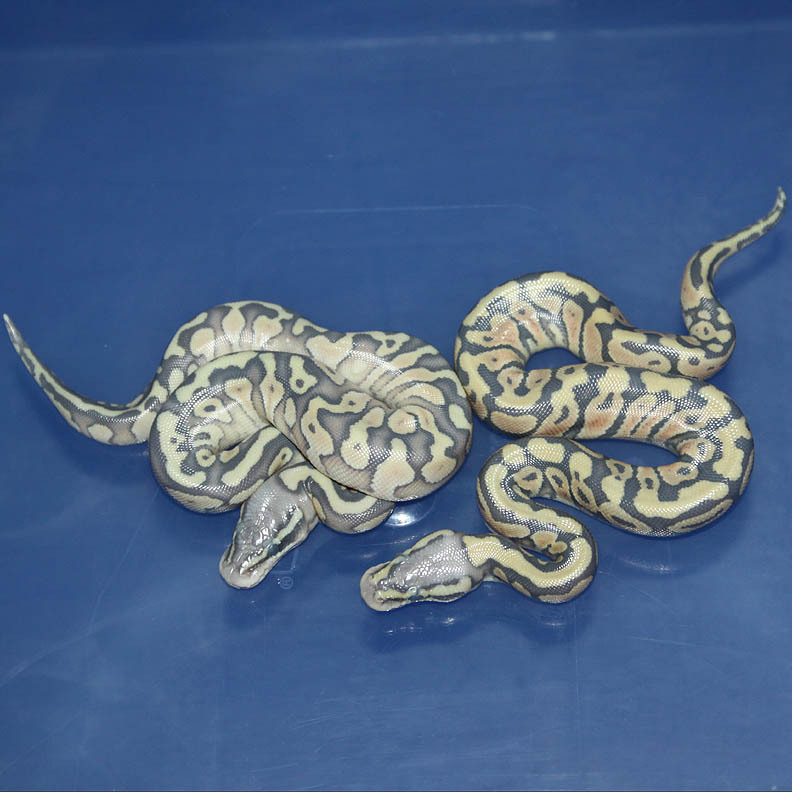 If you are interested in animals from clutch #191 please email or call 519-824-7377. 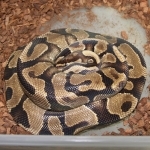 Description: Mutation X Het Red Axanthic 1/11 x Mutation X Het Red Axanthic 1/12. 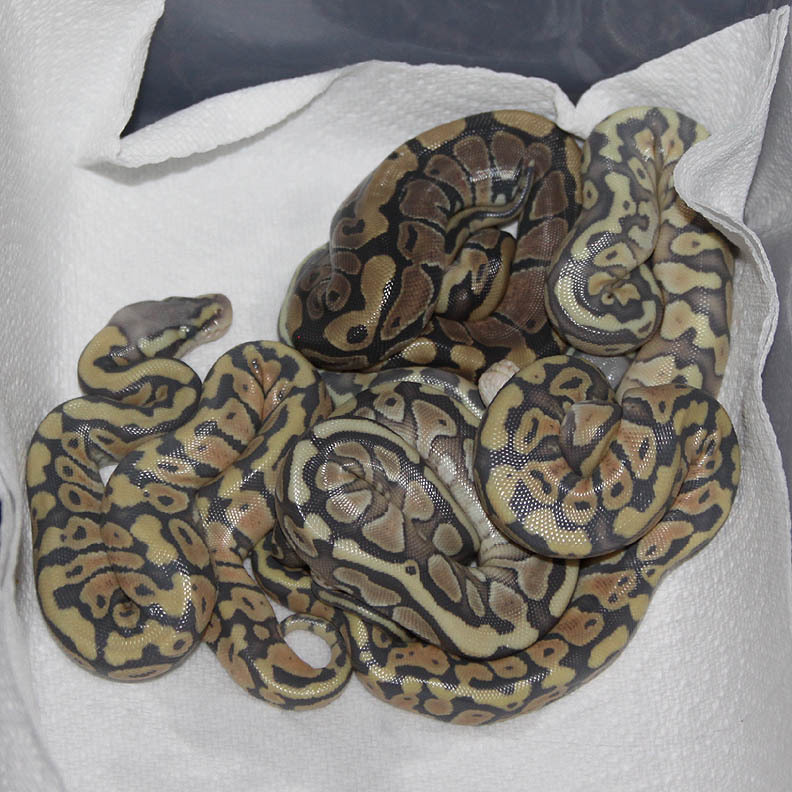 If you are interested in animals from clutch #192 please email or call 519-824-7377. 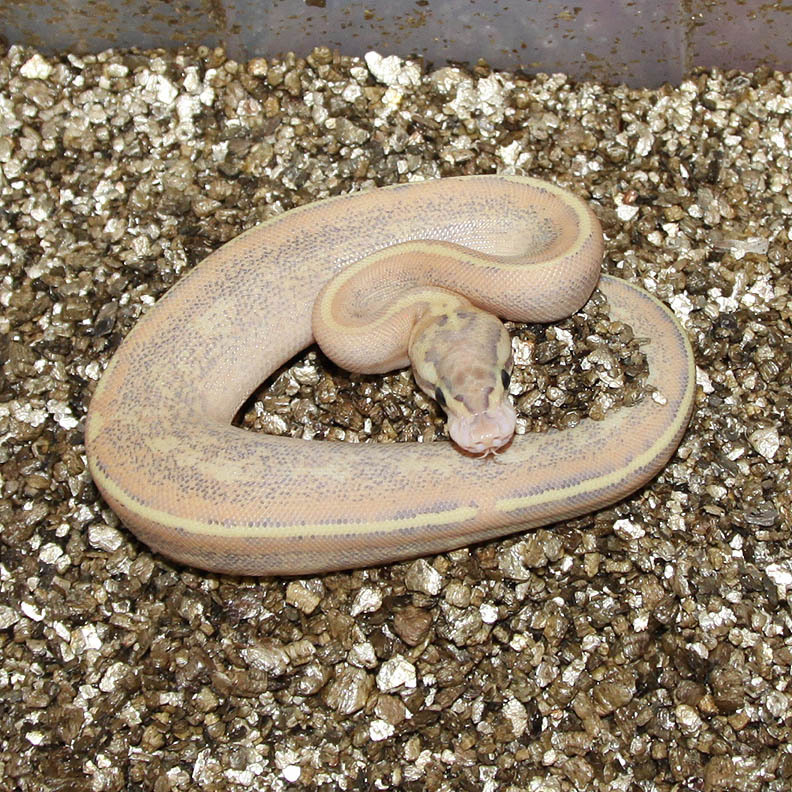 Description: Funky YB 1/12 x Red Axanthic Genetic Stripe (RAGS) 1/12. 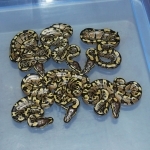 If you are interested in animals from clutch #193 please email or call 519-824-7377. 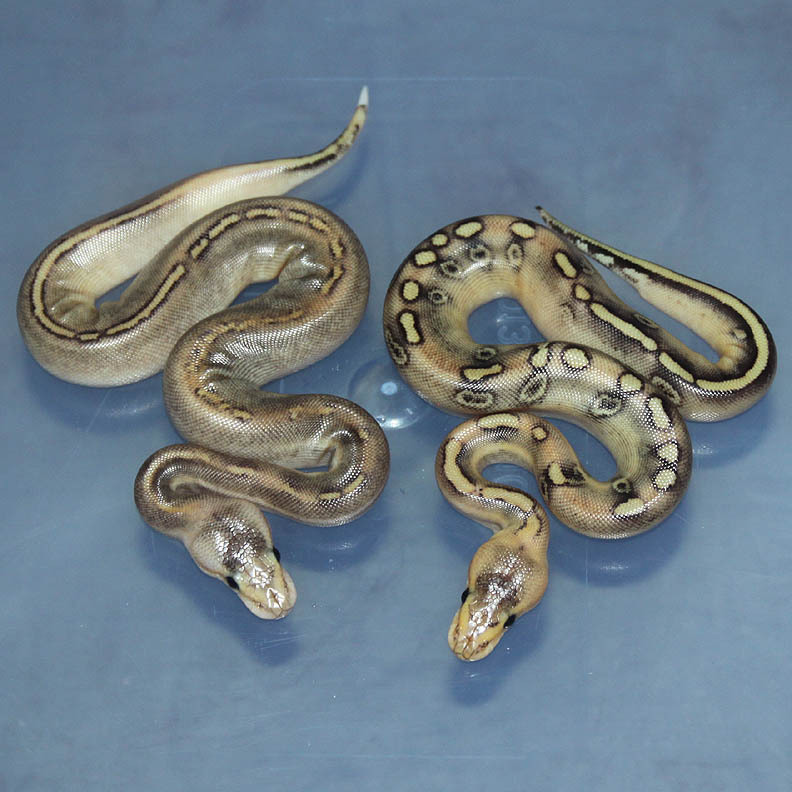 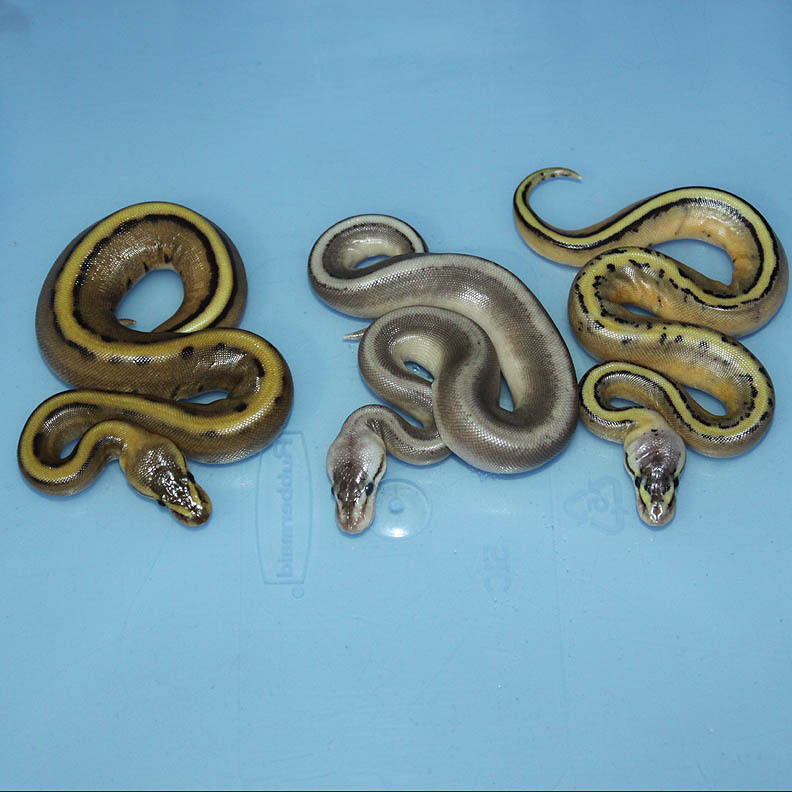 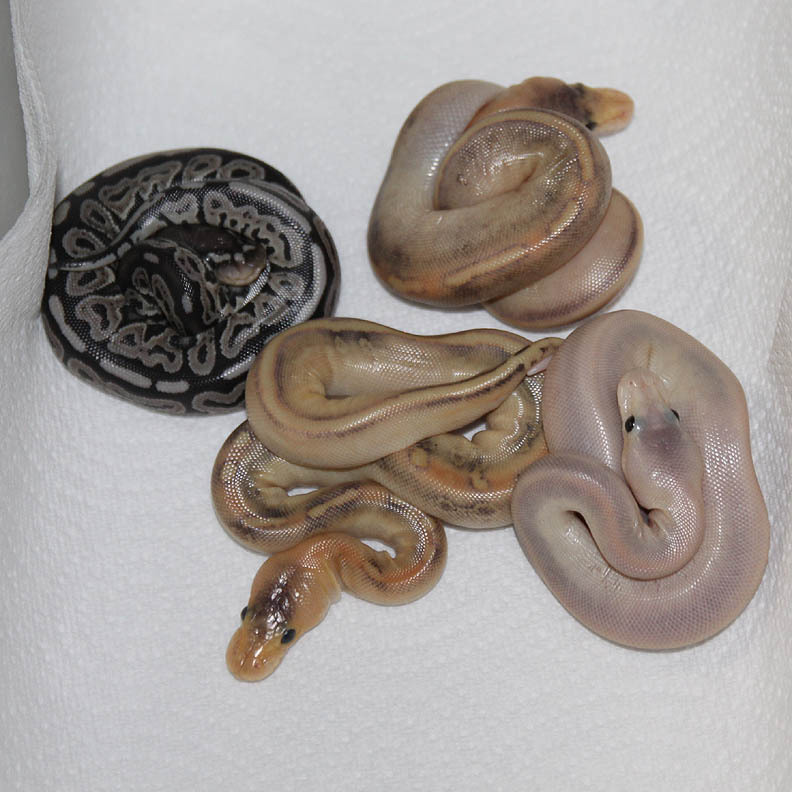 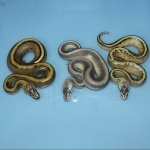 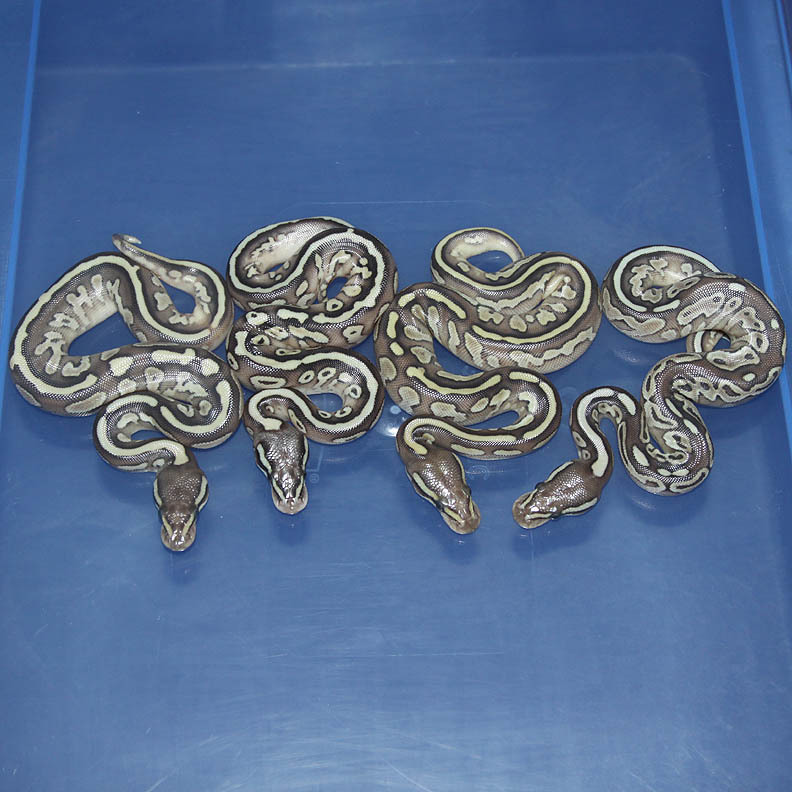 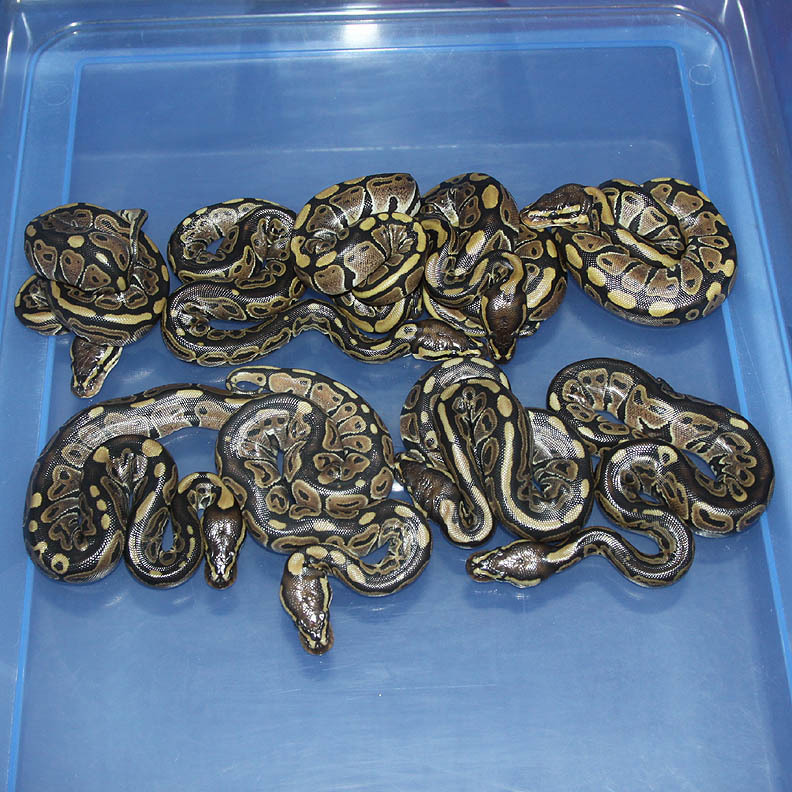 Description: Red Axanthic Pinstripe Champagne 2/12 x Pinstripe Champagne Het Red Axanthic 2/10. 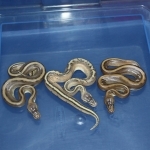 If you are interested in animals from clutch #194 please email or call 519-824-7377. 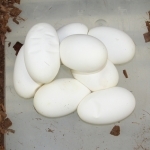 Description: Lesser Ivory 3/12 x Lesser 5/07. 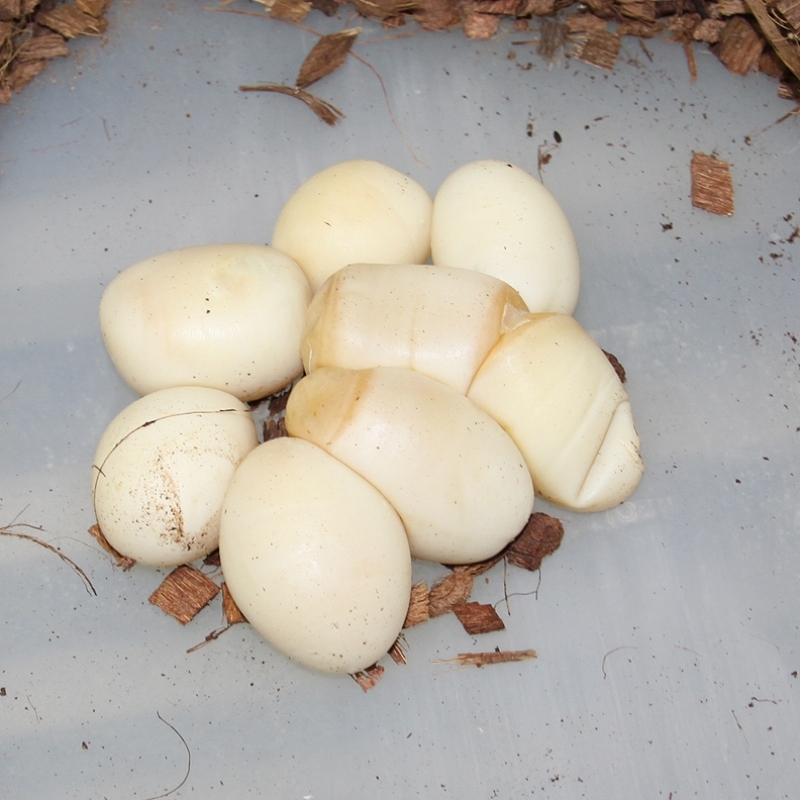 This clutch should hopefully produce more Super Lesser YB's. 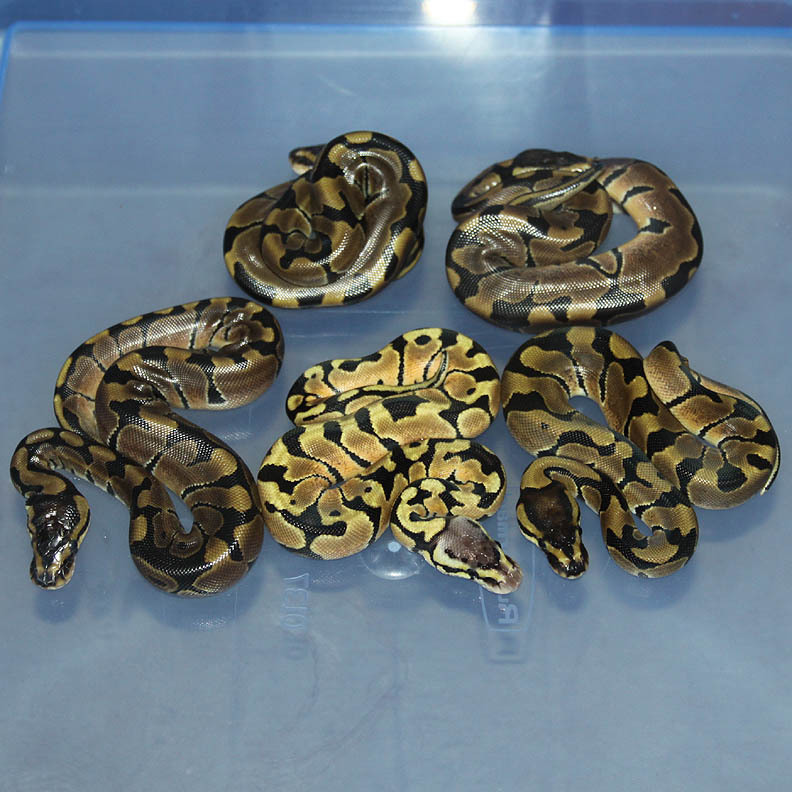 If you are interested in animals from clutch #195 please email or call 519-824-7377. 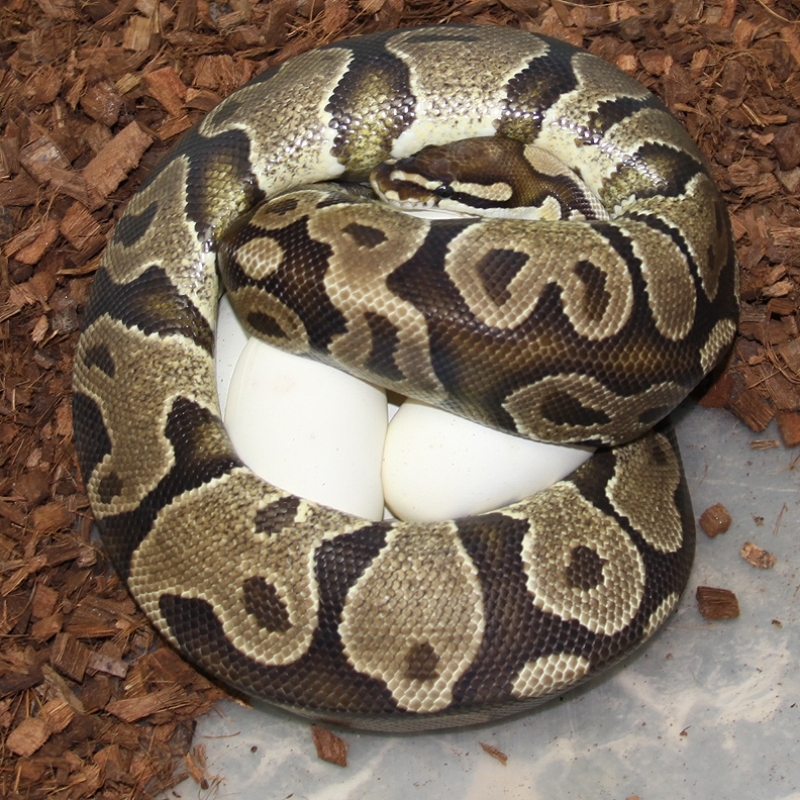 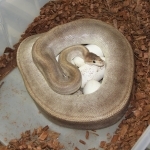 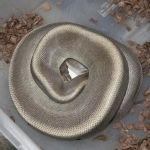 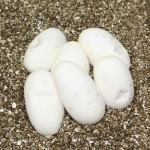 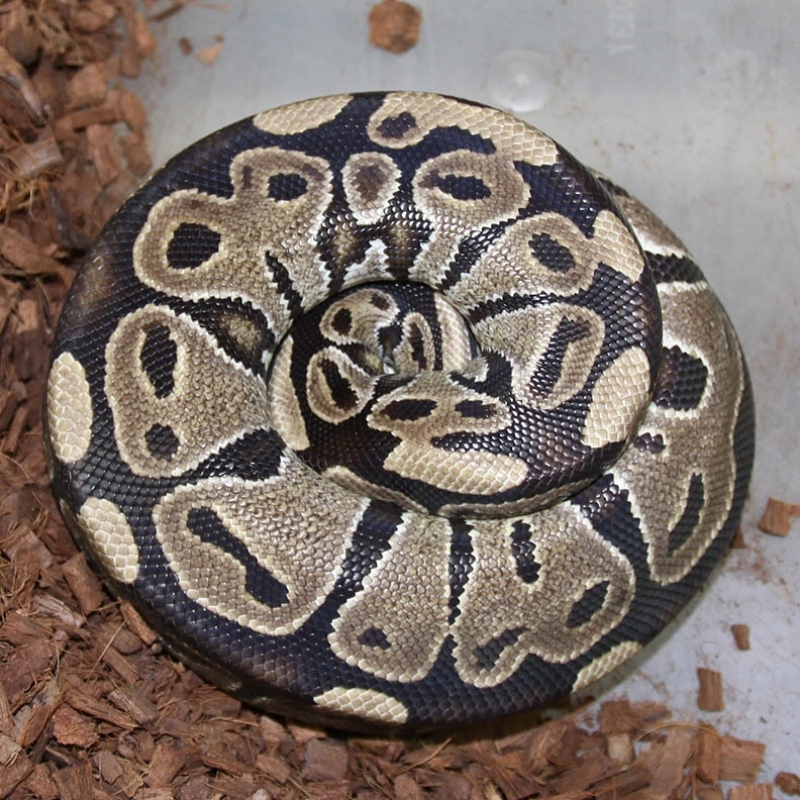 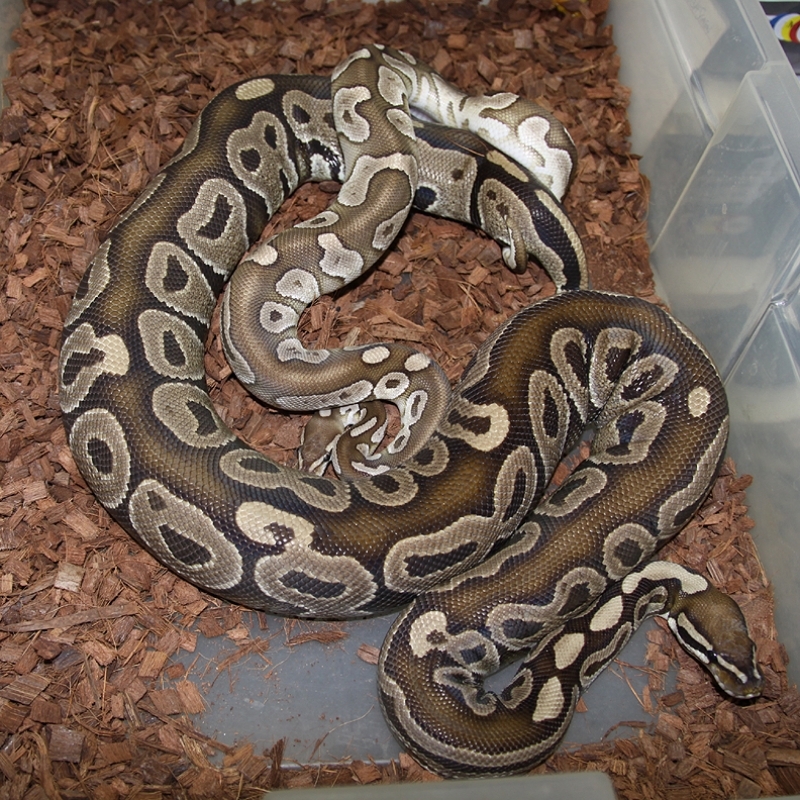 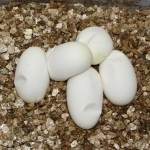 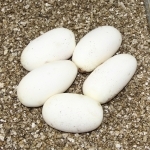 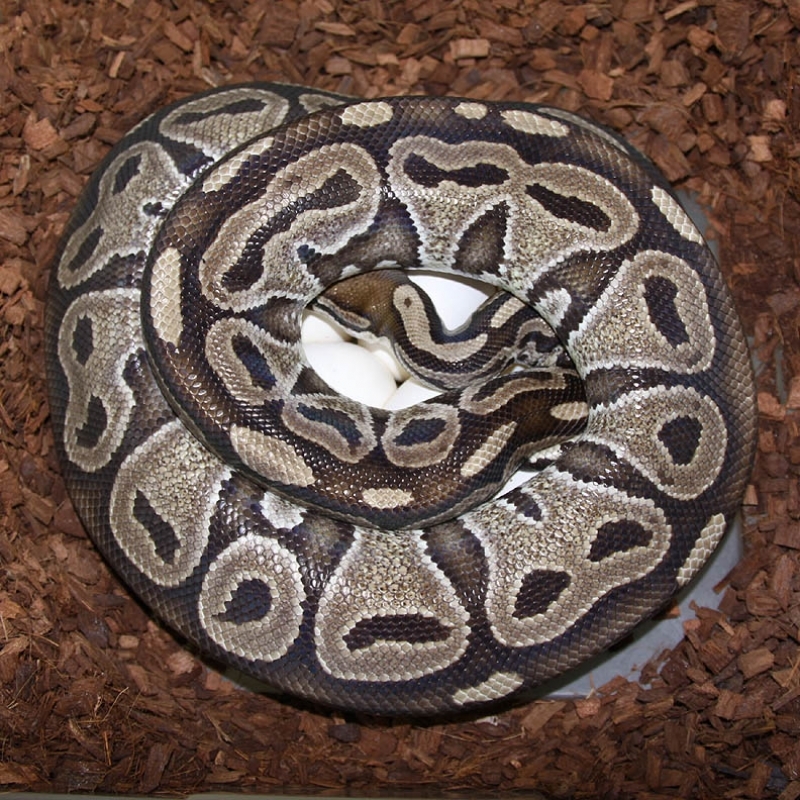 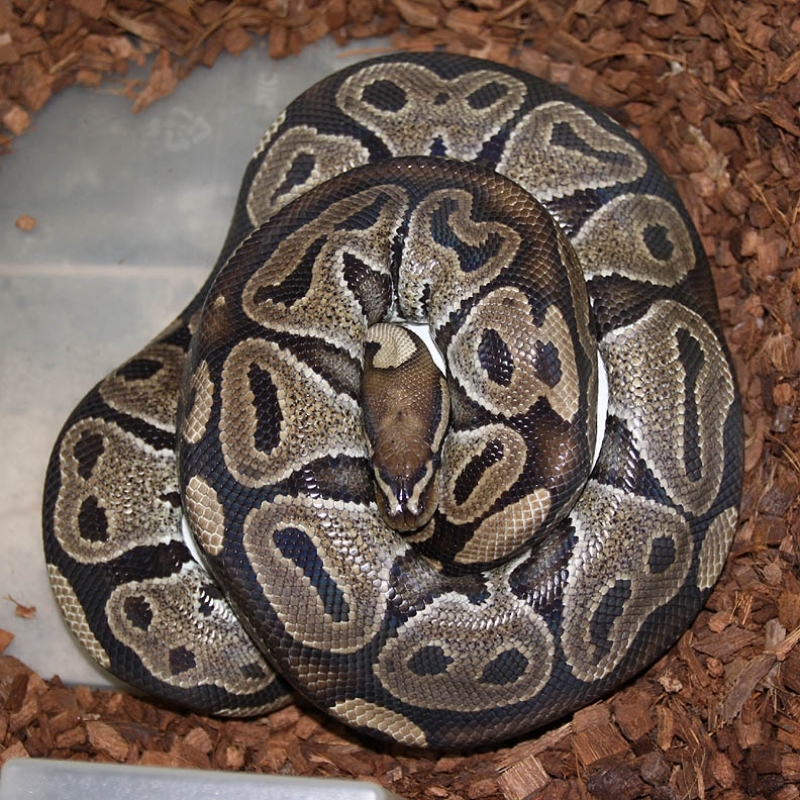 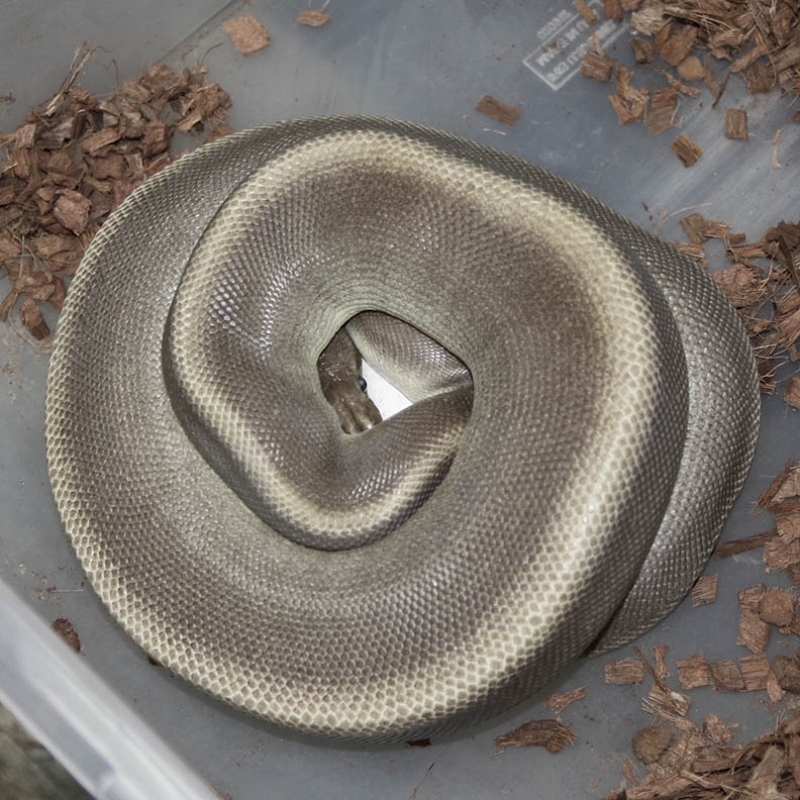 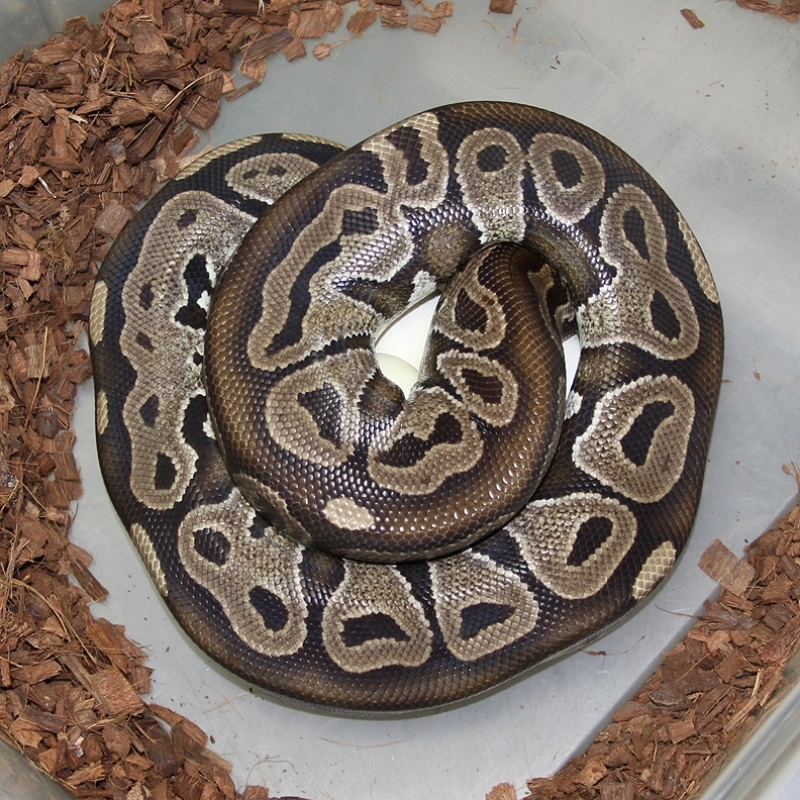 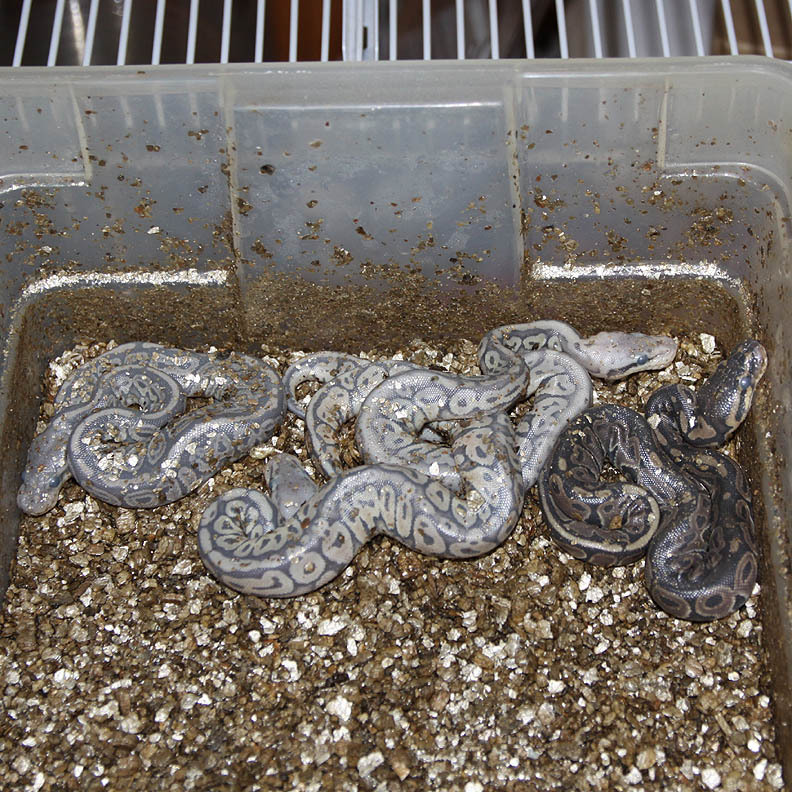 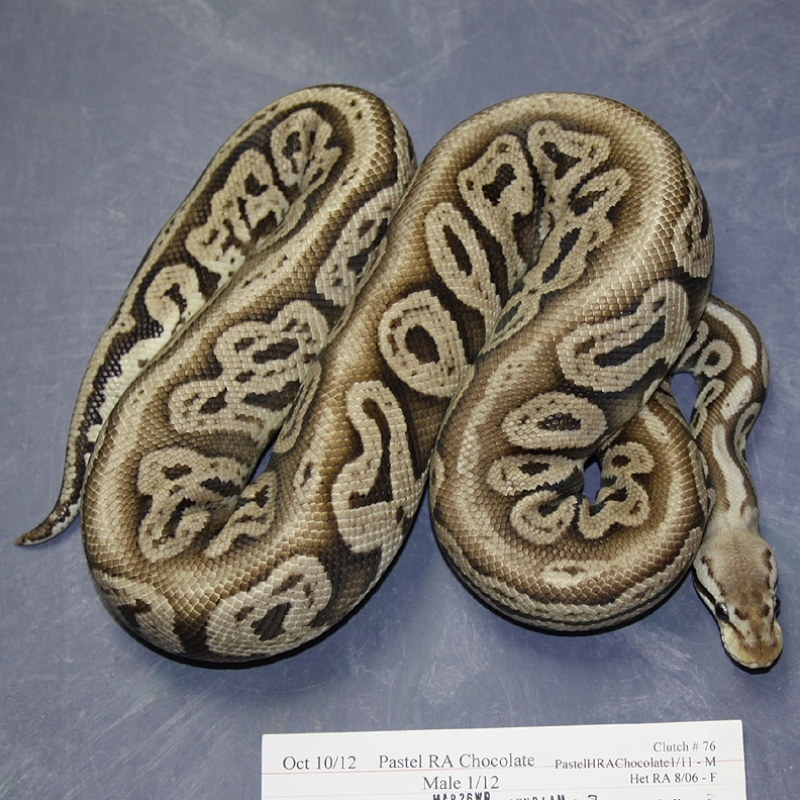 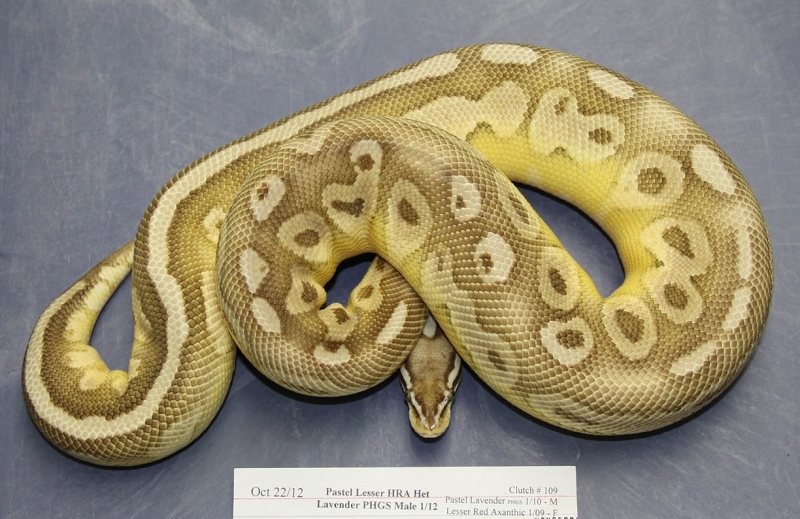 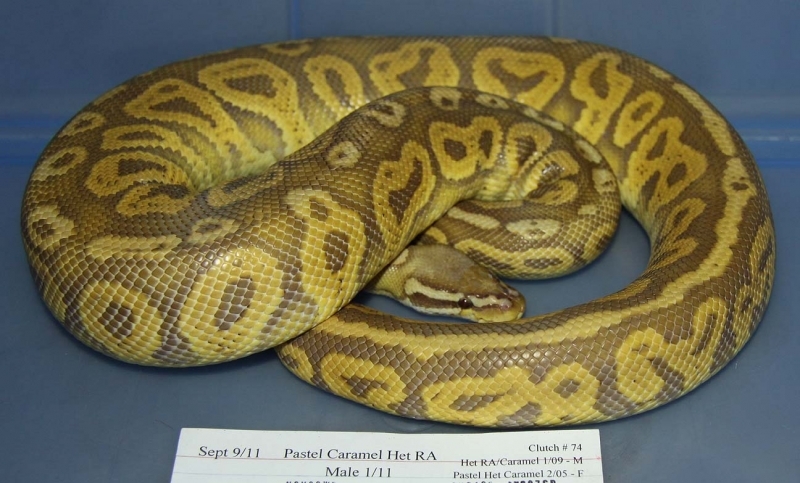 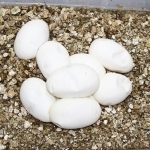 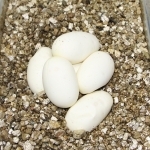 Description: Pastel Lesser Het RA/Lavender PHGS 1/12 x Het RA/Lavender 1/11. 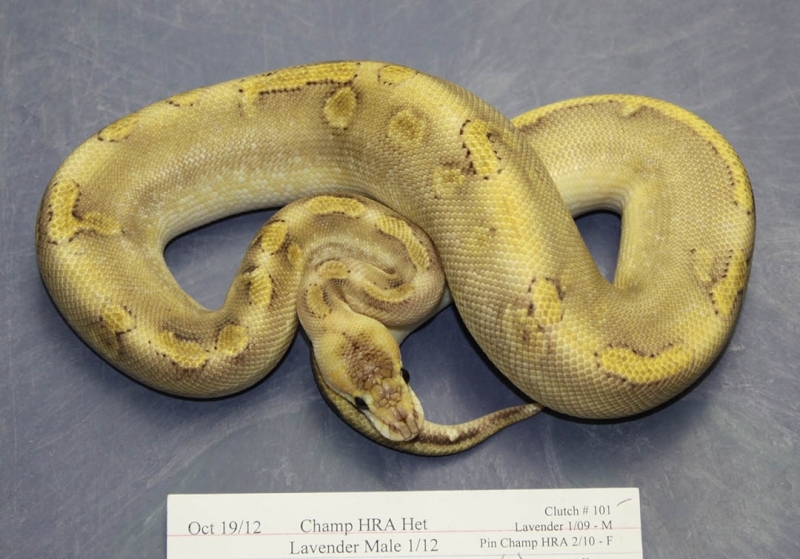 I'll need the Lavender male to colour up a bit to know exactly what he is. But, I can say he's cool looking! 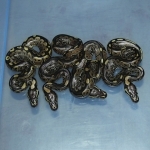 If you are interested in animals from clutch #196 please email or call 519-824-7377. 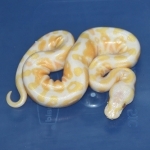 Description: Albino YB 2/11 x HY YB 4/09. 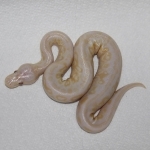 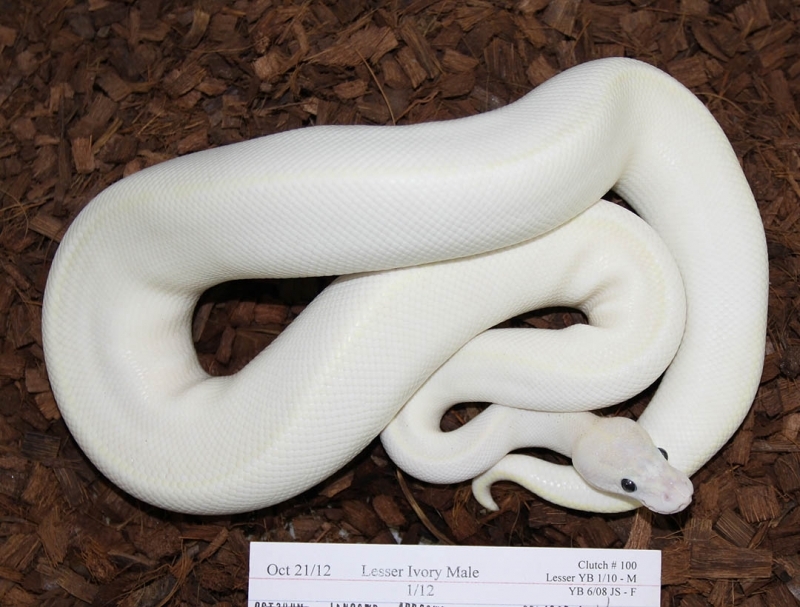 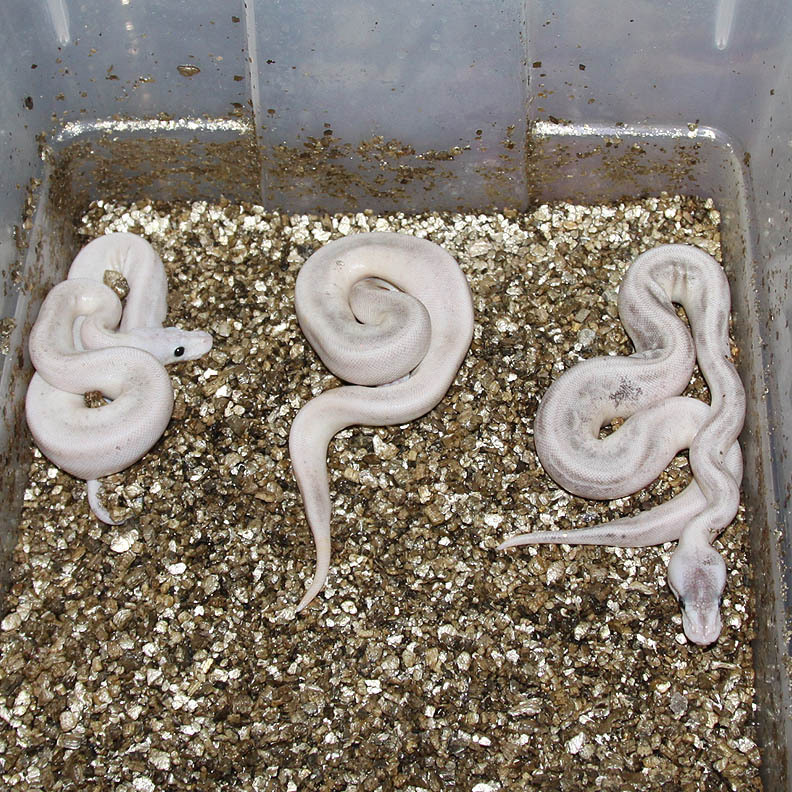 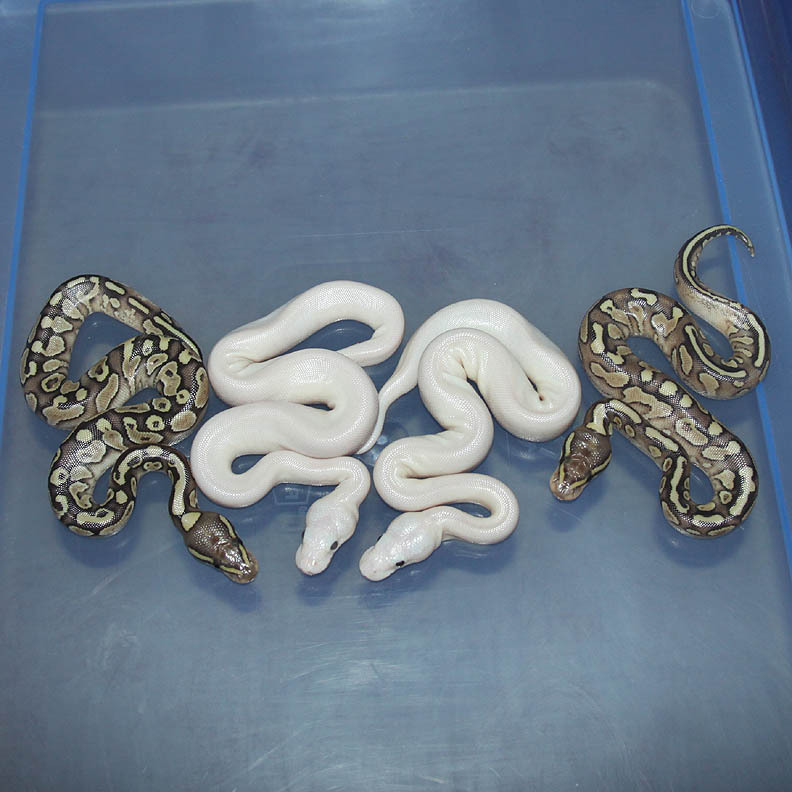 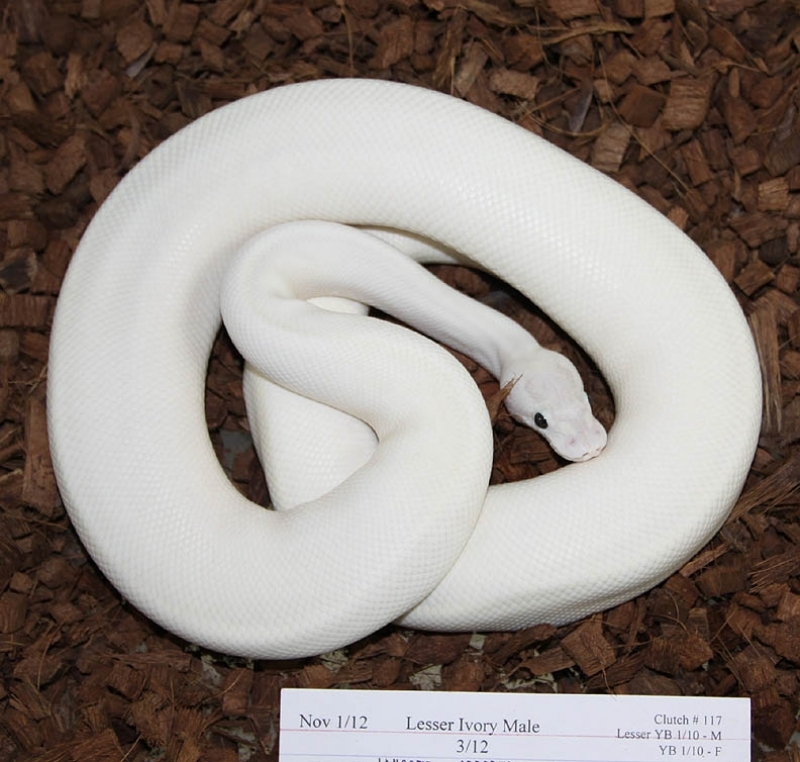 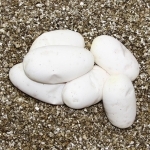 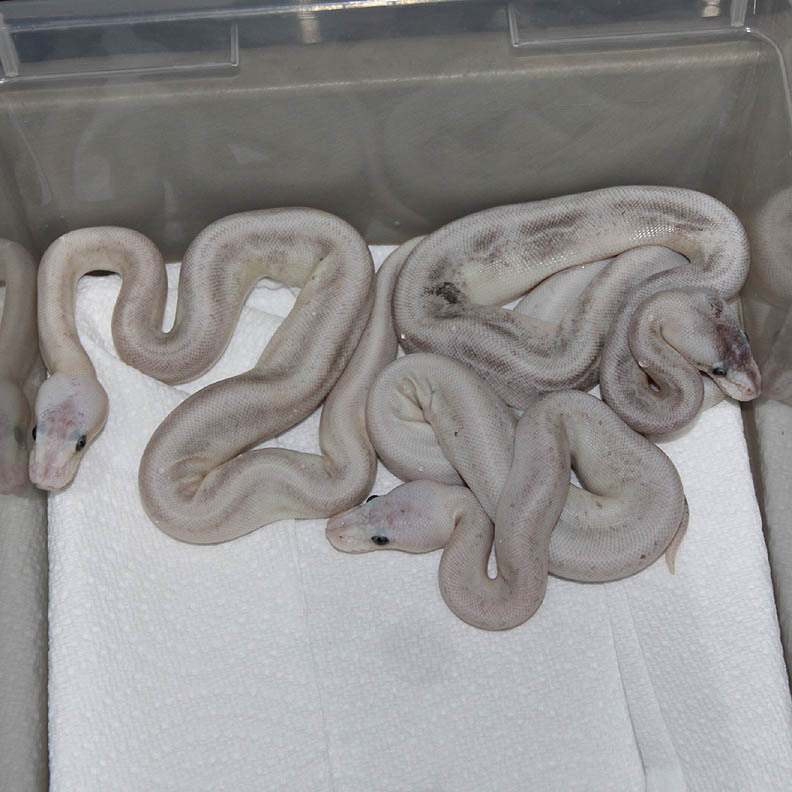 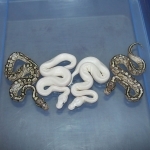 I'm really looking forward to producing some Ivory Het Albinos! 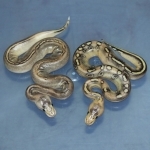 If you are interested in animals from clutch #197 please email or call 519-824-7377. 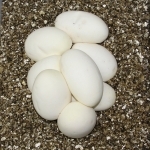 Description: DH OG/Pied 1/10 x DH OG/Pied 2/11. 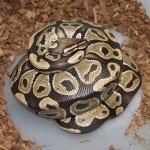 If you are interested in animals from clutch #198 please email or call 519-824-7377. 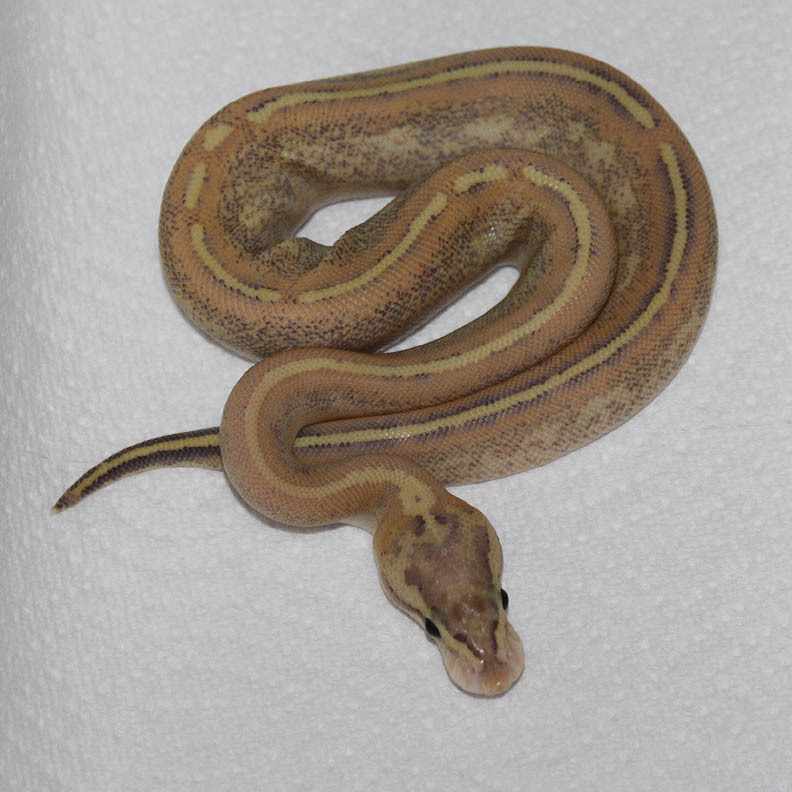 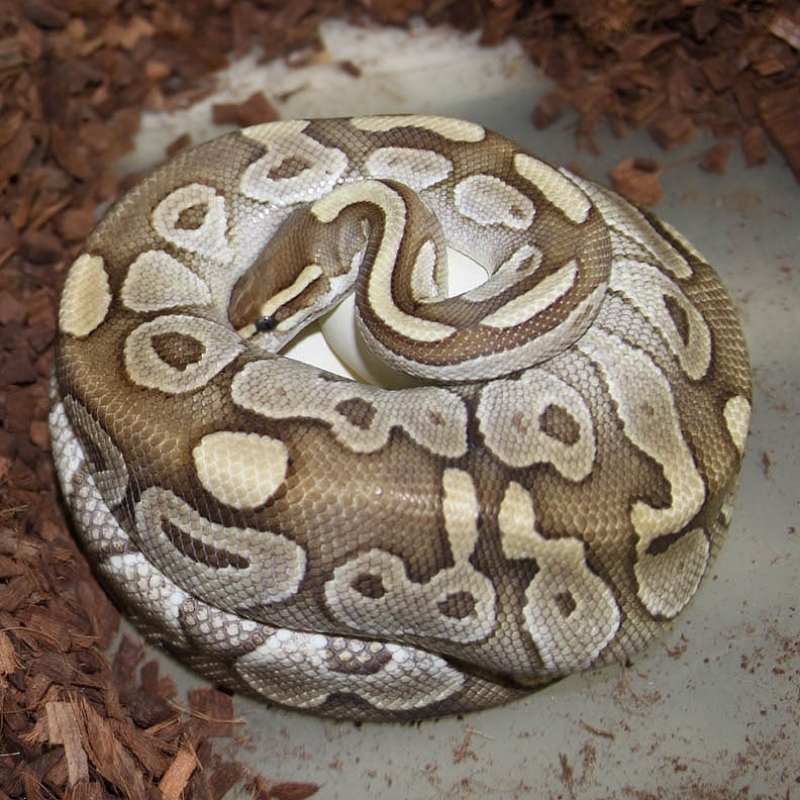 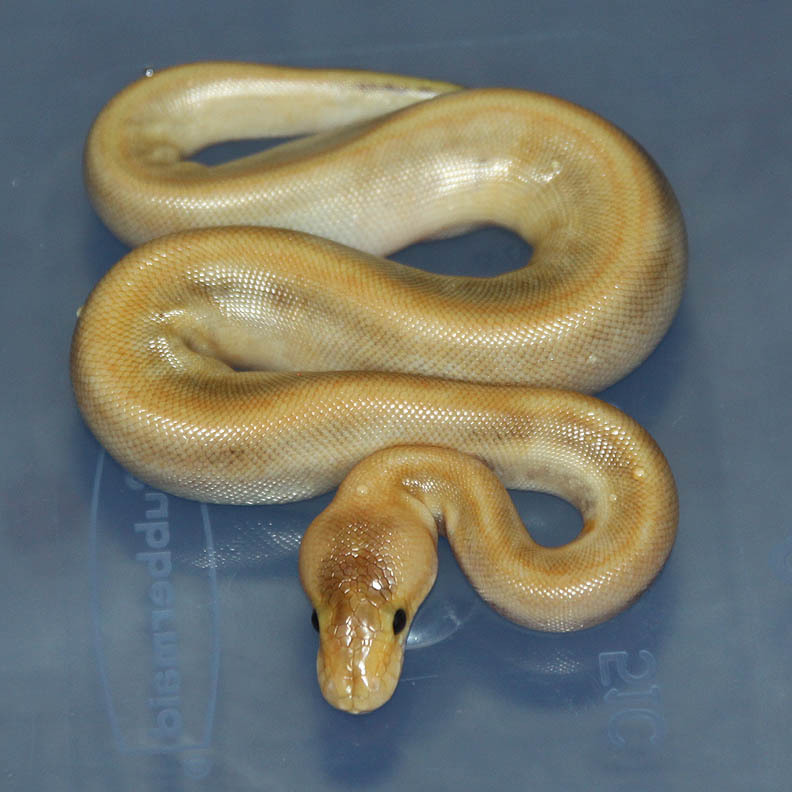 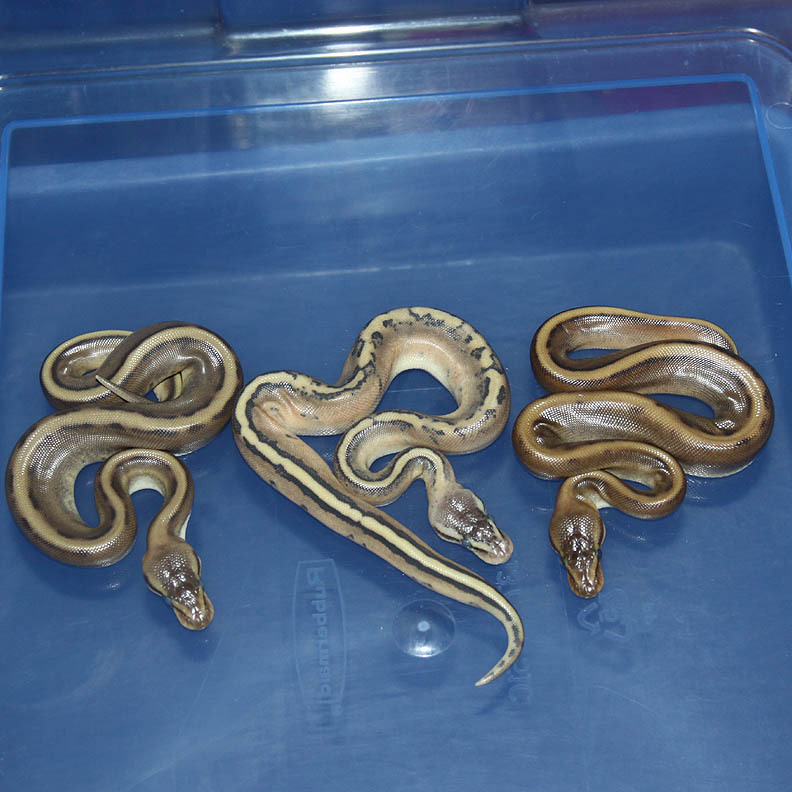 Description: Pastel Pinstripe Champagne Het Caramel 1/12 x Het Caramel 3/09. 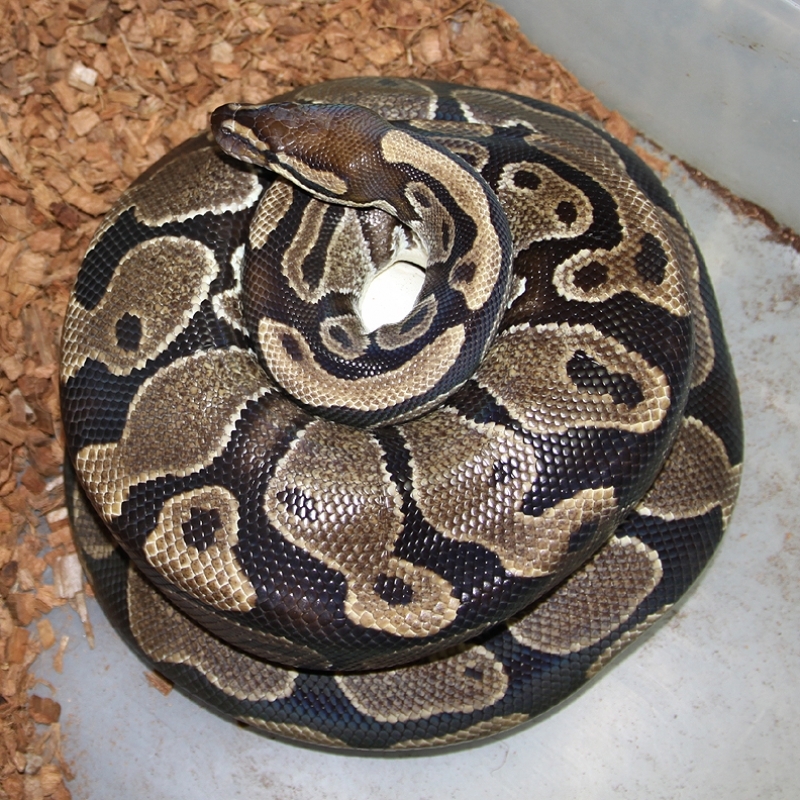 If you are interested in animals from clutch #199 please email or call 519-824-7377. 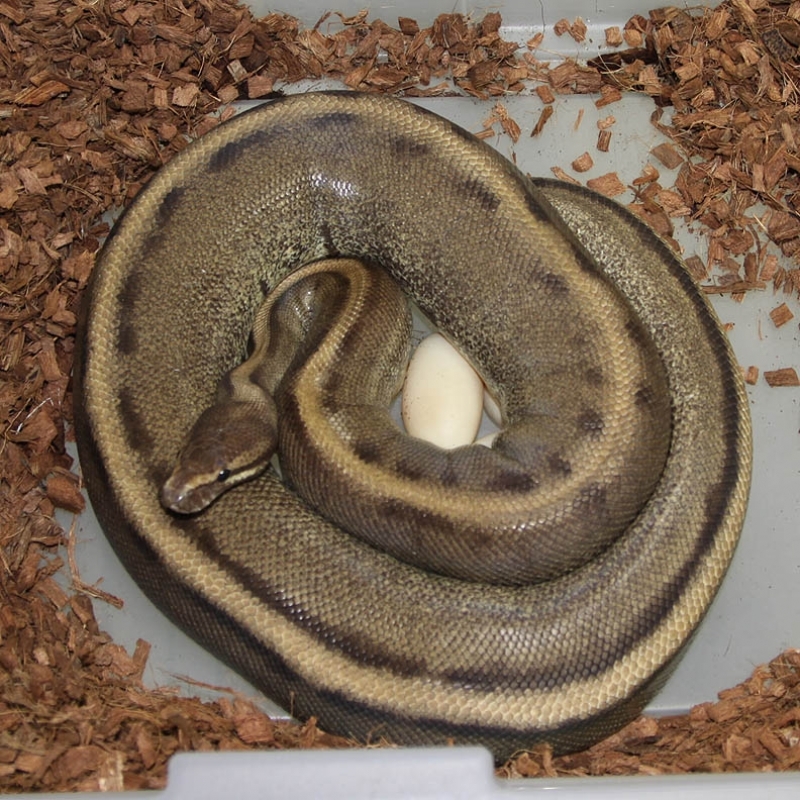 Description: Pastel Lavender Het GS 1/10 x Red Axanthic Het Genetic Stripe 2/11. 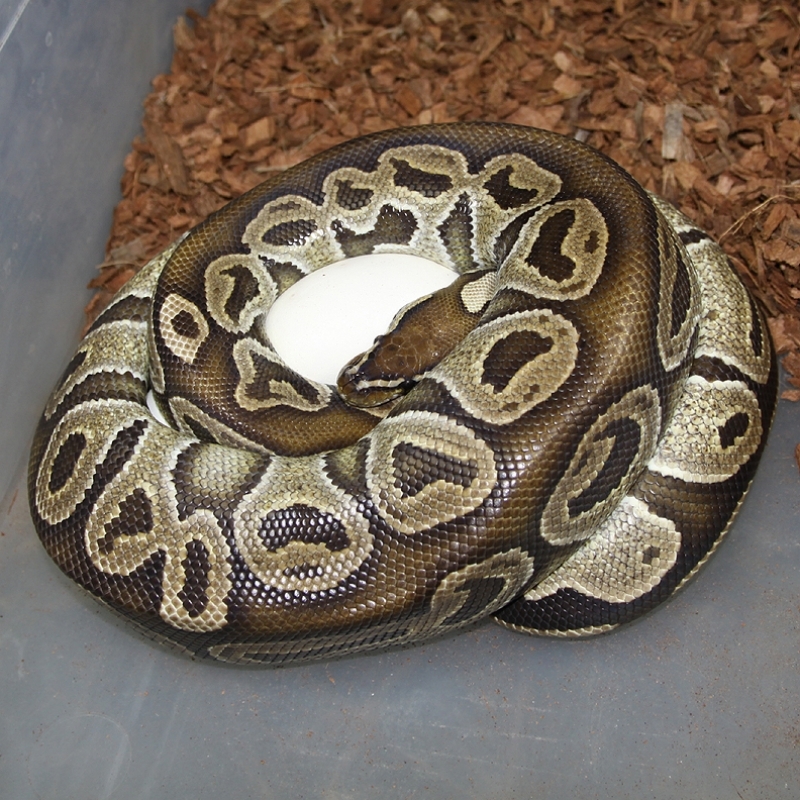 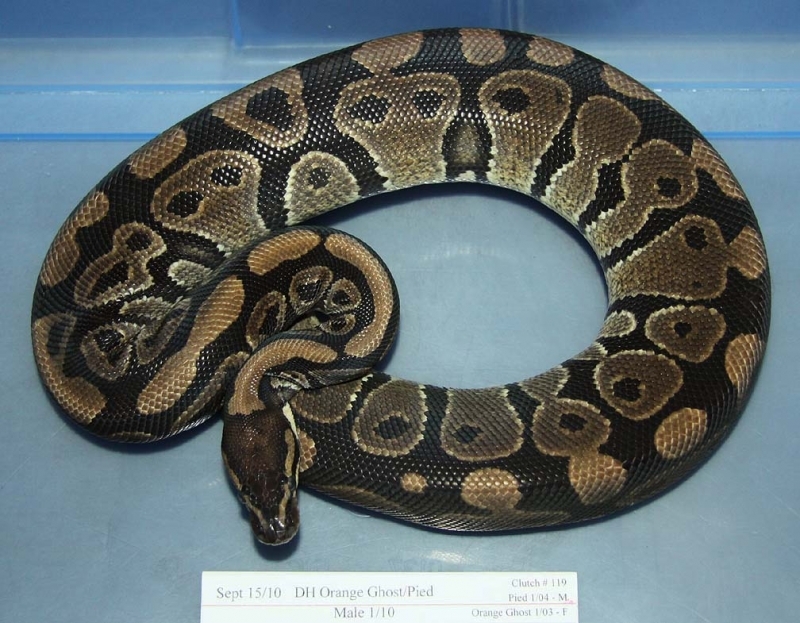 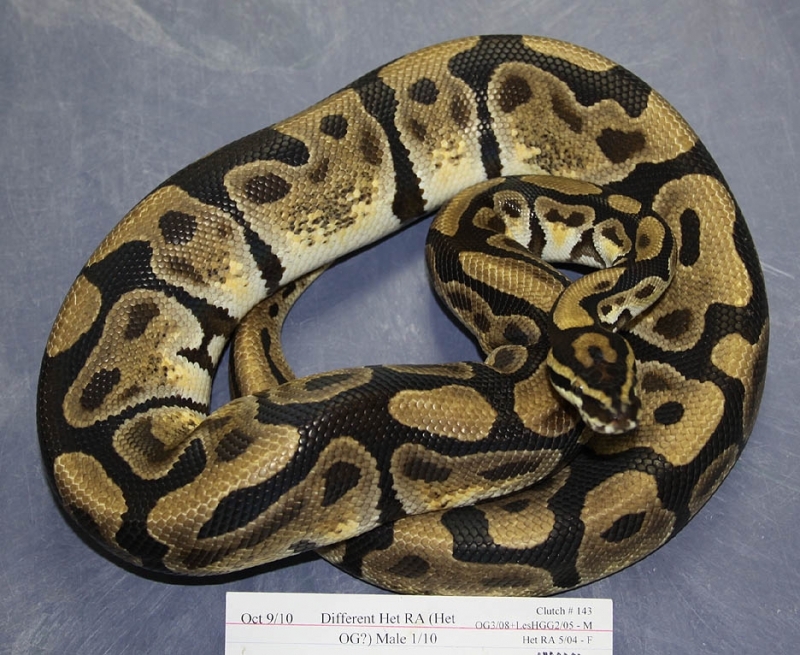 If you are interested in animals from clutch #200 please email or call 519-824-7377.